Congratulations to Kaitlin and Mitchell on their recent marriage! 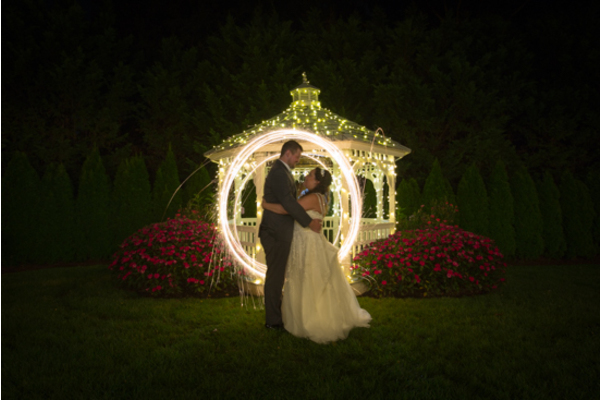 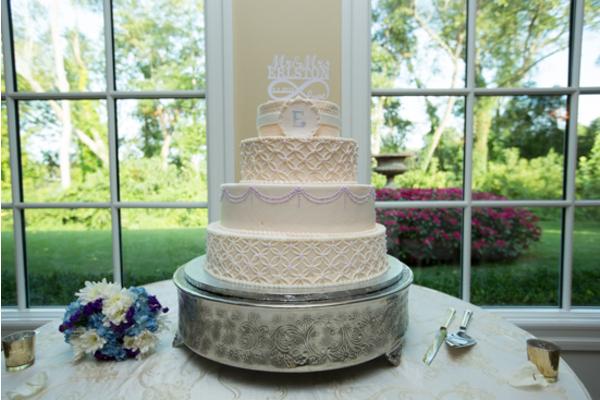 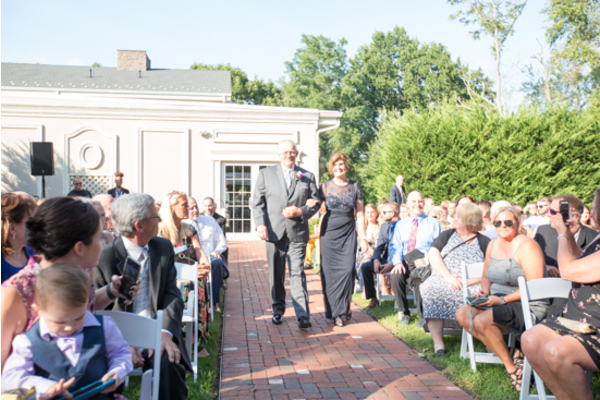 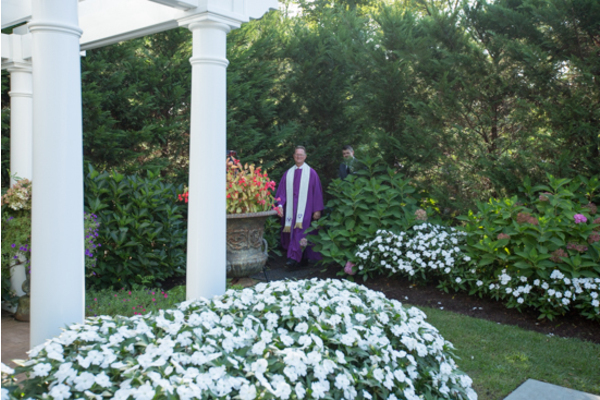 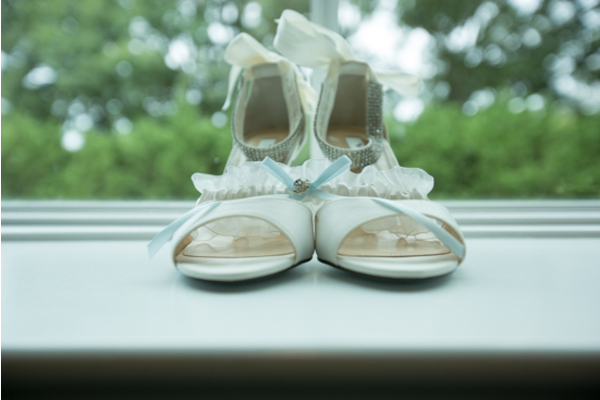 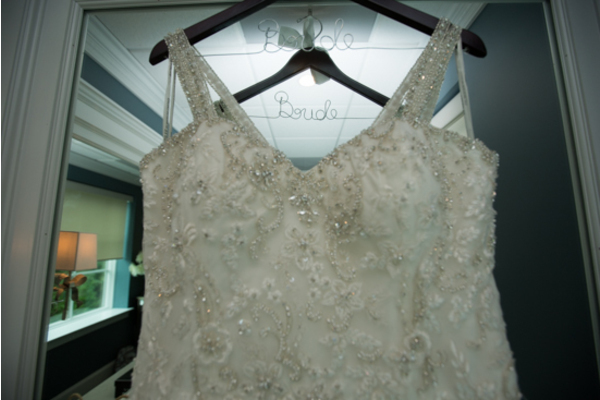 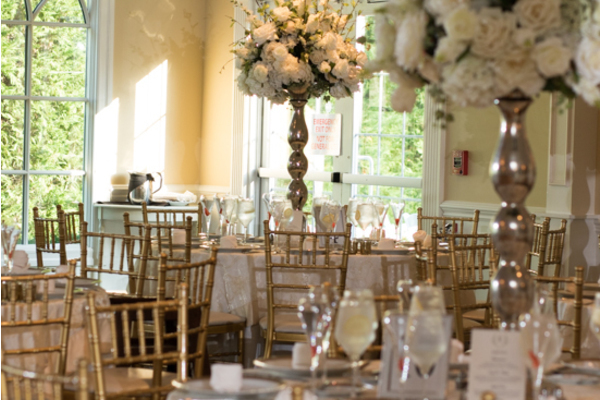 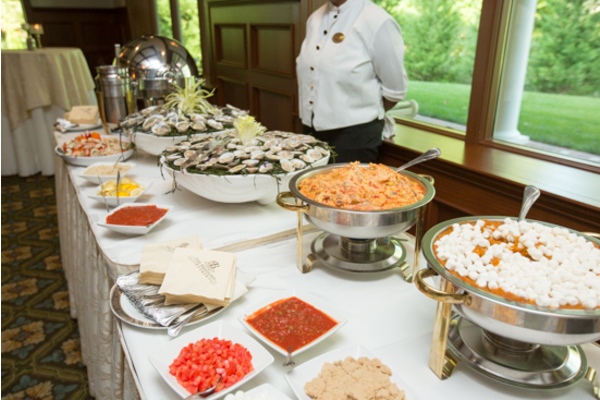 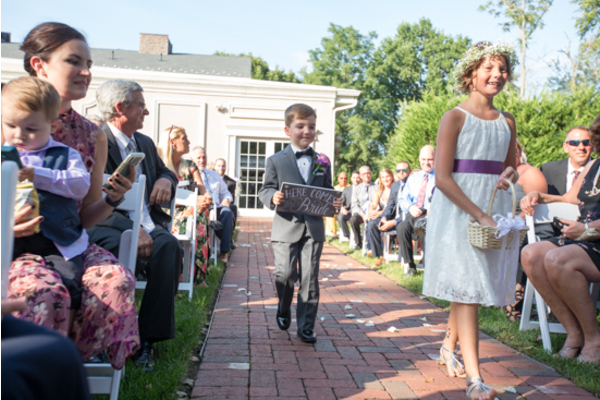 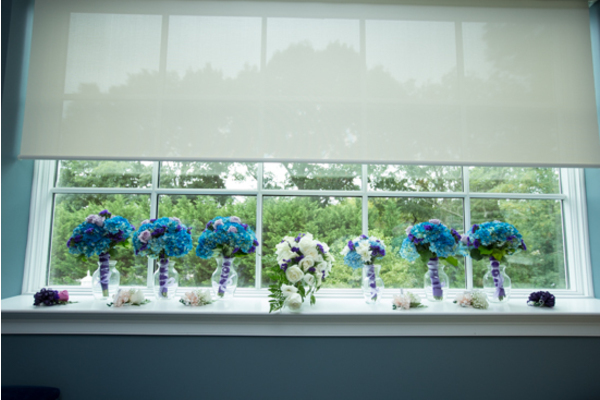 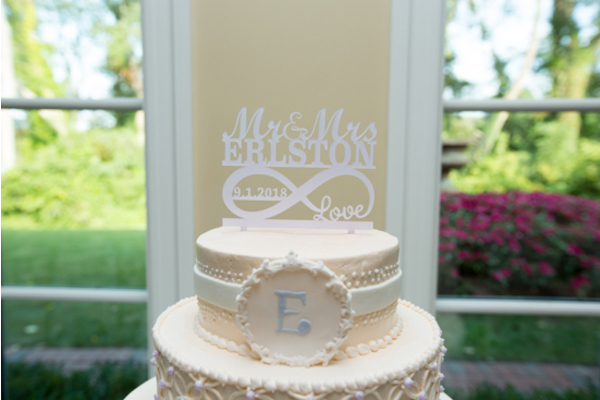 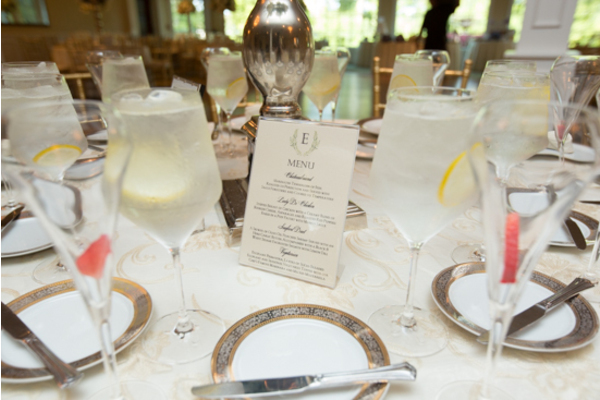 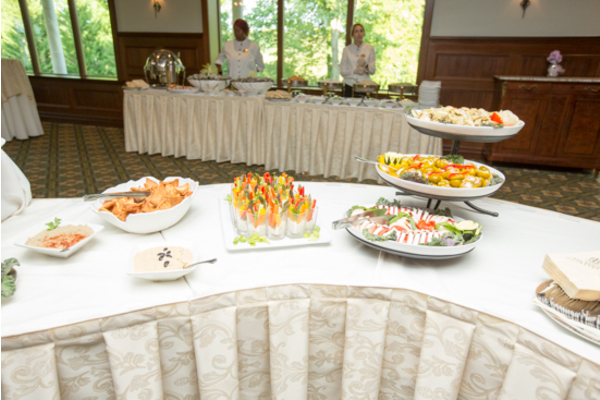 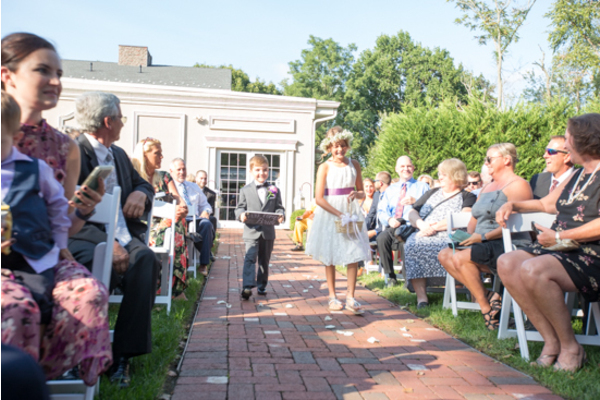 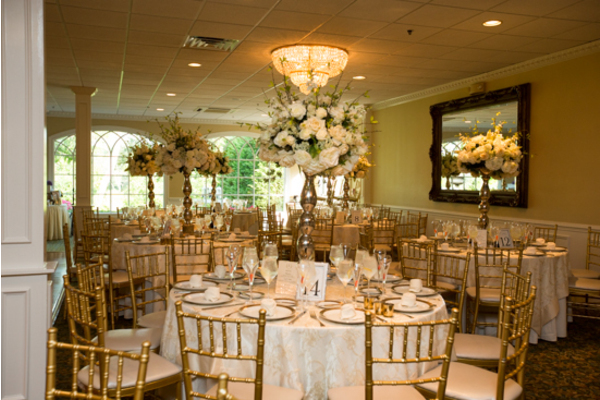 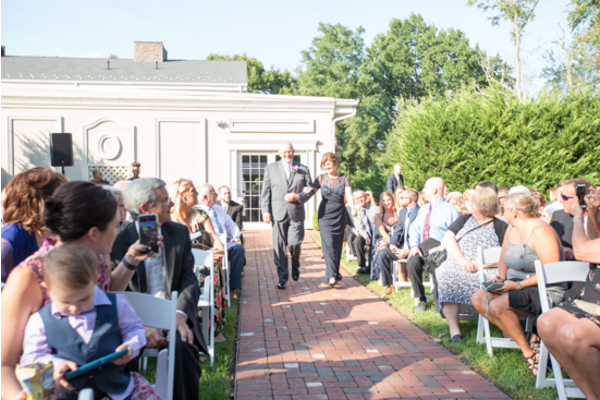 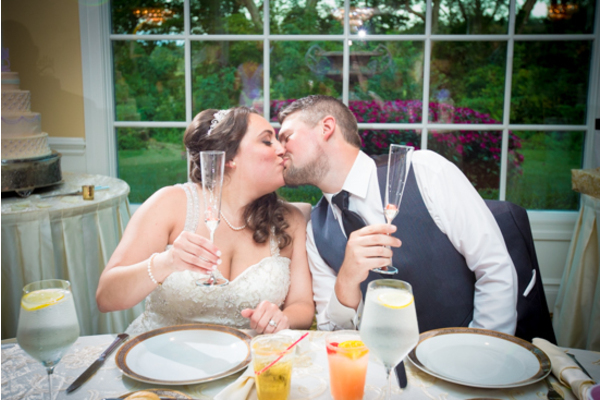 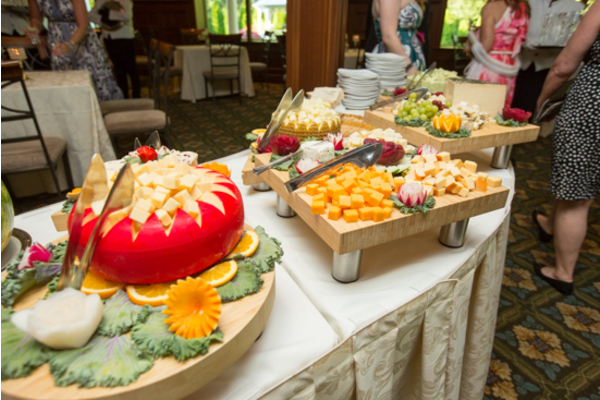 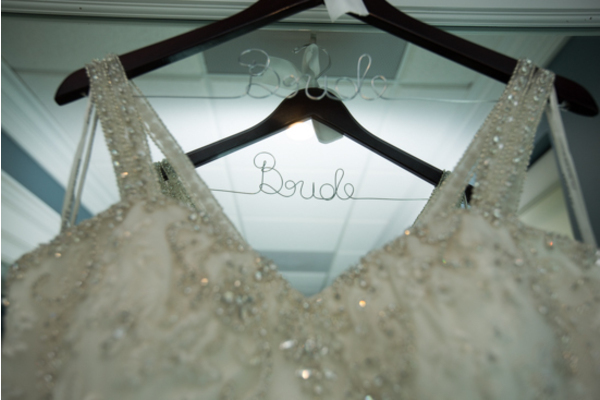 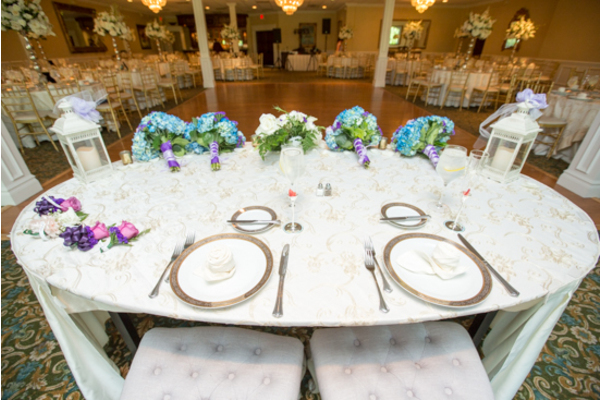 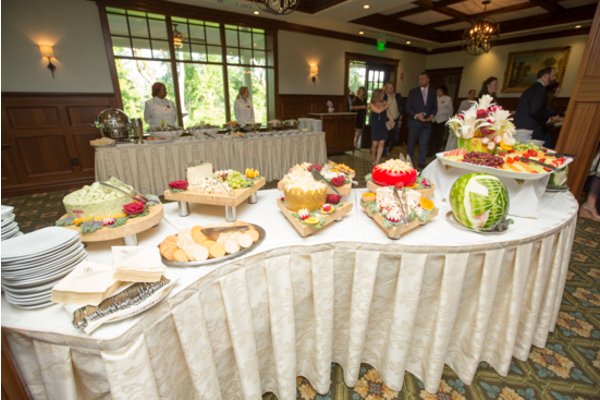 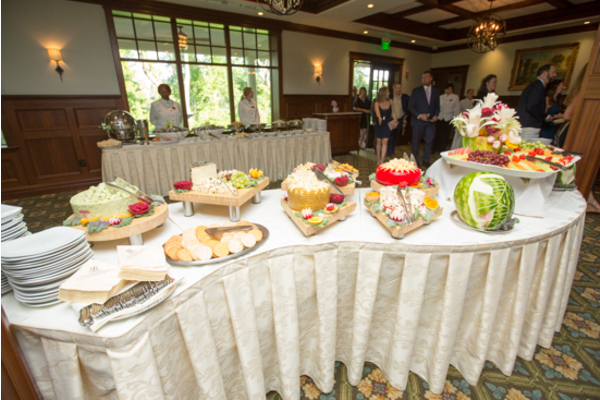 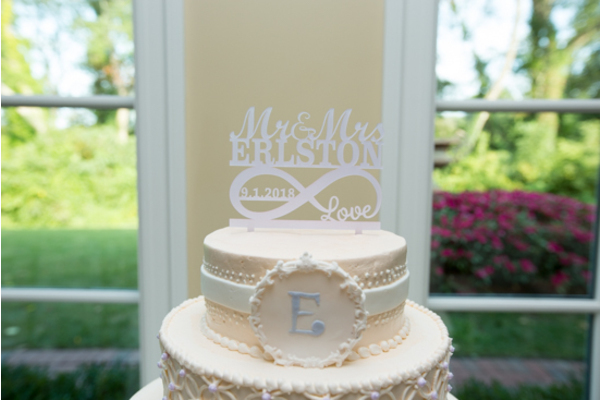 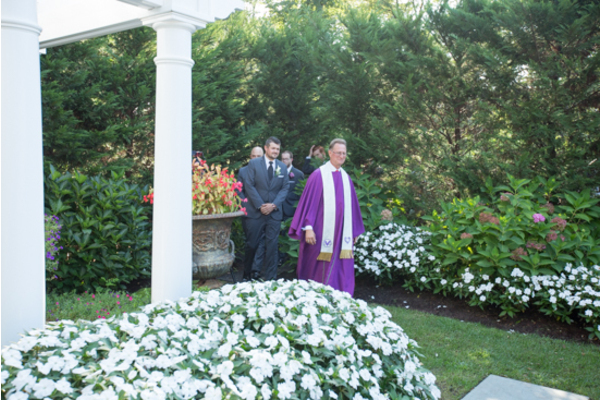 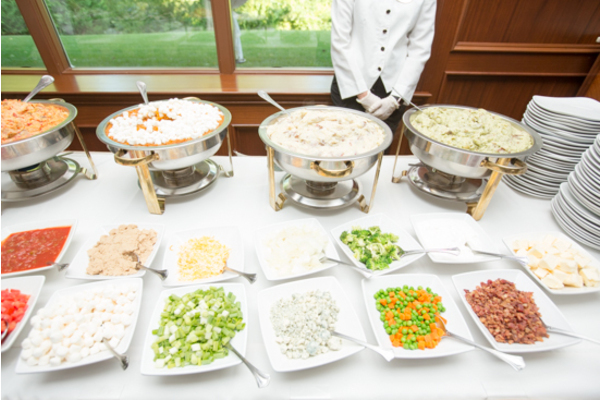 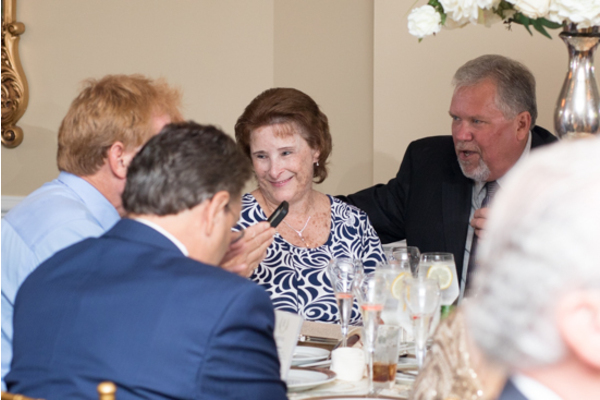 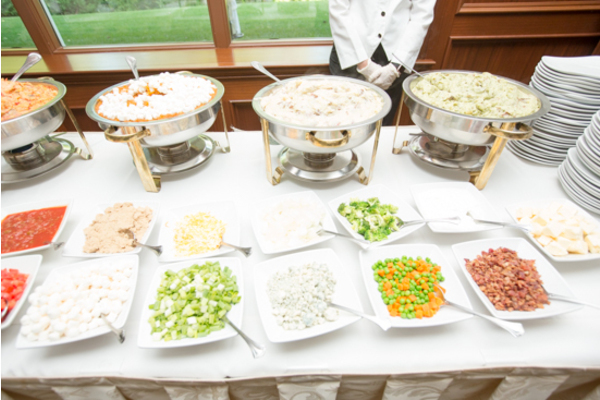 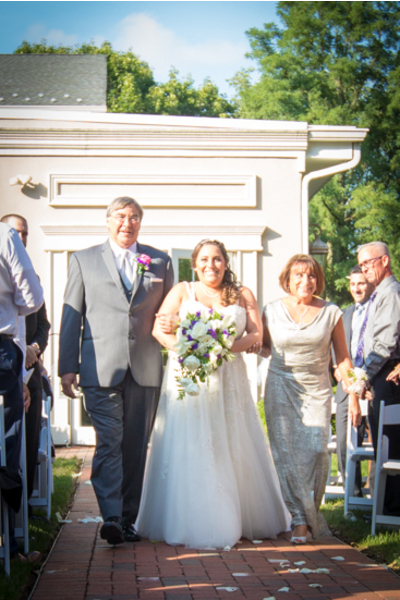 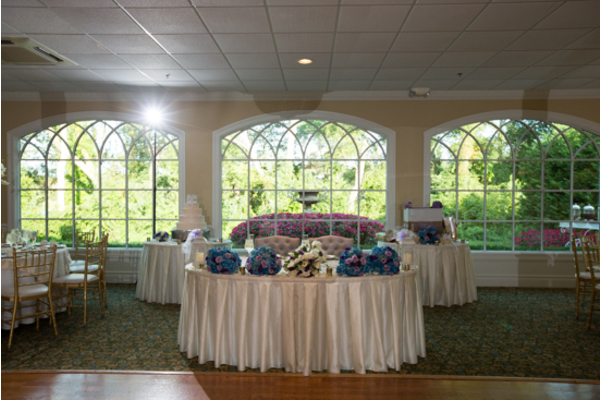 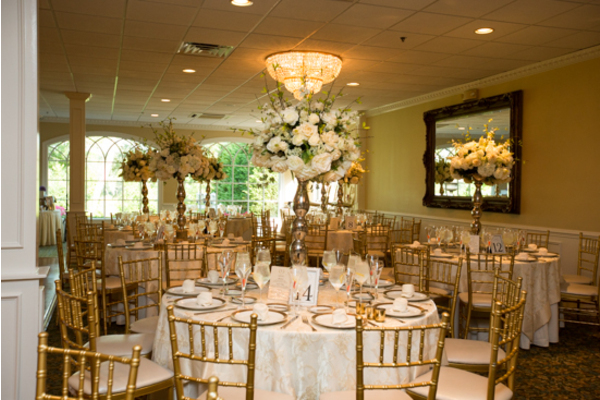 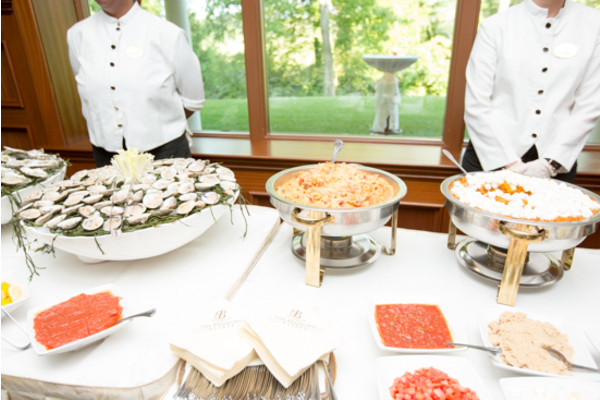 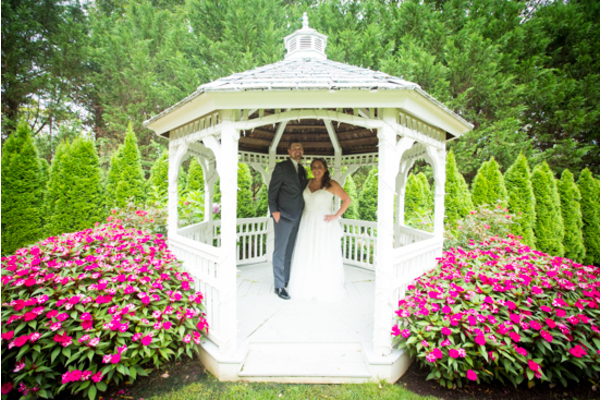 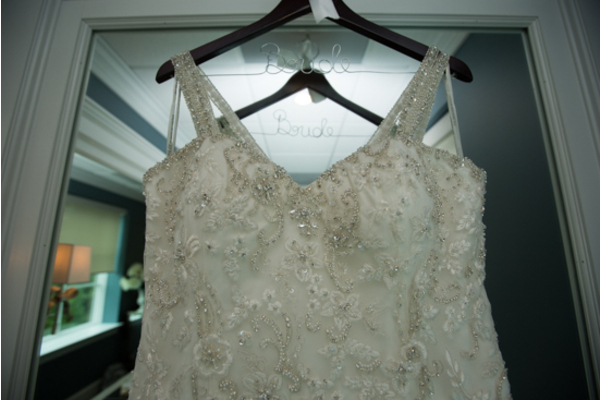 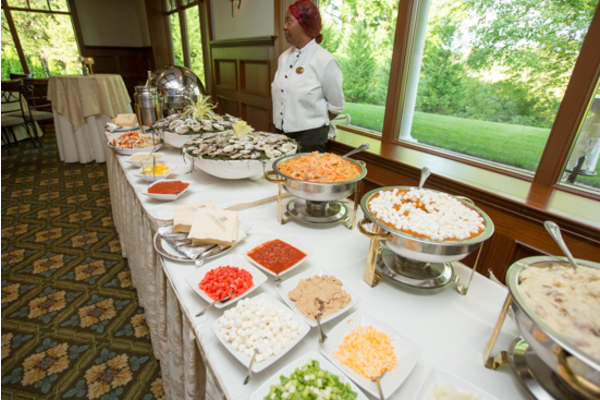 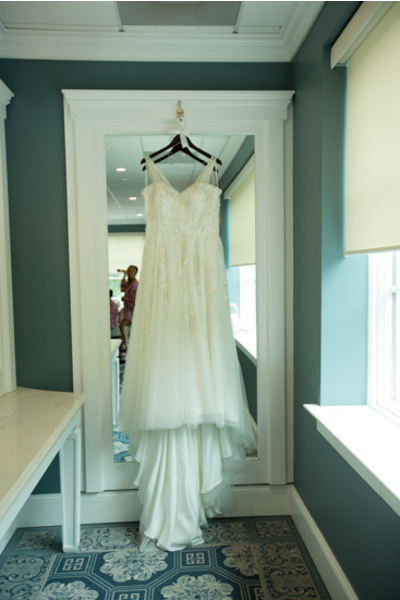 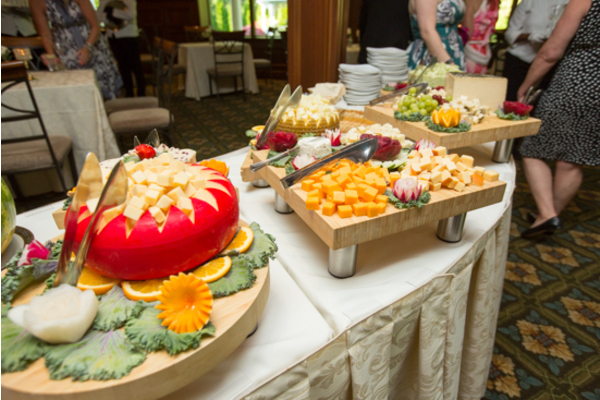 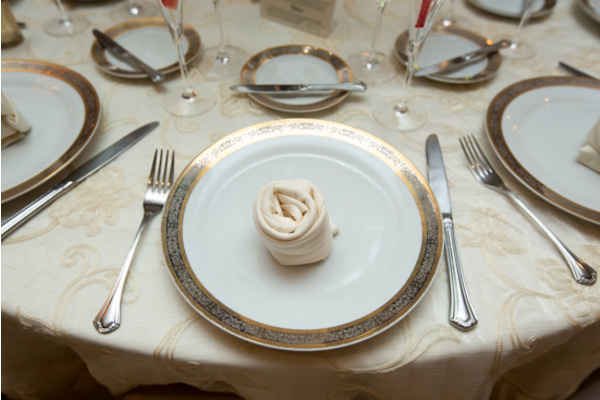 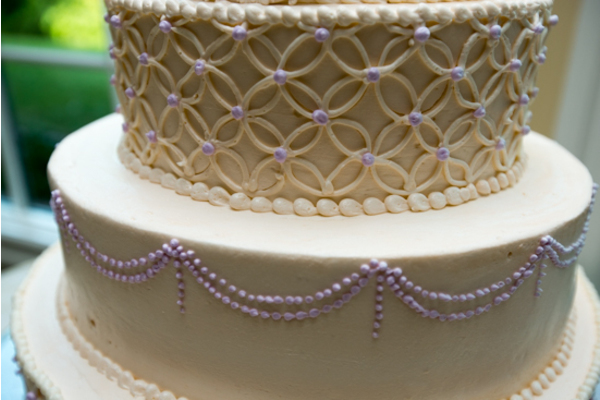 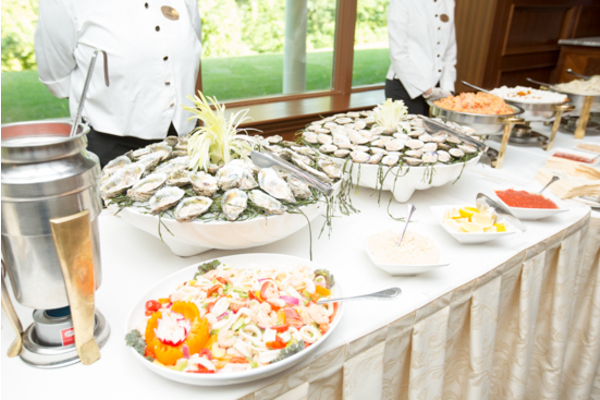 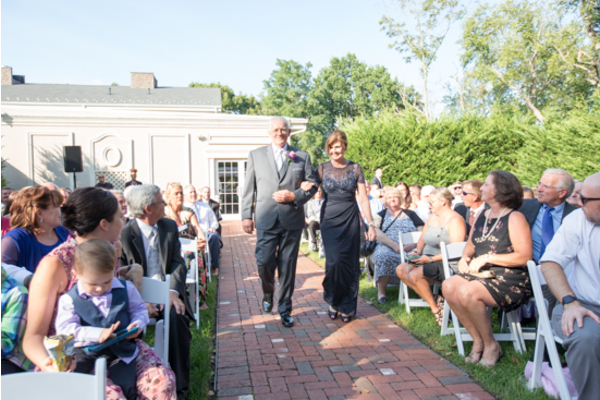 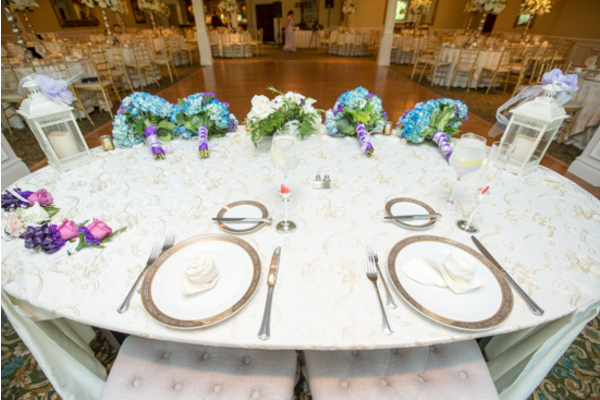 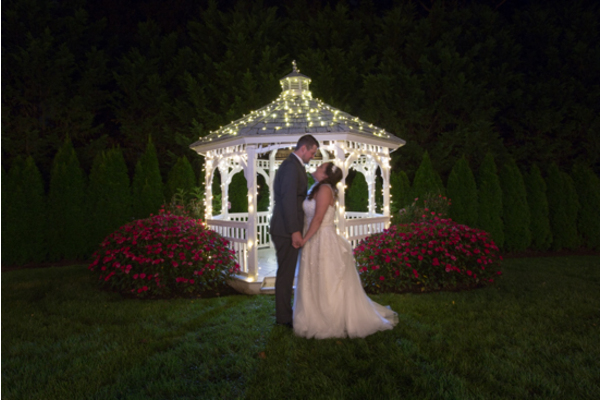 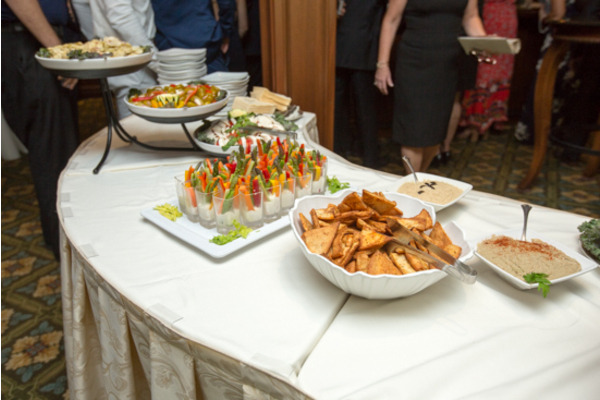 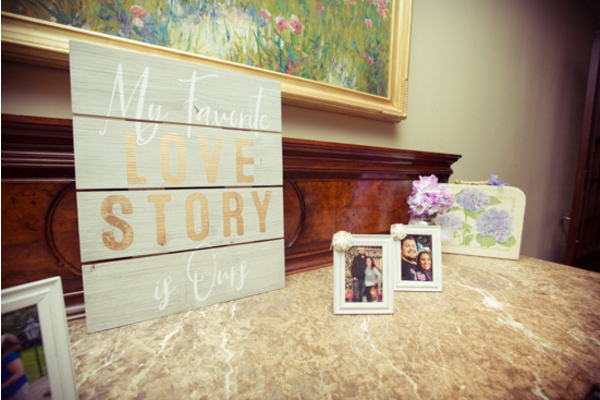 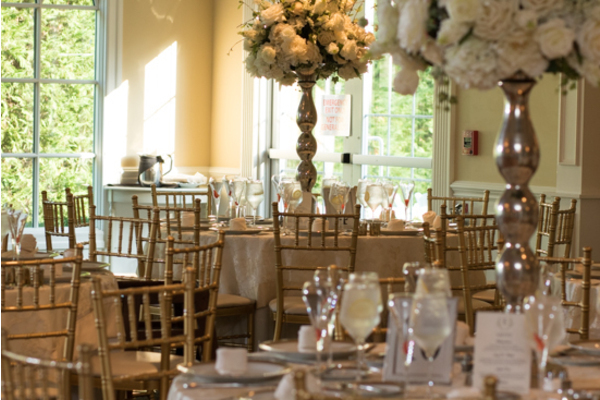 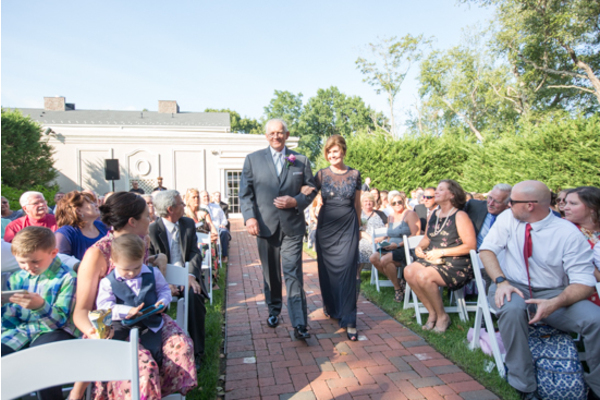 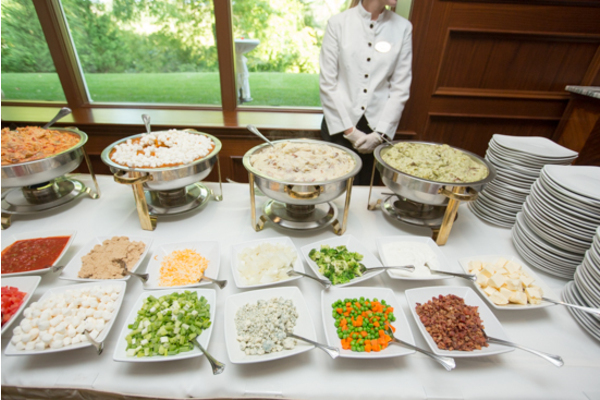 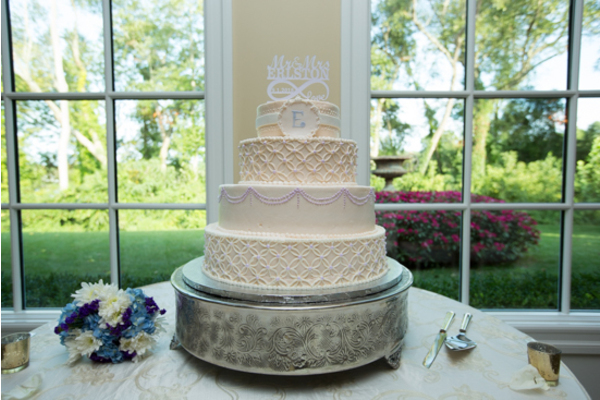 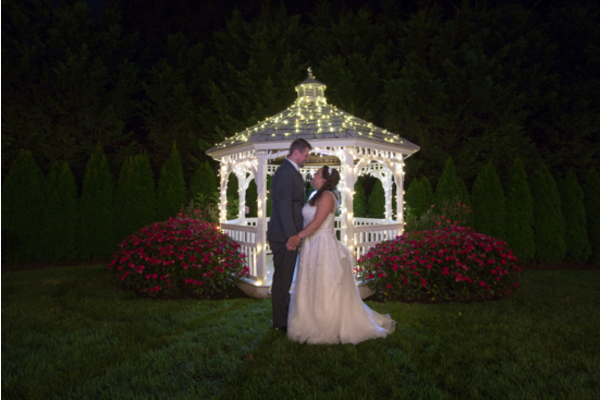 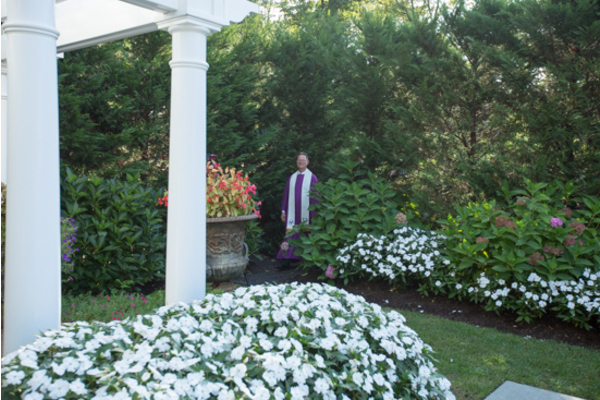 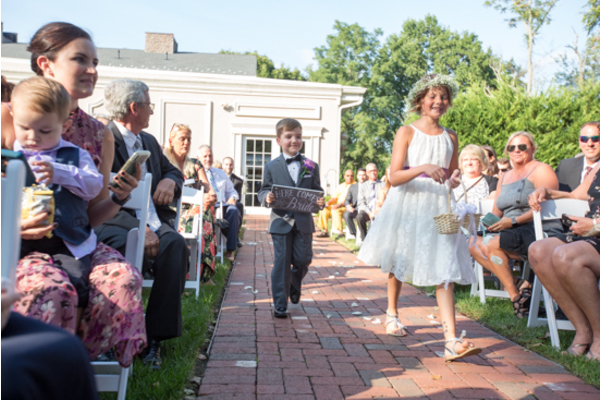 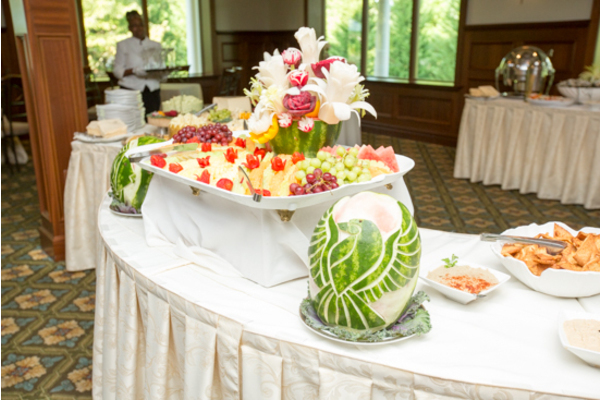 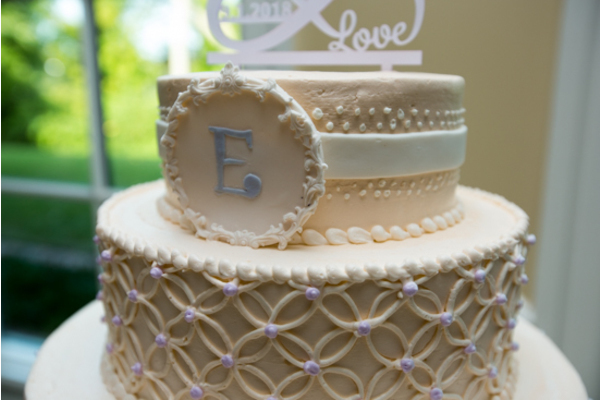 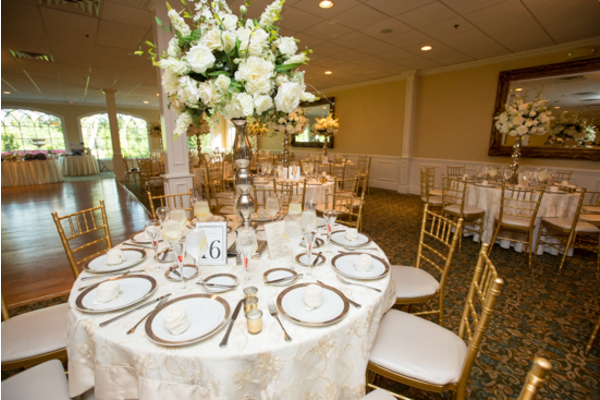 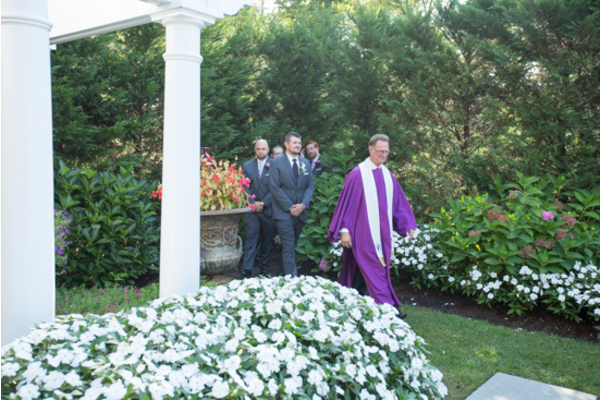 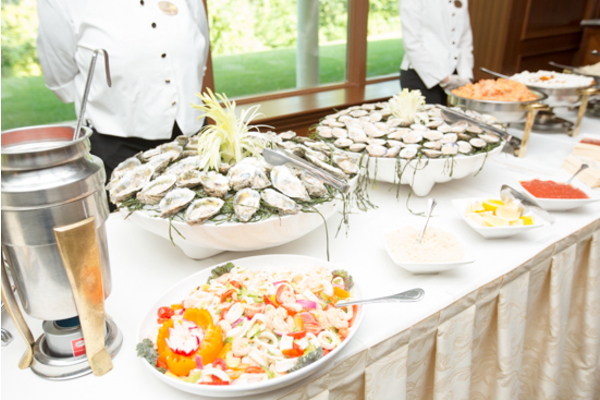 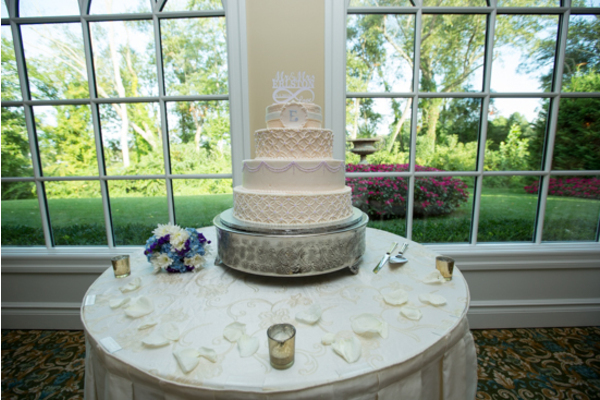 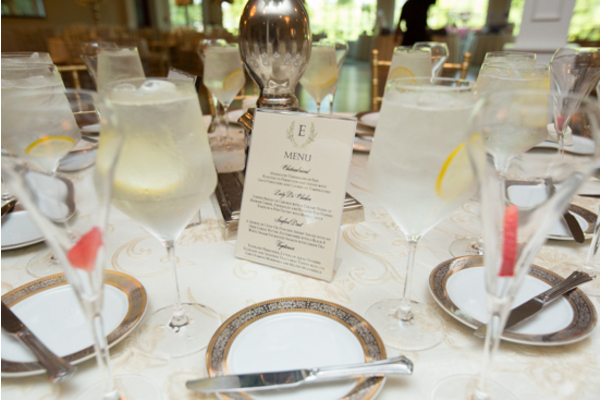 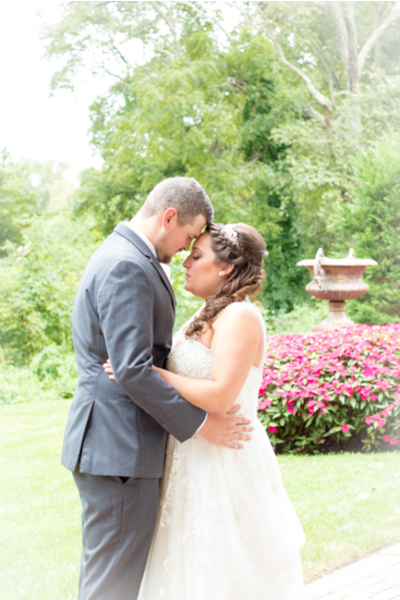 The bride and groom had a gorgeous summer wedding at The Bradford Estate in Hainesport, New Jersey. 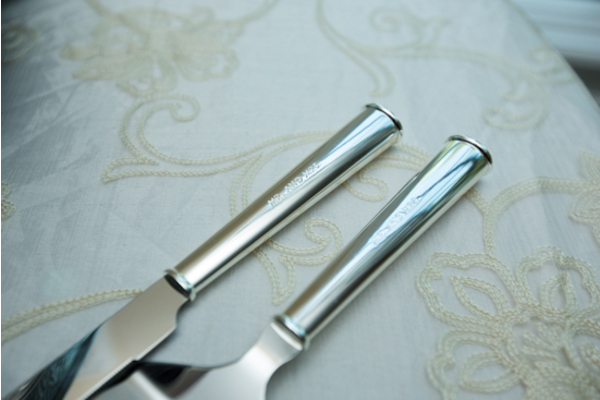 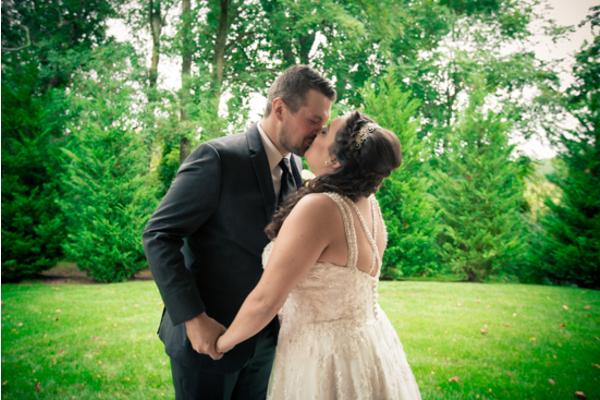 They tied the knot on the most perfect warm day. 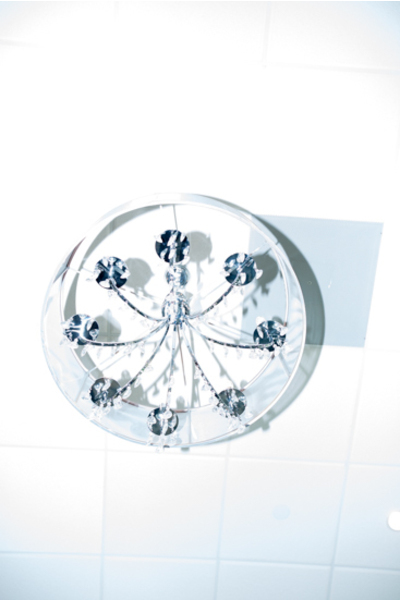 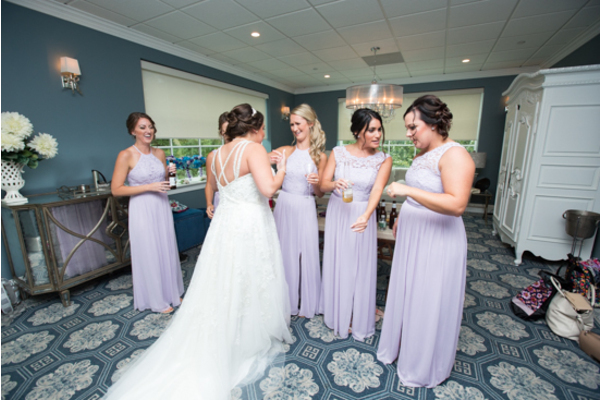 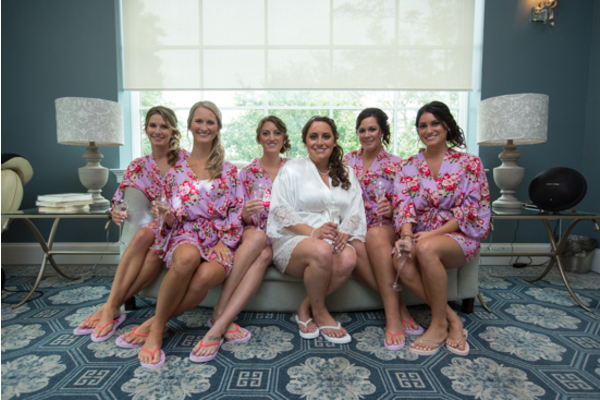 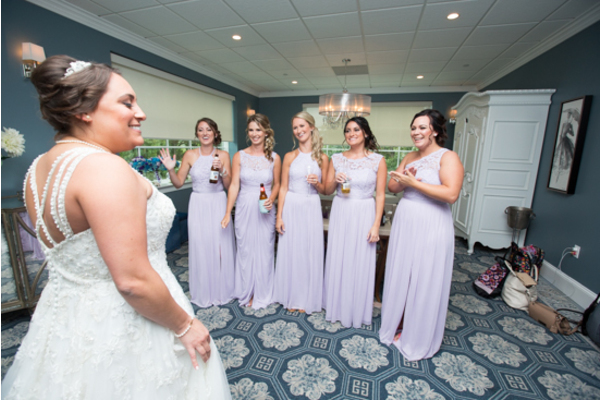 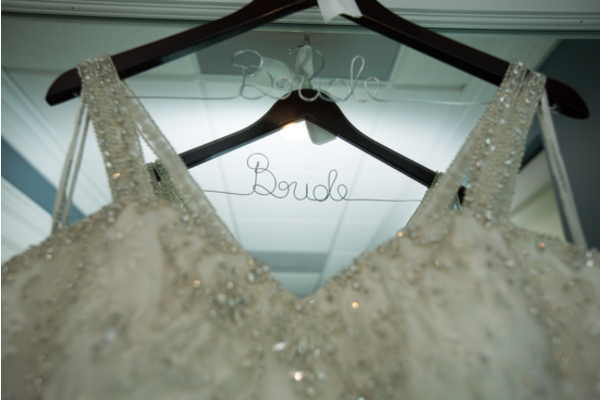 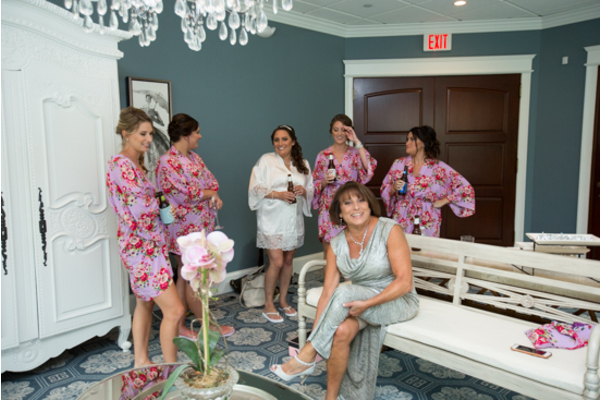 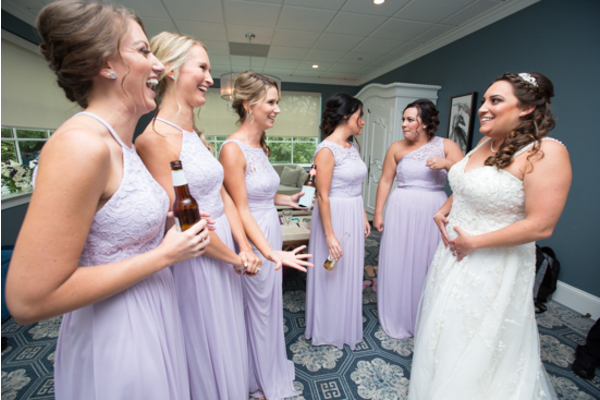 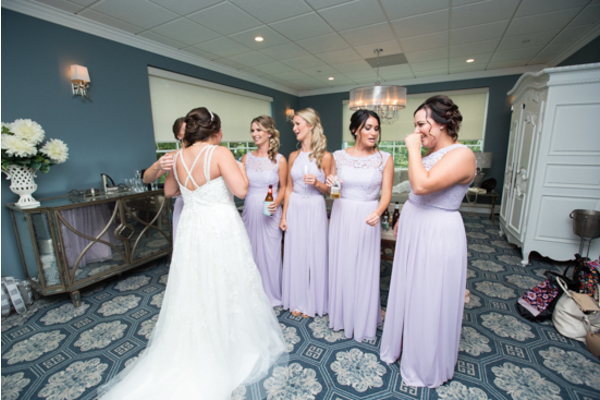 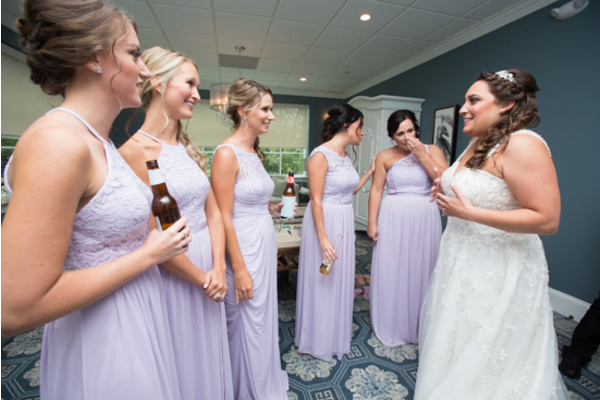 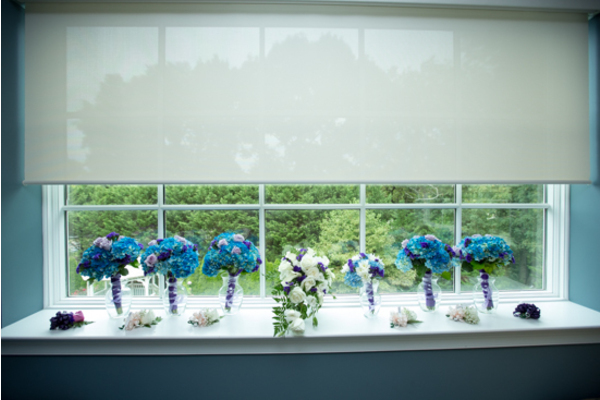 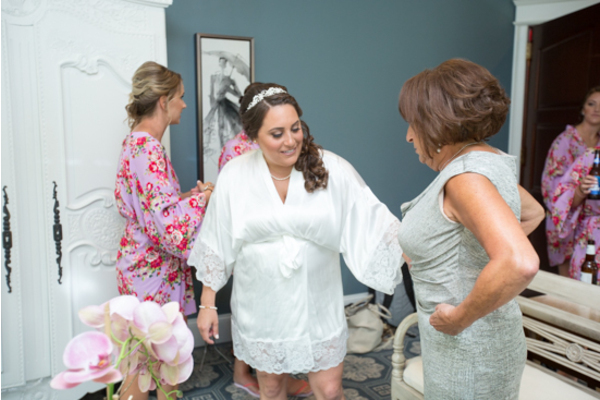 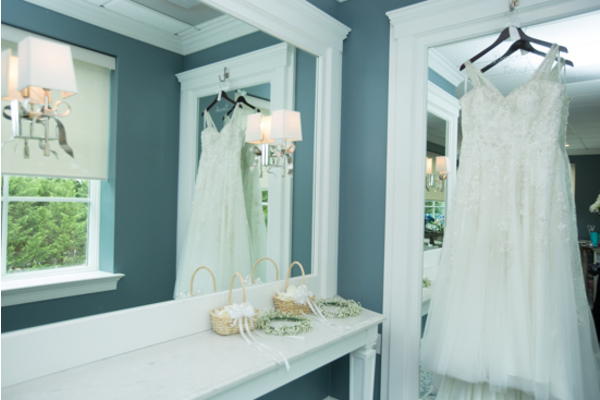 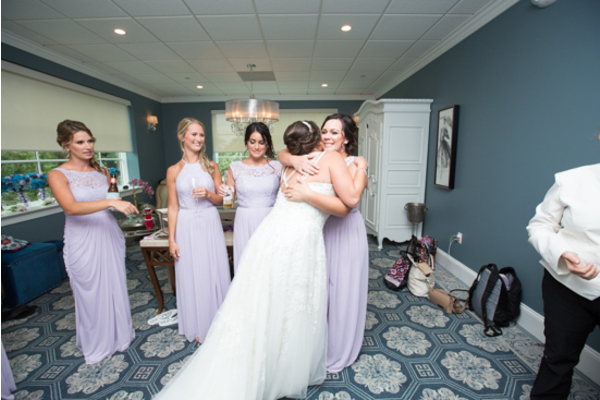 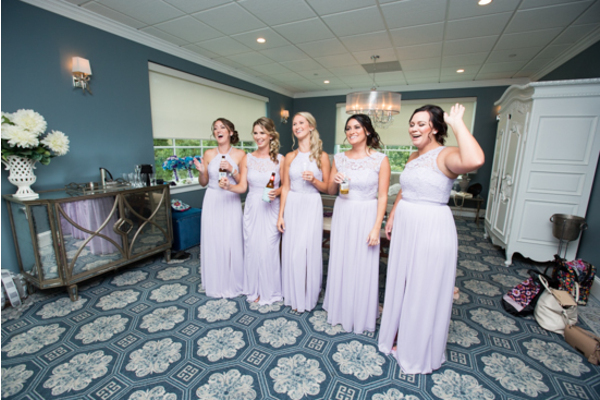 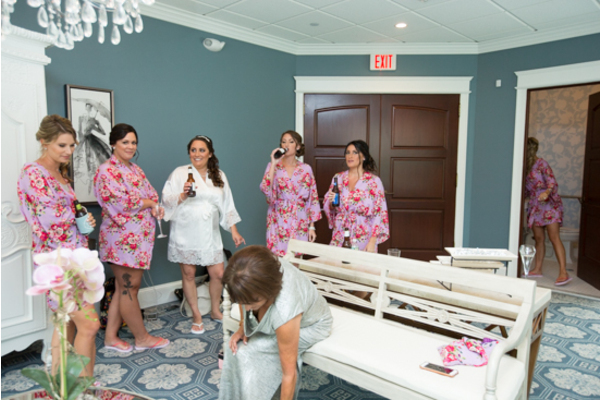 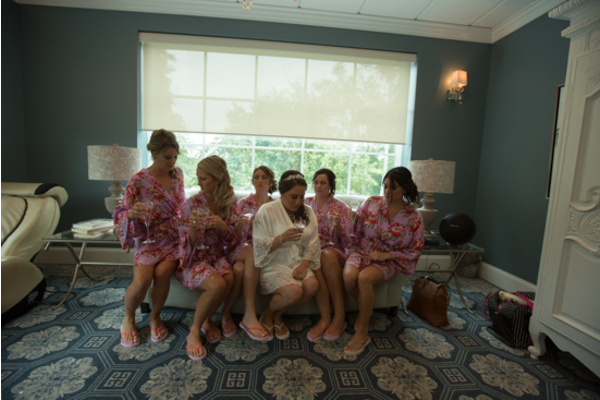 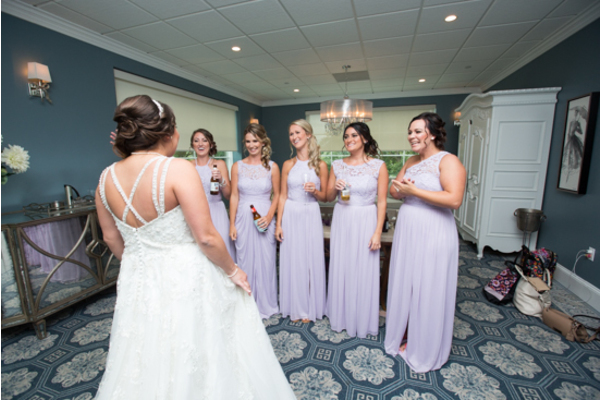 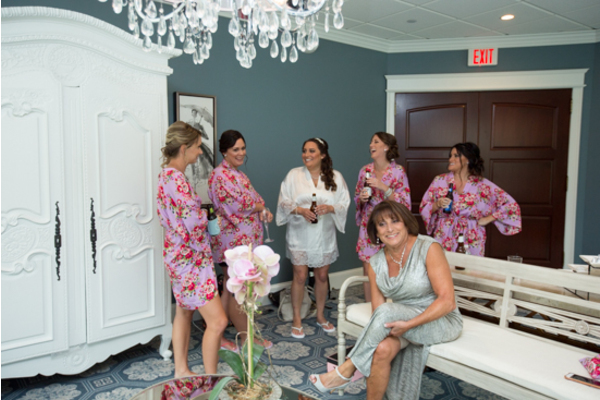 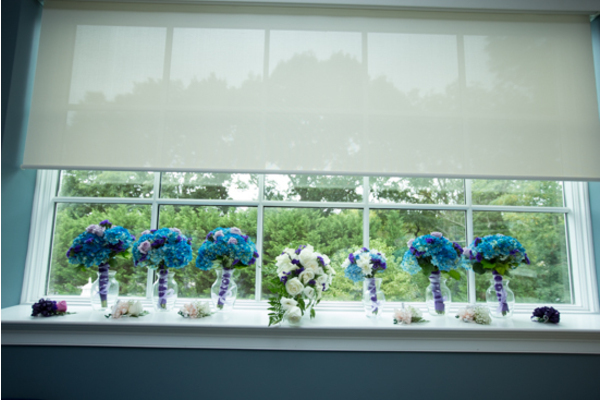 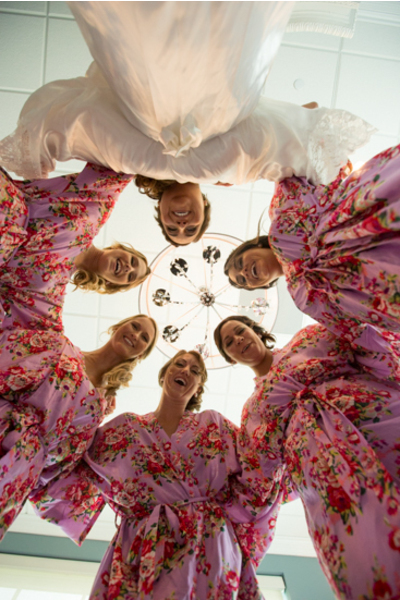 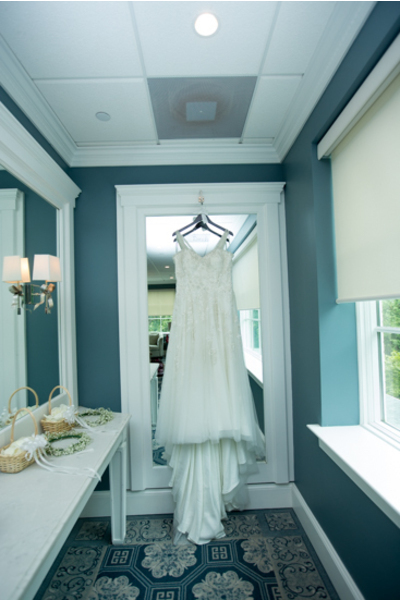 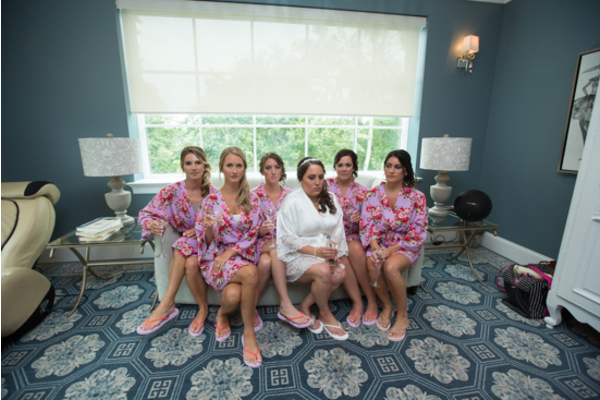 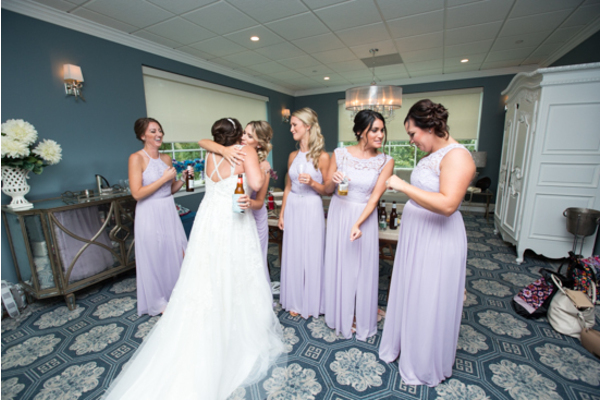 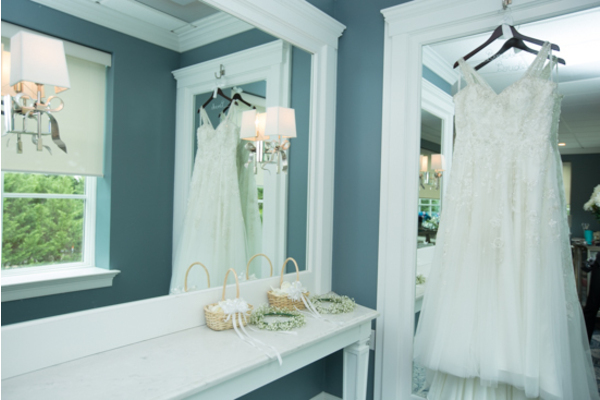 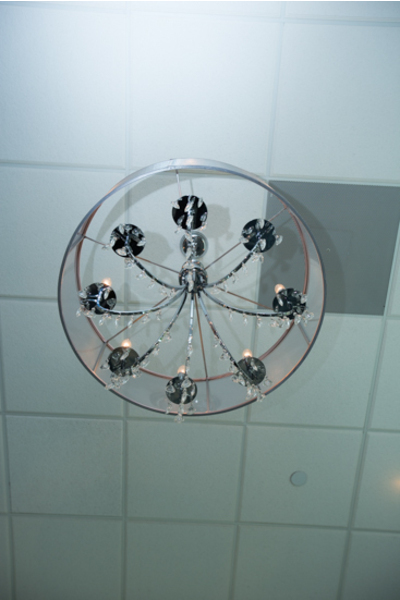 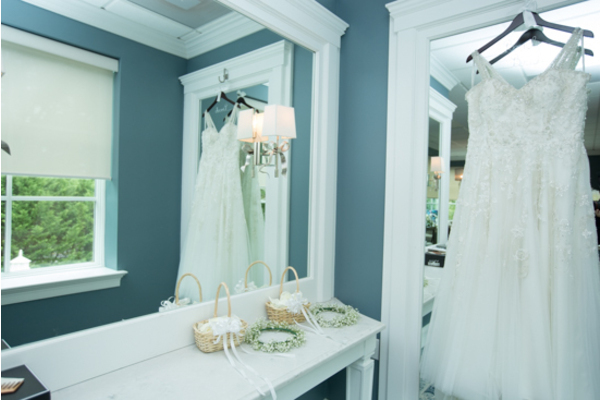 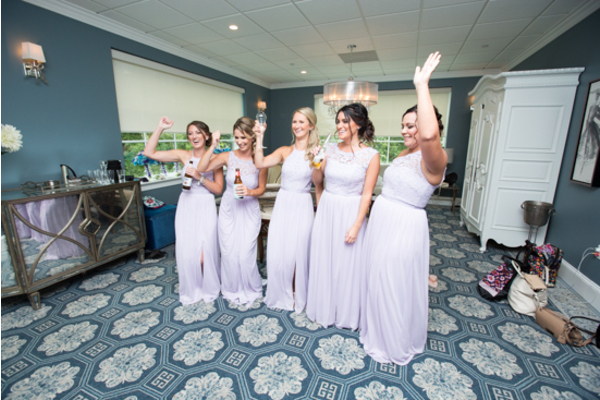 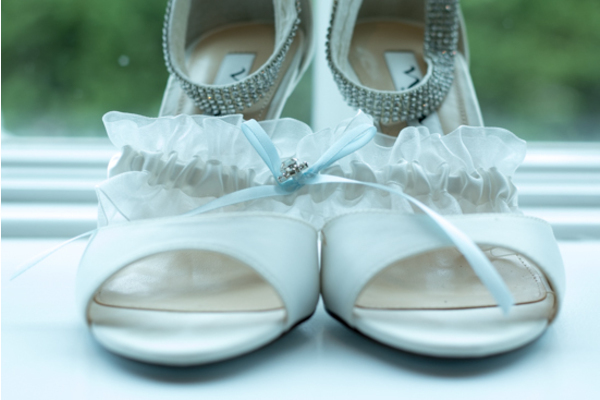 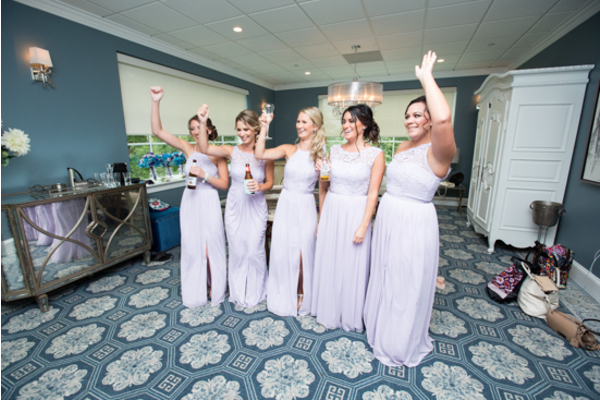 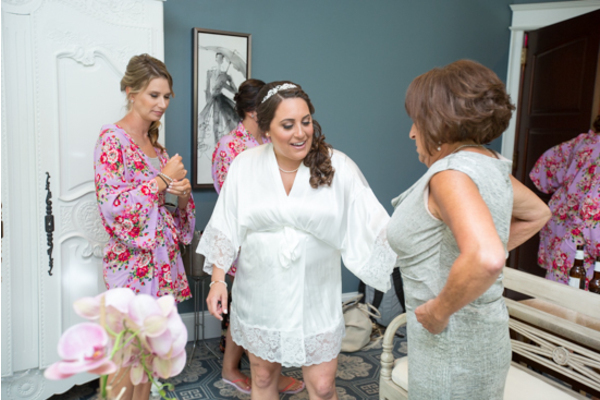 First off, our NJ Wedding Photographer started their day with the bride and her bridesmaids in the spacious bridal suite. 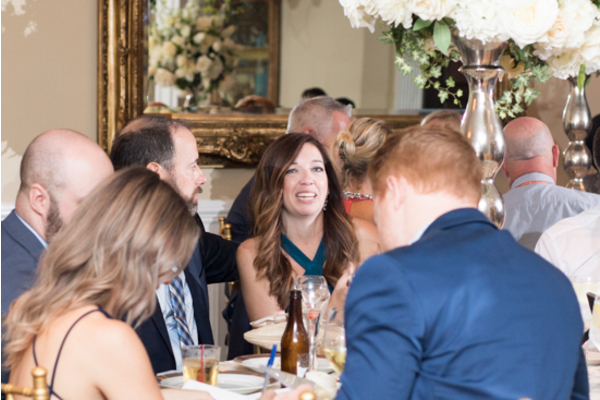 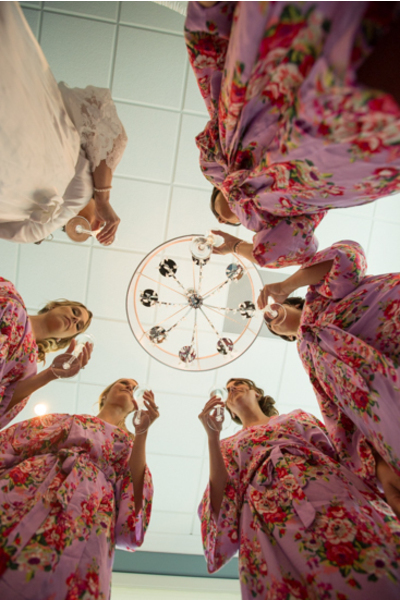 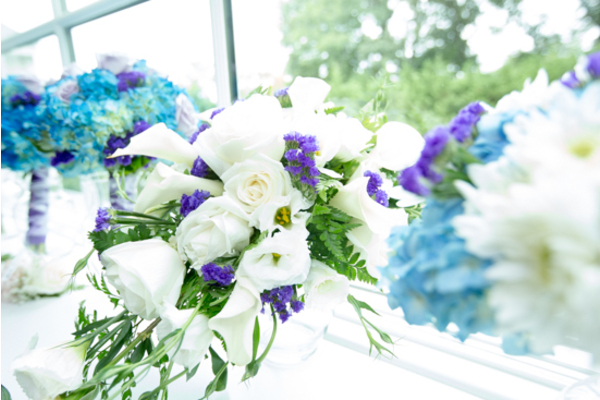 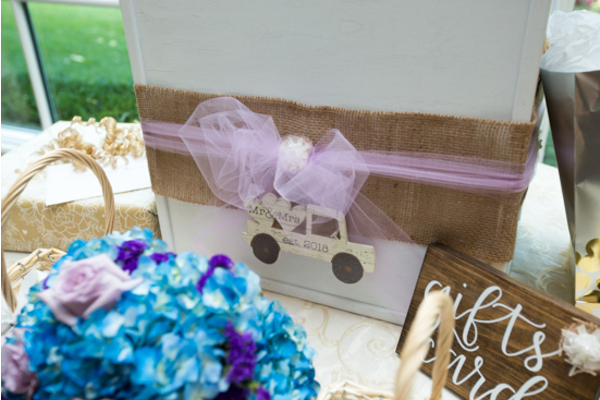 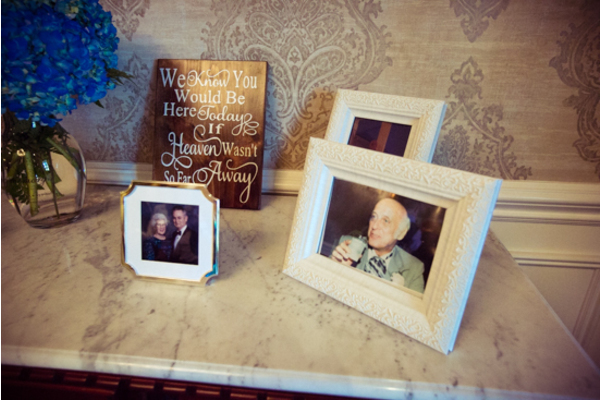 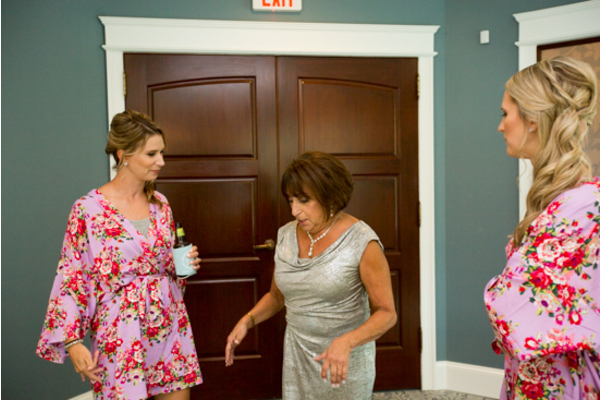 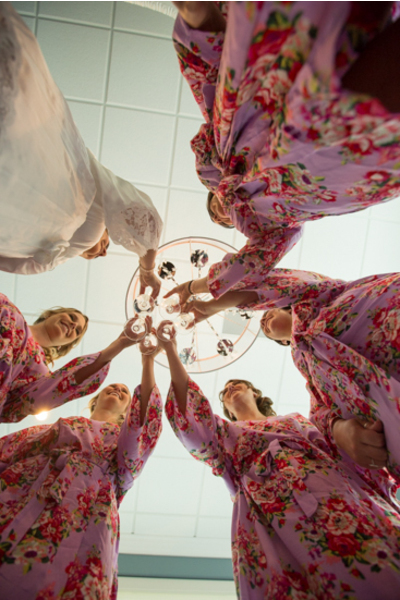 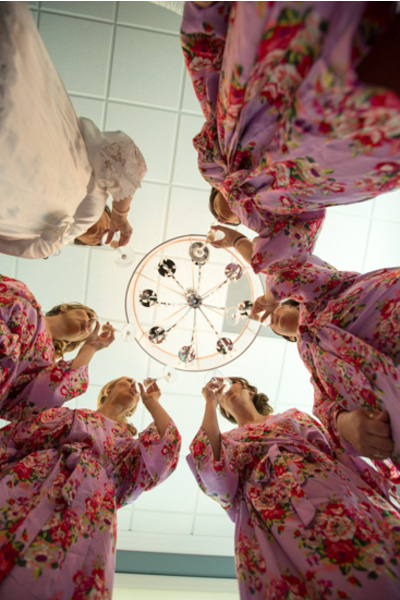 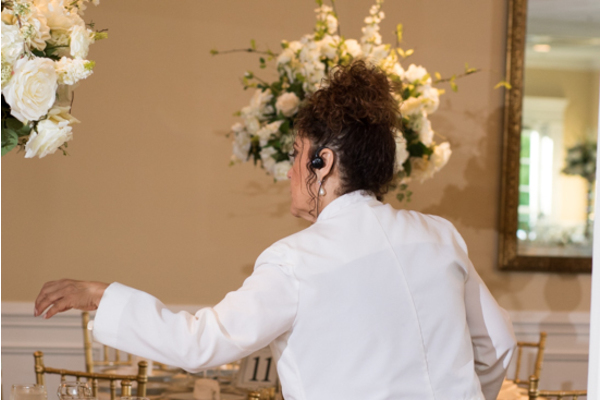 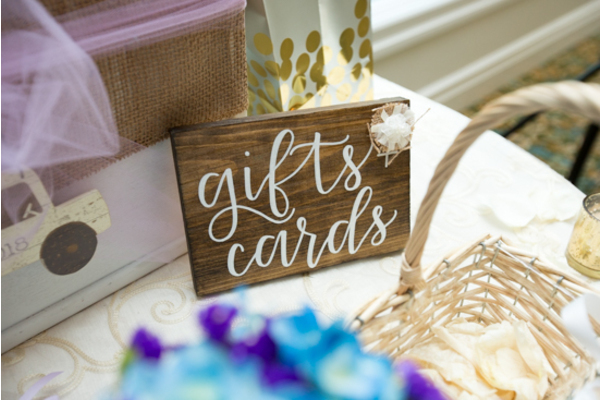 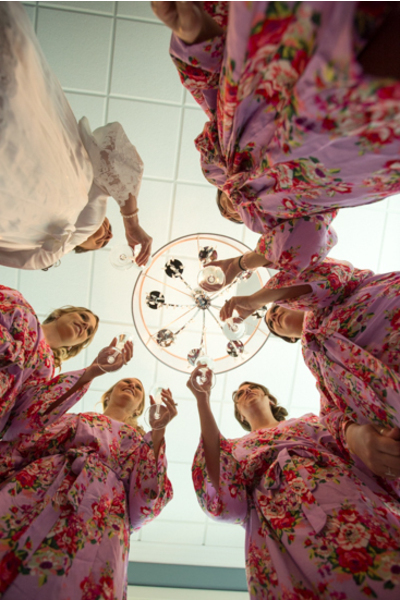 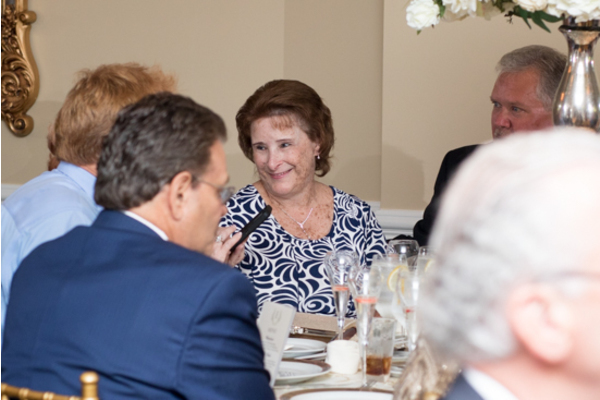 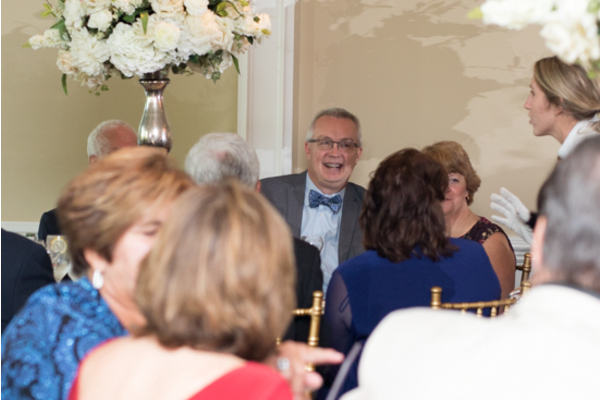 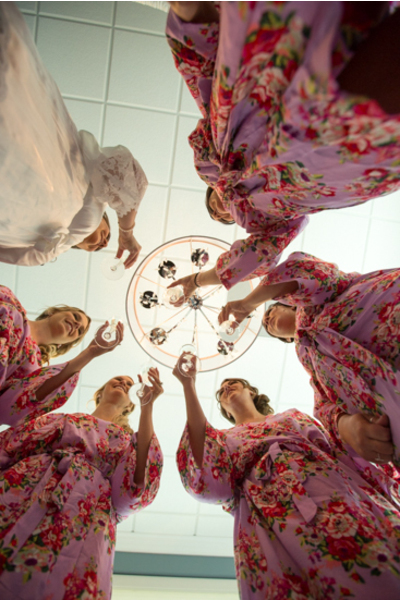 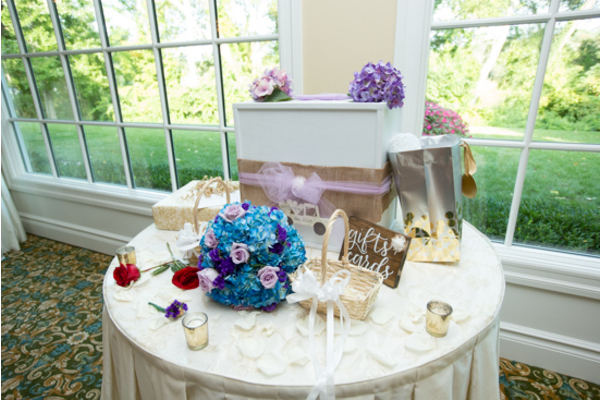 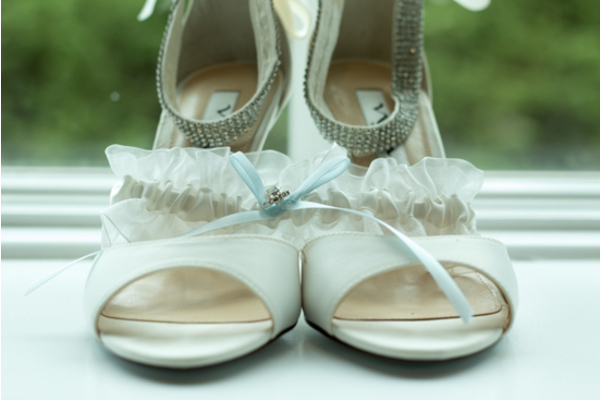 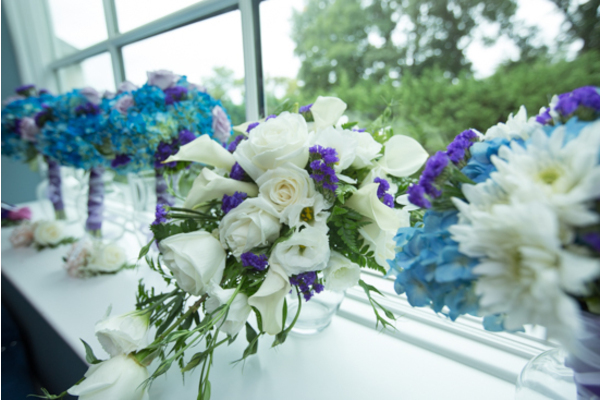 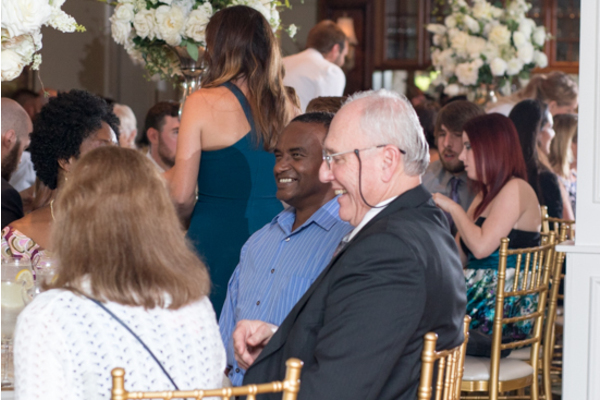 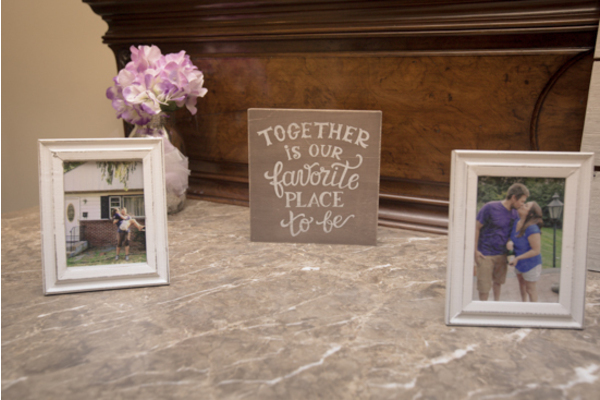 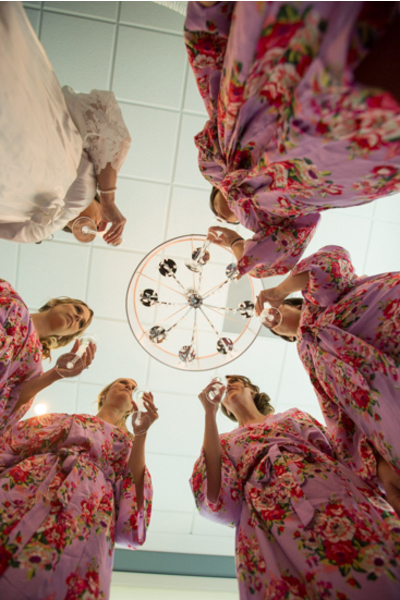 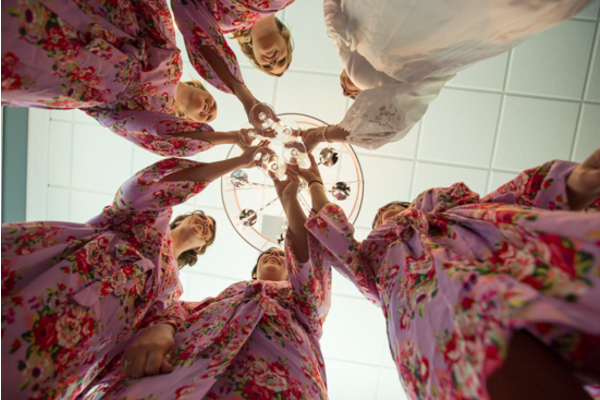 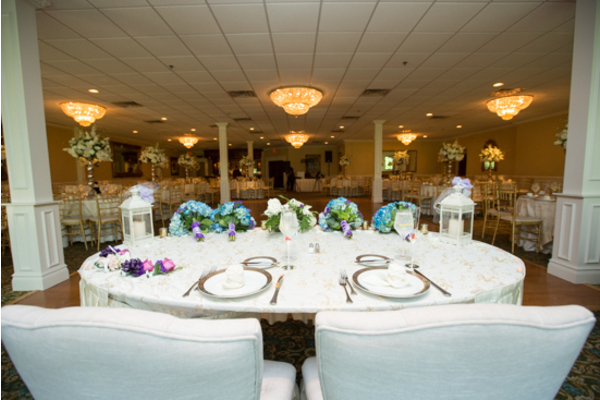 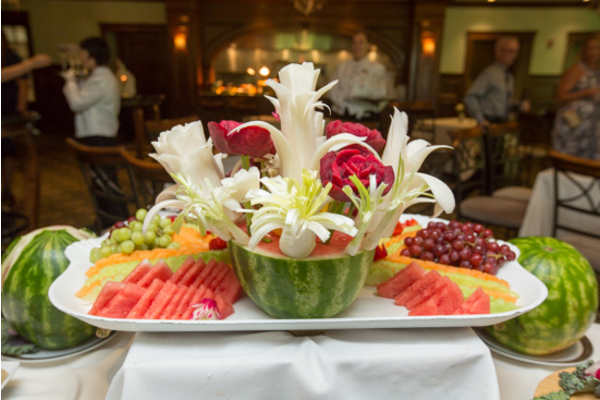 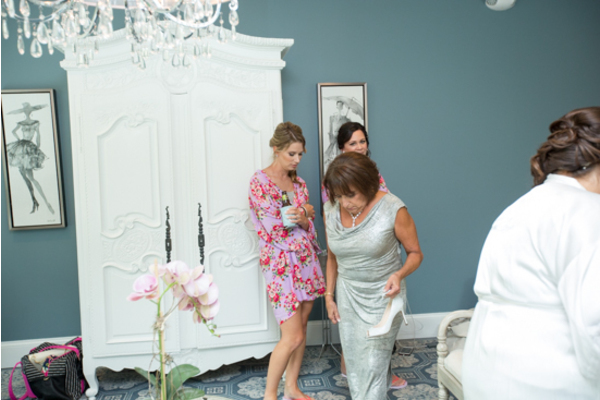 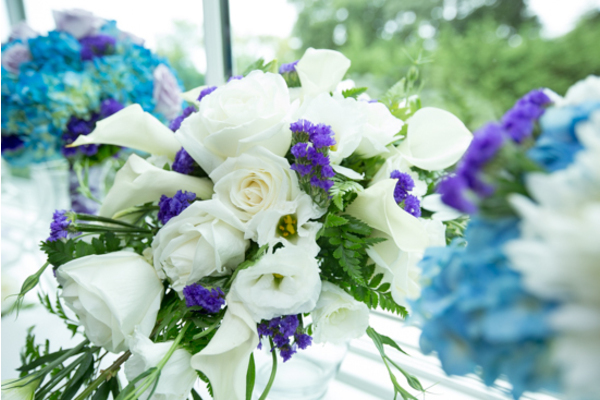 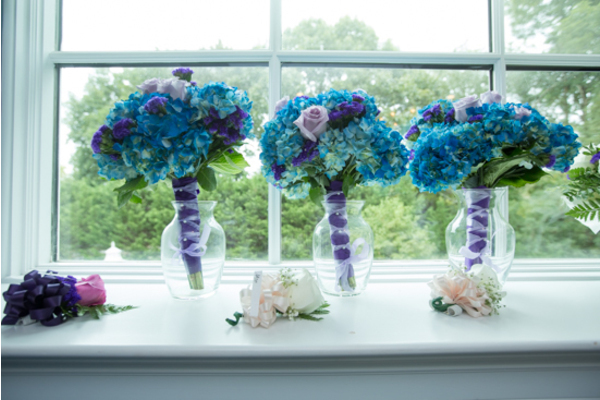 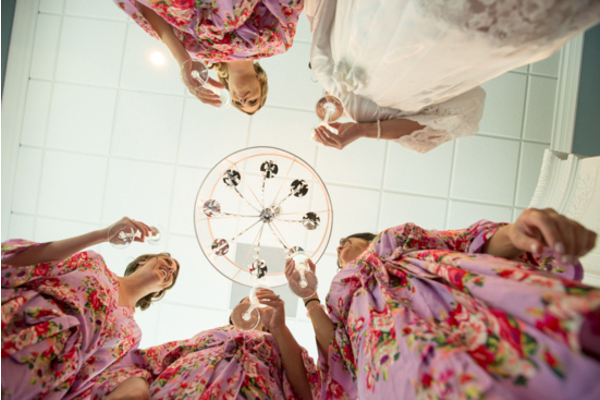 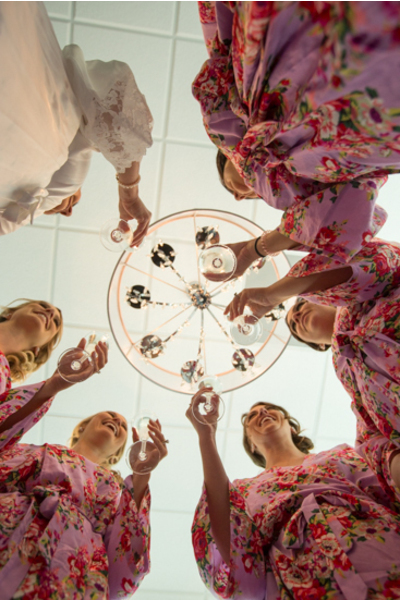 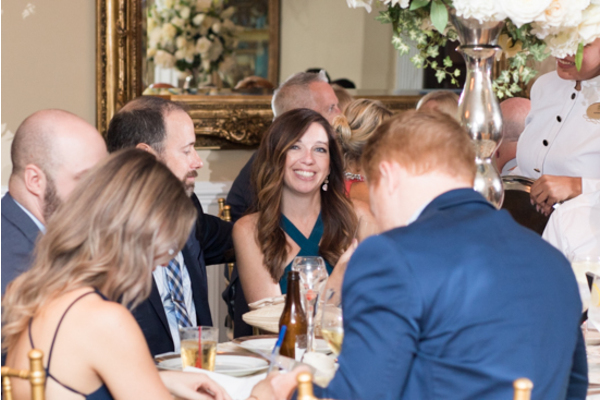 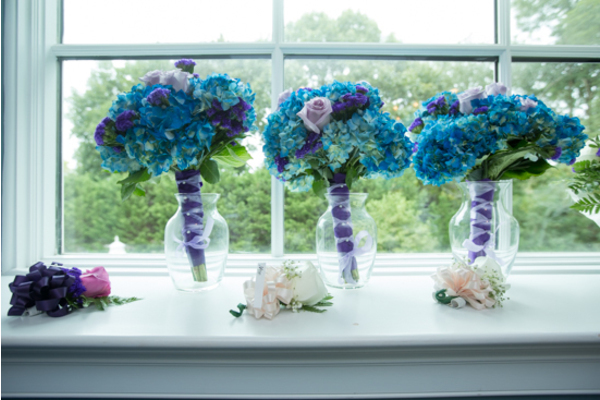 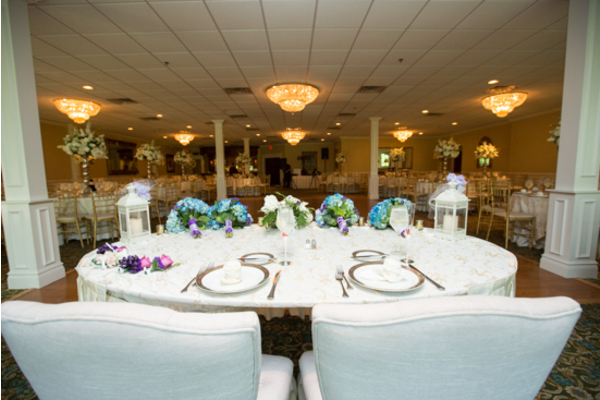 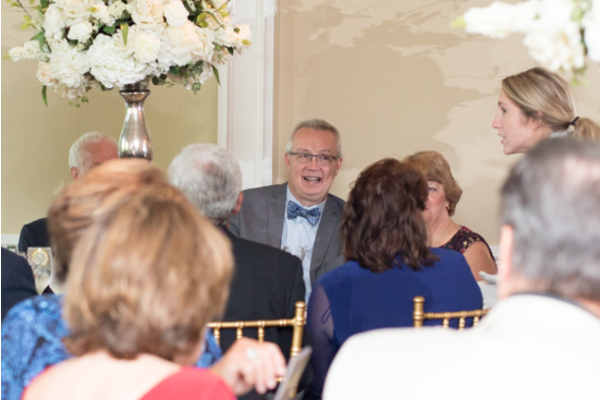 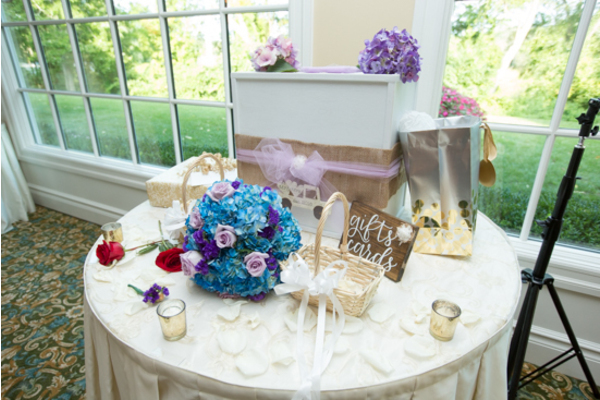 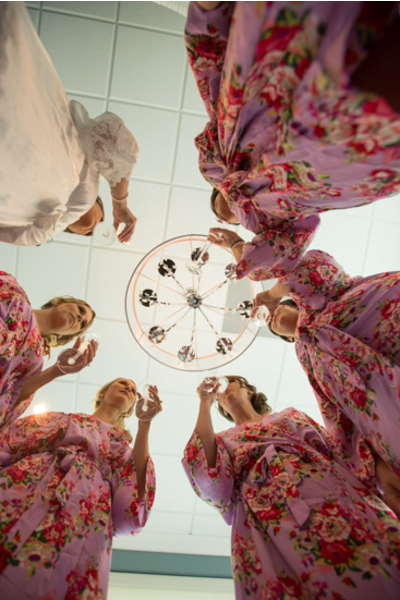 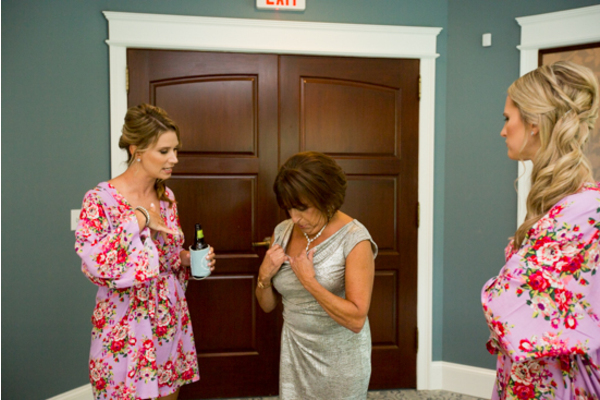 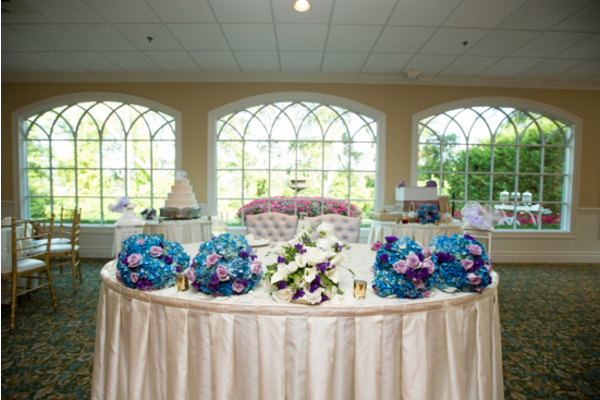 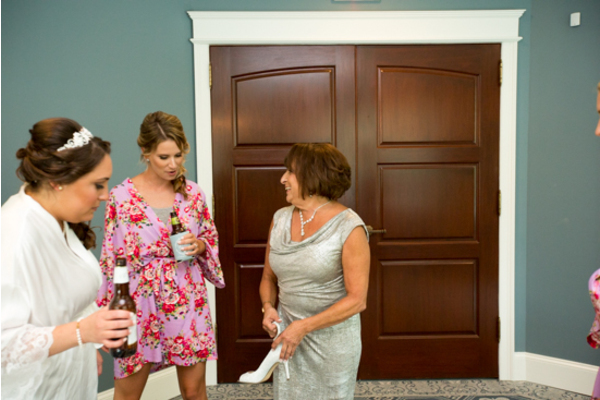 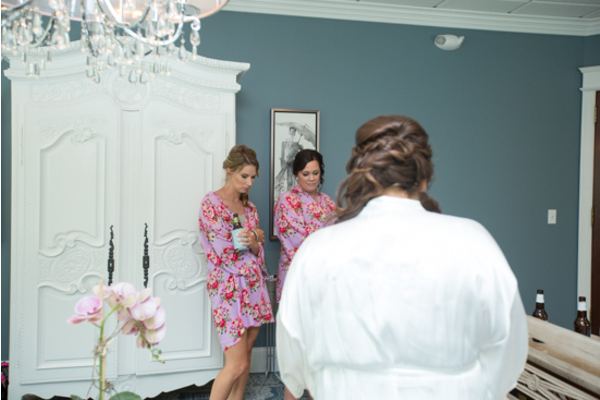 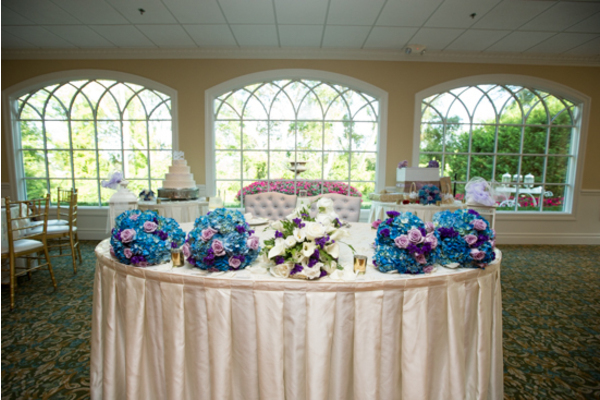 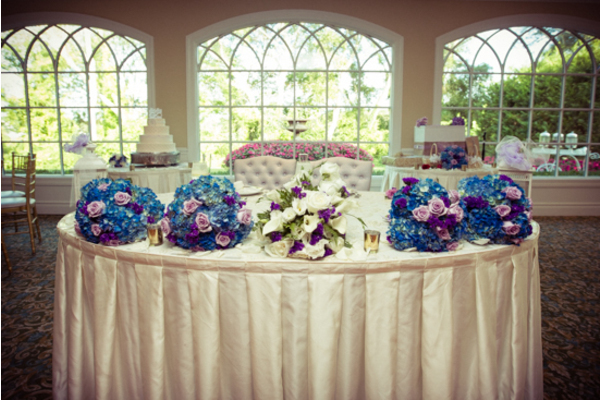 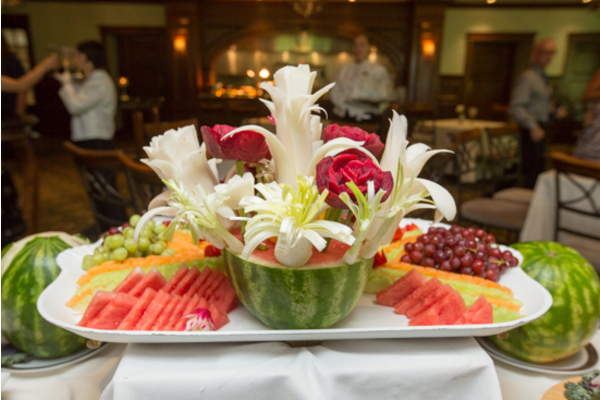 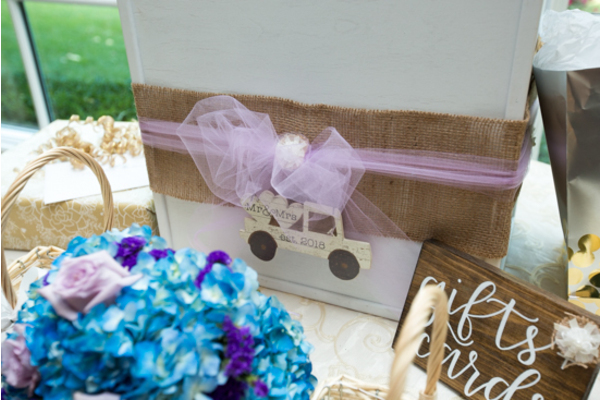 The room was filled with love and laughter, pink floral robes, and blue floral bouquets. 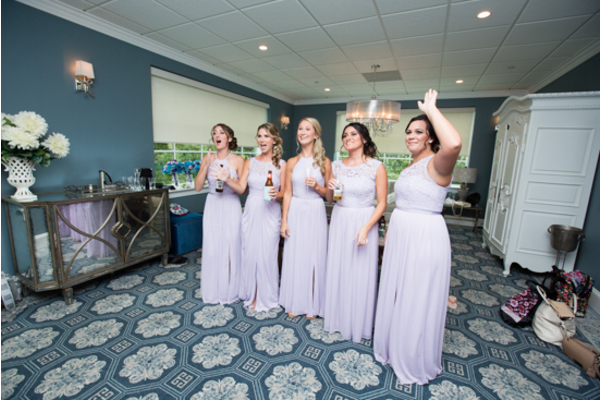 The ladies raised their glasses of champagne and cheered to Kaitlin. 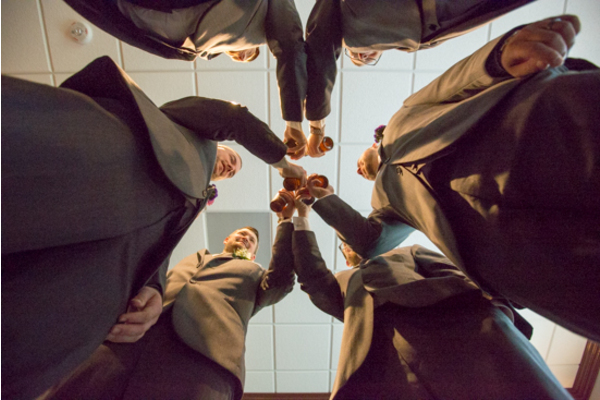 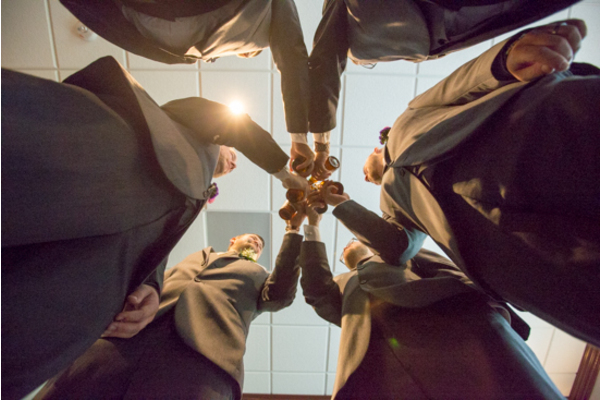 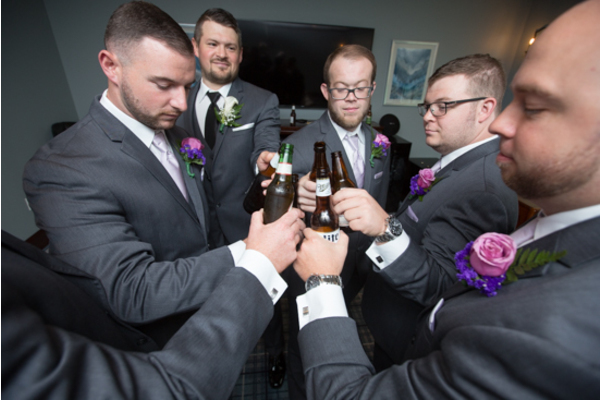 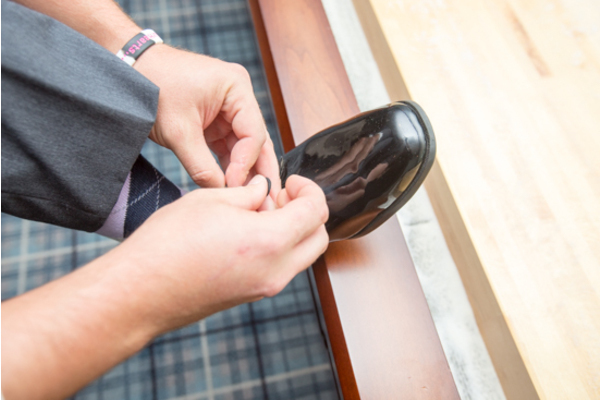 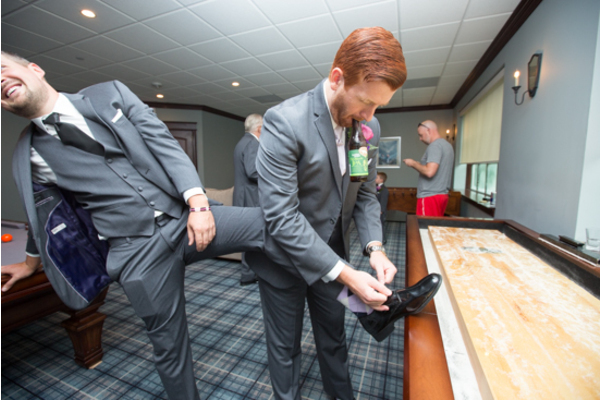 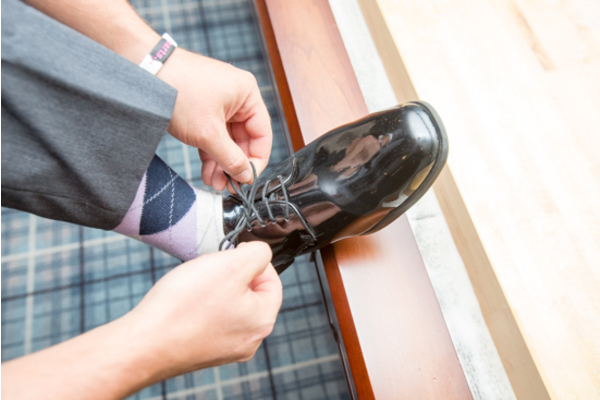 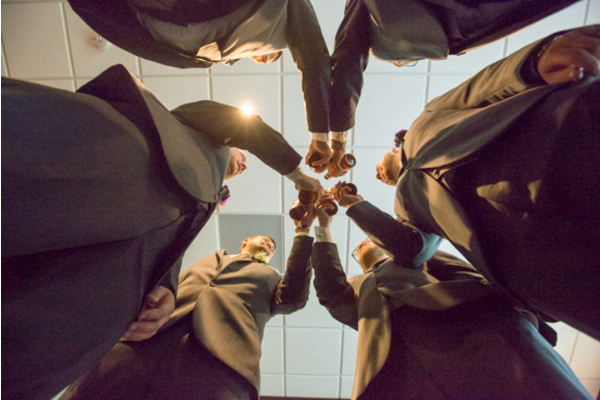 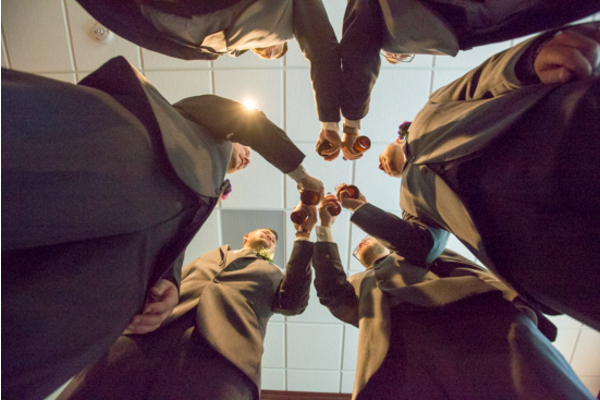 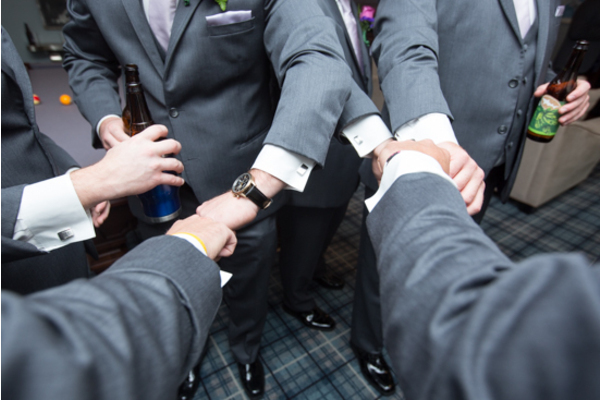 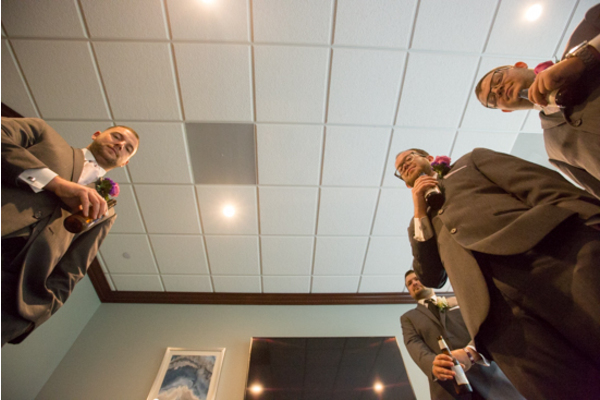 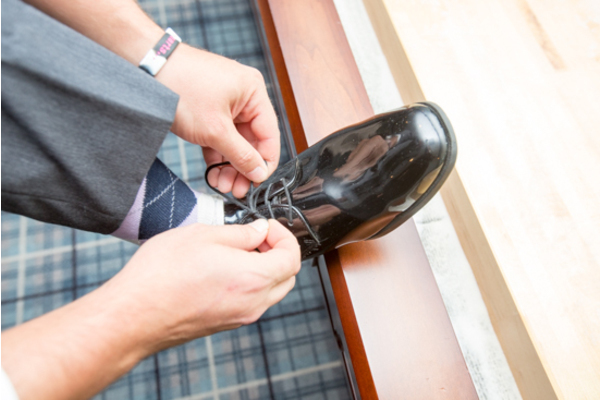 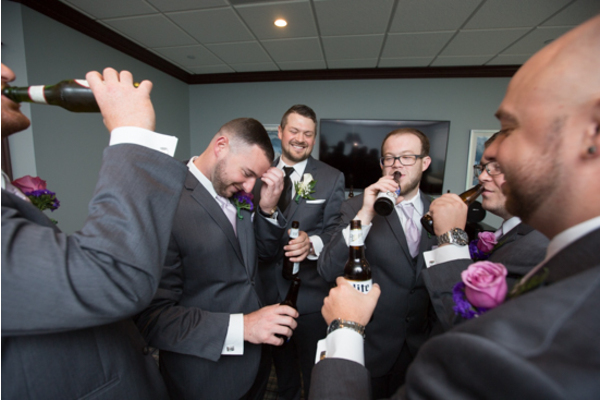 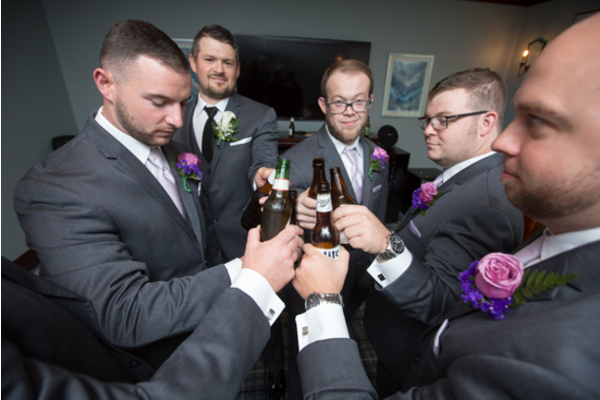 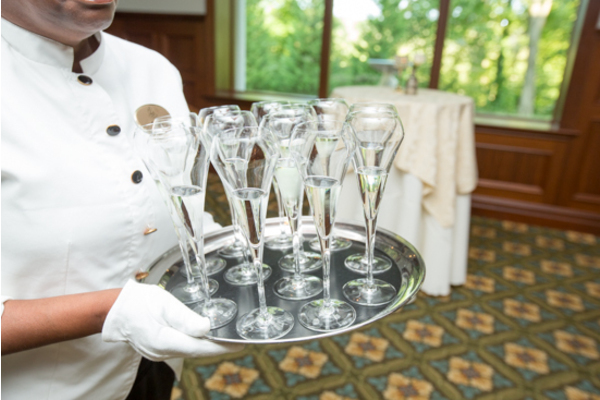 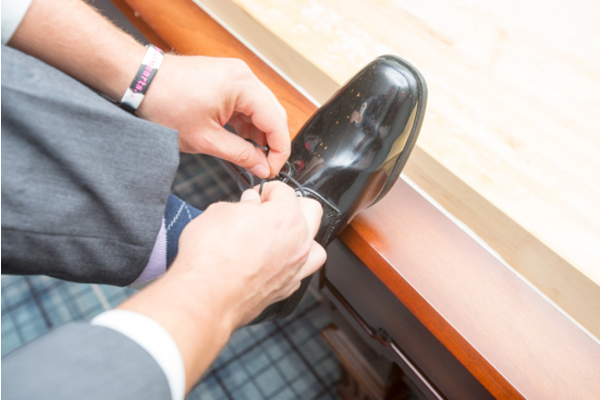 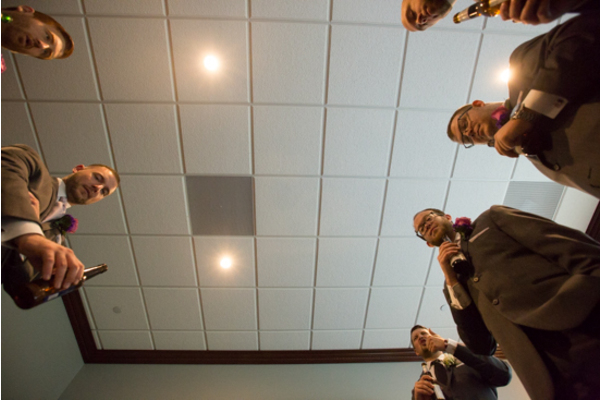 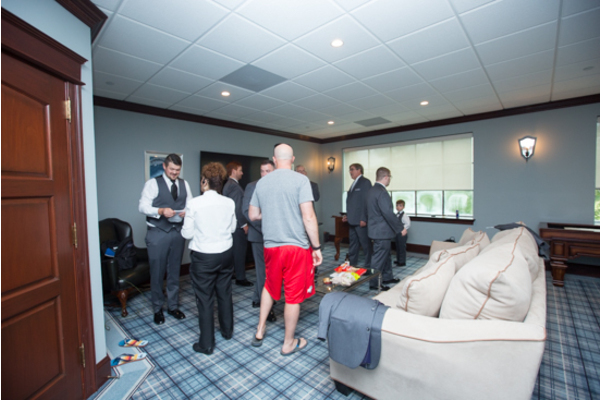 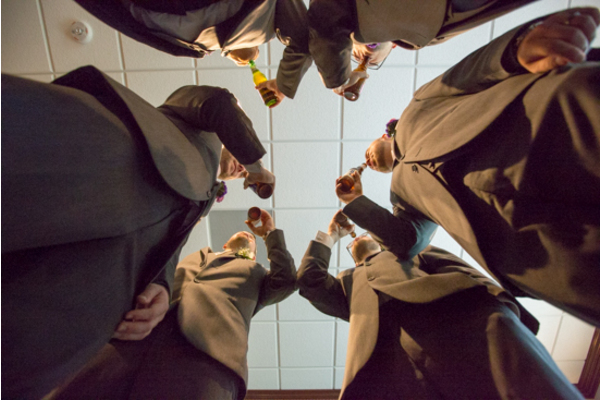 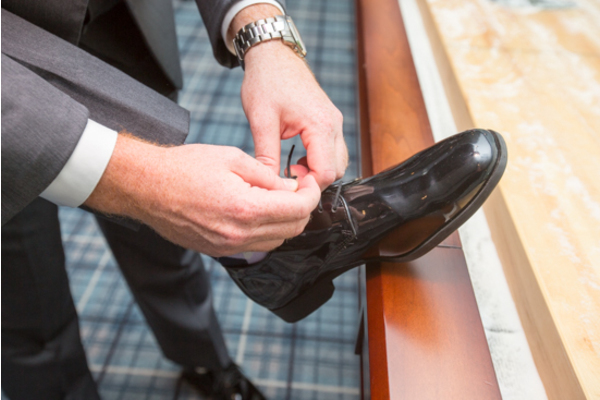 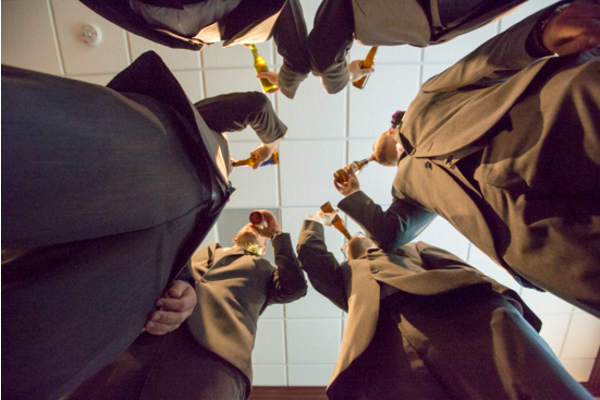 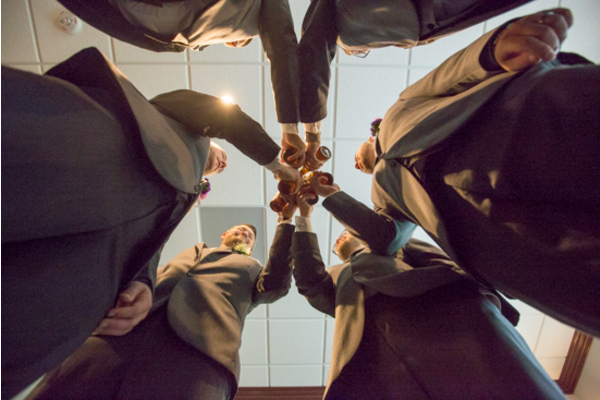 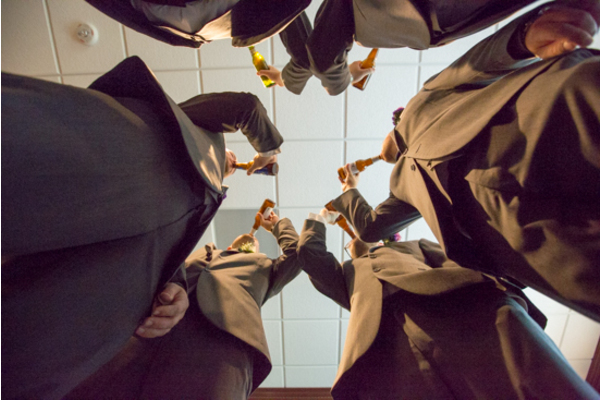 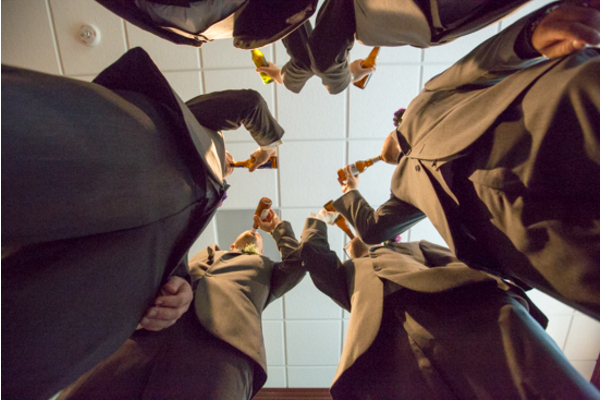 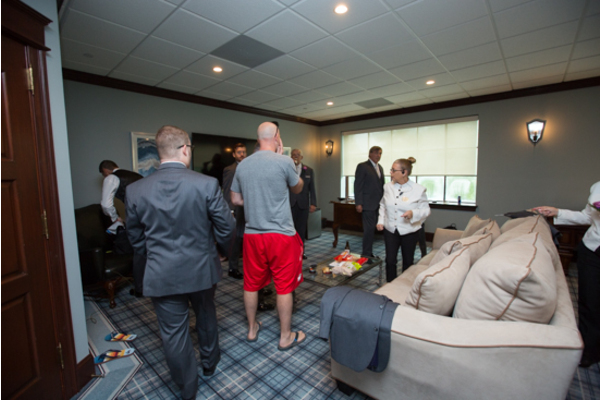 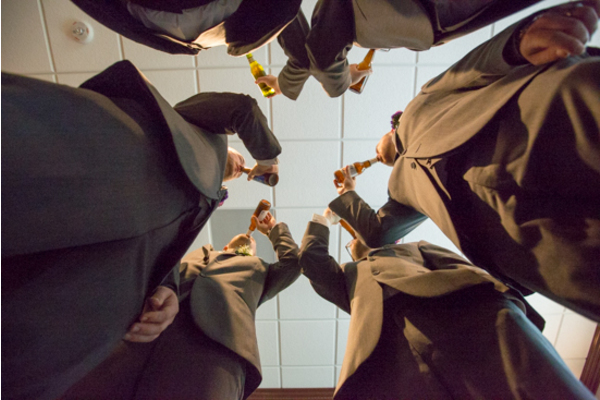 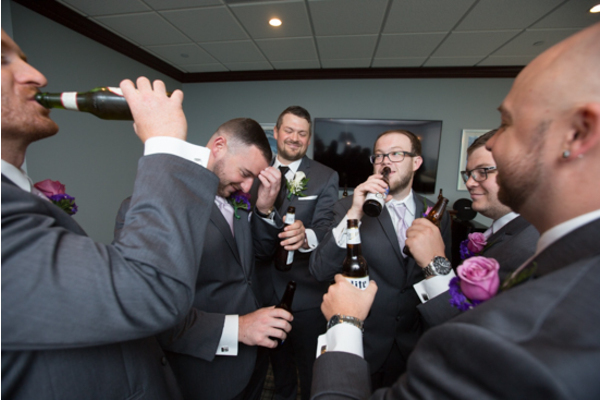 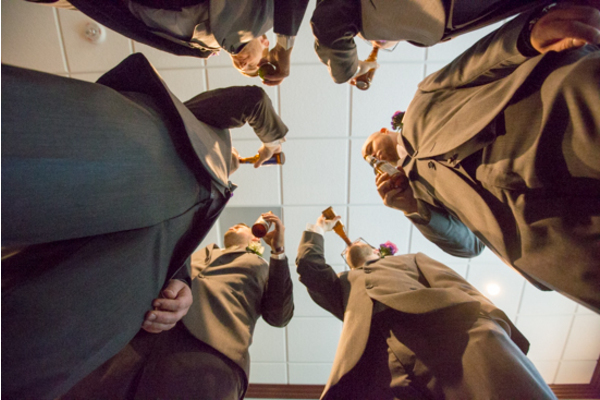 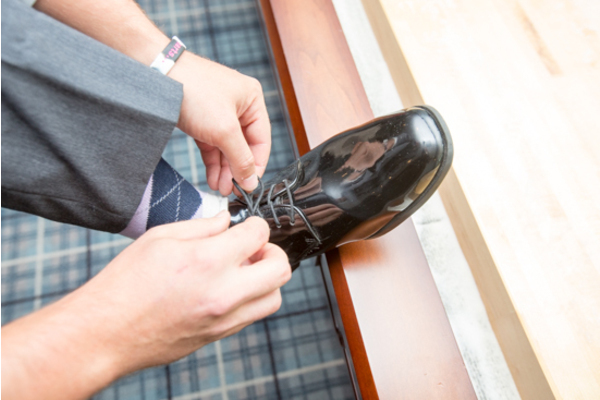 In the groom’s suite, the guys raised their beer bottles and made their toast as well. 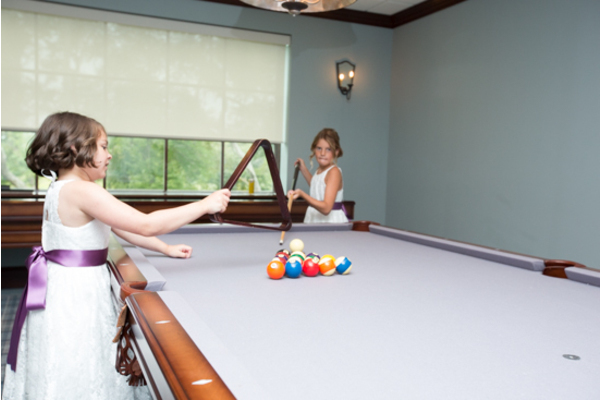 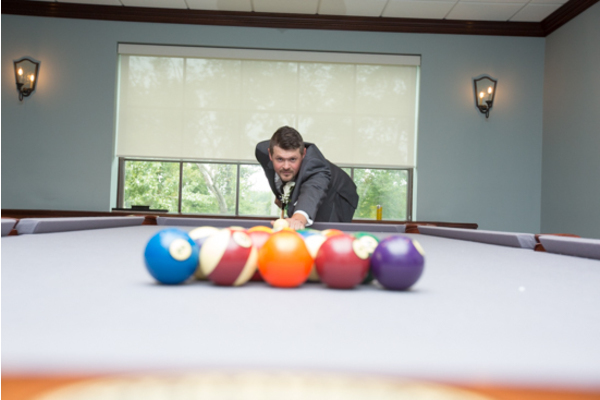 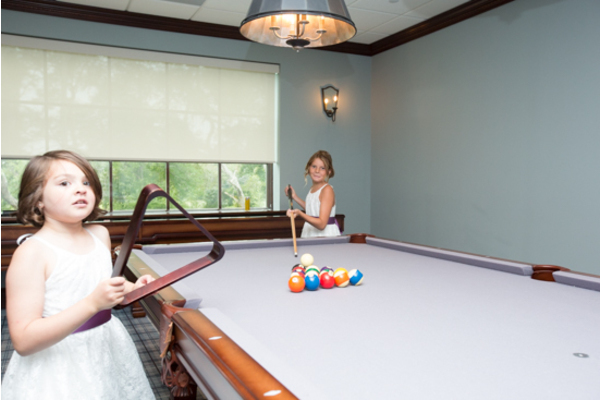 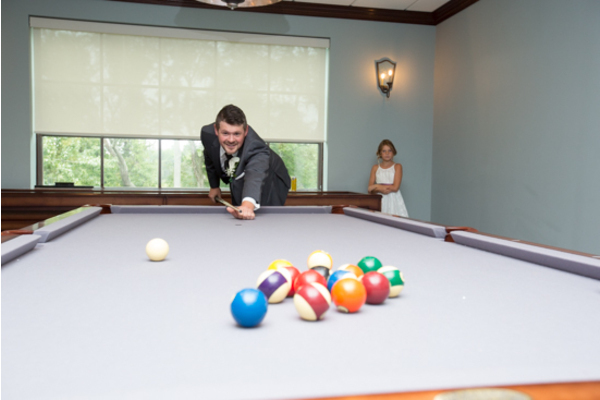 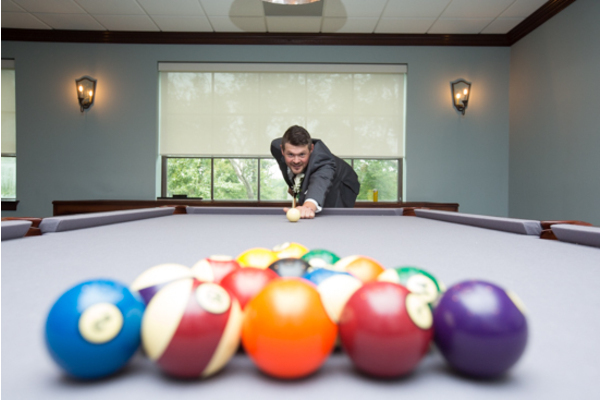 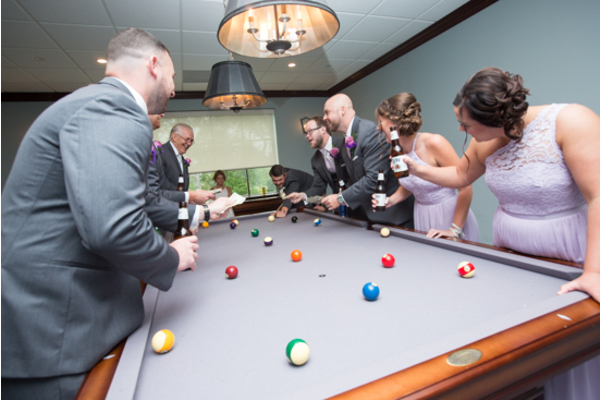 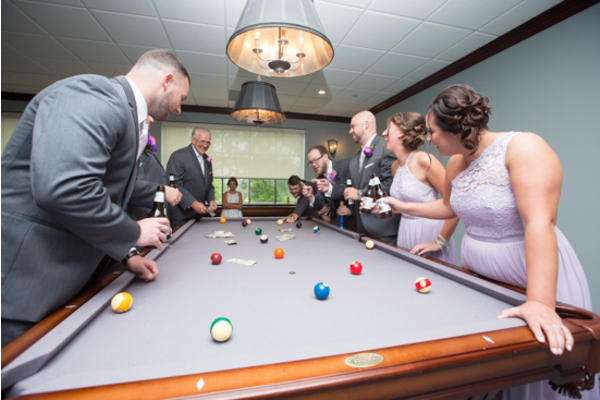 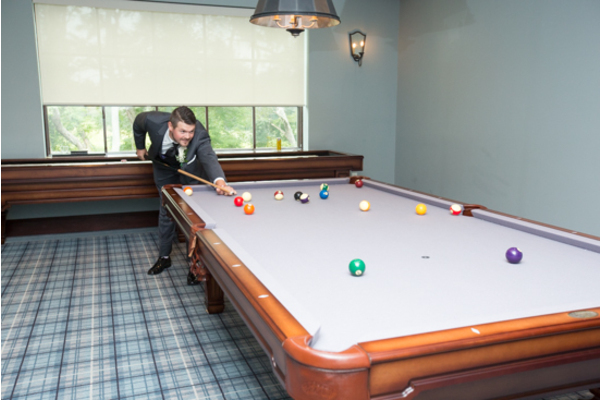 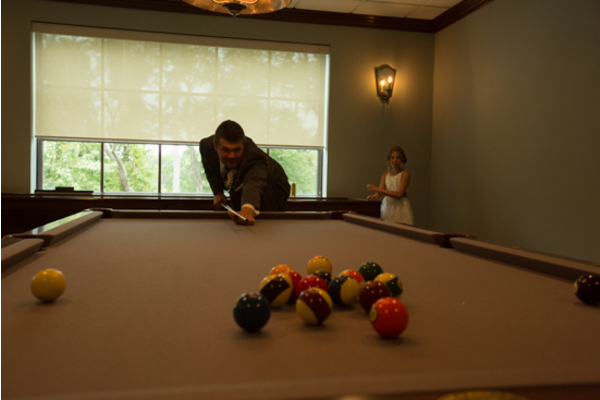 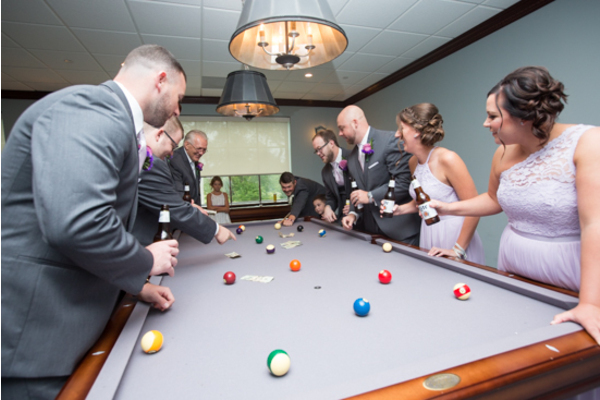 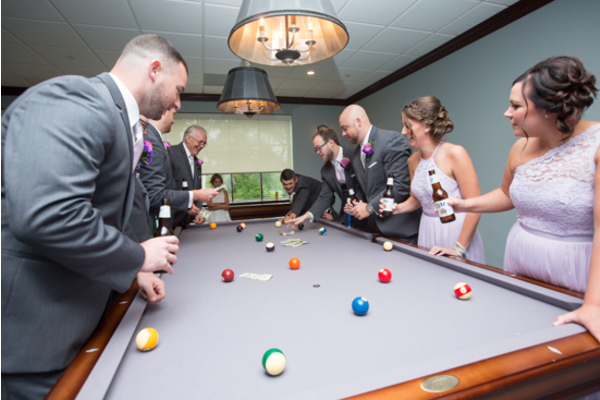 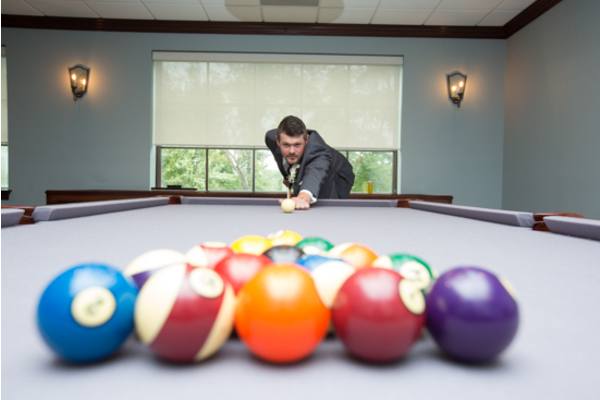 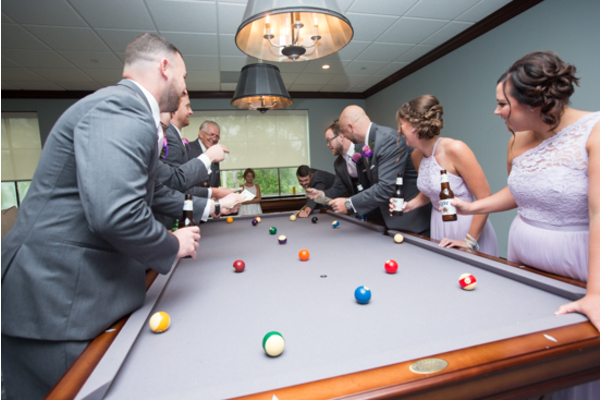 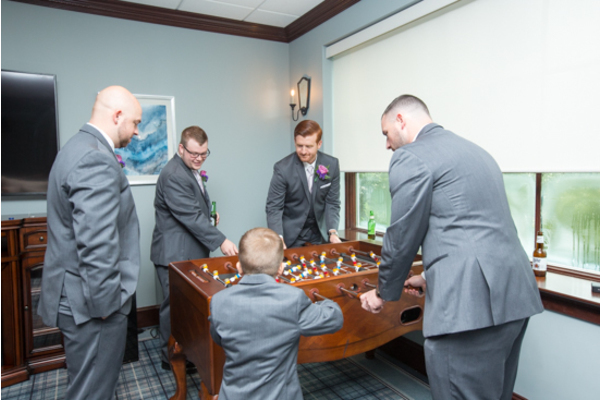 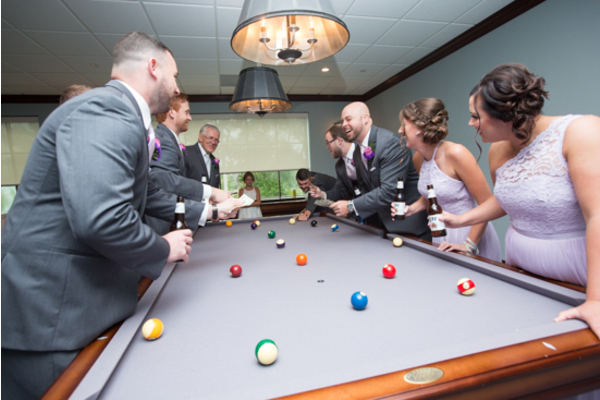 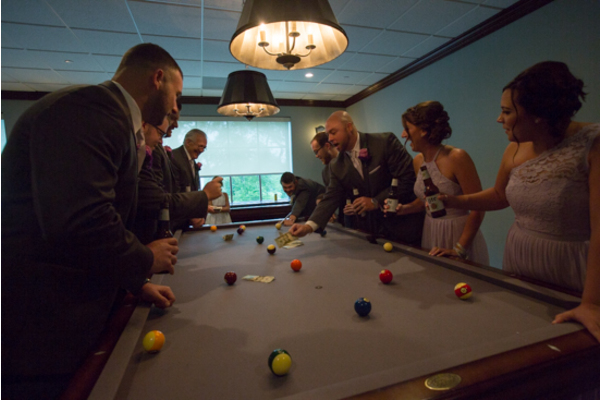 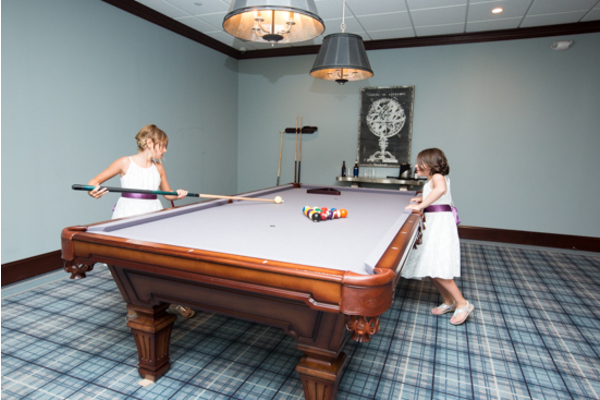 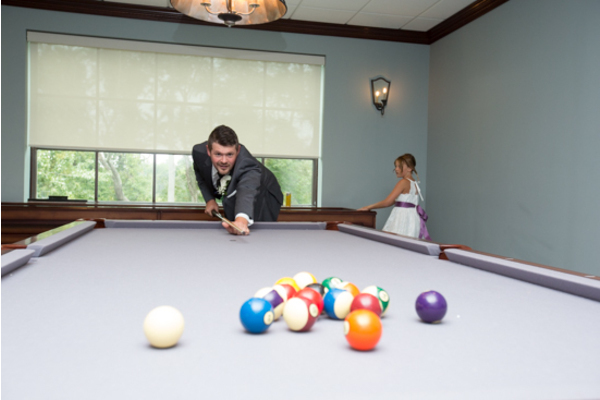 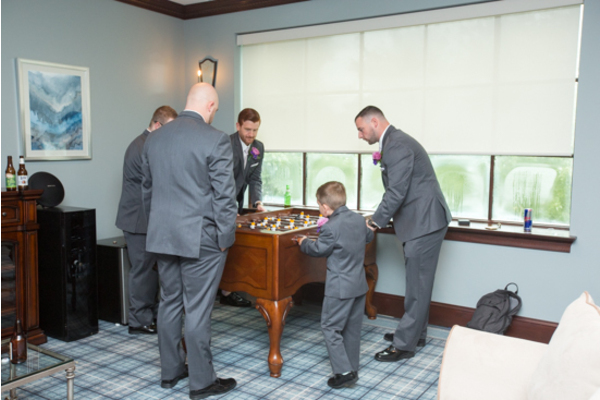 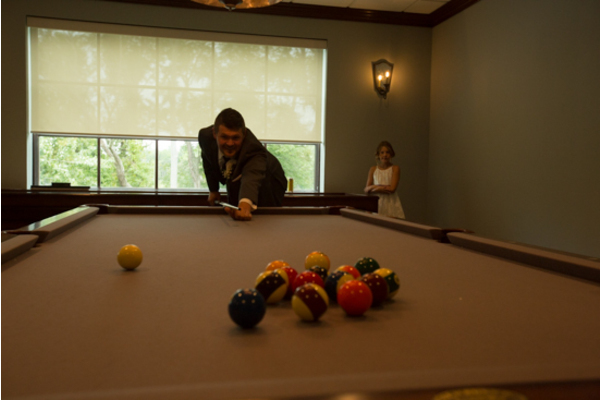 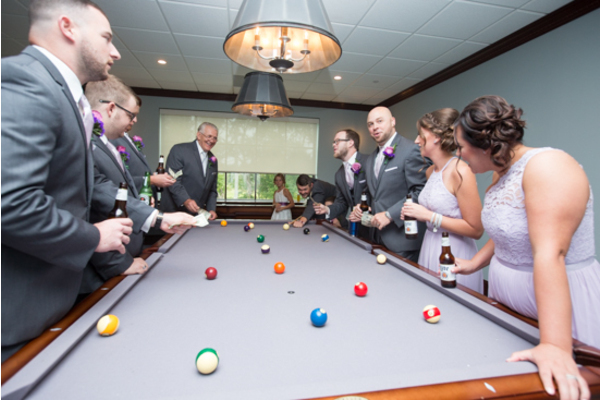 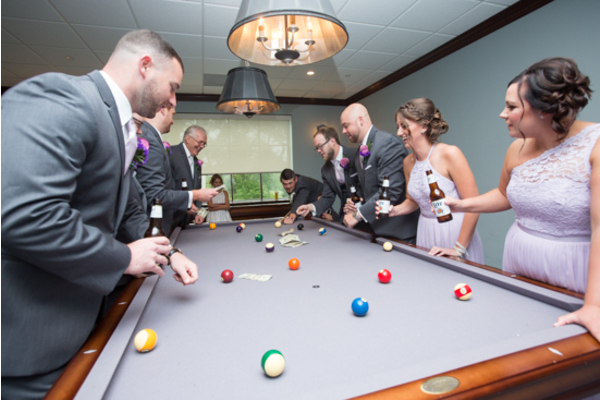 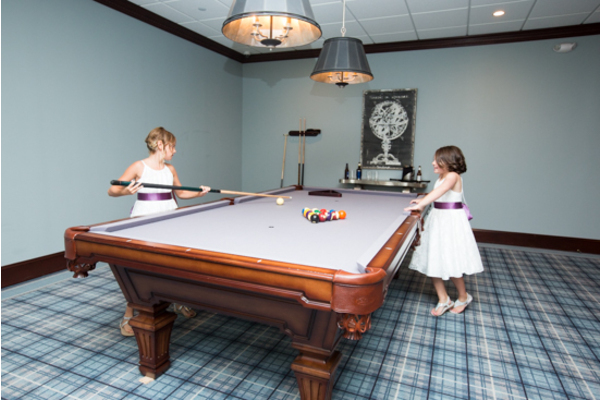 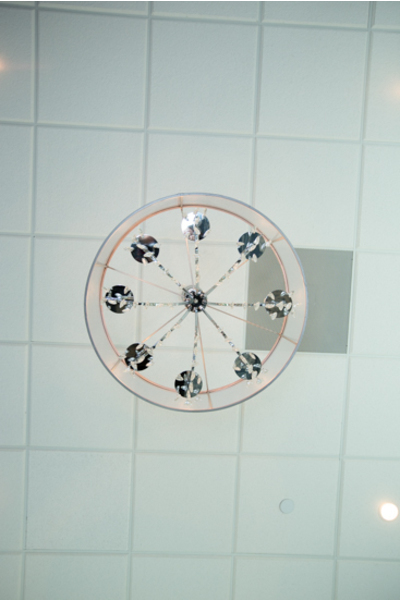 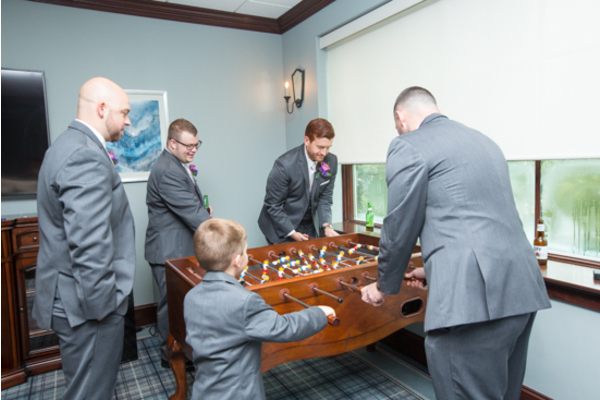 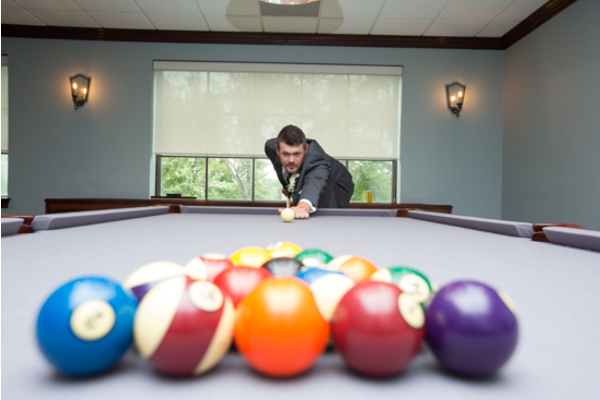 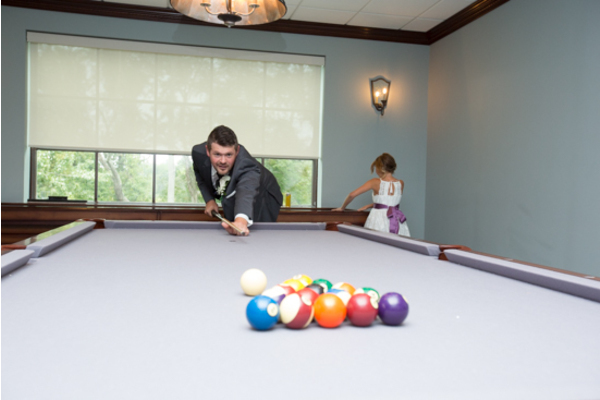 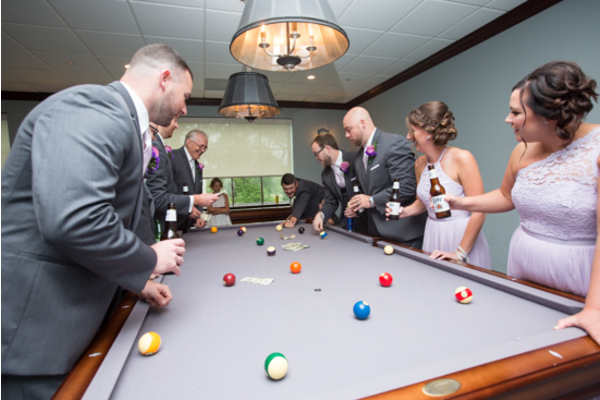 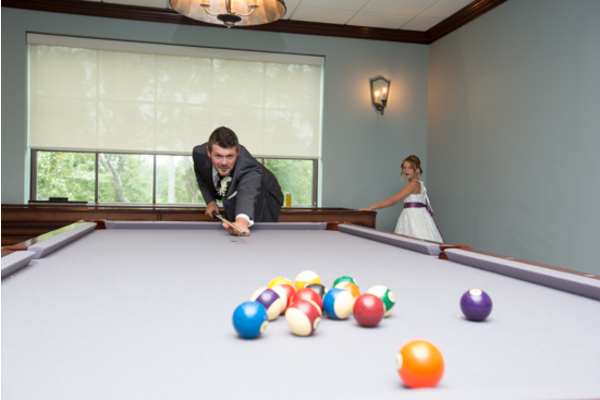 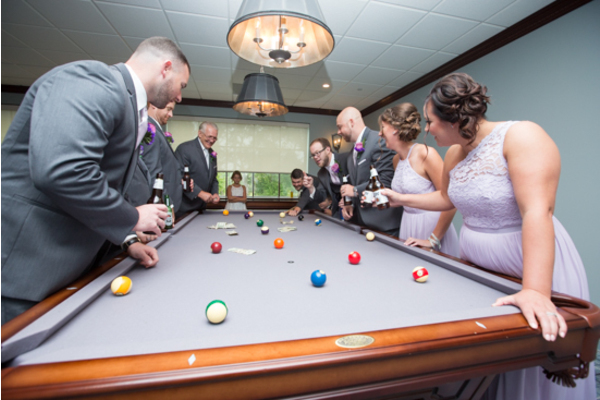 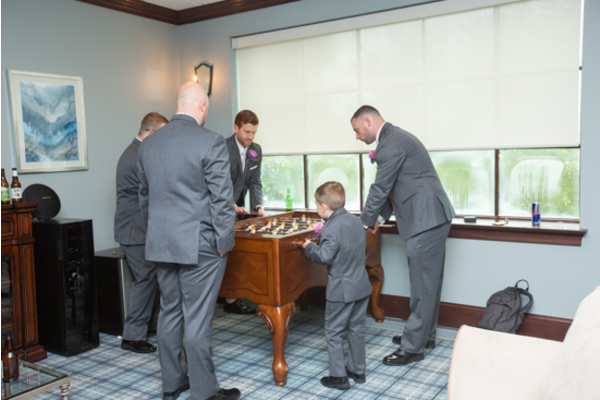 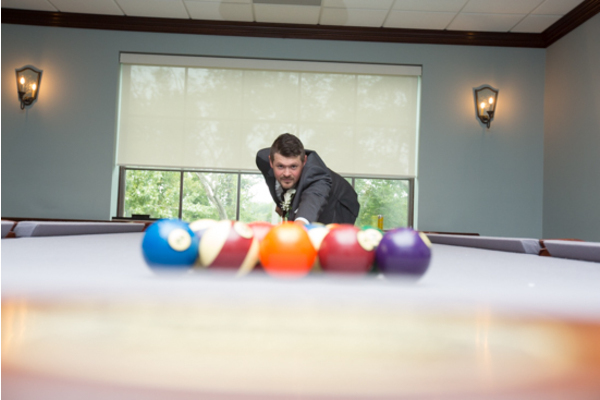 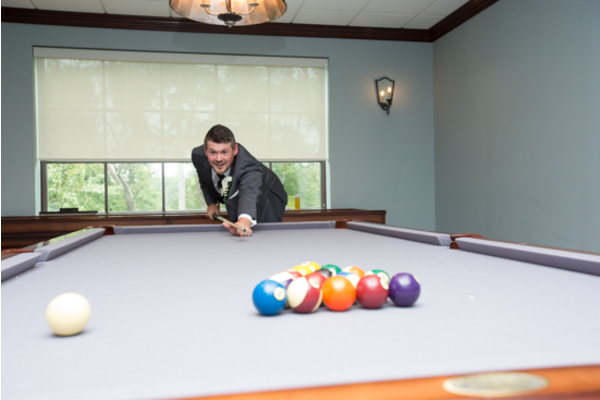 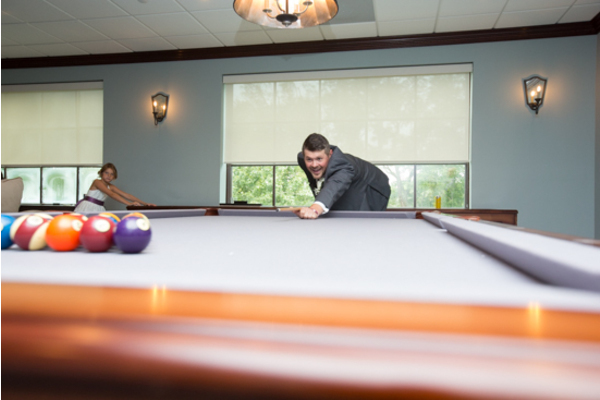 Shortly after, the party played a quick game of pool before the special day was about to officially begin! 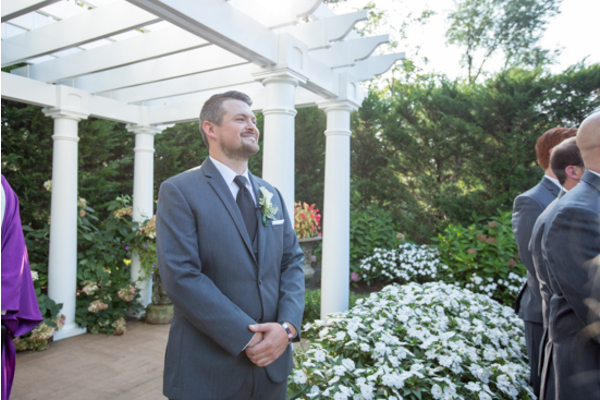 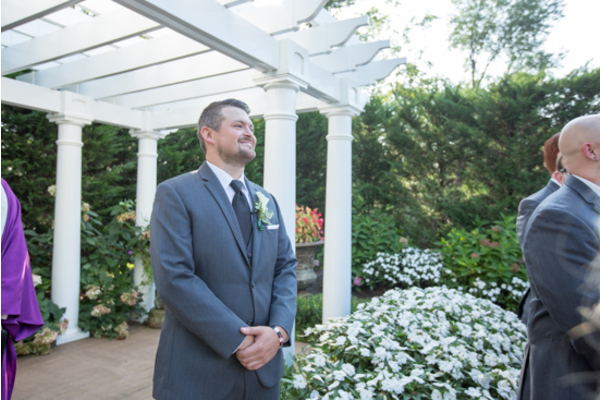 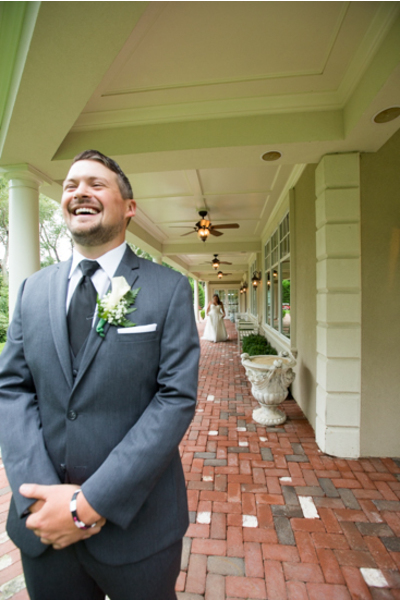 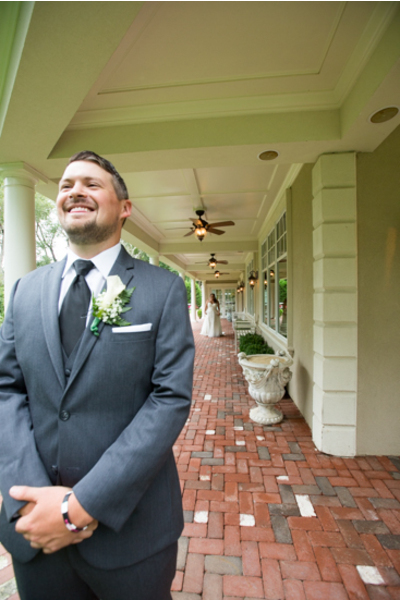 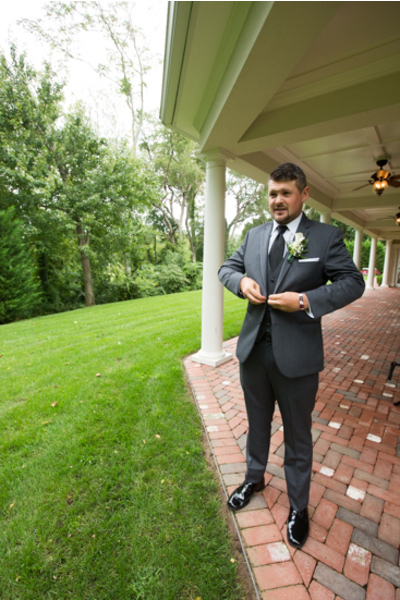 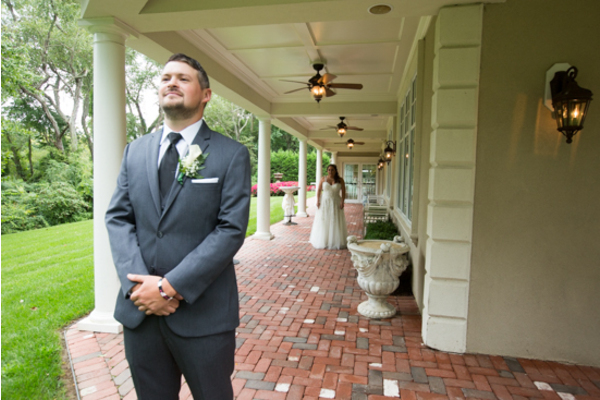 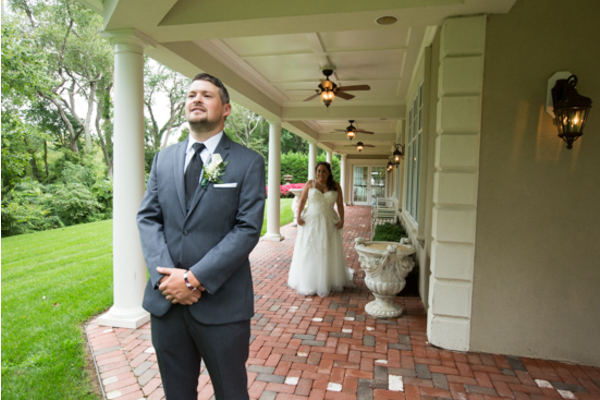 Mitchell was all smiles as he stood outside on the patio patiently waiting to lay eyes on his beautiful bride for the first time that day. 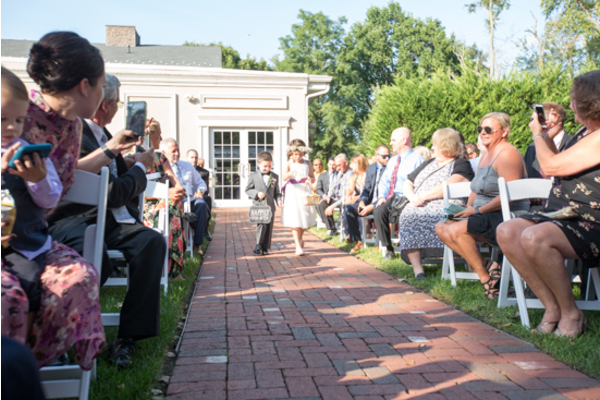 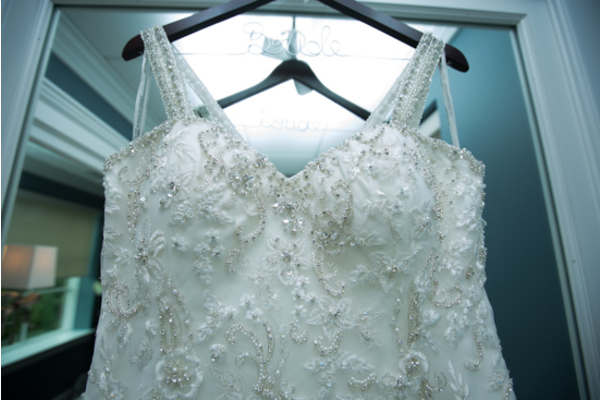 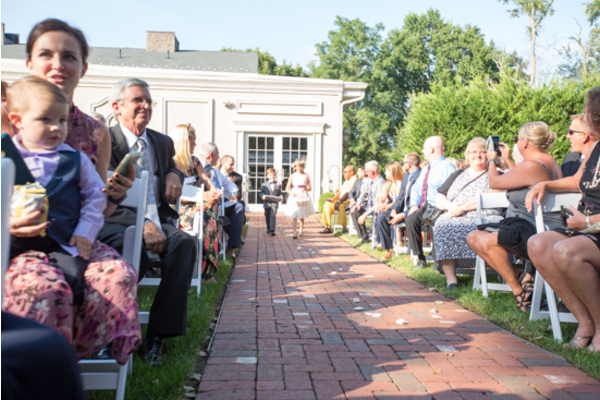 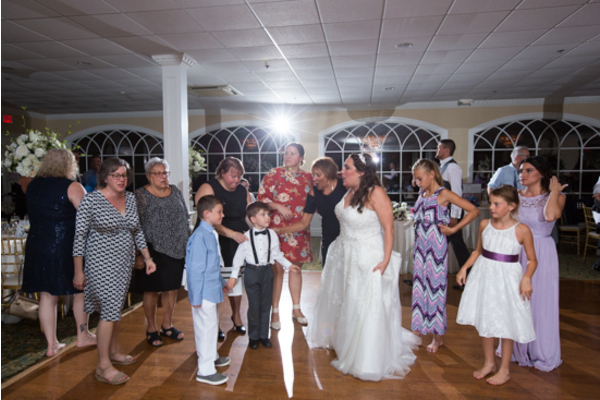 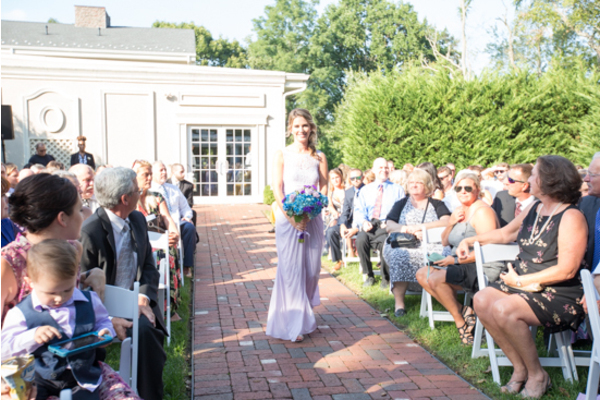 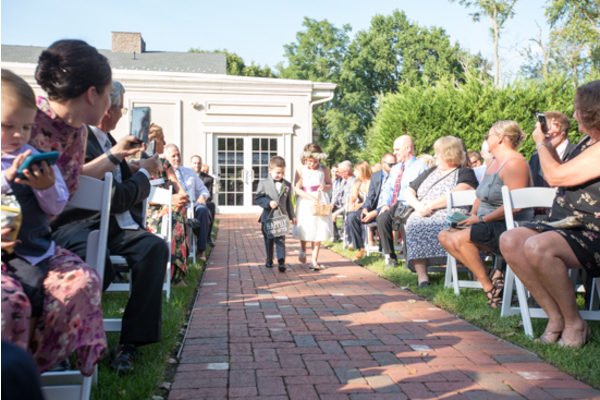 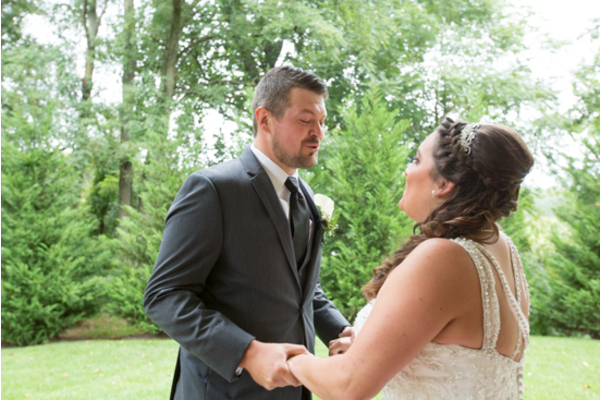 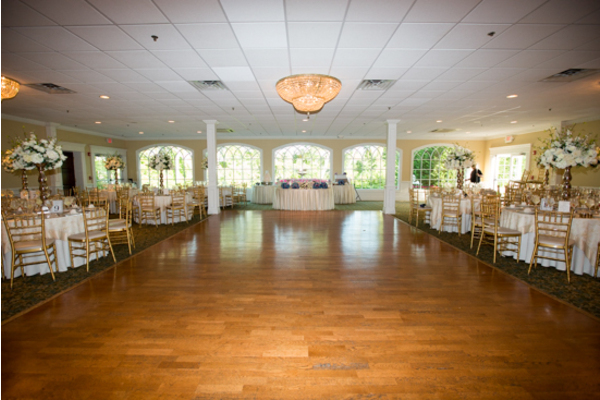 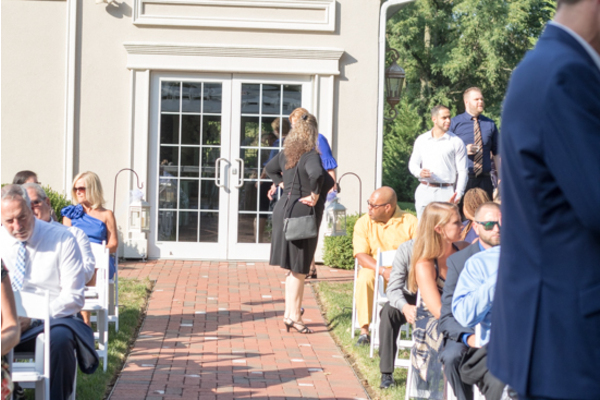 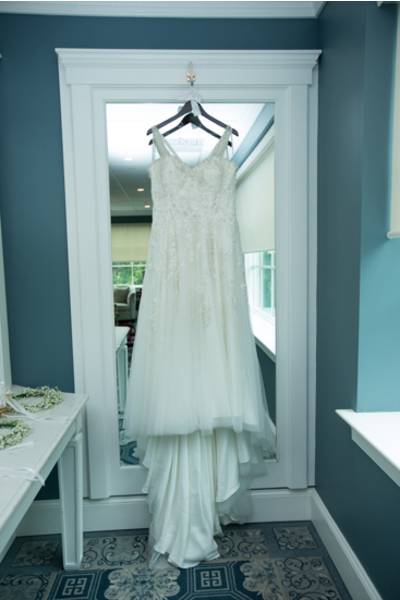 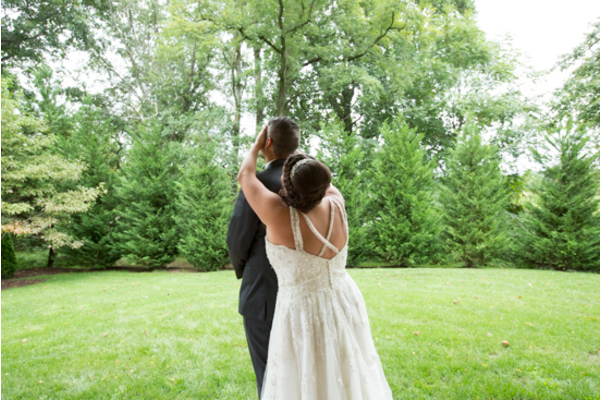 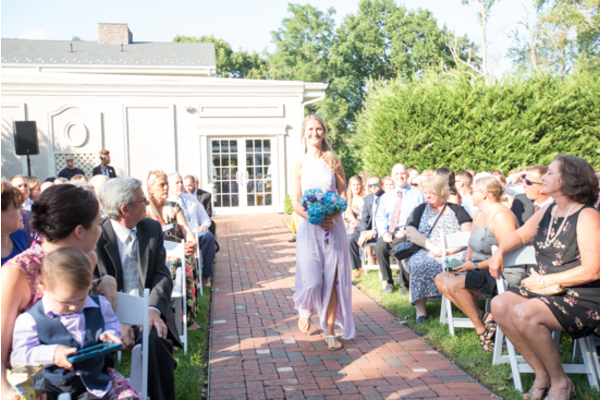 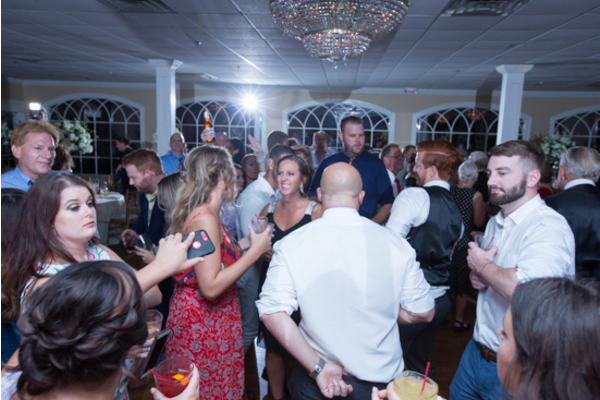 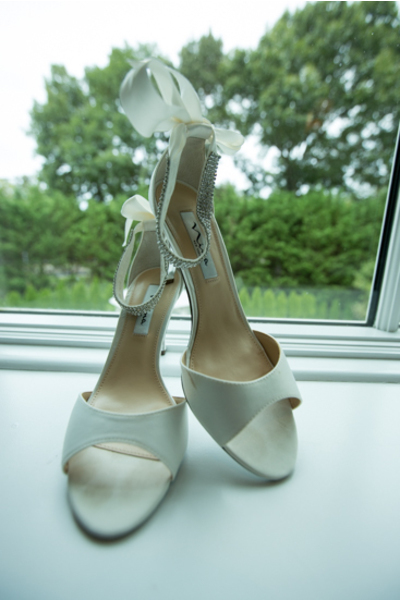 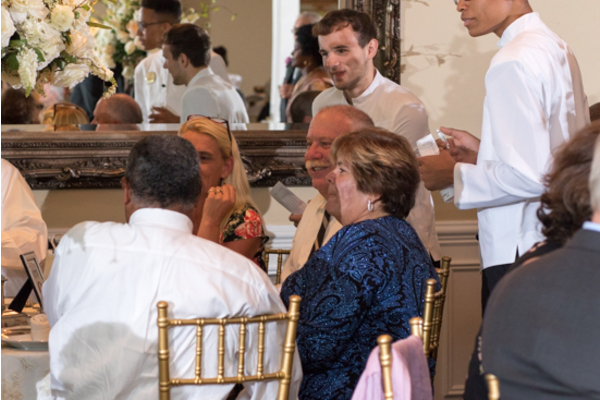 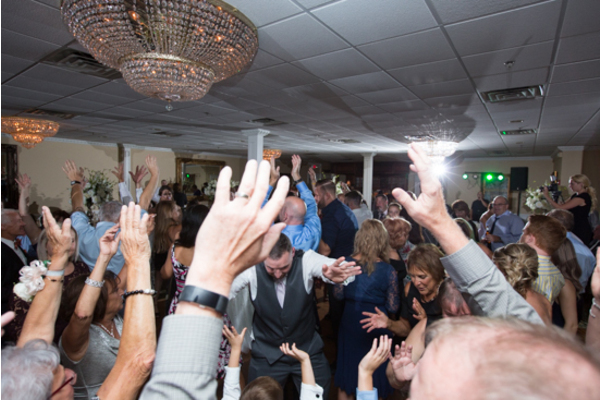 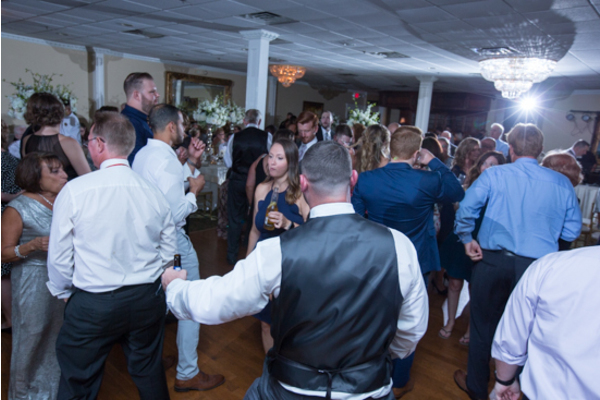 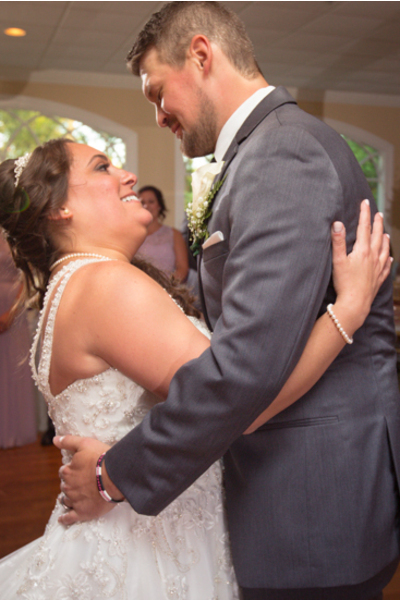 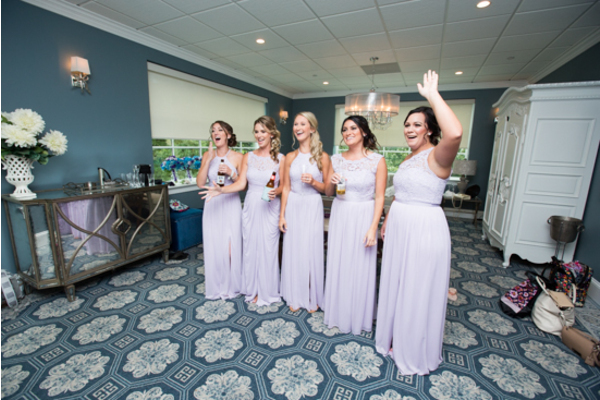 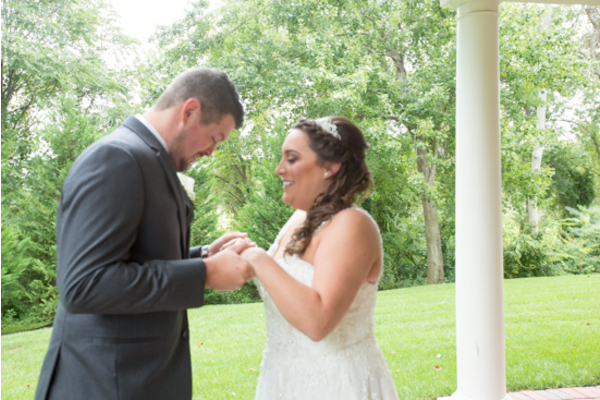 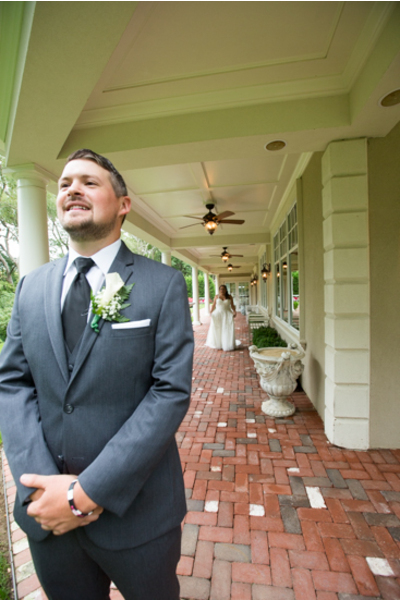 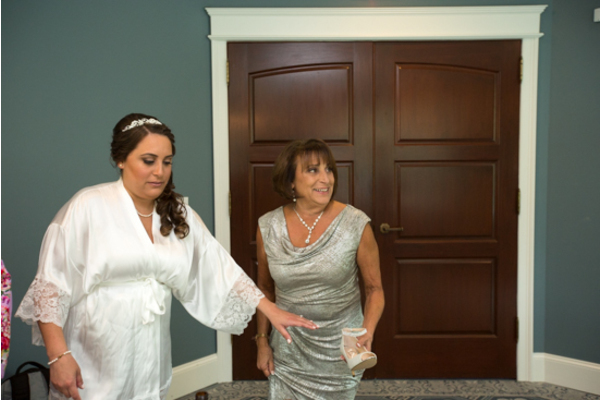 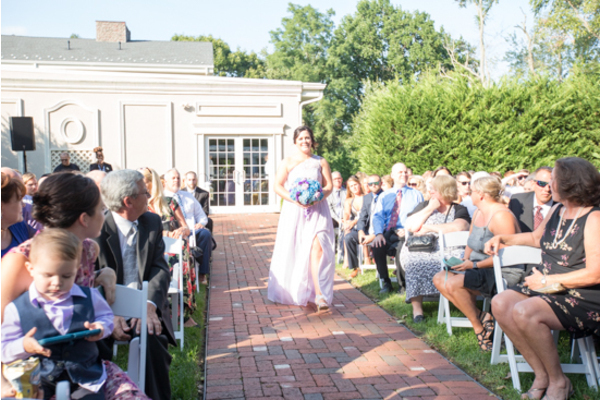 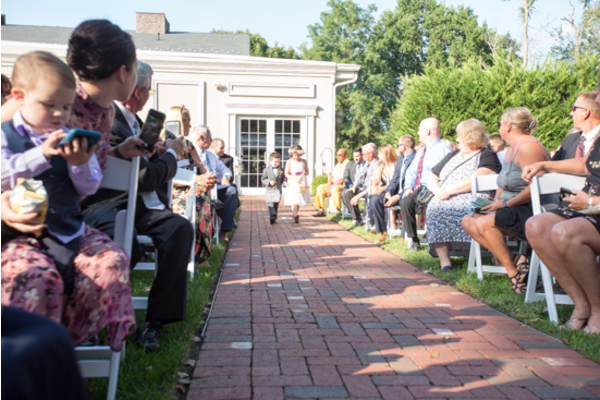 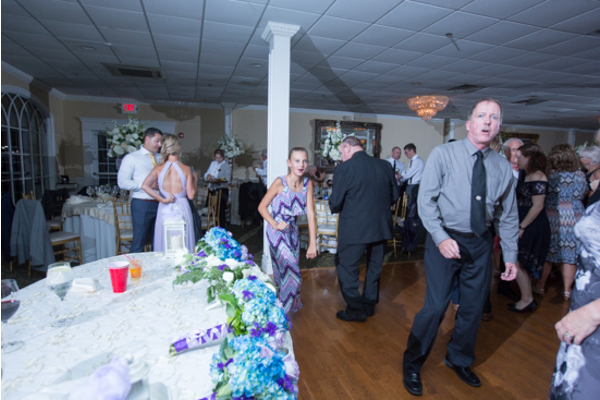 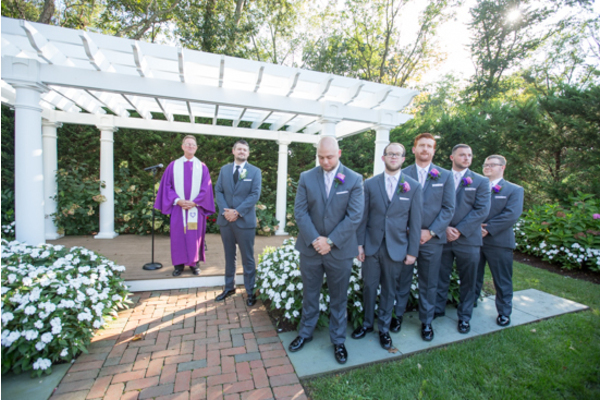 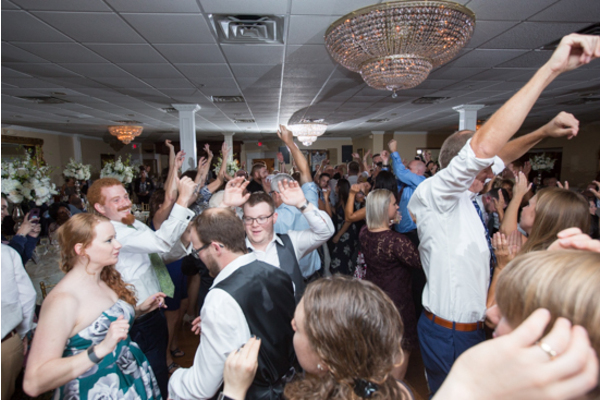 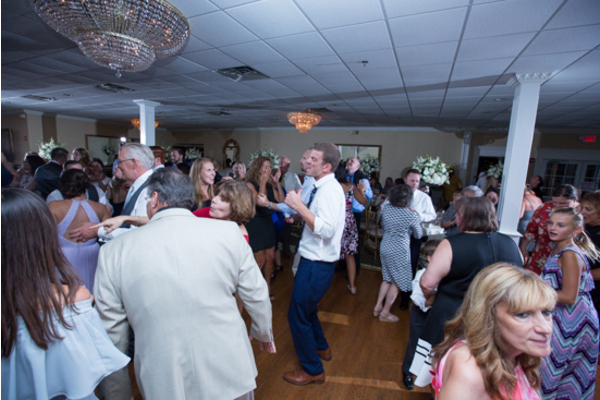 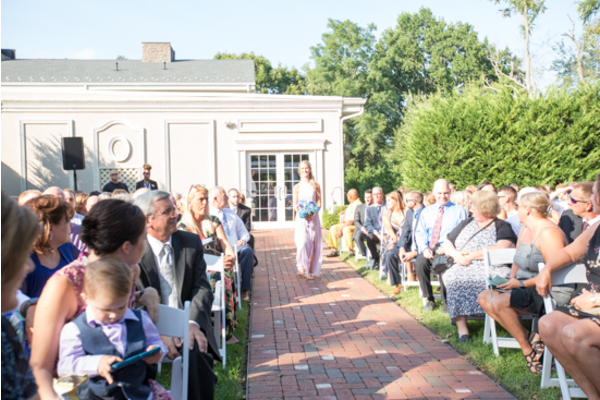 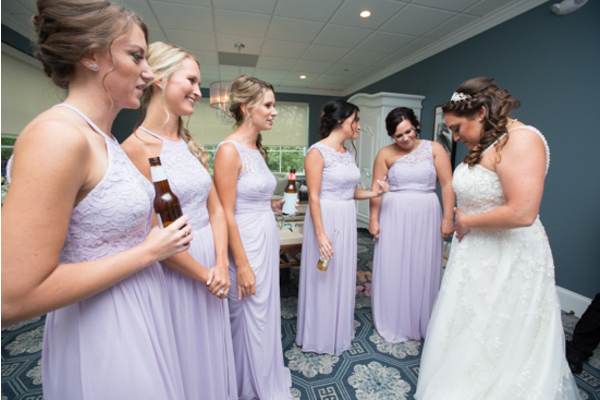 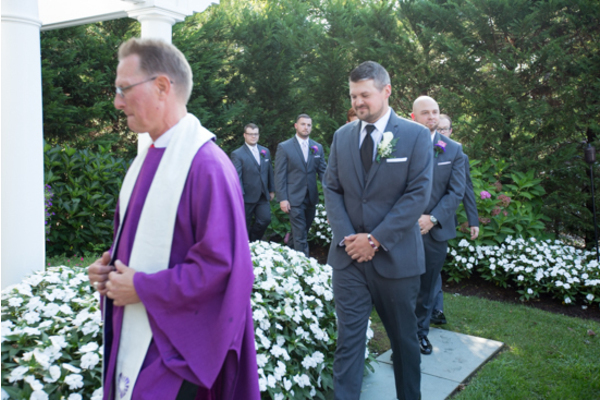 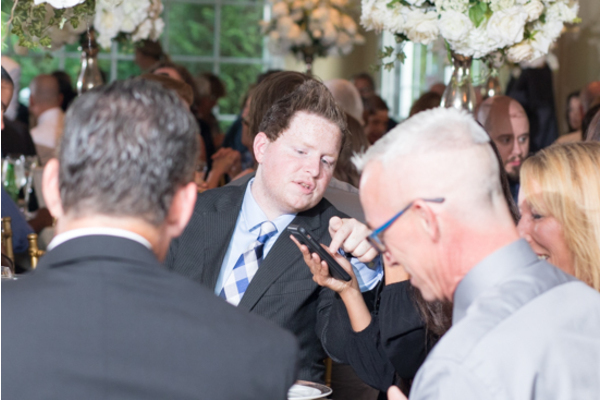 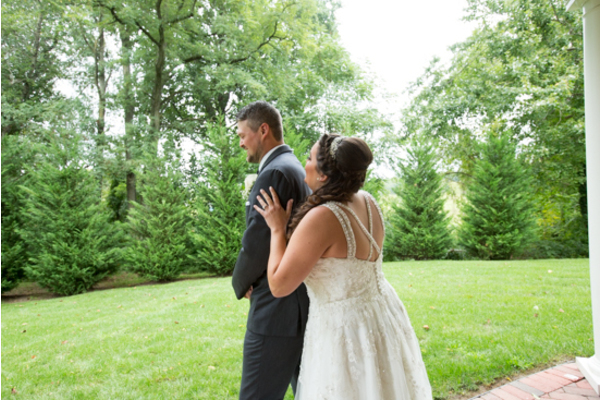 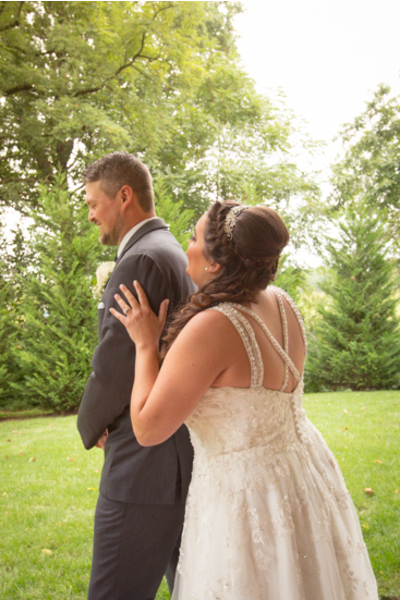 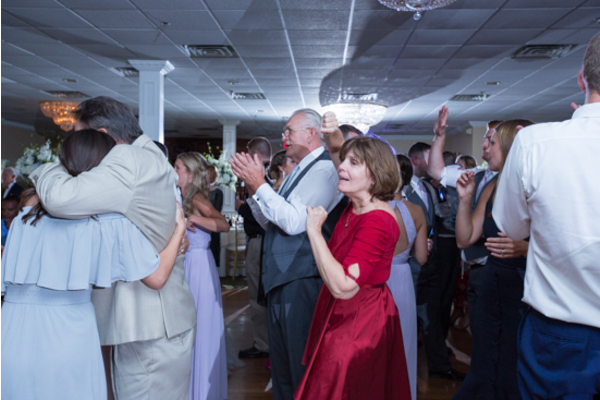 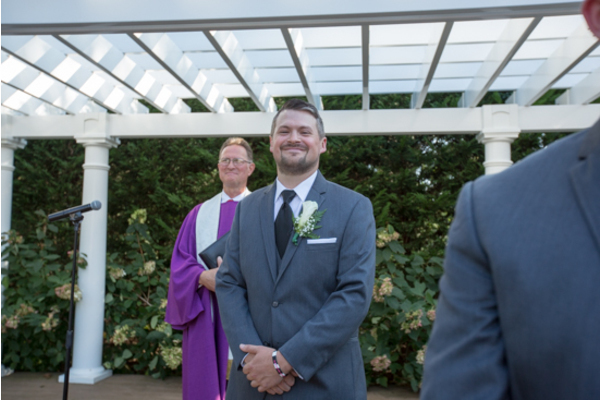 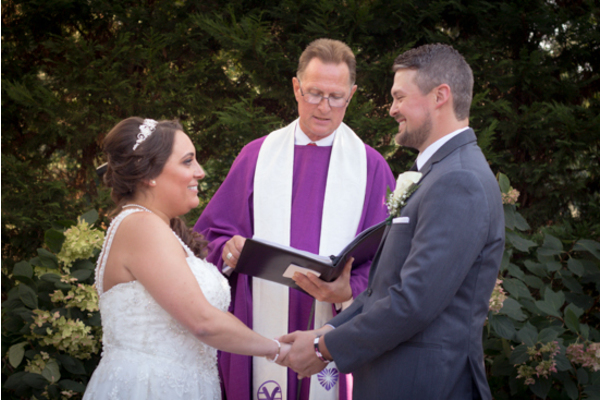 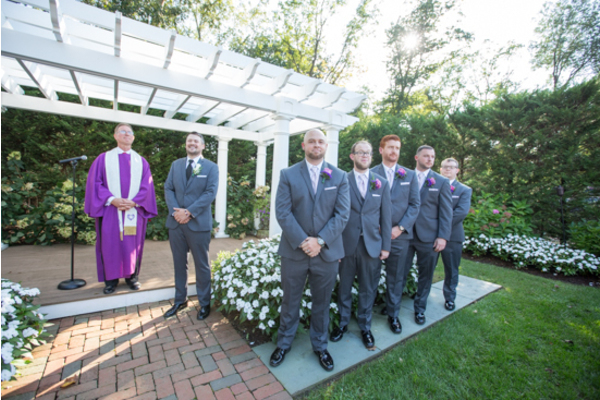 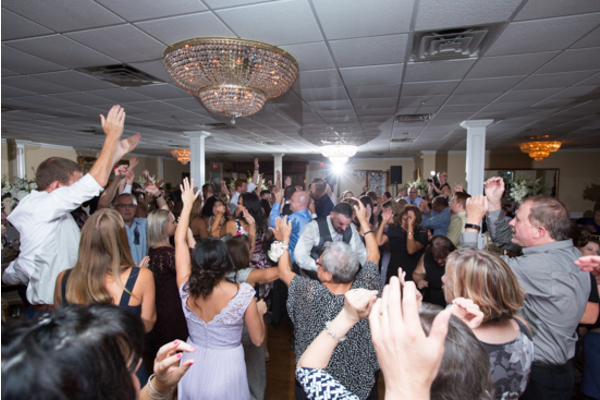 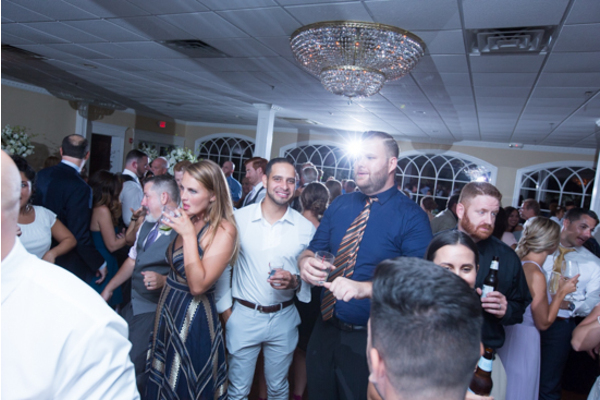 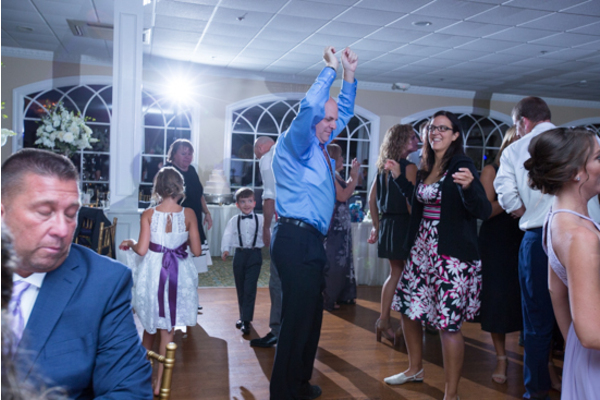 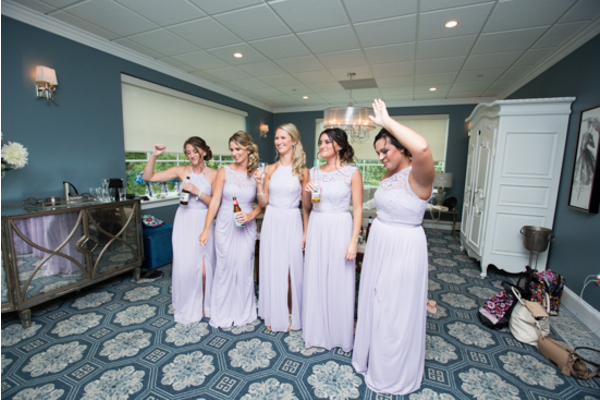 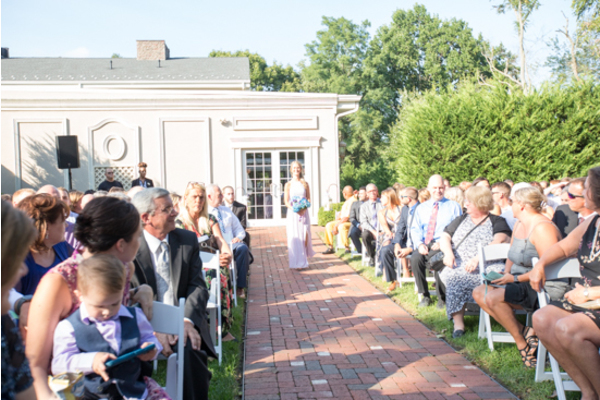 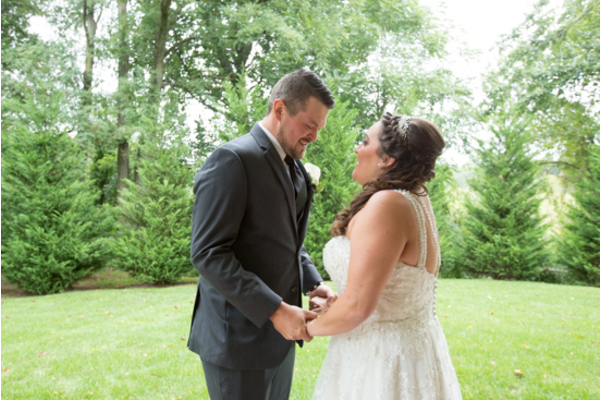 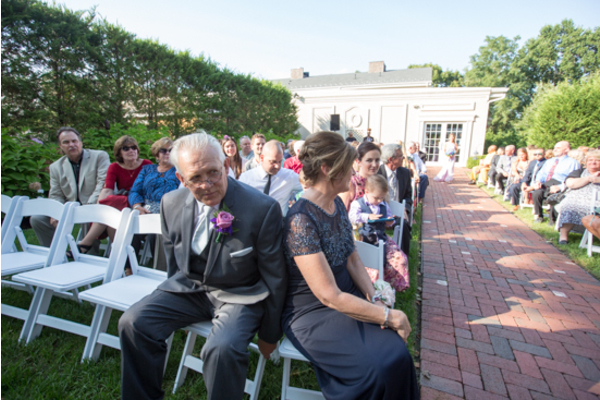 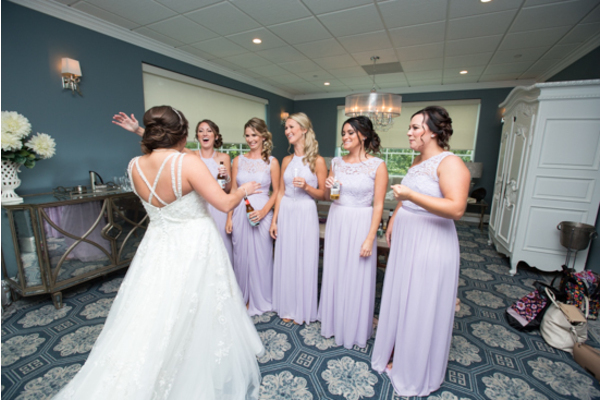 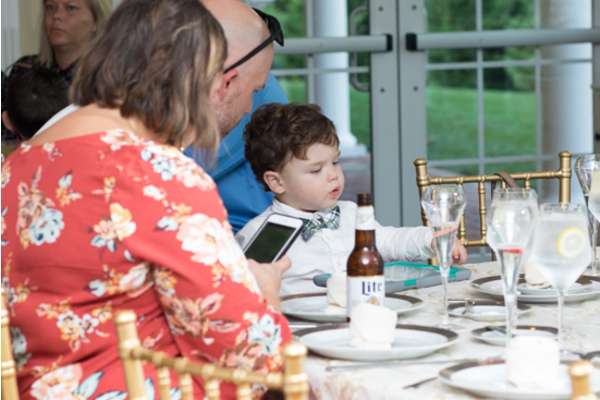 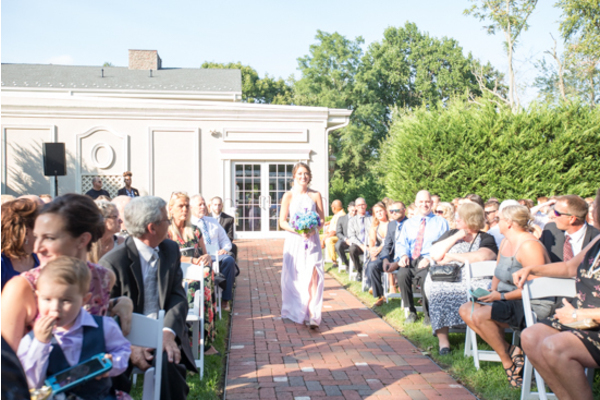 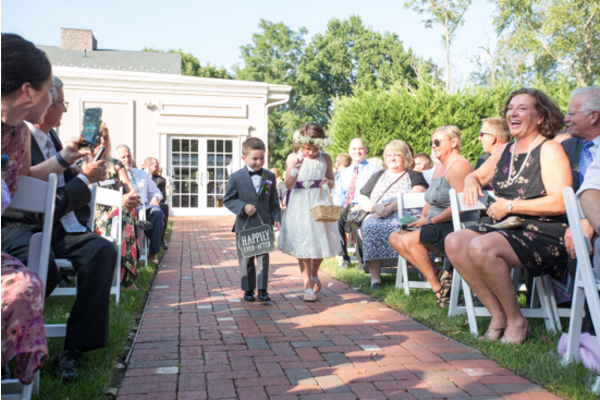 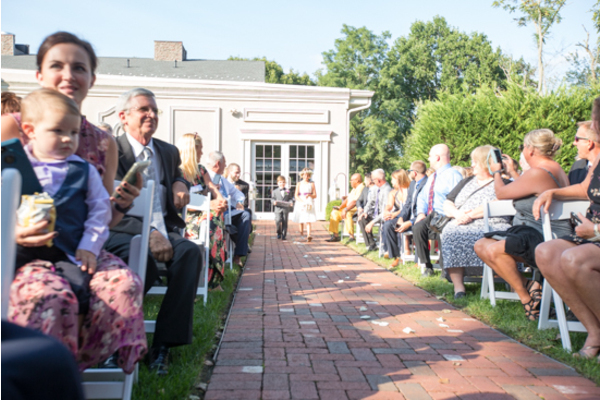 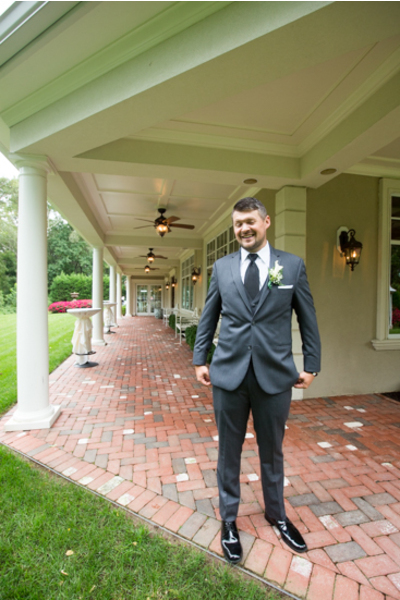 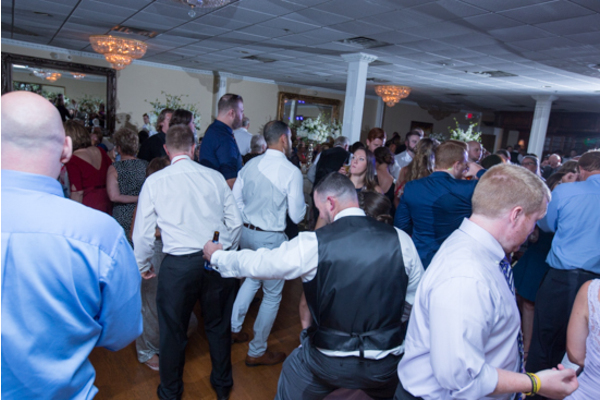 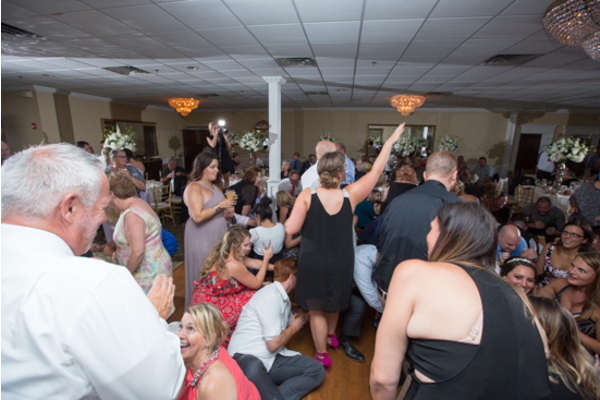 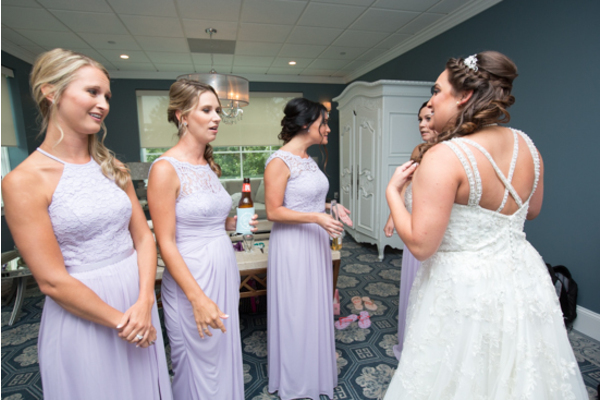 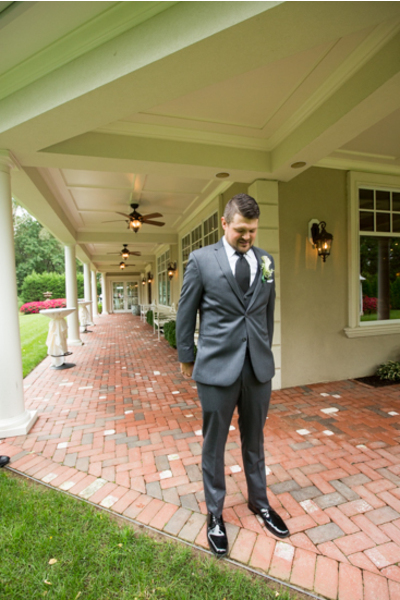 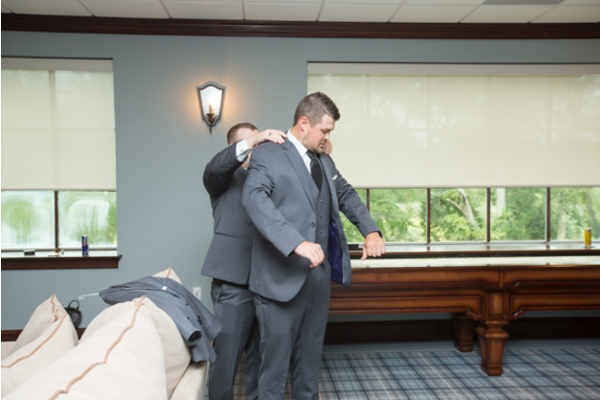 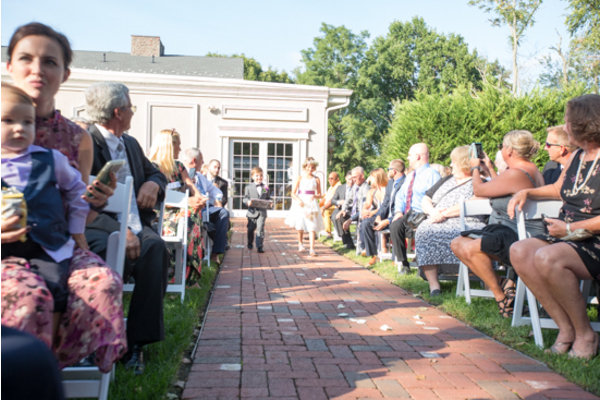 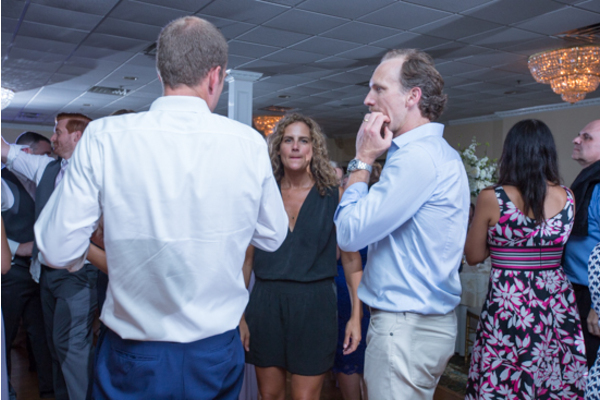 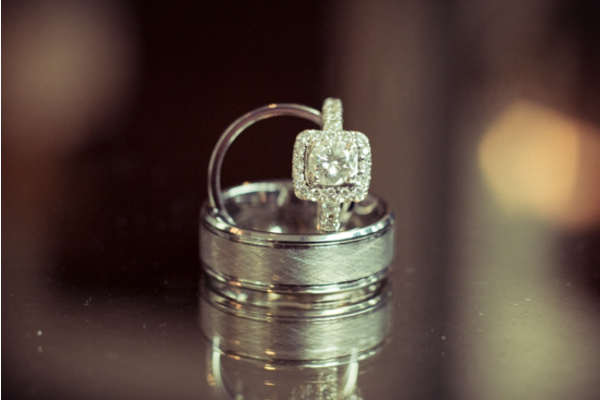 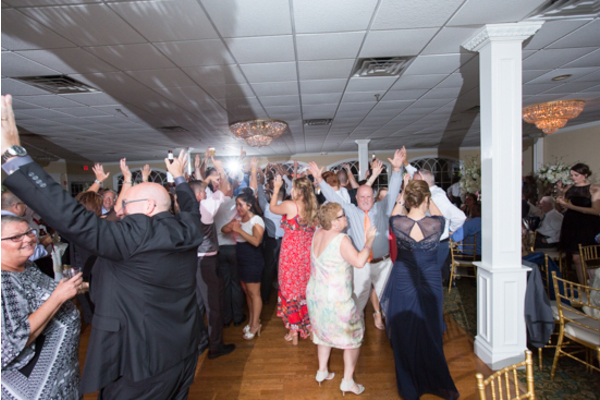 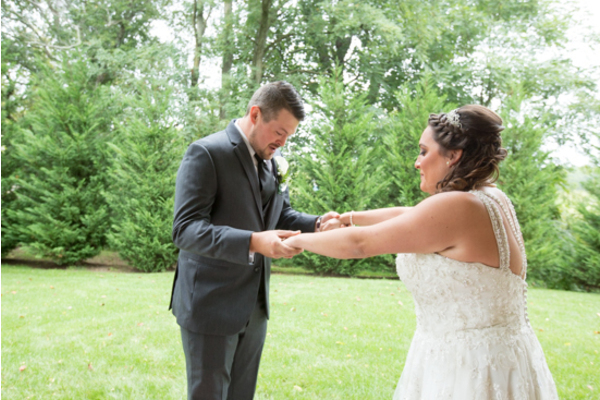 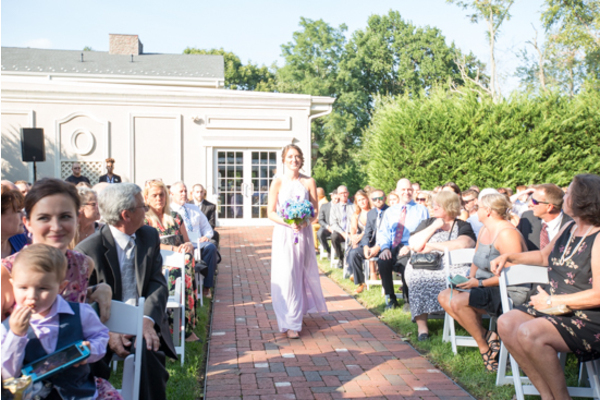 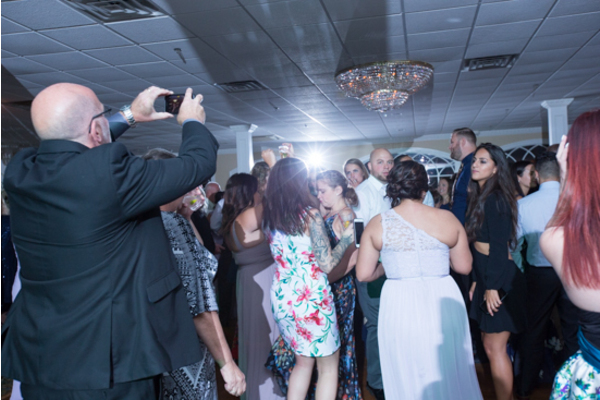 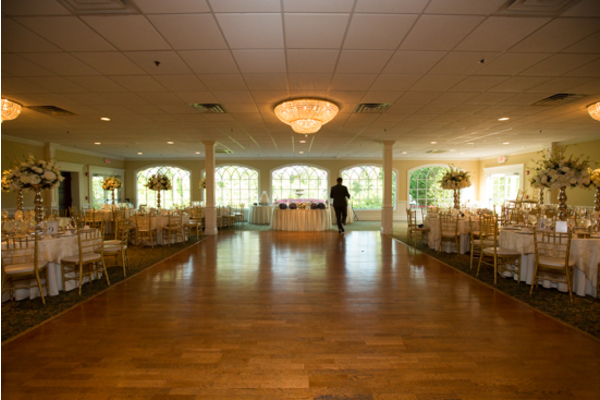 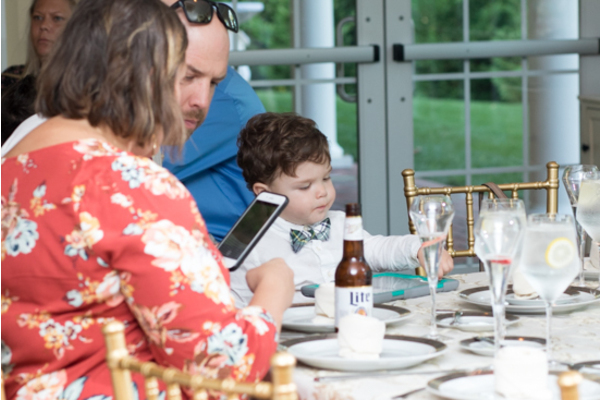 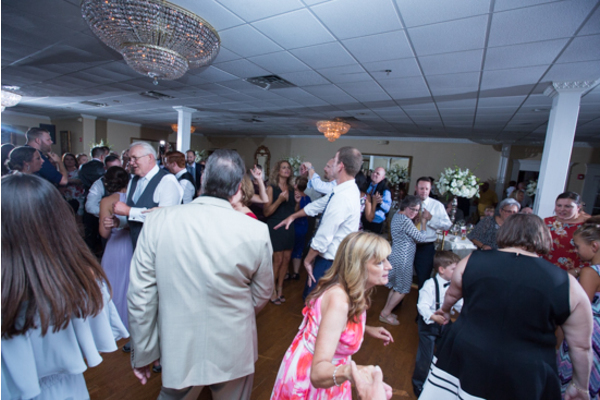 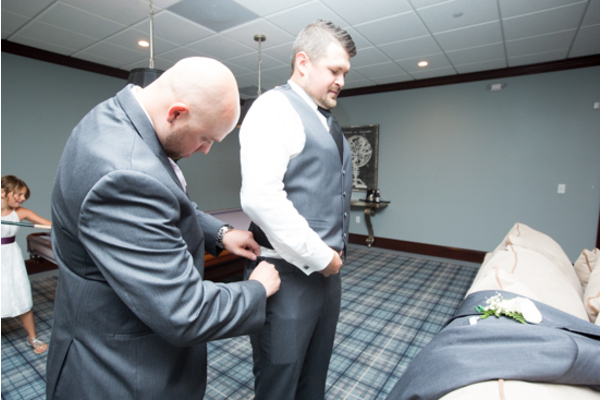 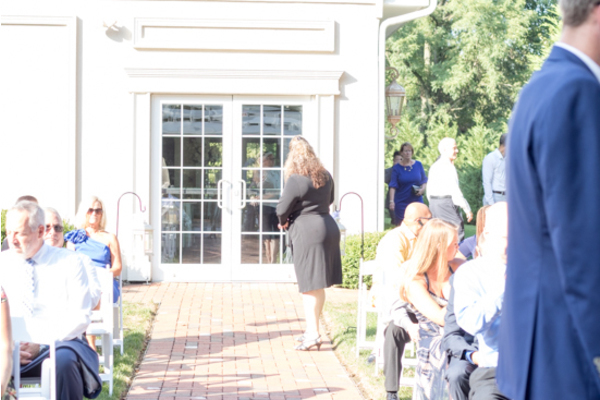 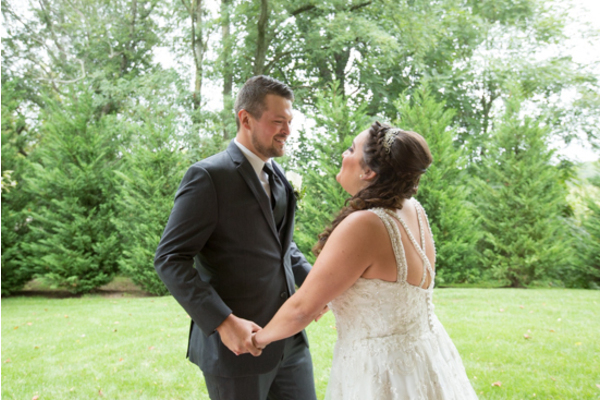 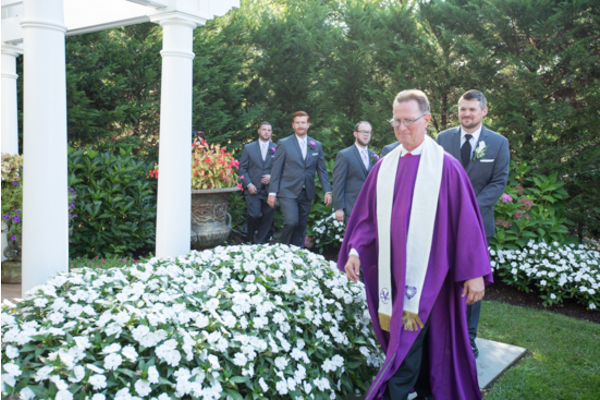 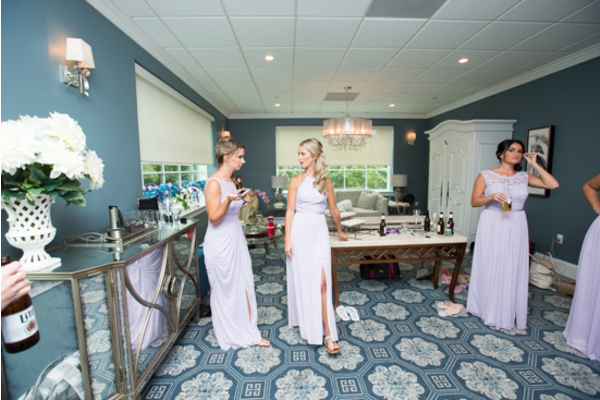 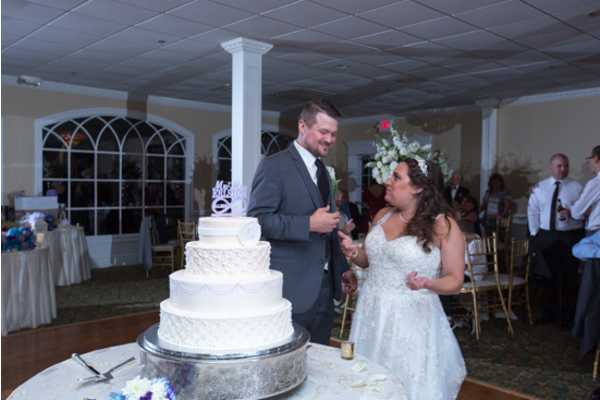 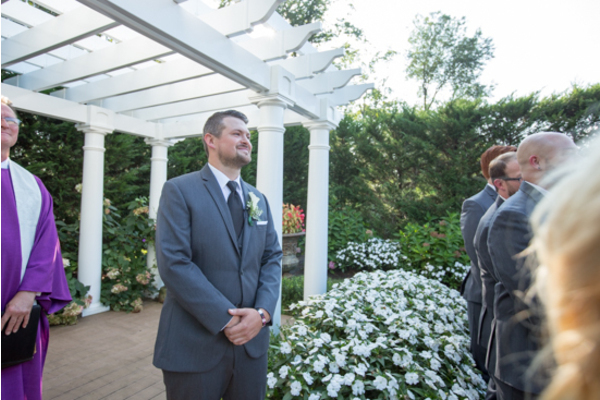 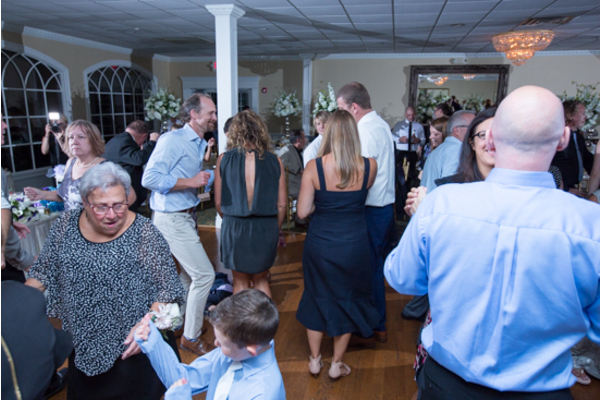 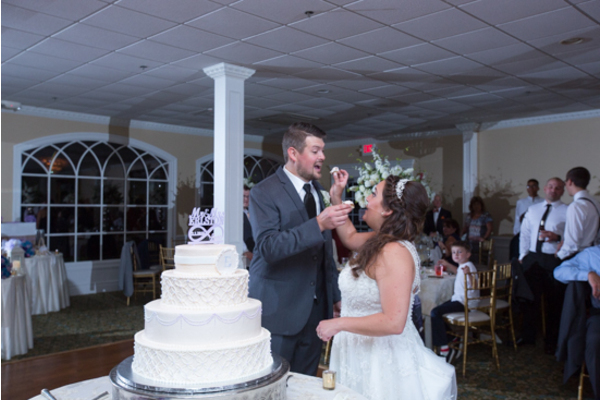 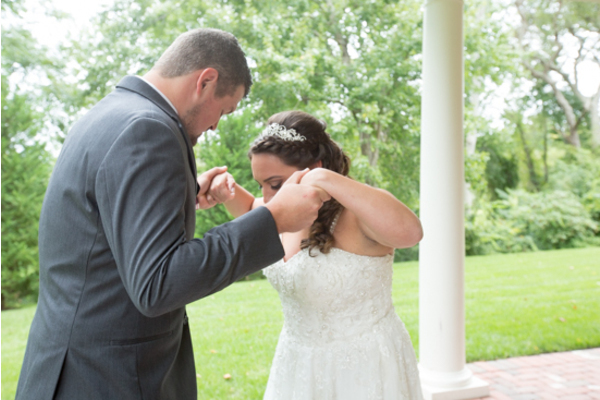 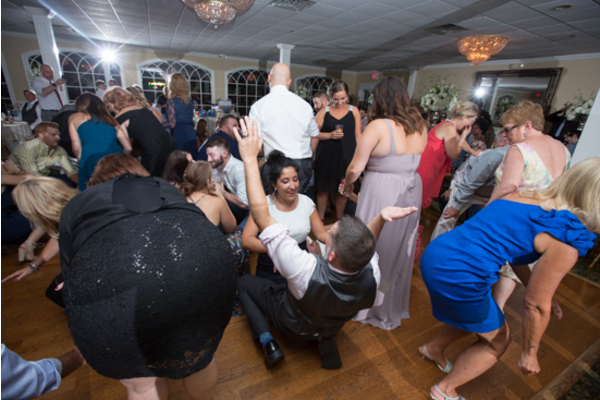 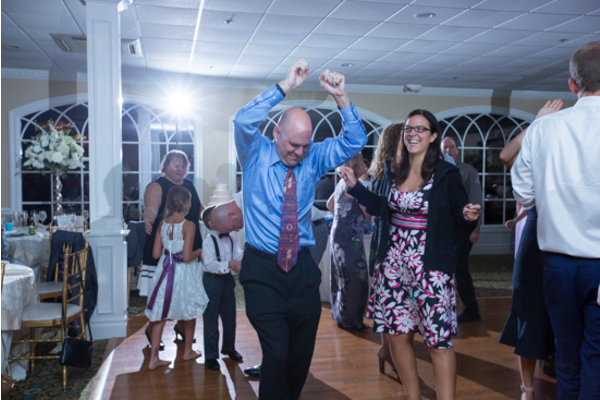 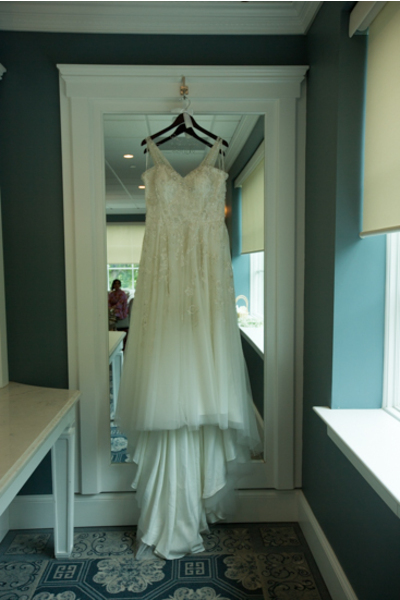 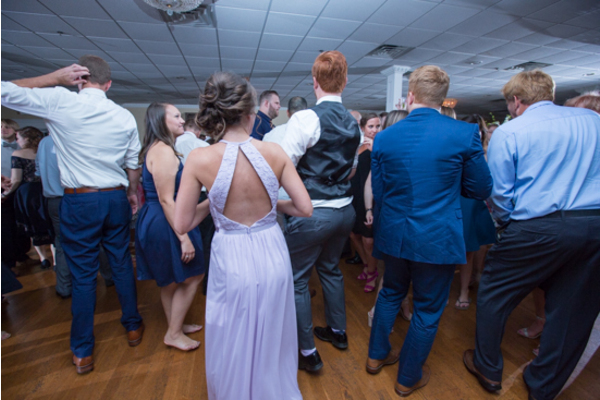 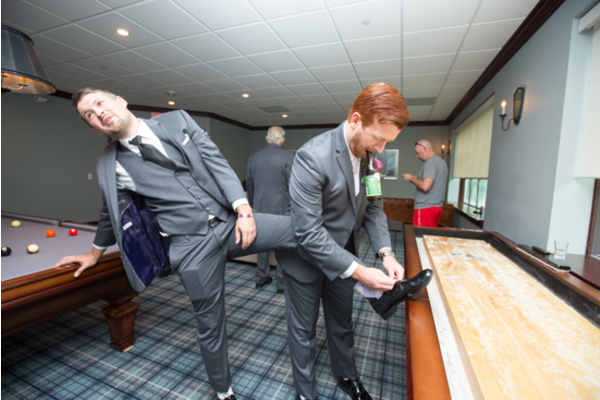 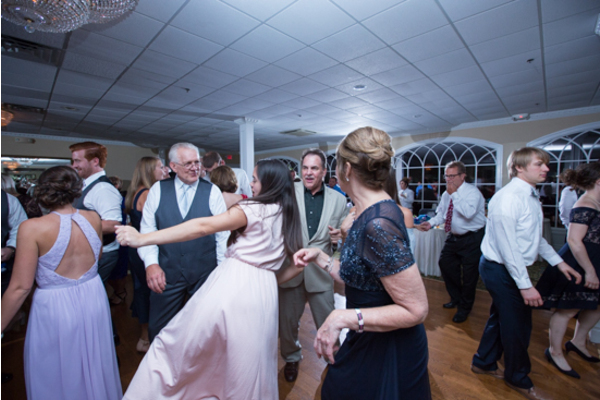 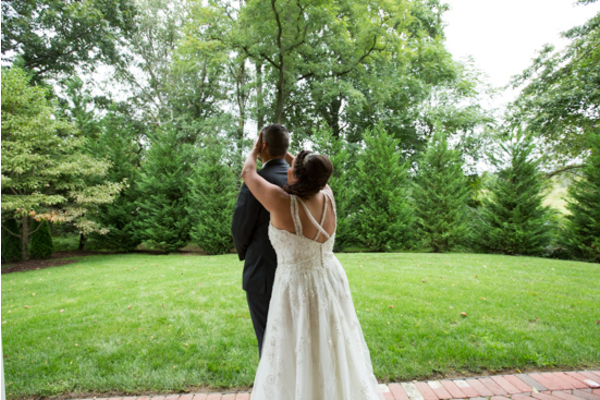 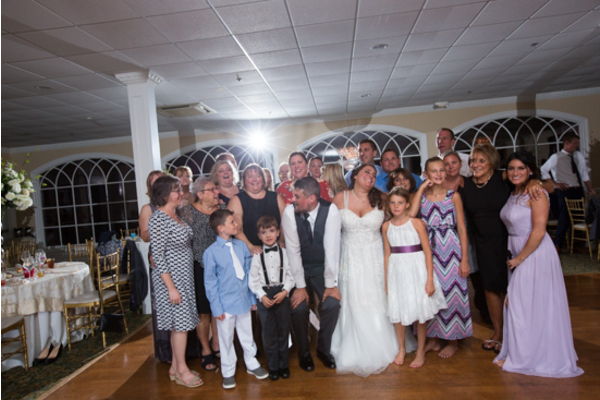 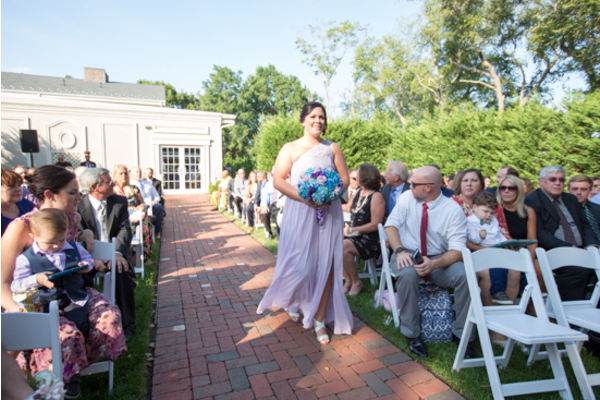 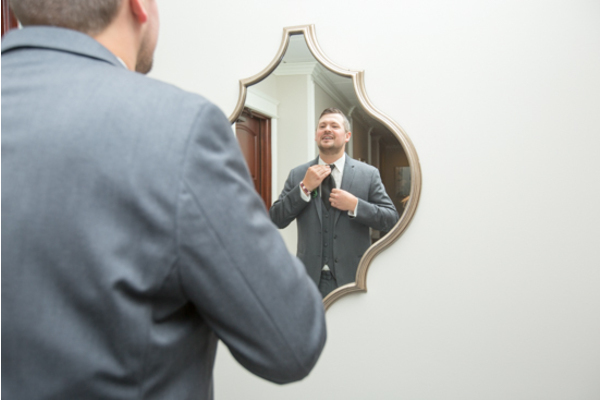 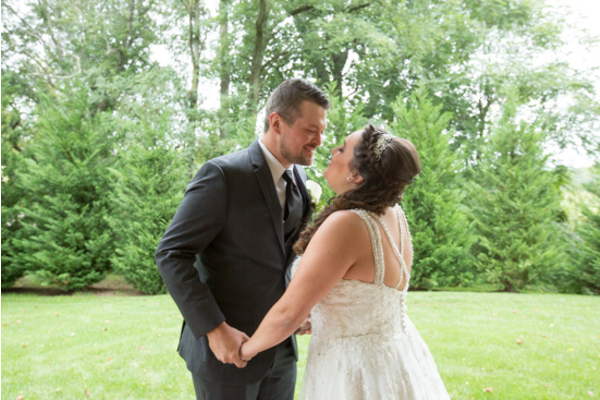 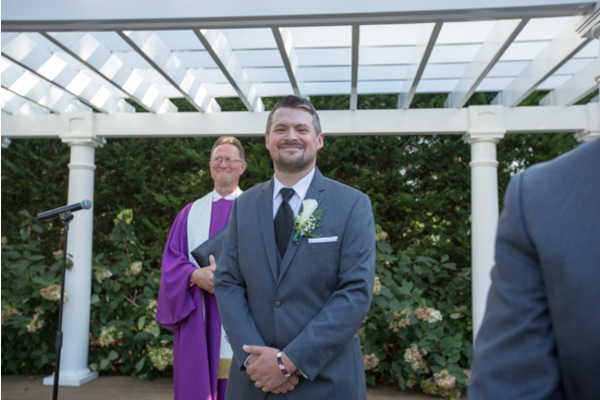 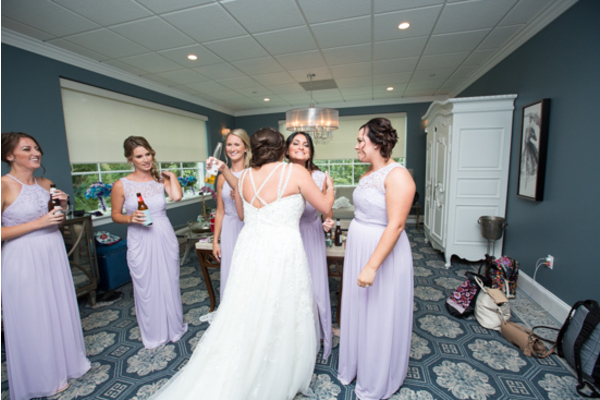 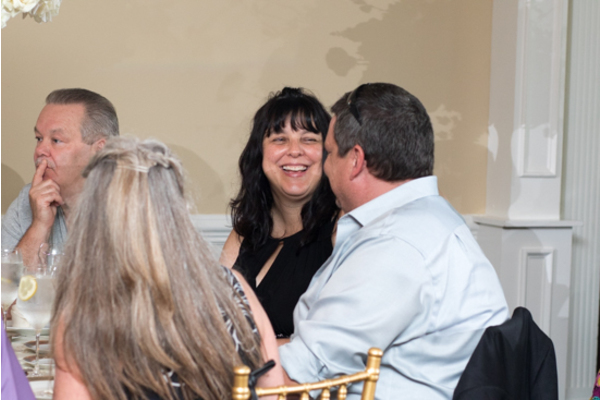 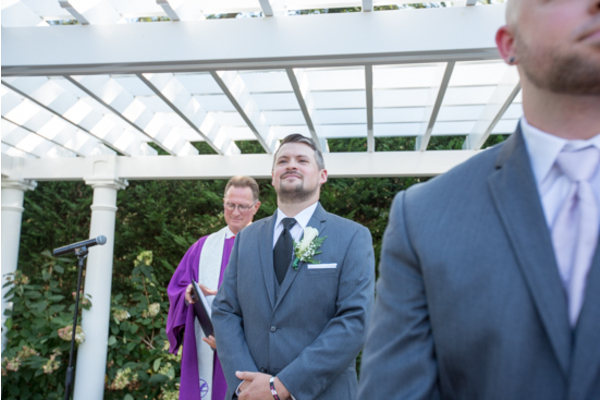 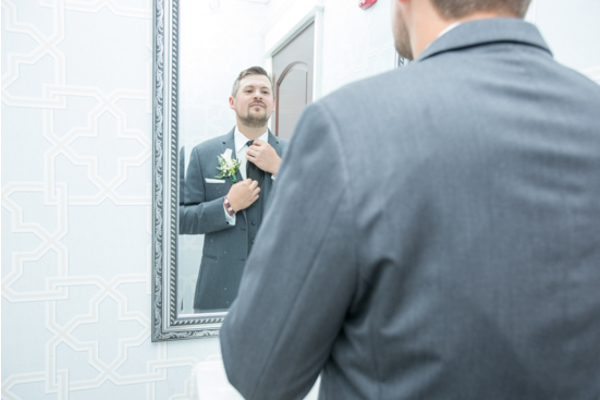 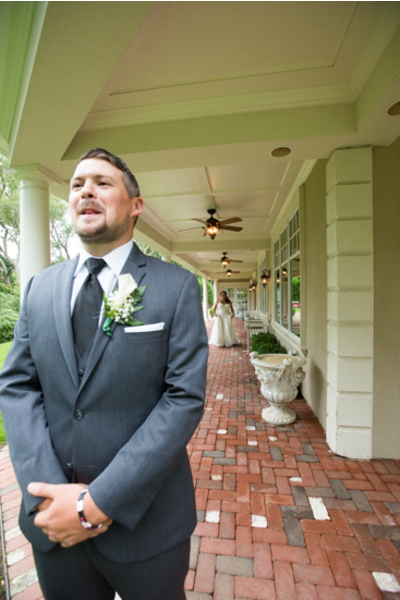 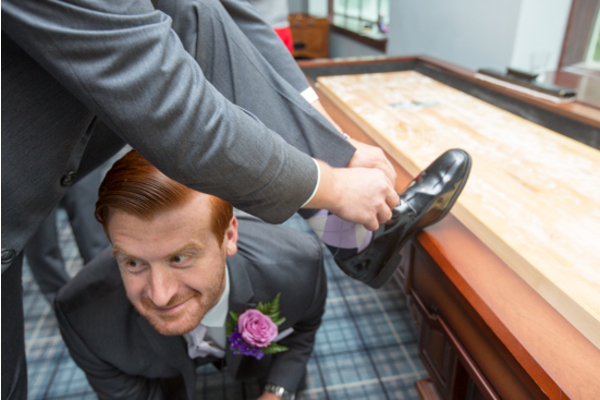 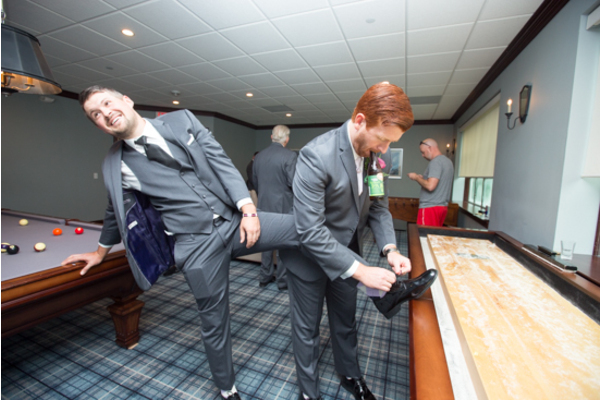 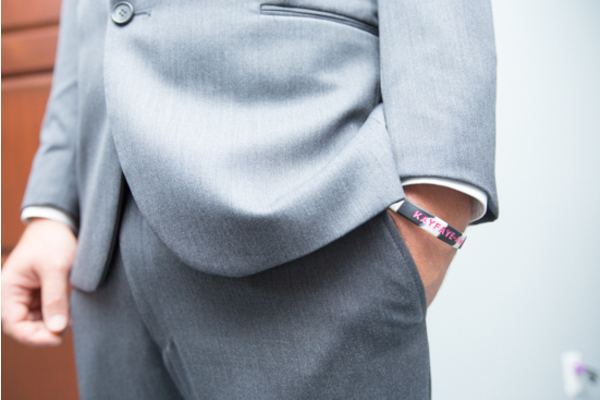 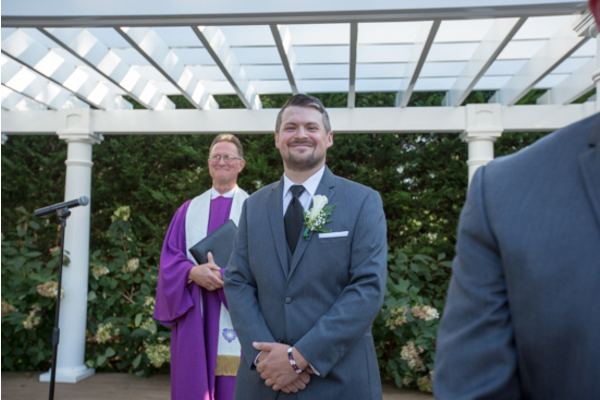 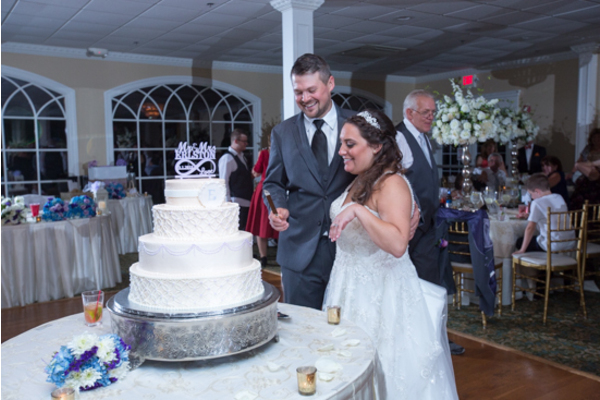 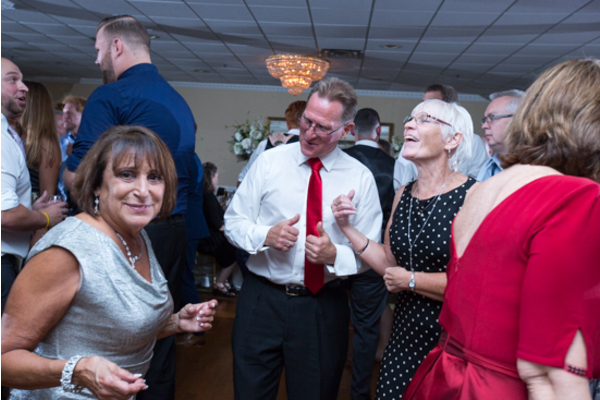 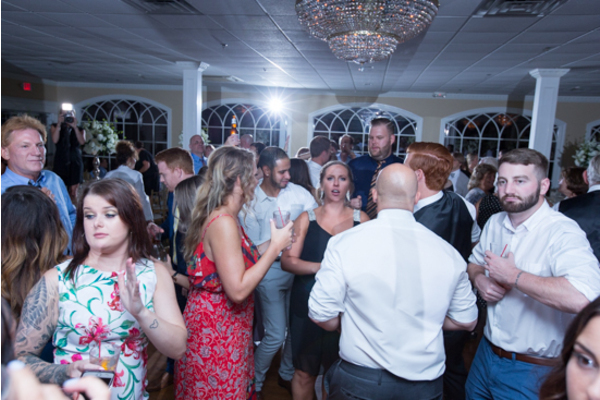 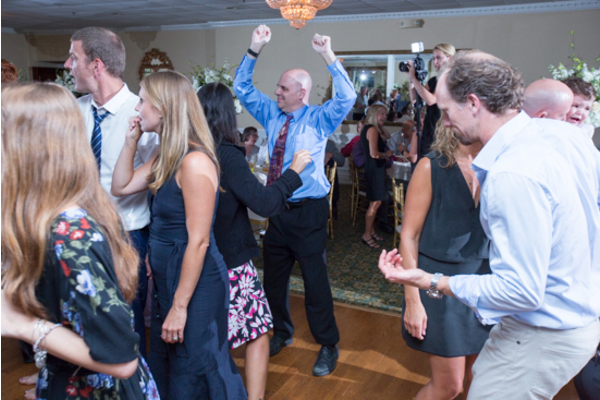 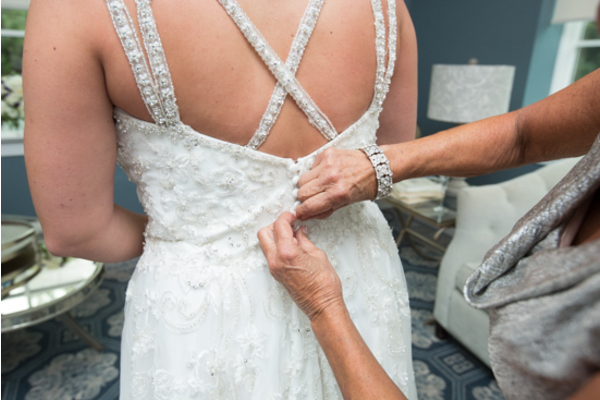 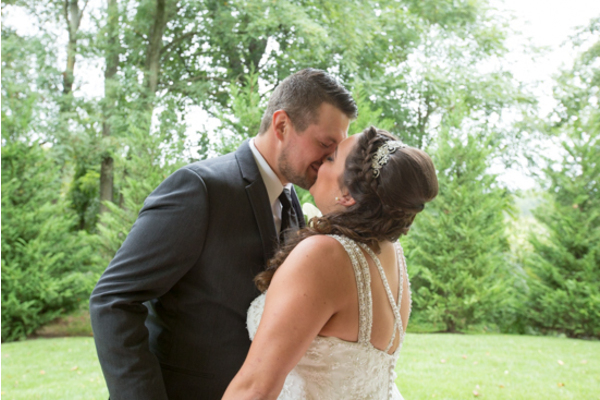 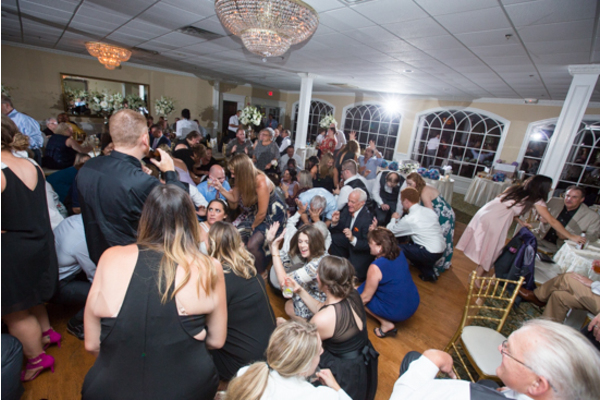 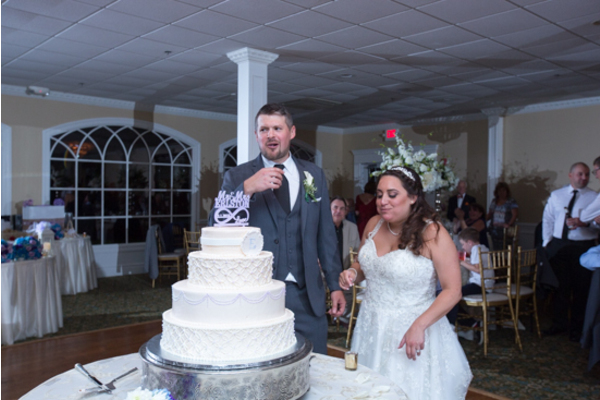 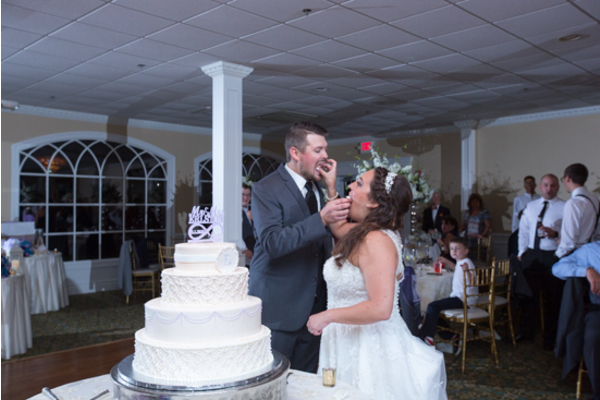 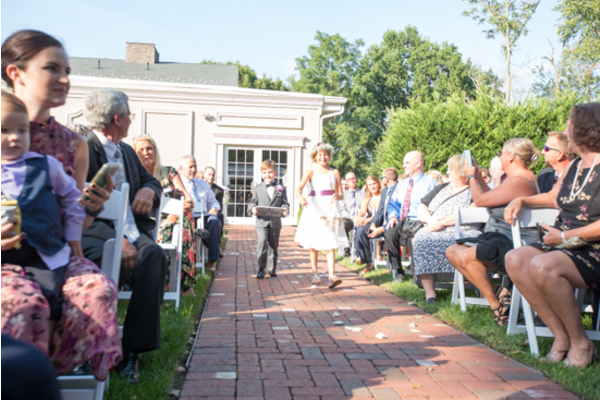 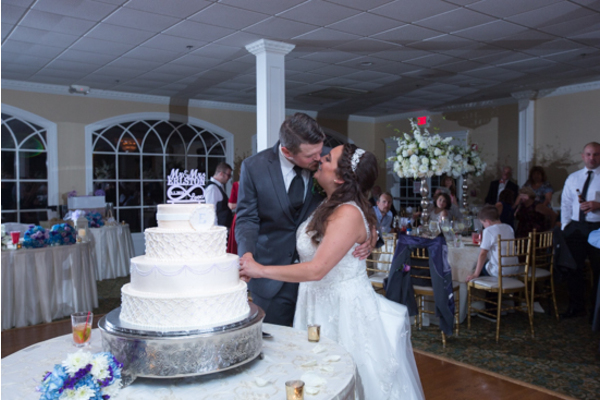 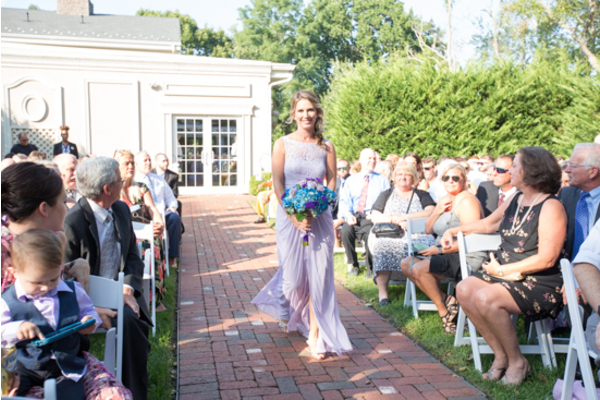 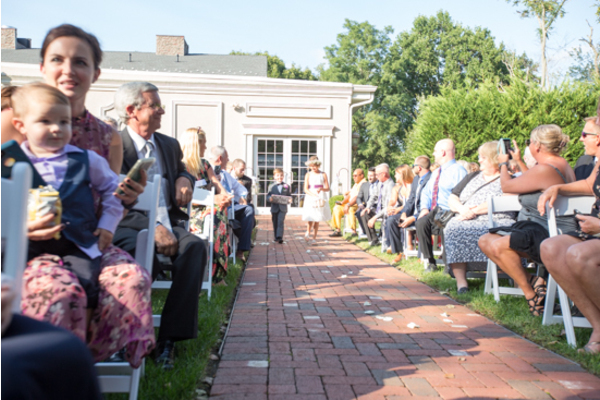 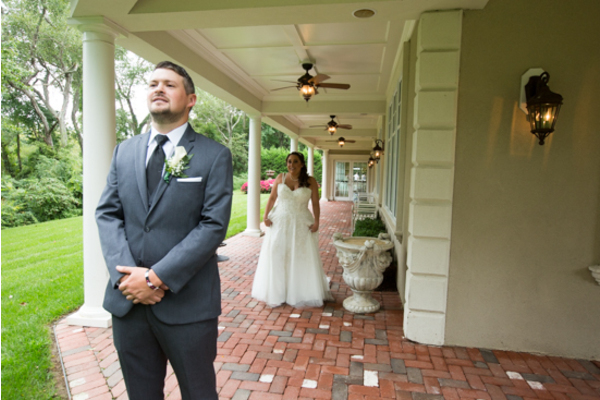 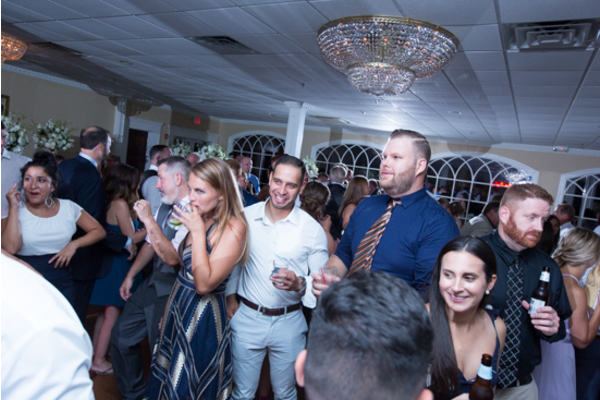 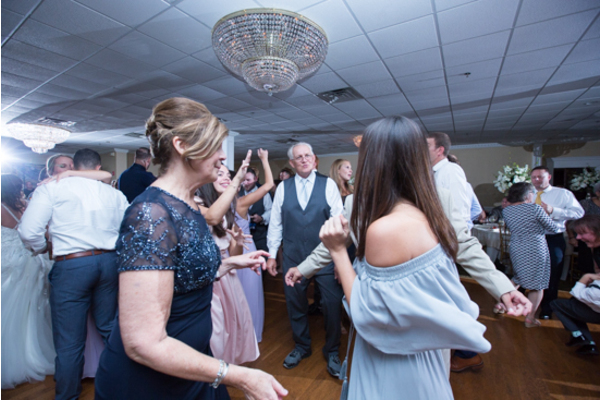 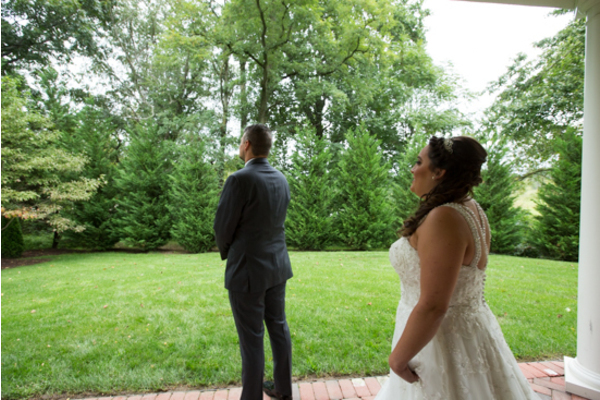 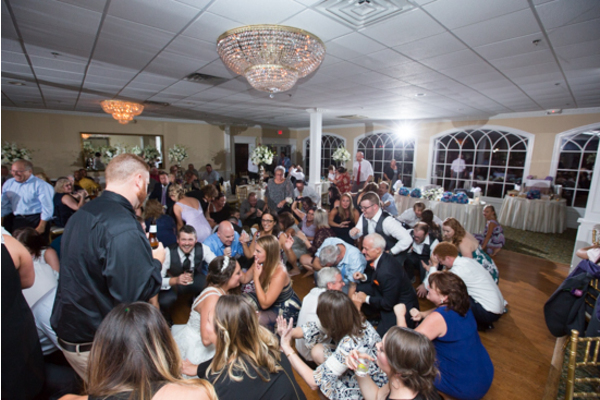 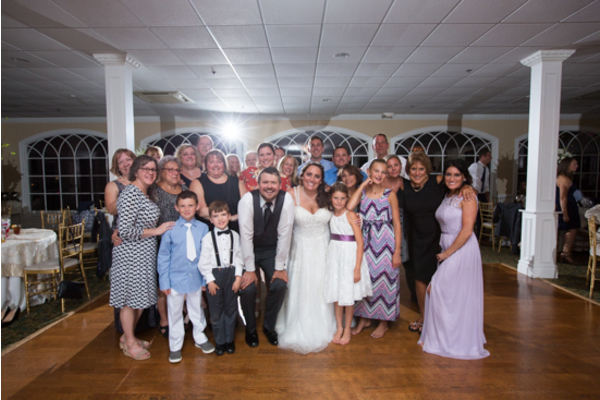 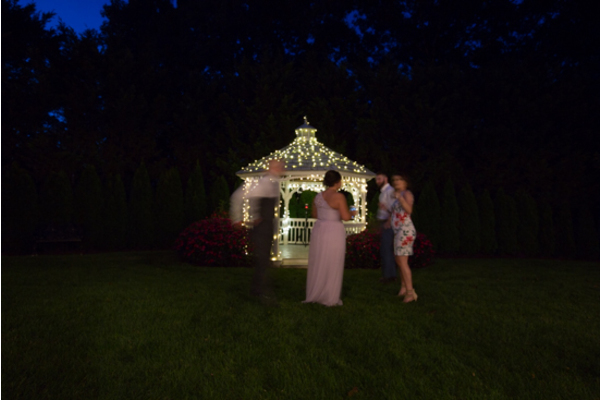 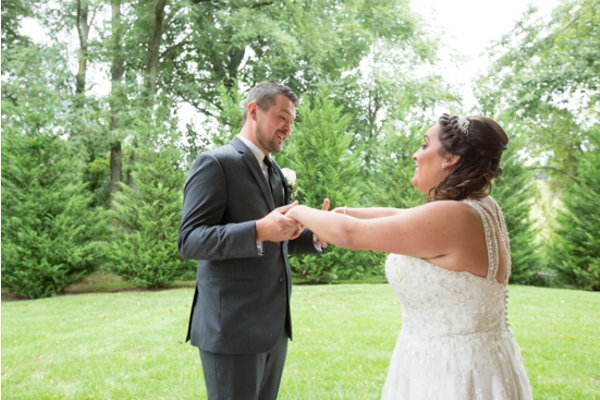 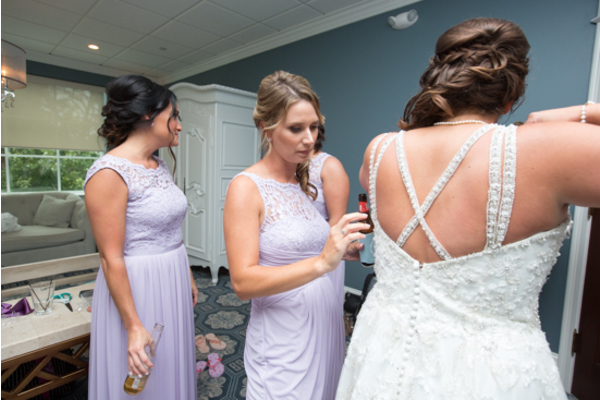 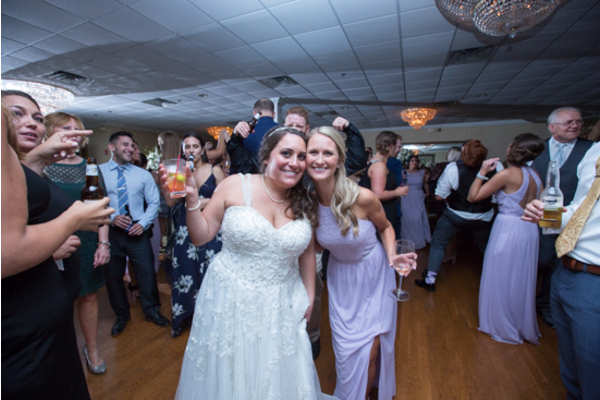 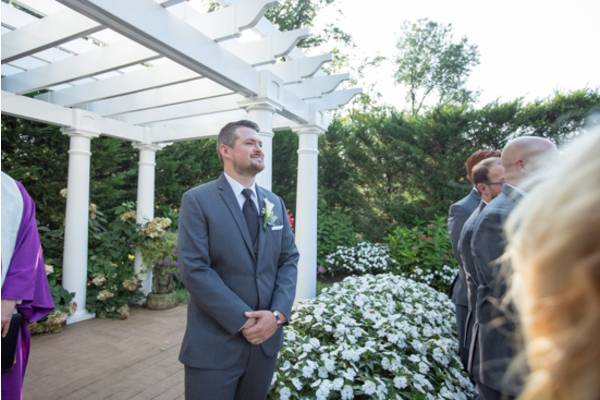 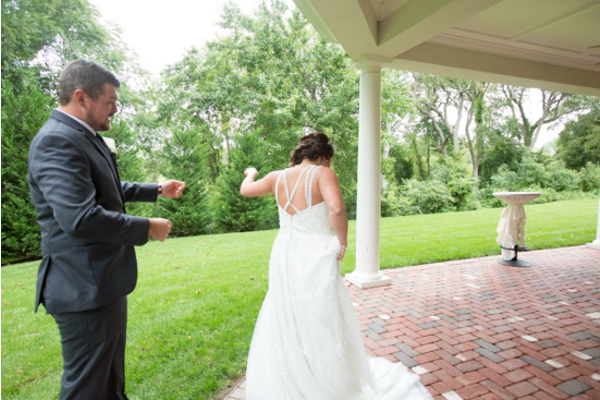 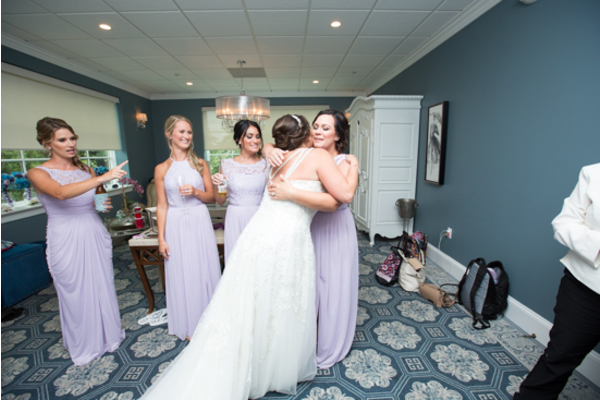 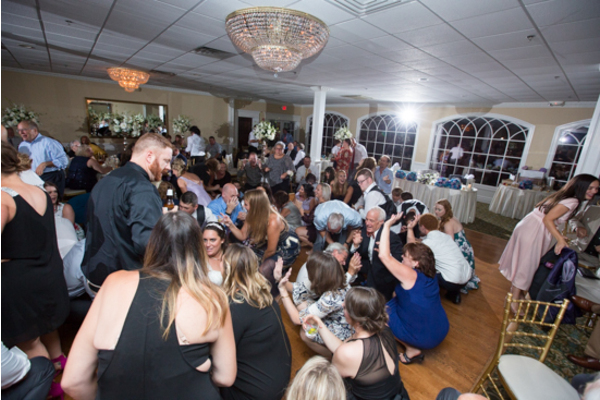 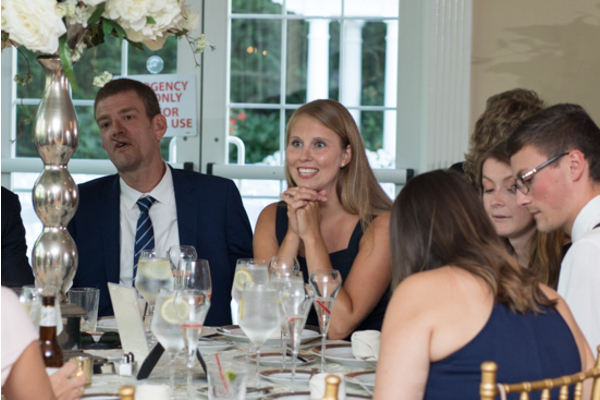 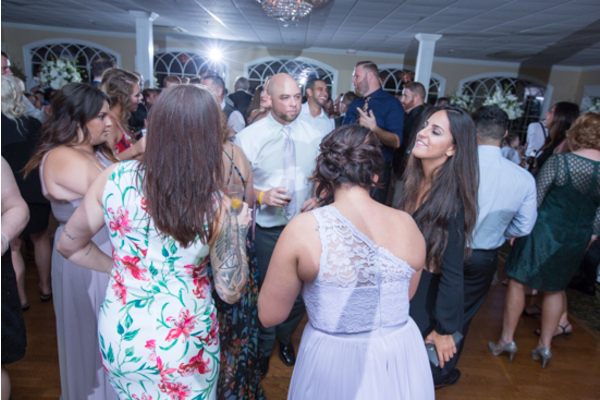 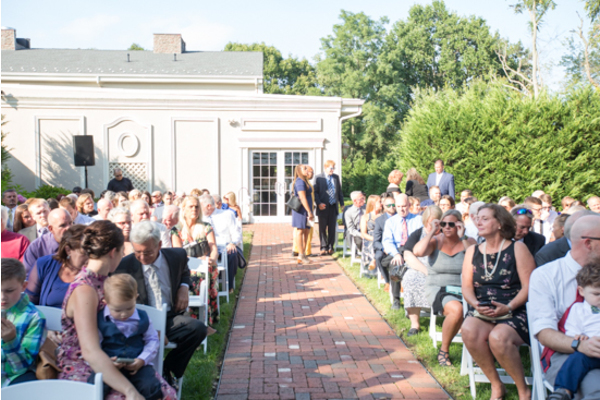 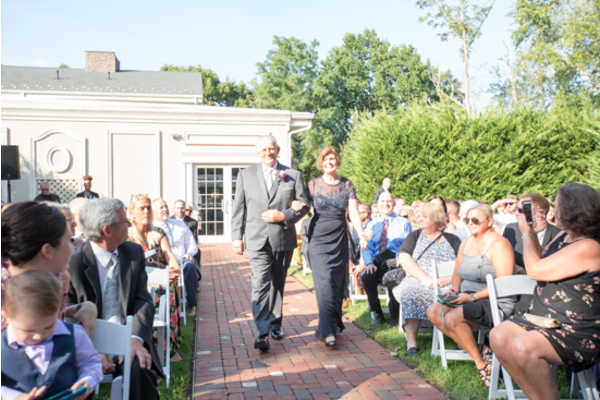 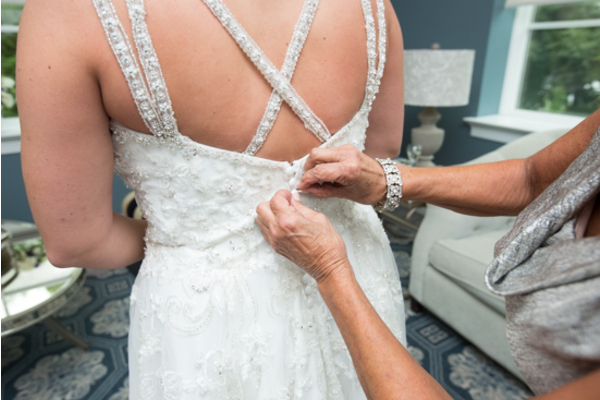 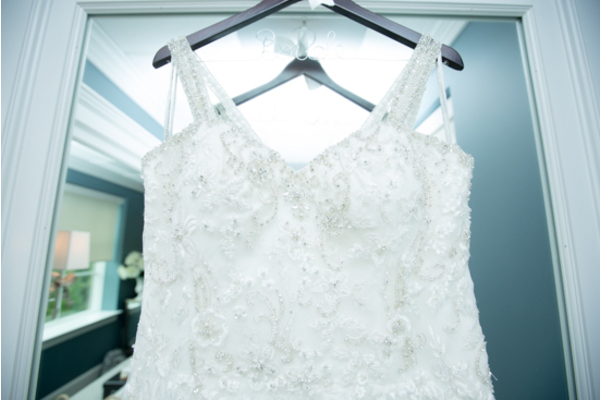 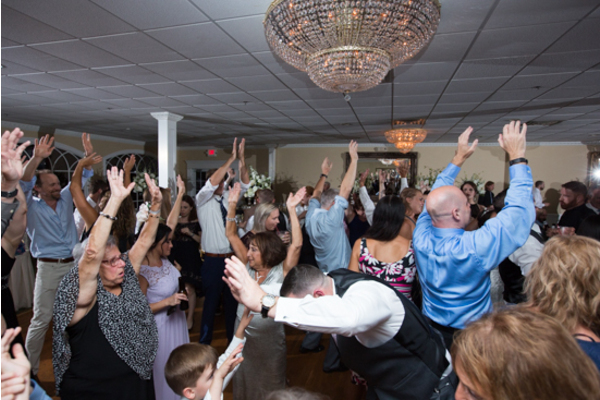 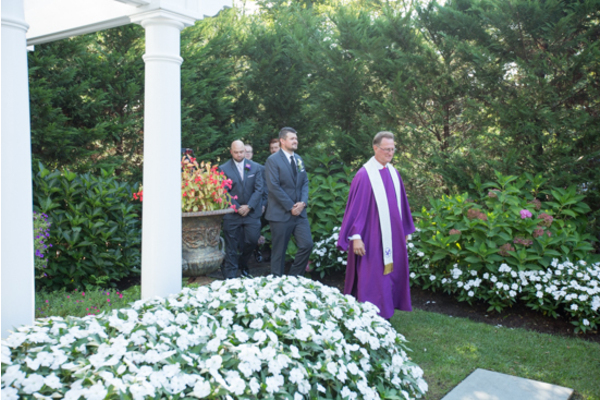 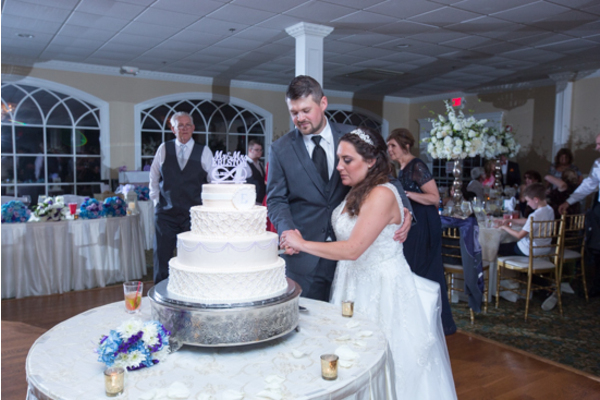 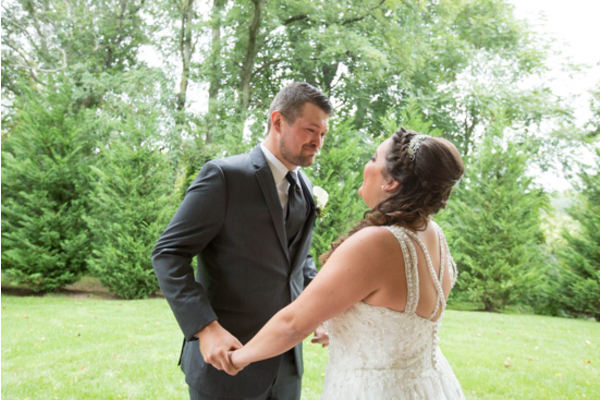 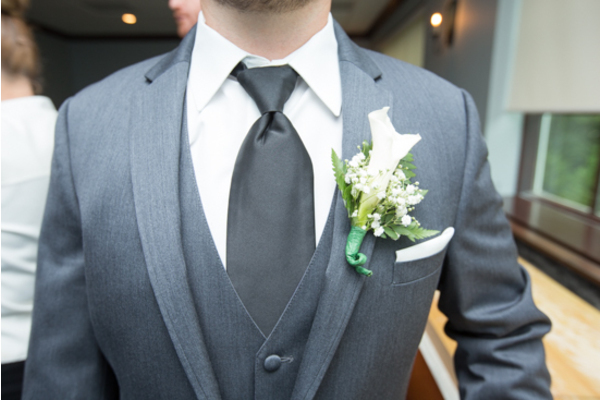 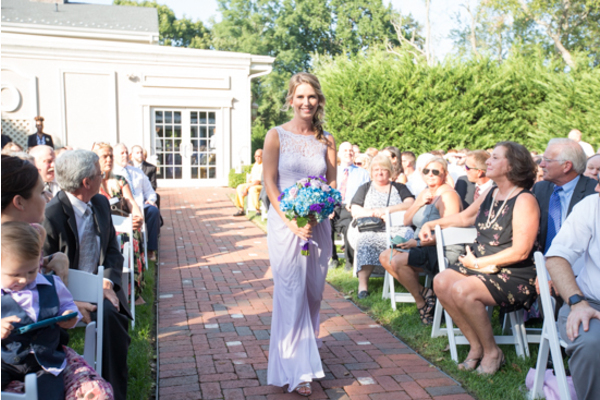 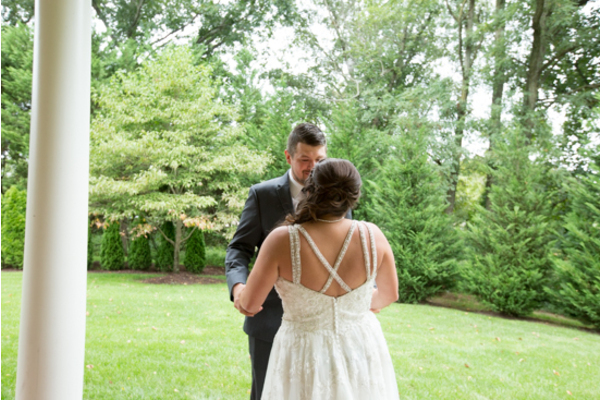 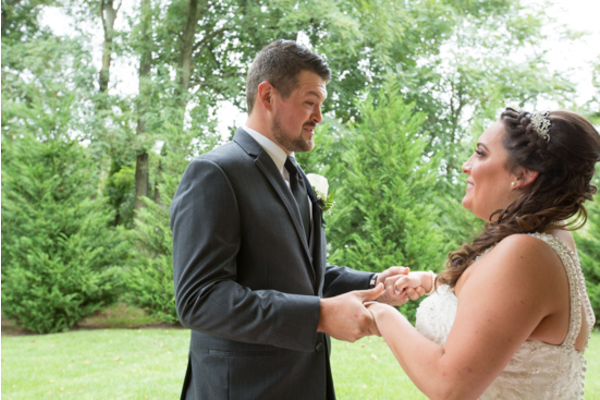 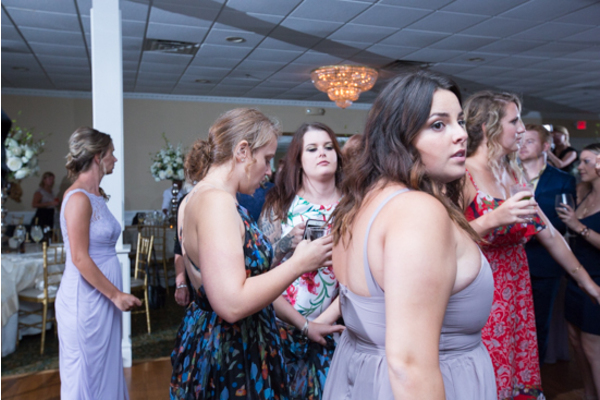 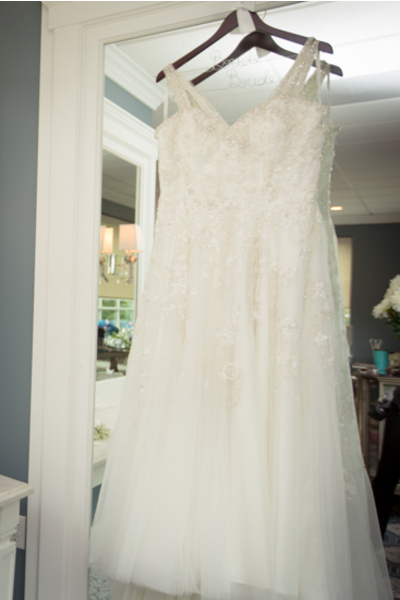 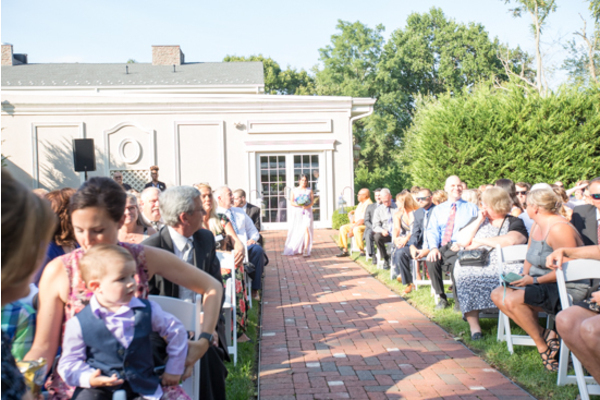 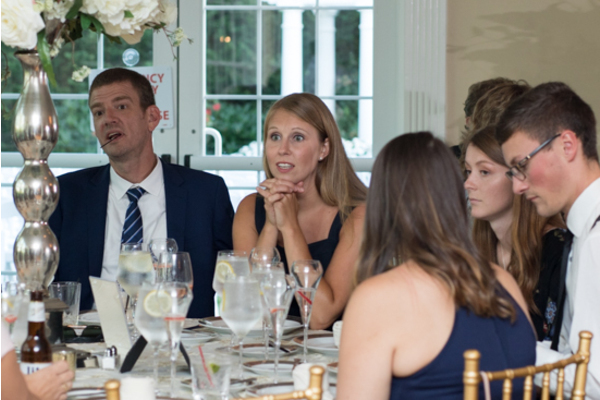 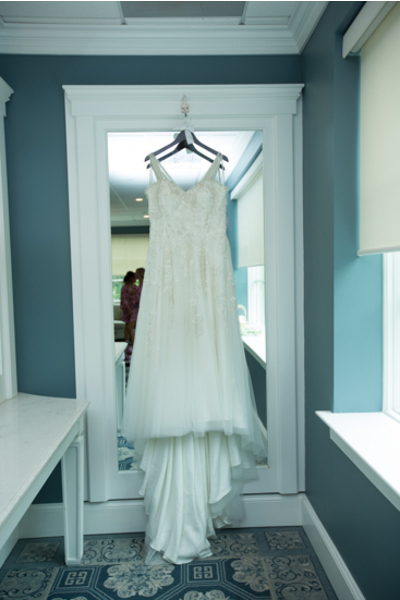 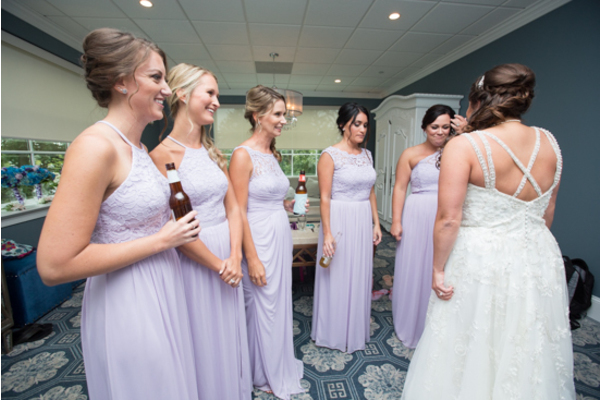 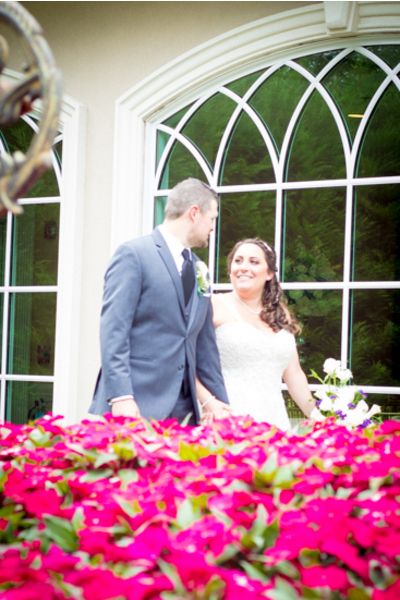 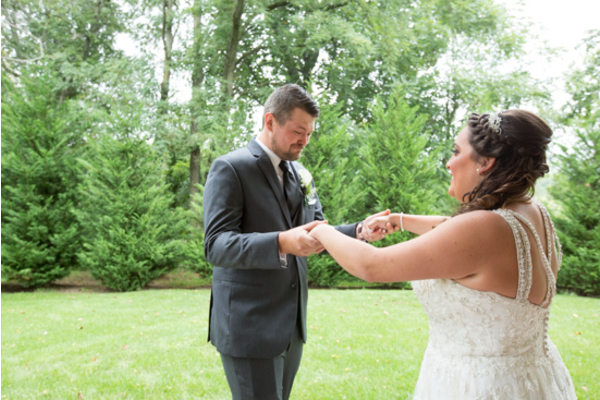 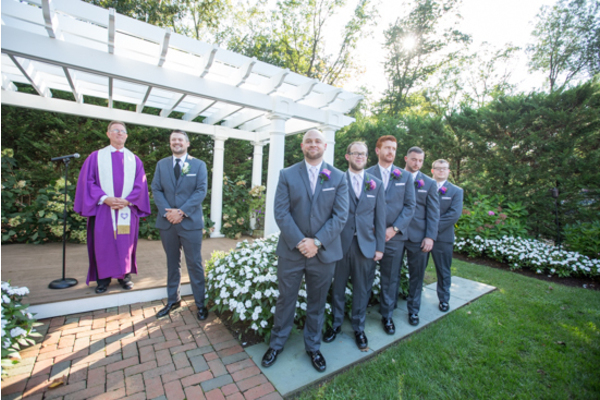 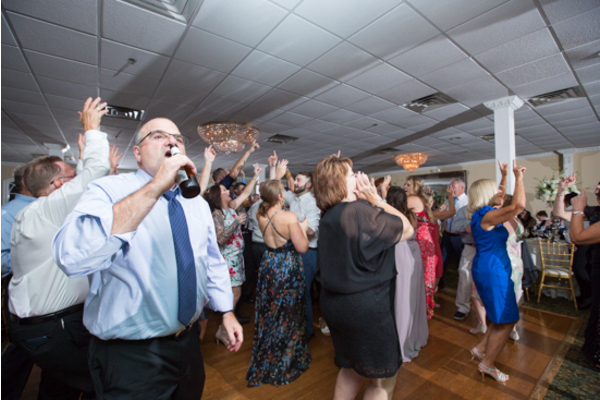 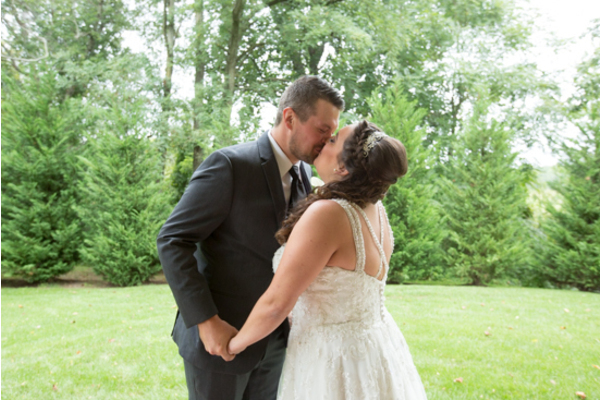 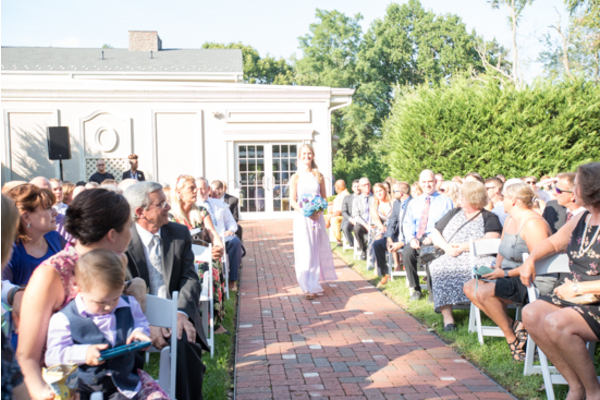 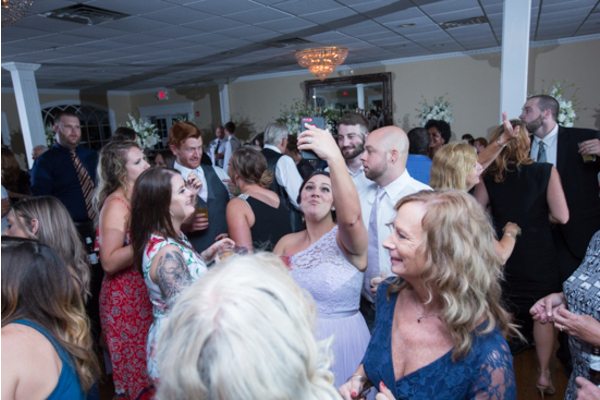 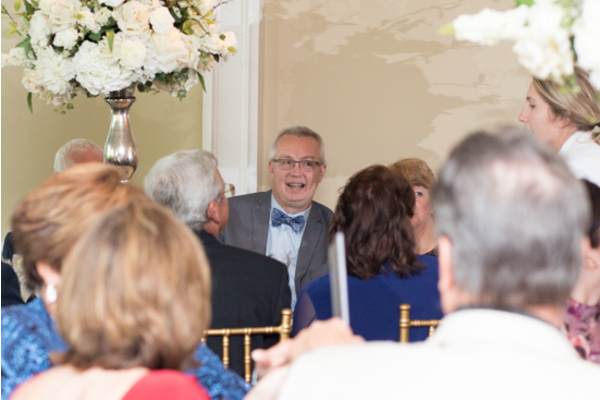 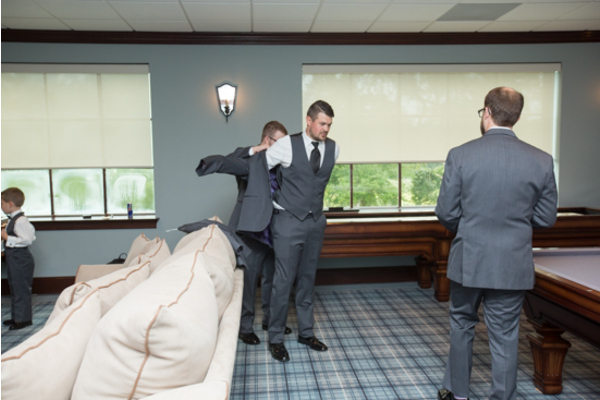 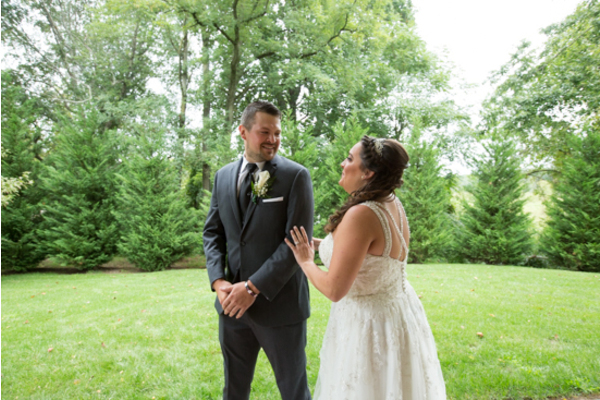 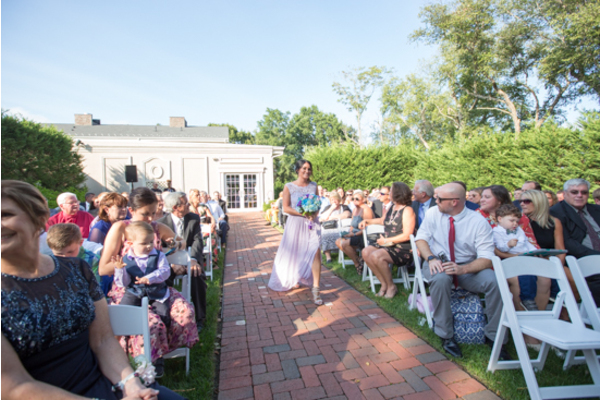 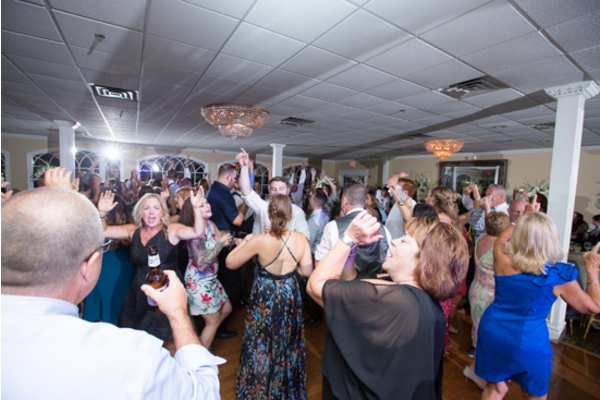 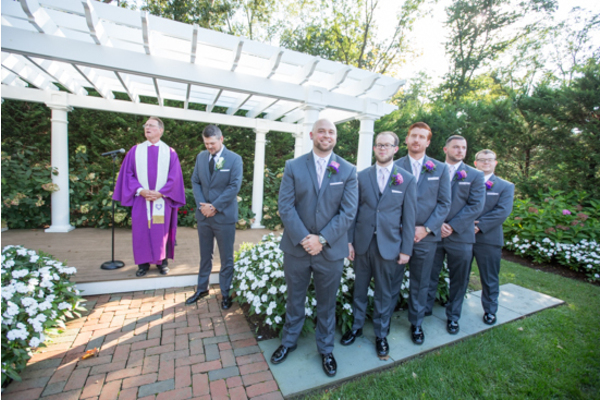 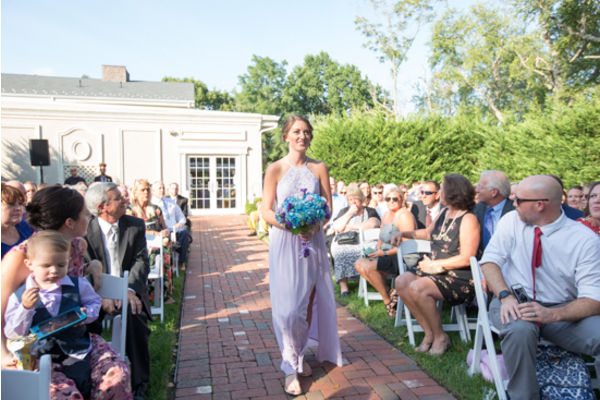 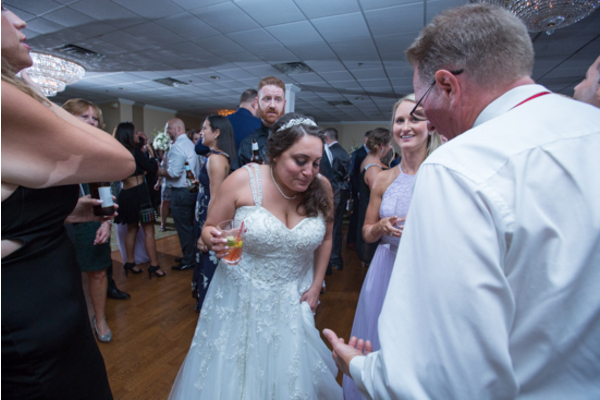 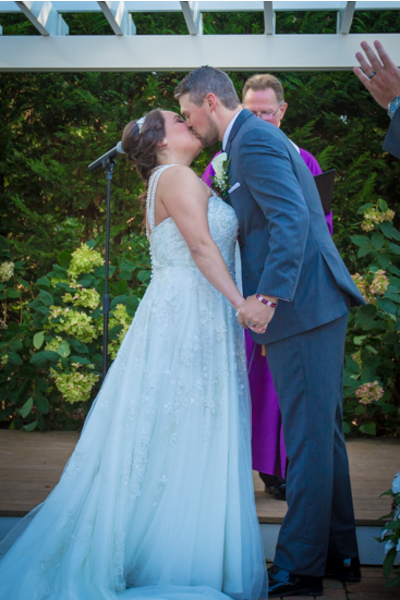 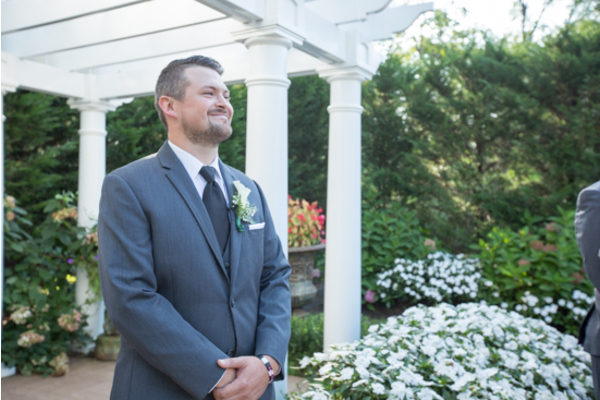 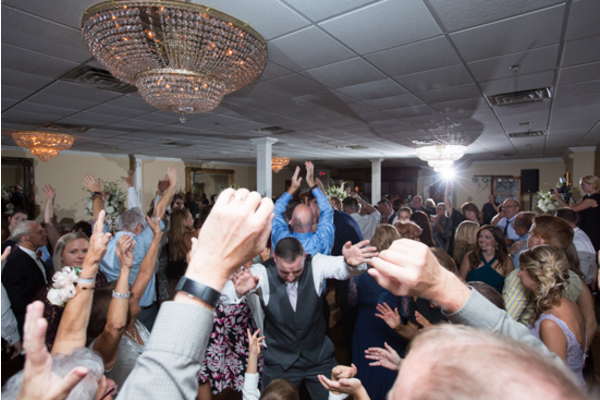 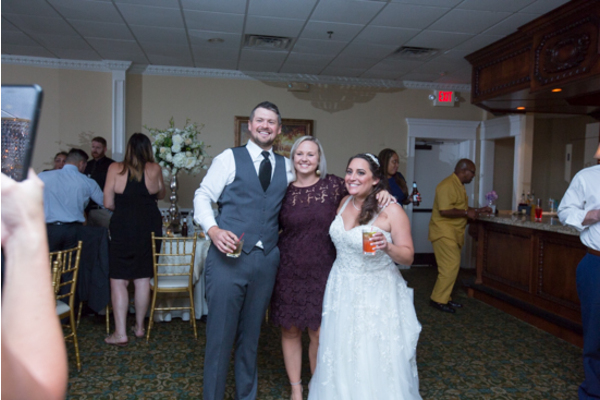 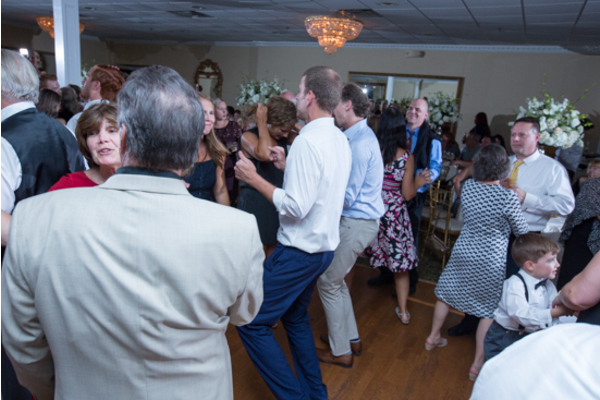 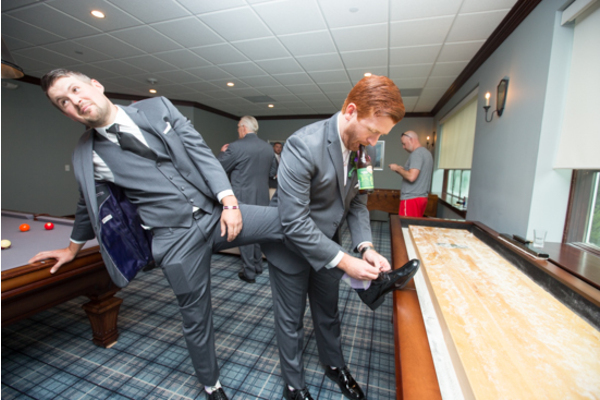 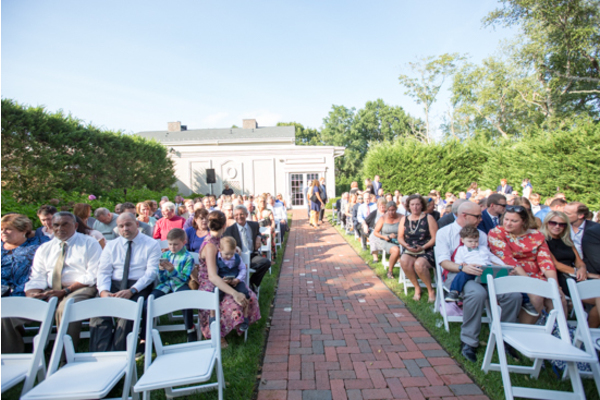 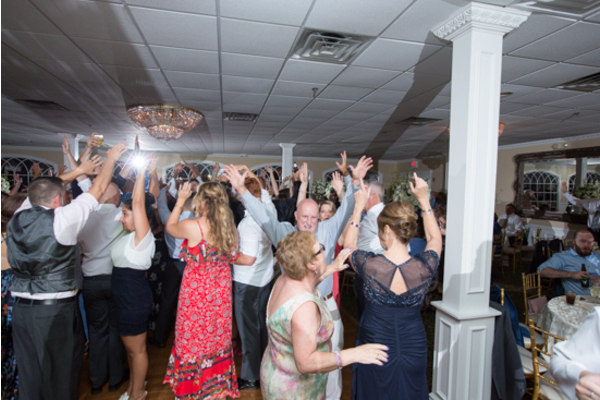 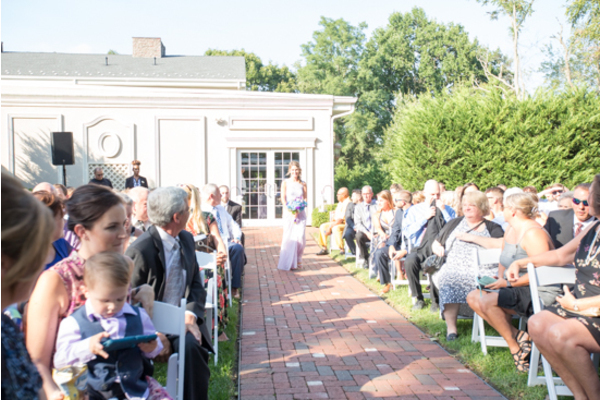 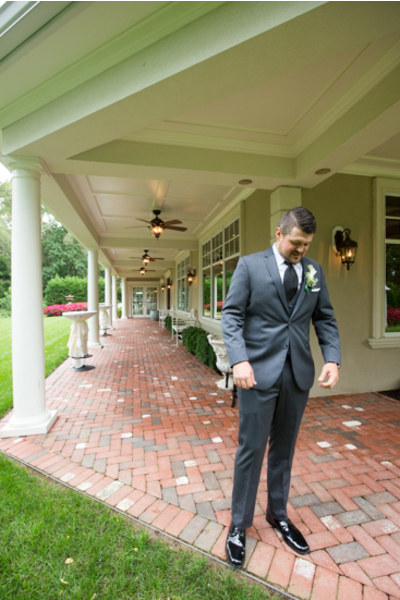 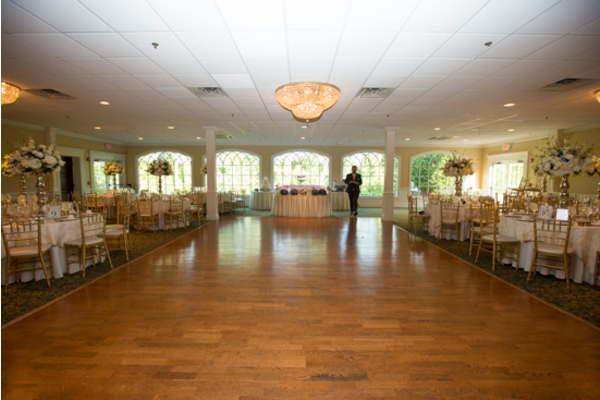 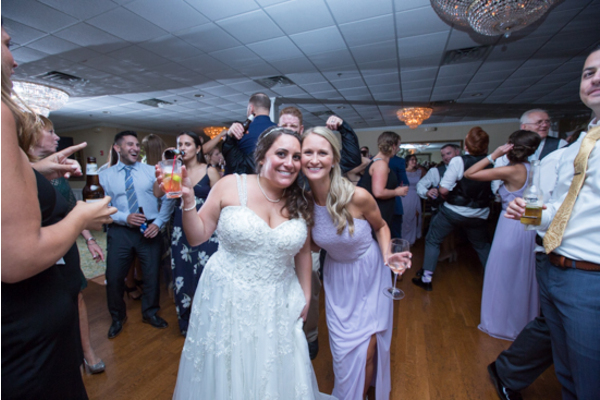 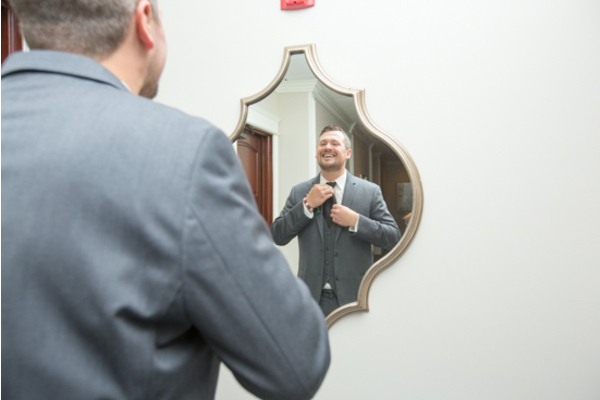 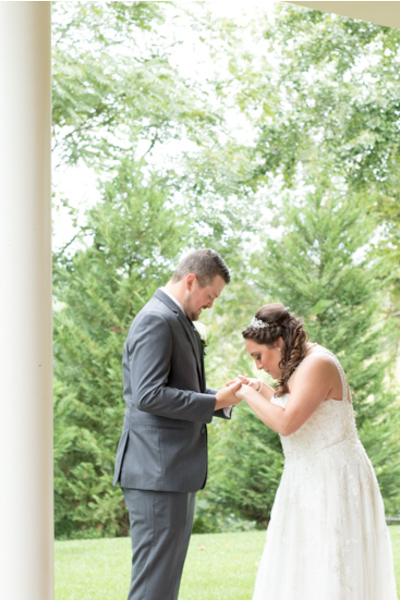 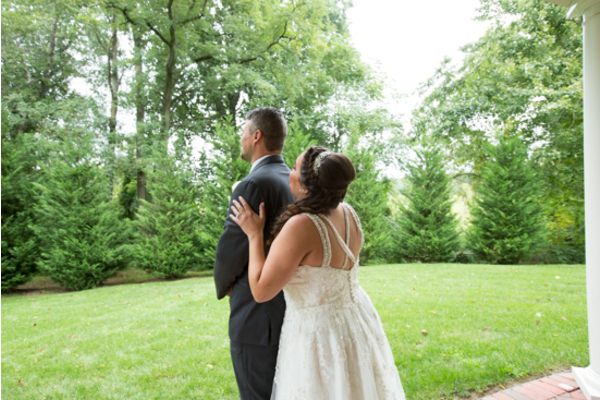 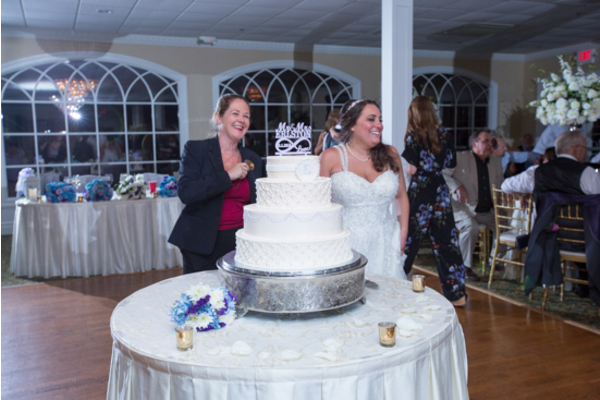 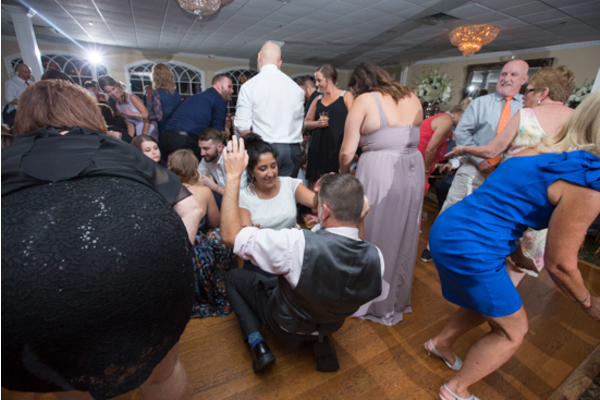 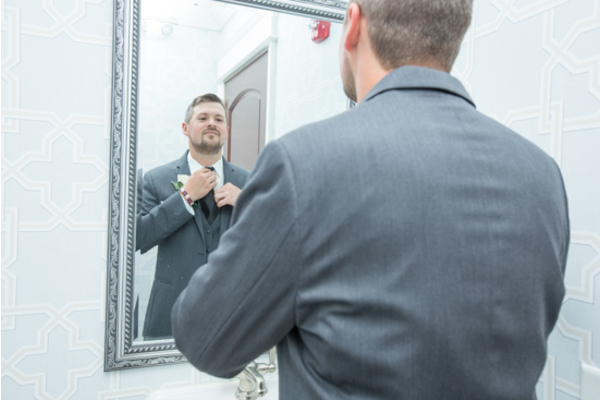 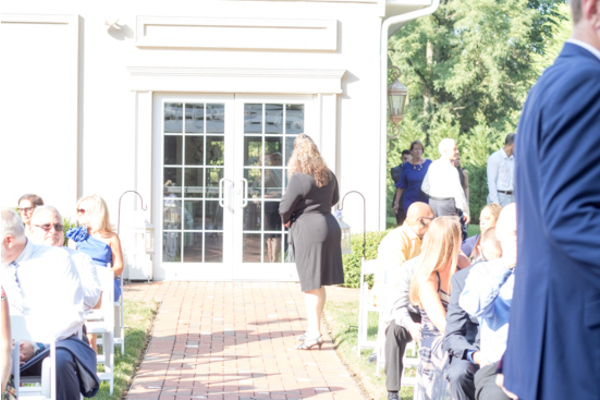 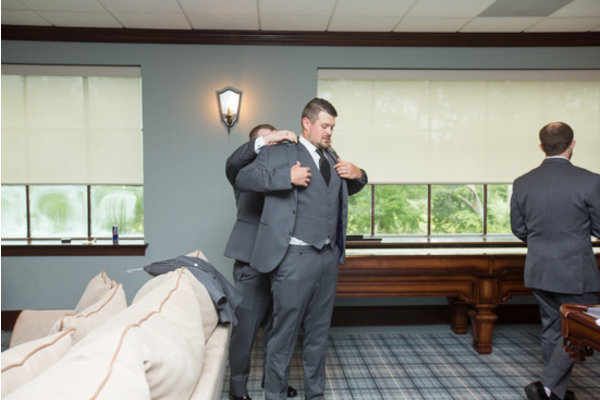 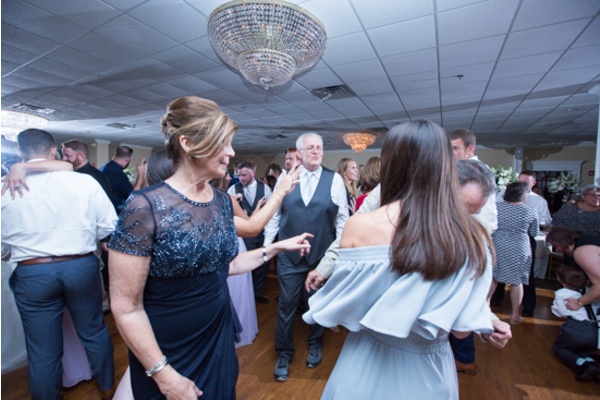 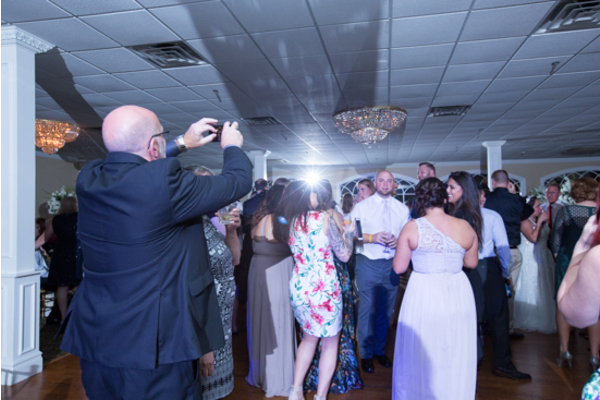 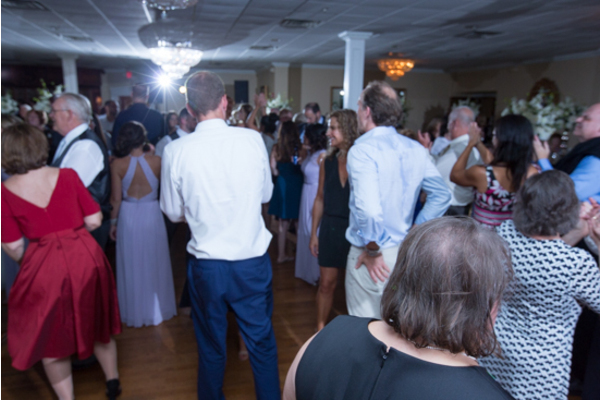 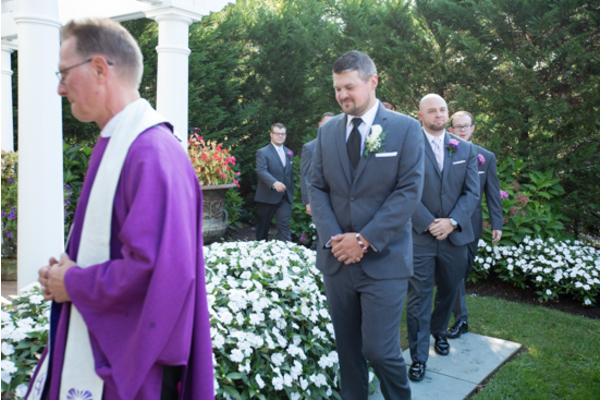 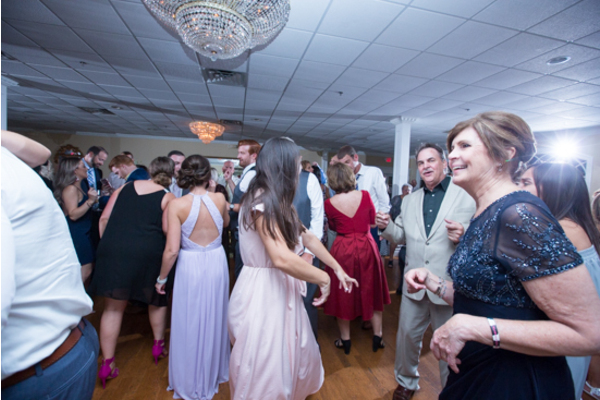 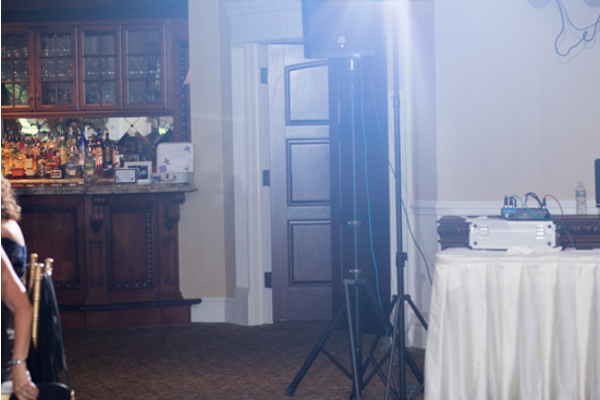 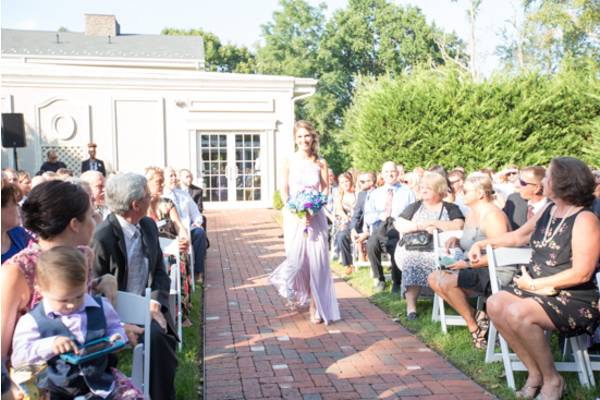 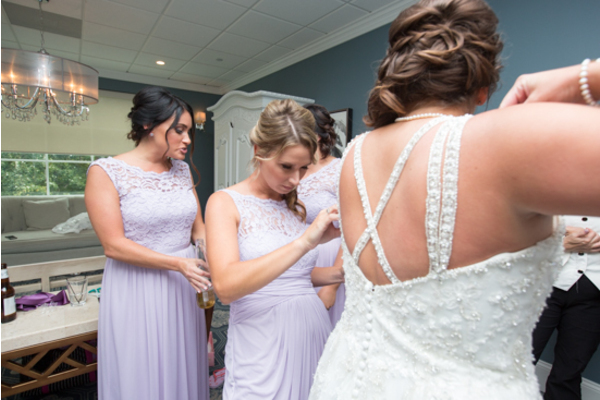 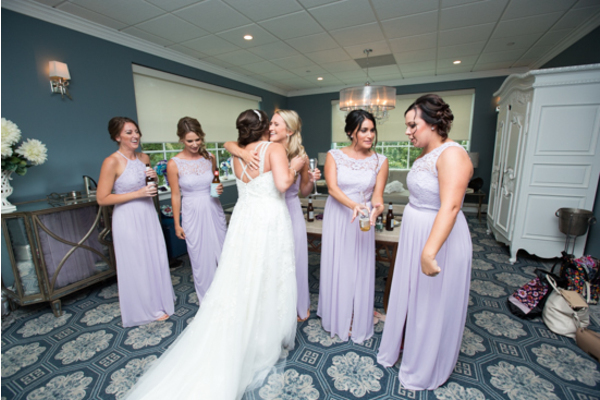 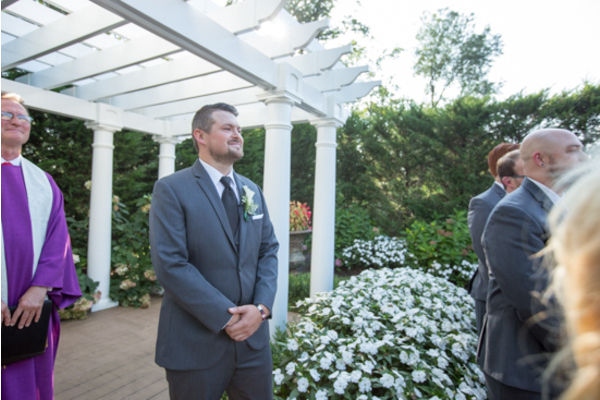 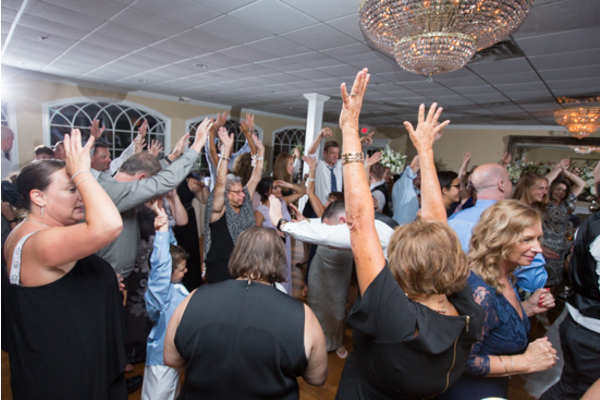 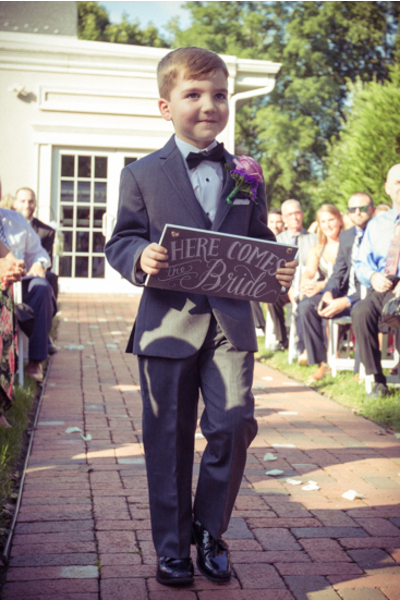 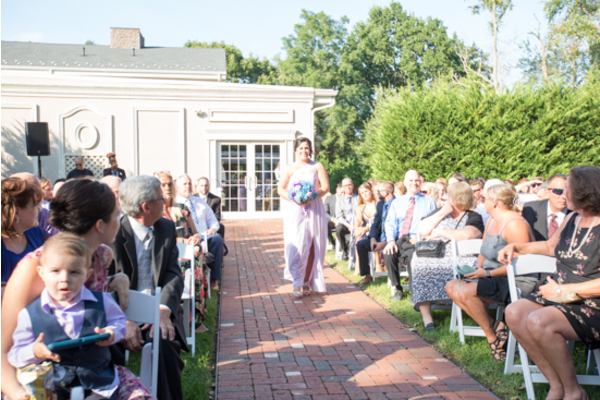 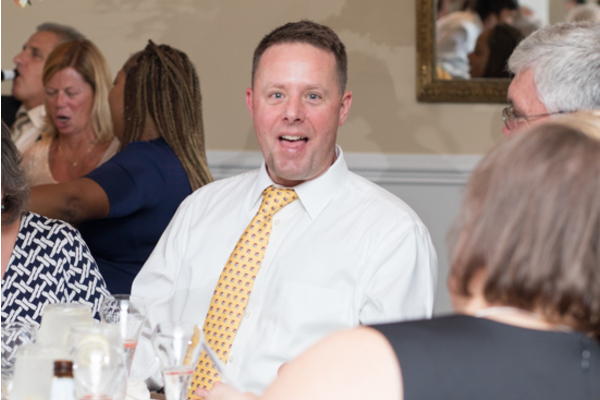 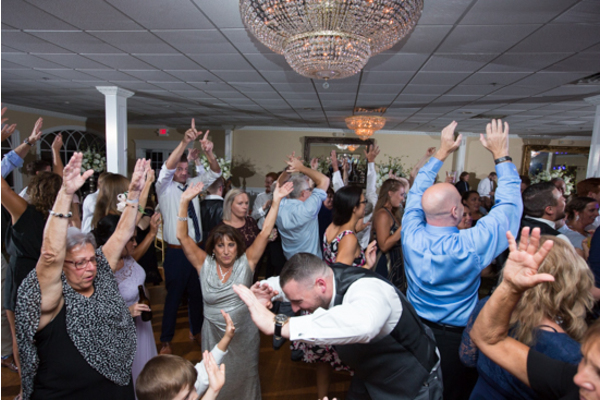 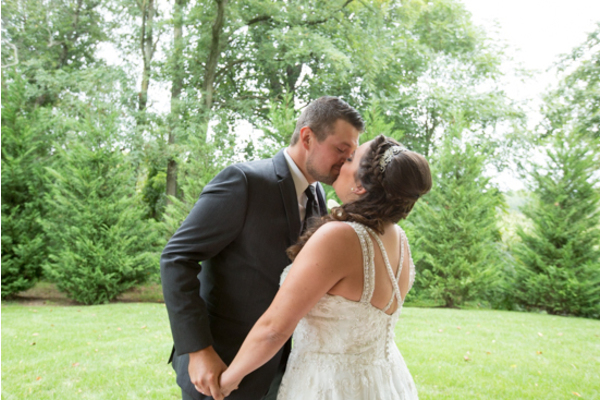 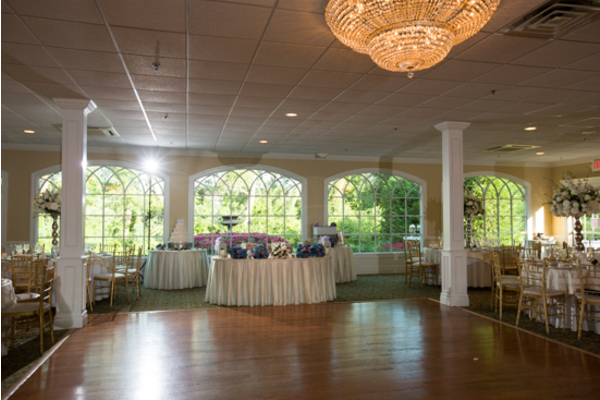 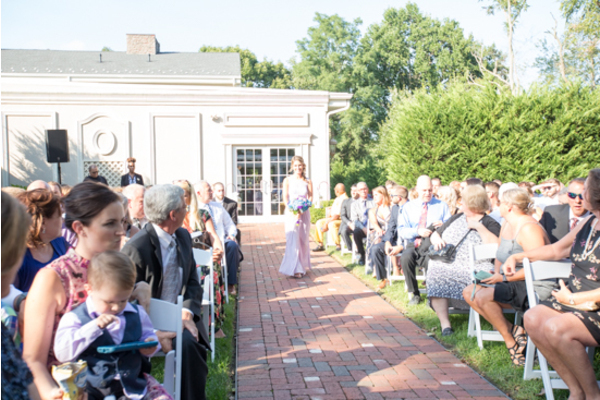 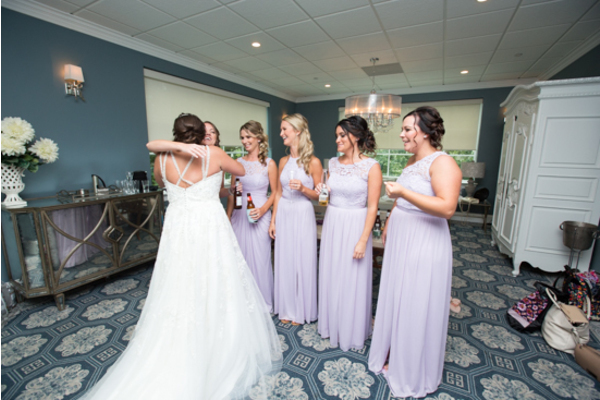 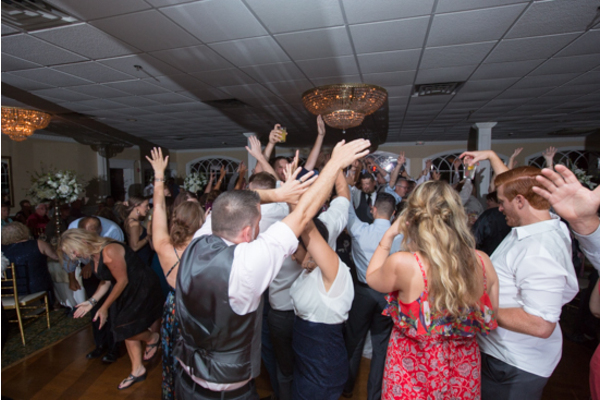 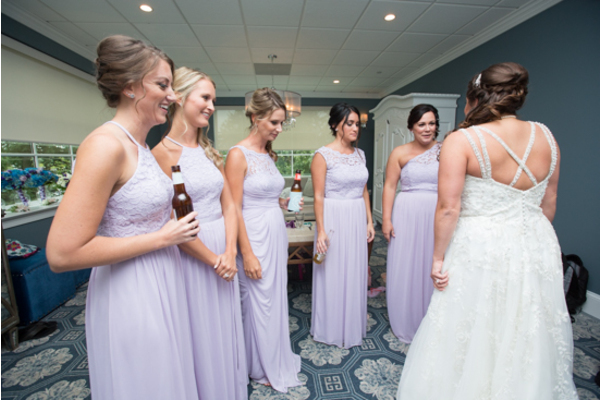 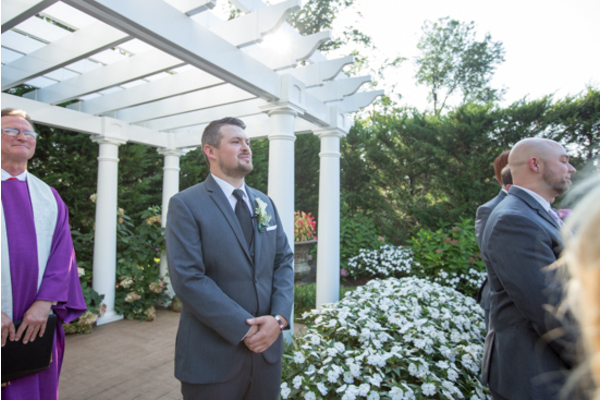 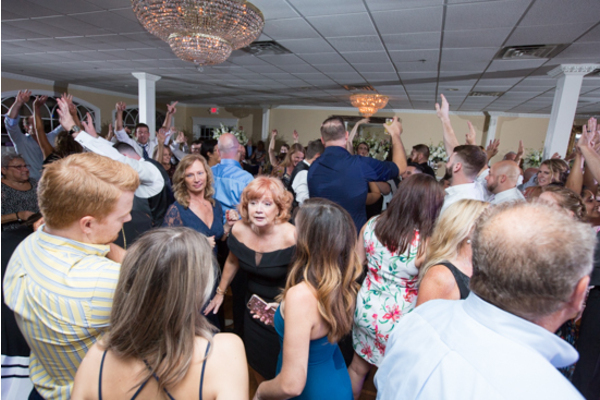 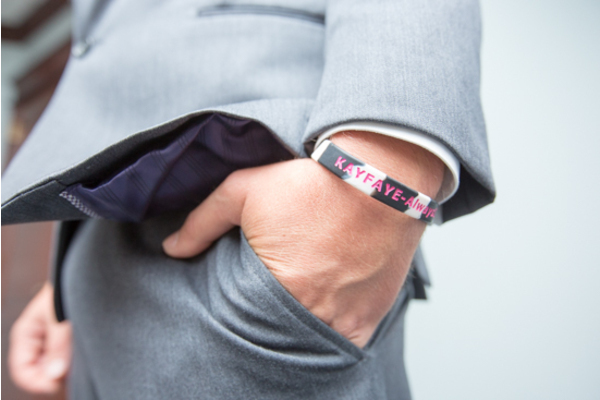 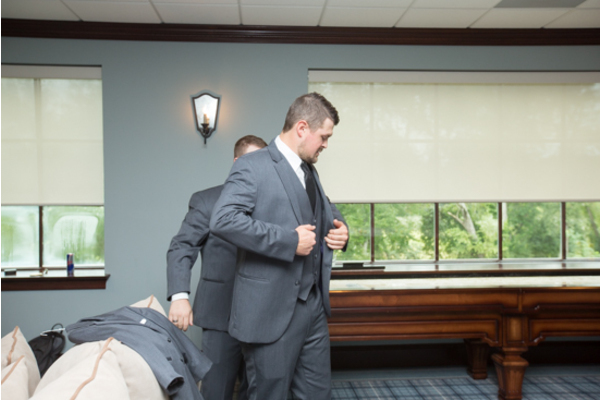 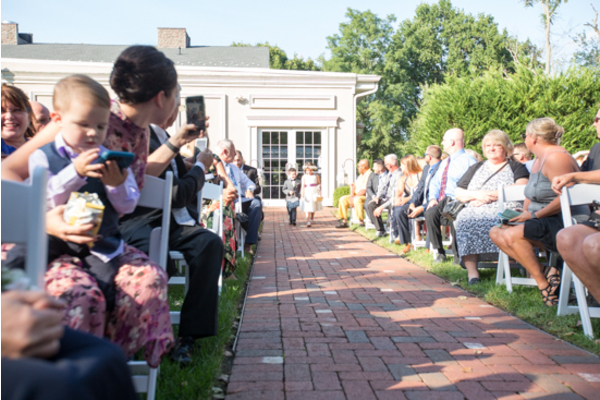 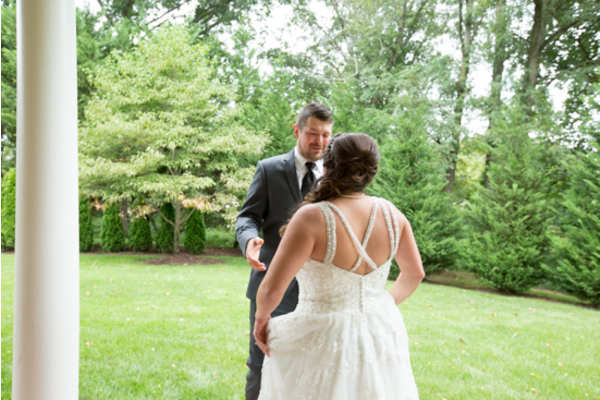 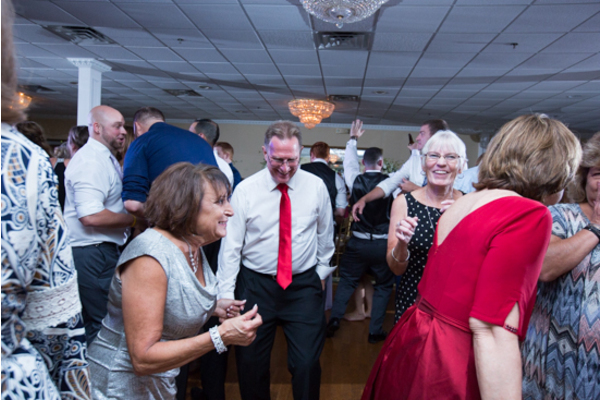 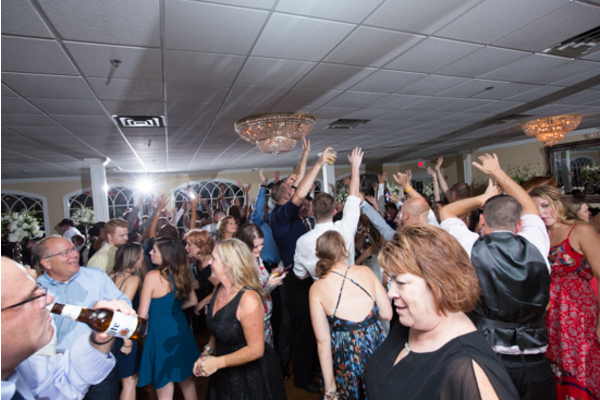 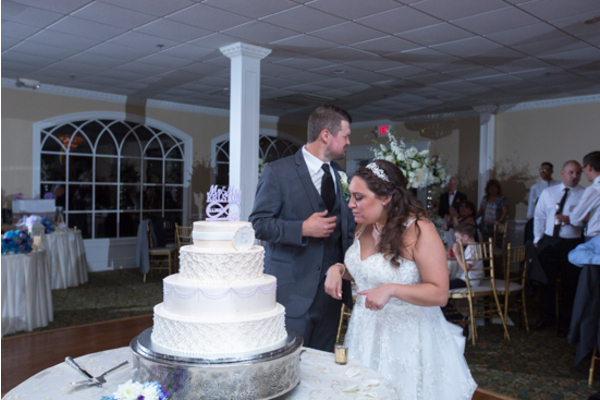 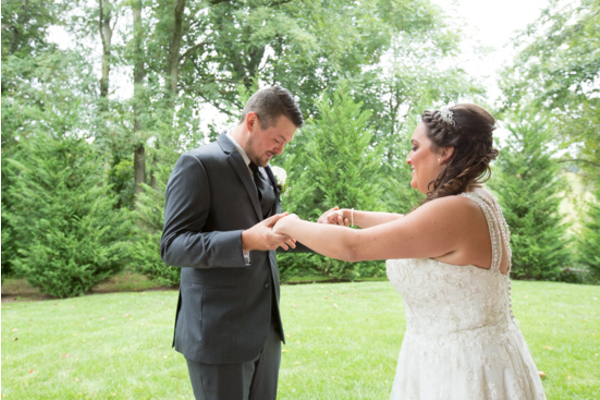 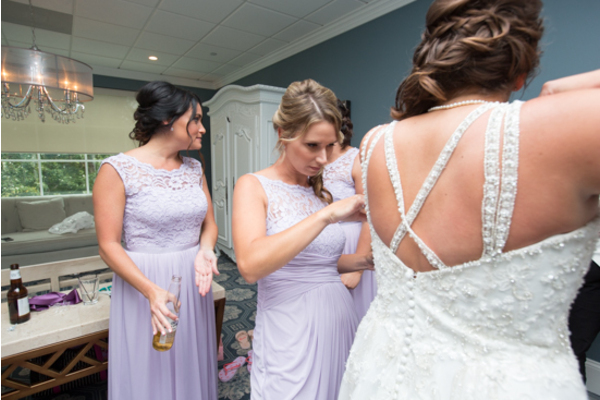 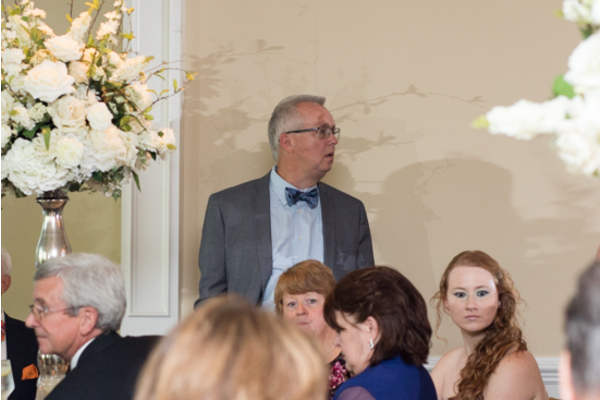 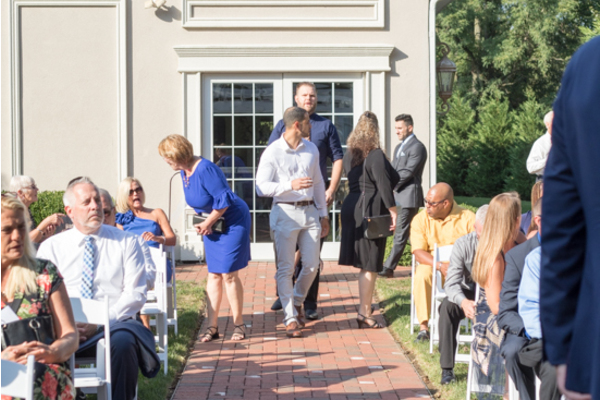 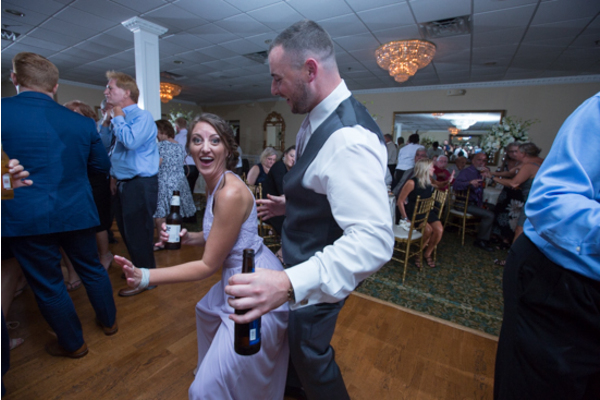 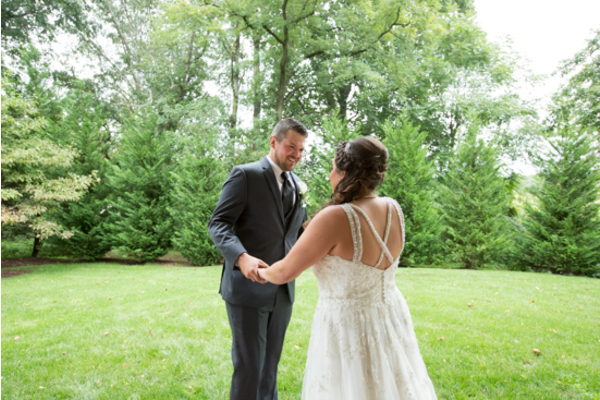 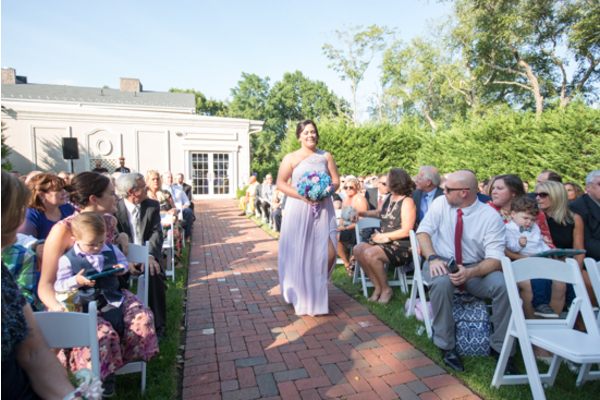 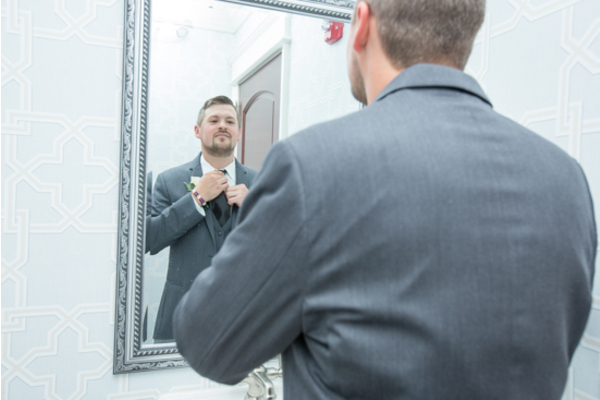 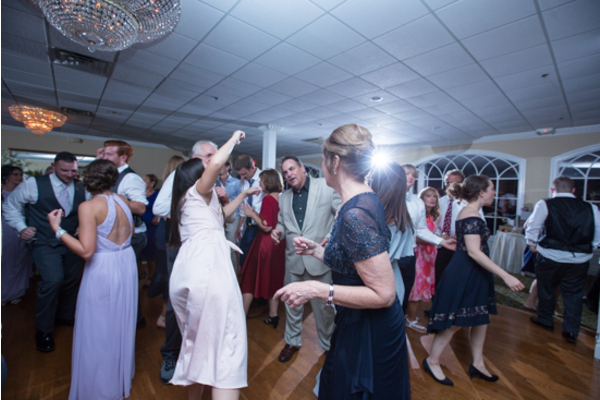 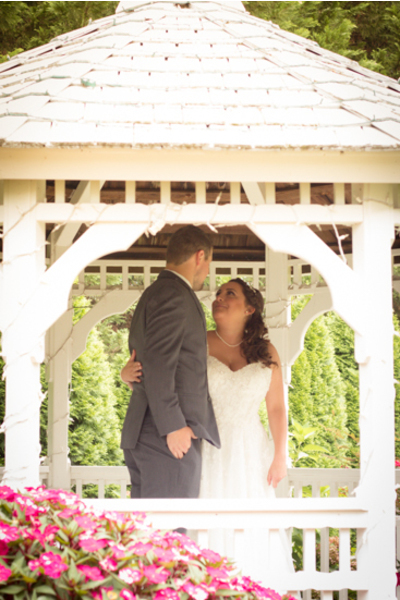 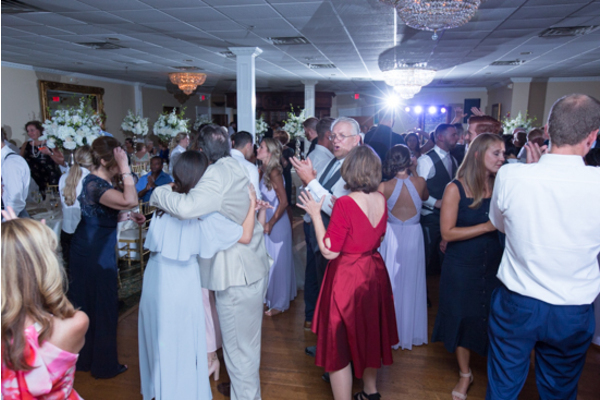 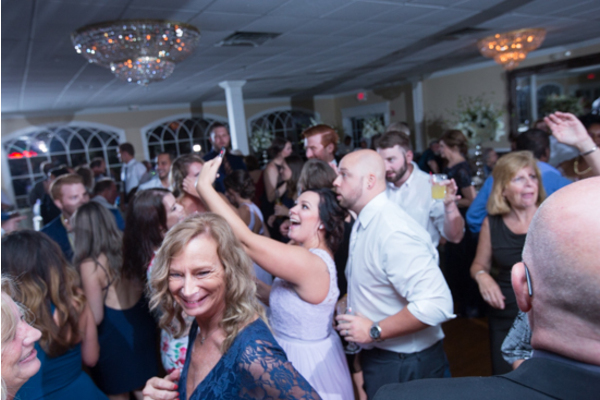 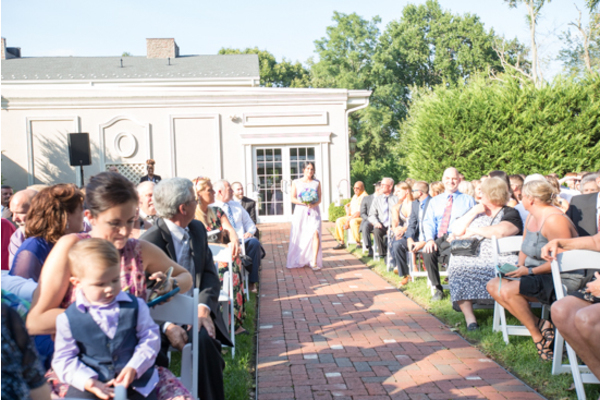 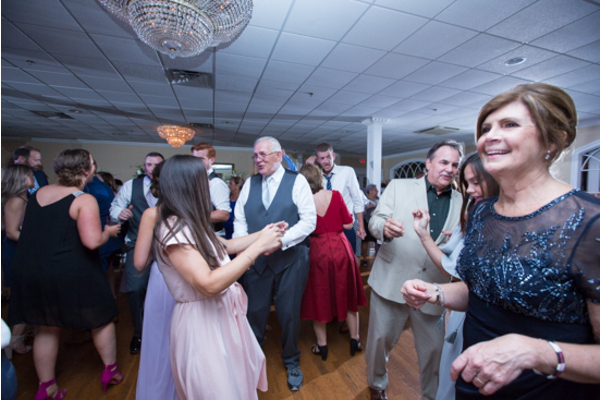 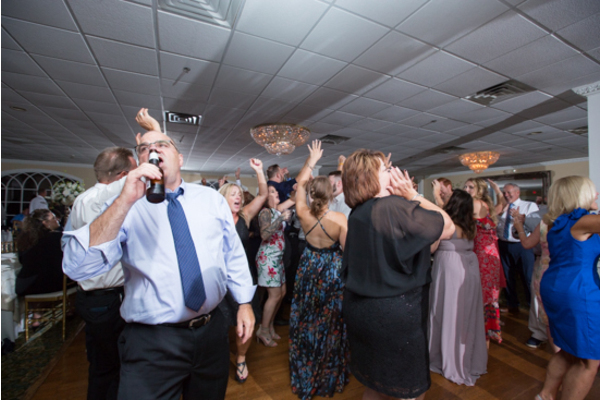 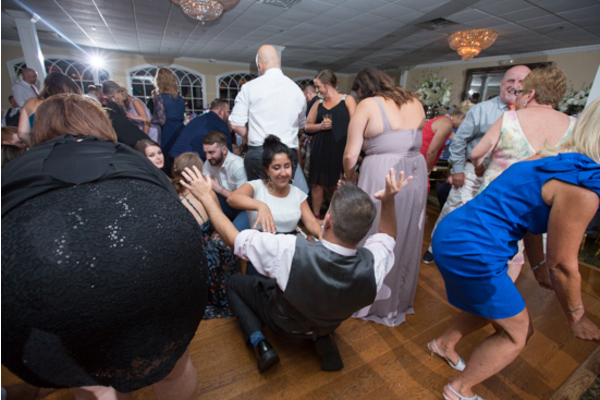 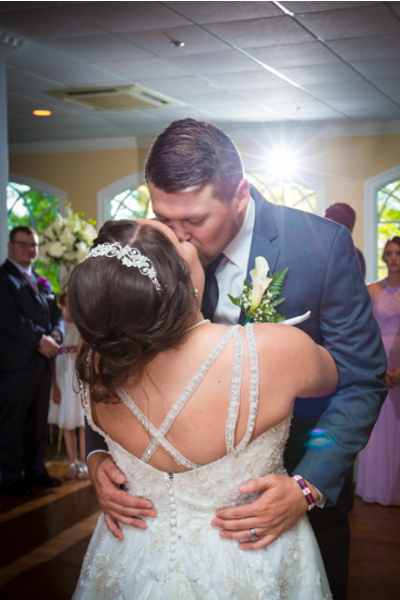 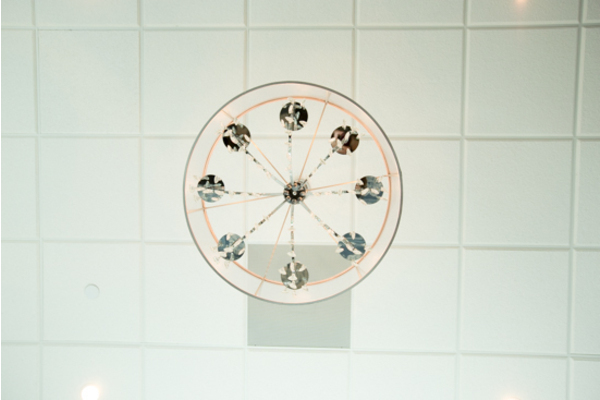 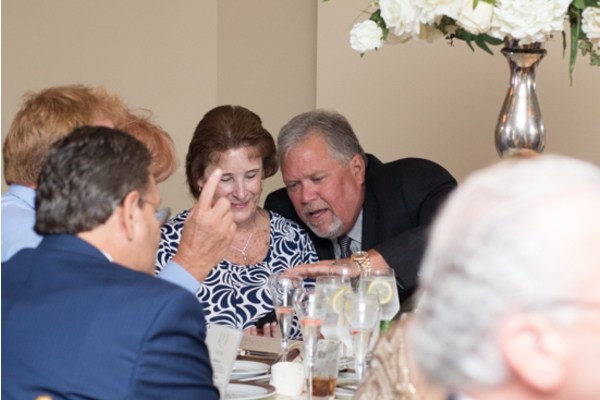 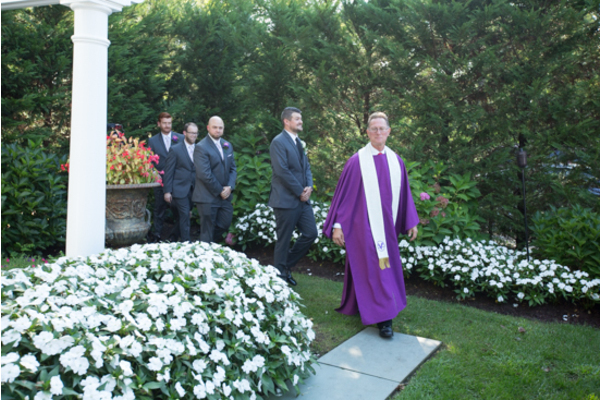 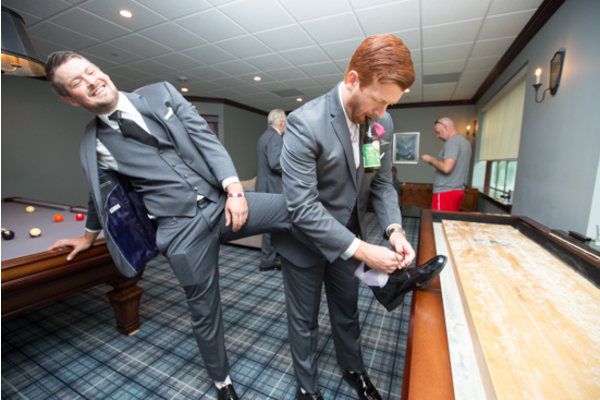 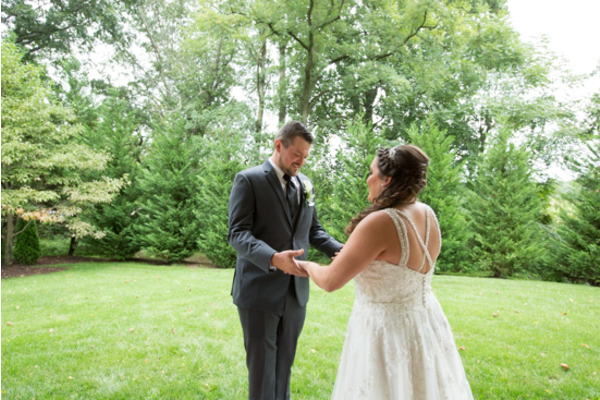 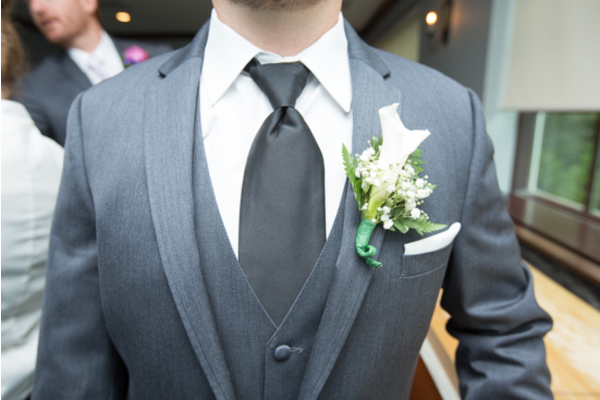 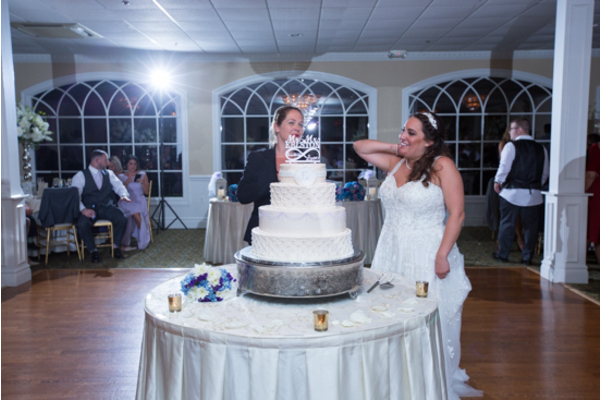 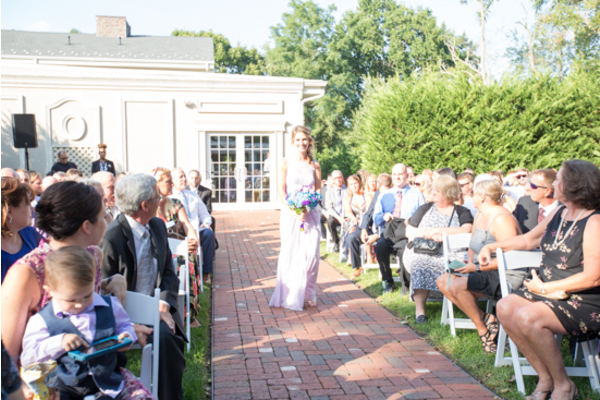 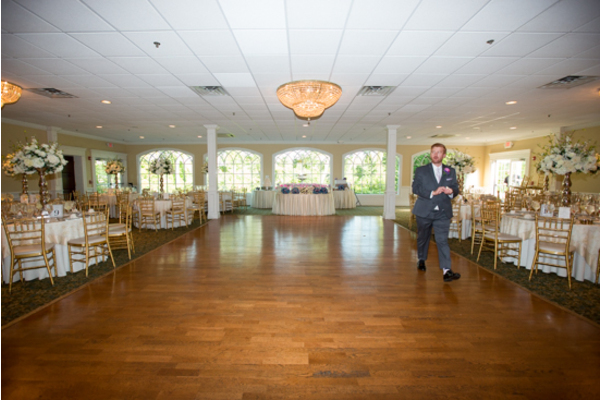 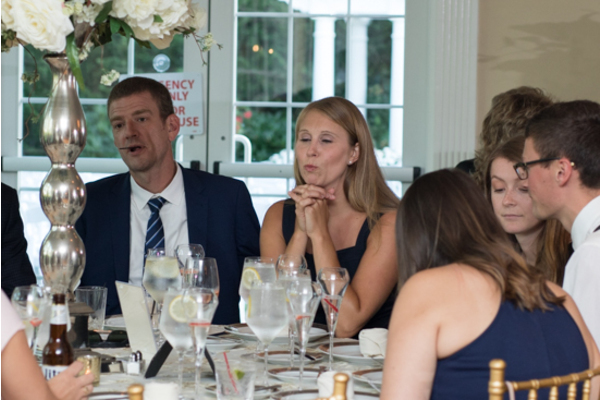 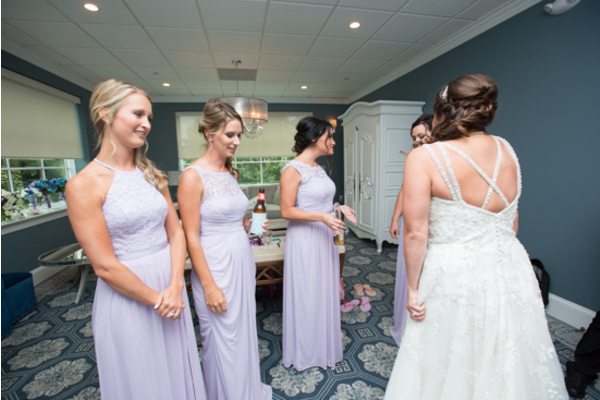 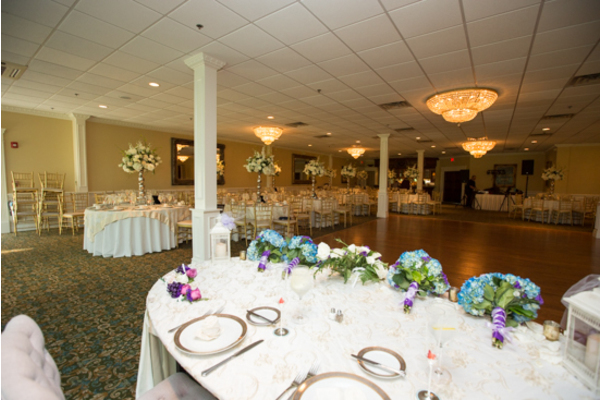 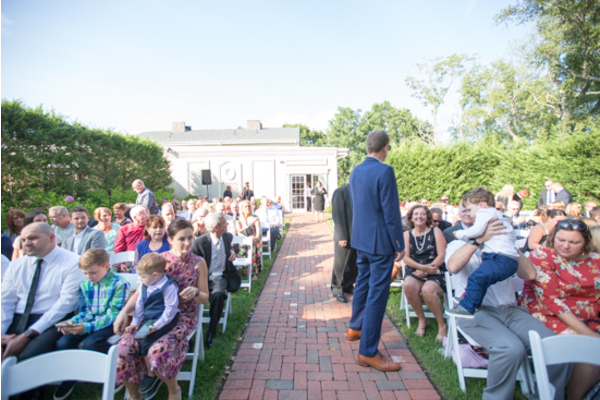 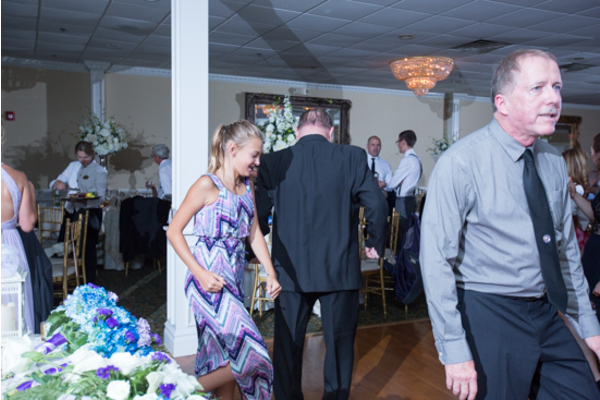 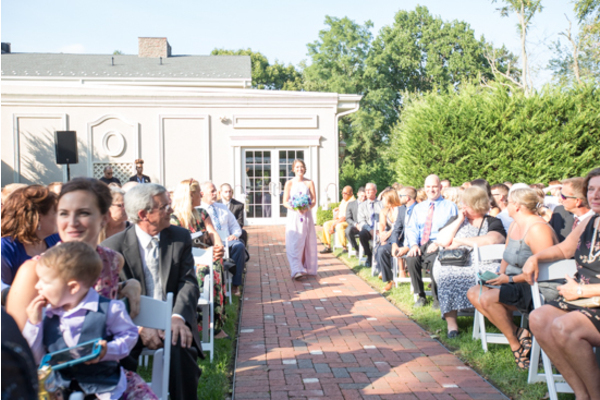 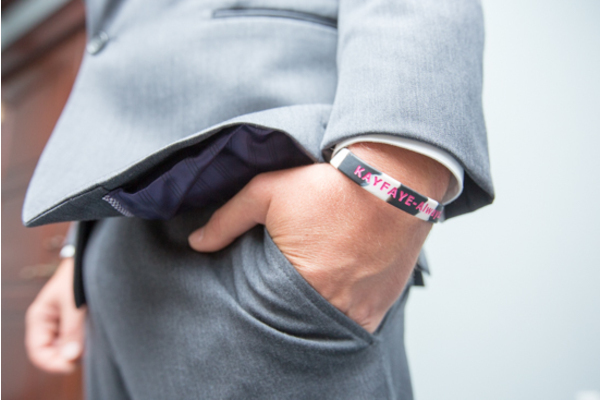 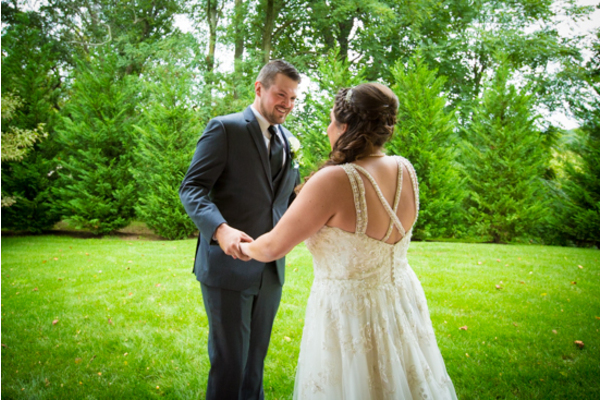 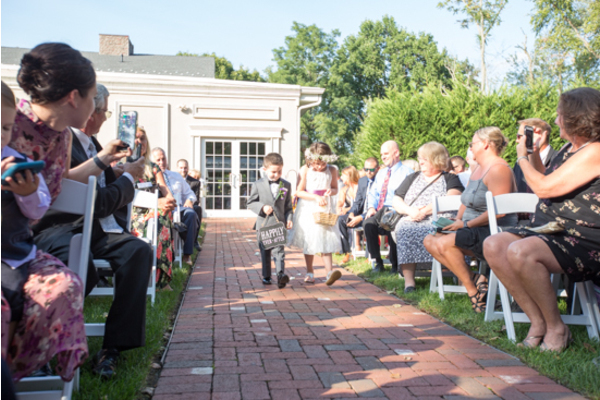 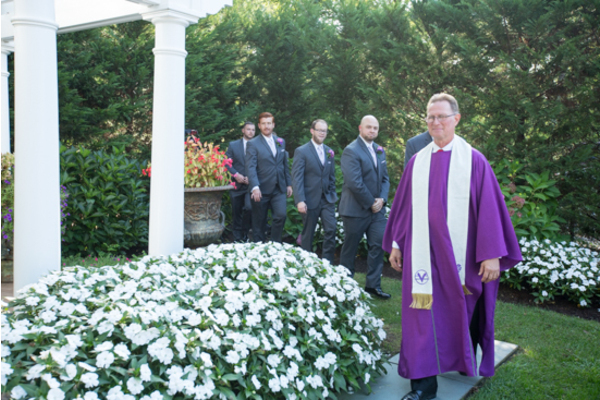 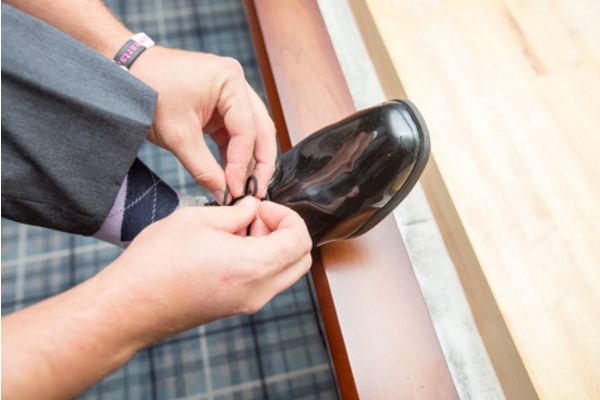 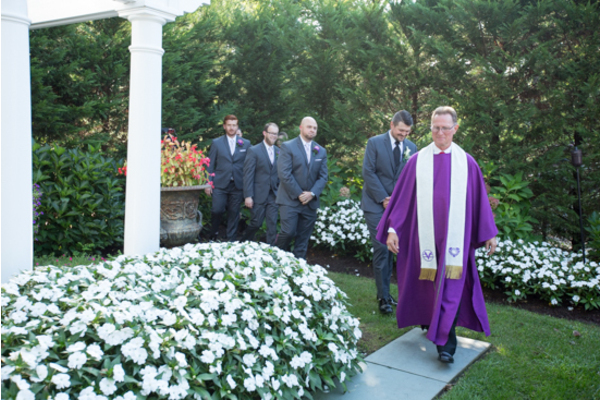 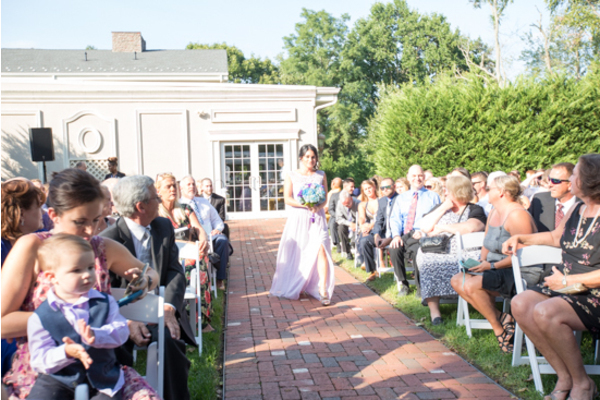 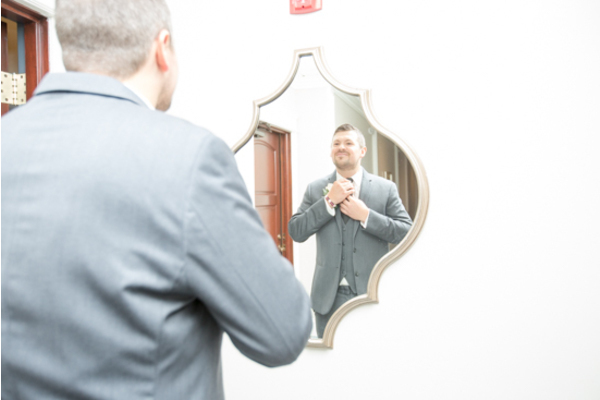 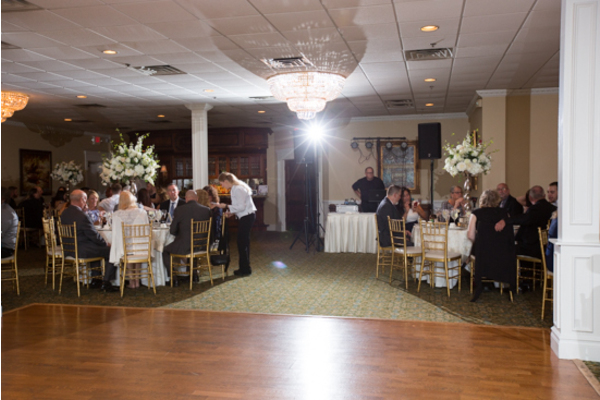 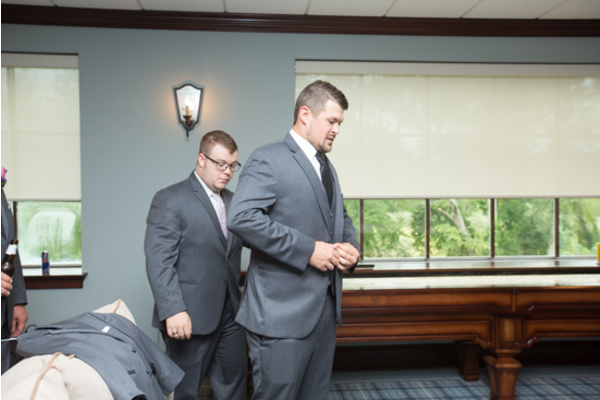 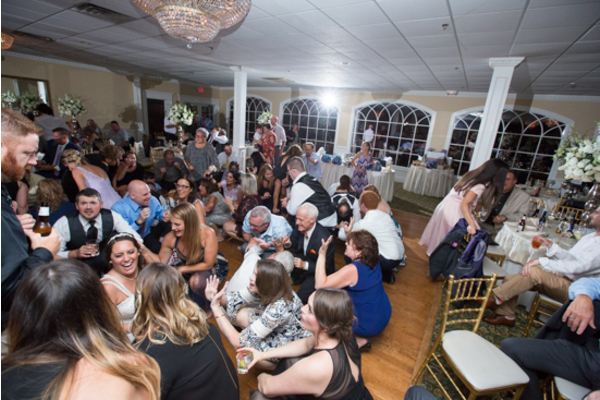 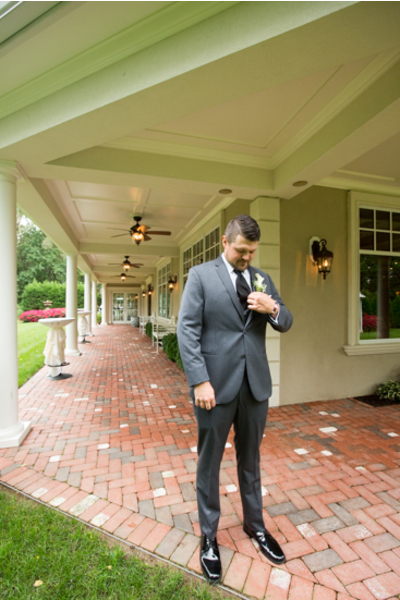 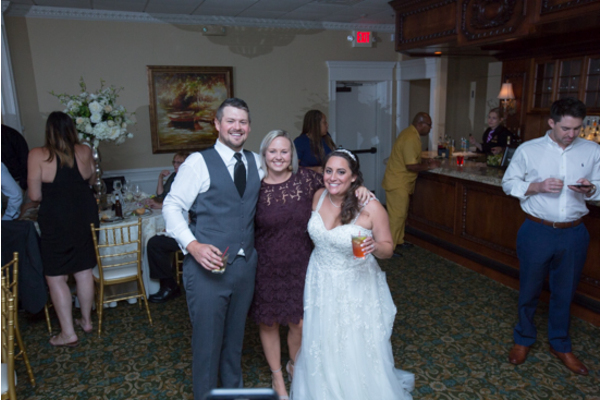 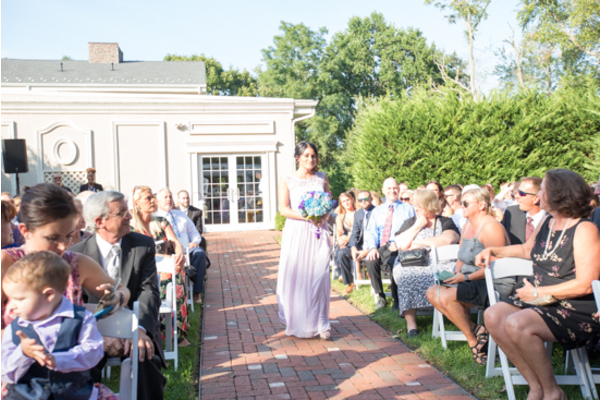 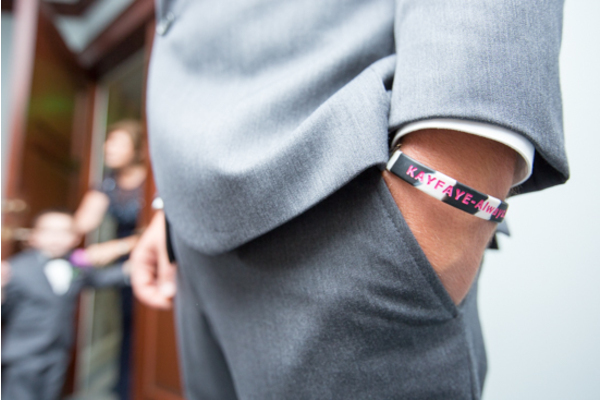 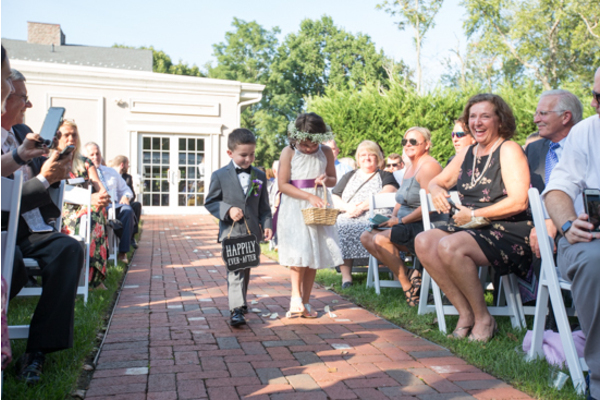 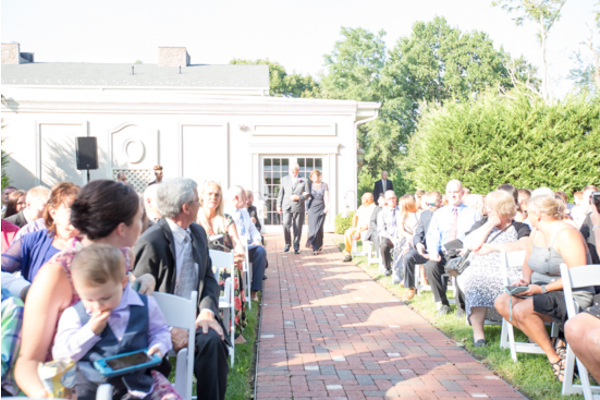 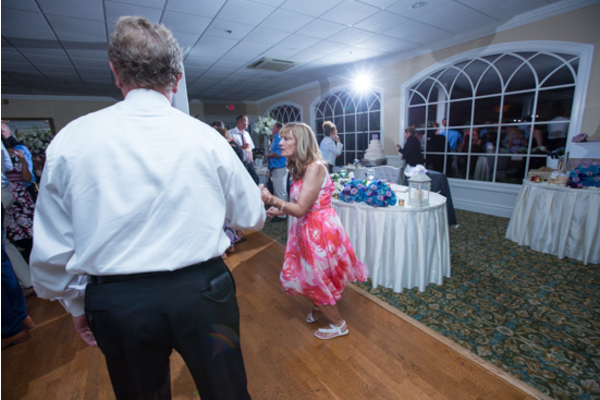 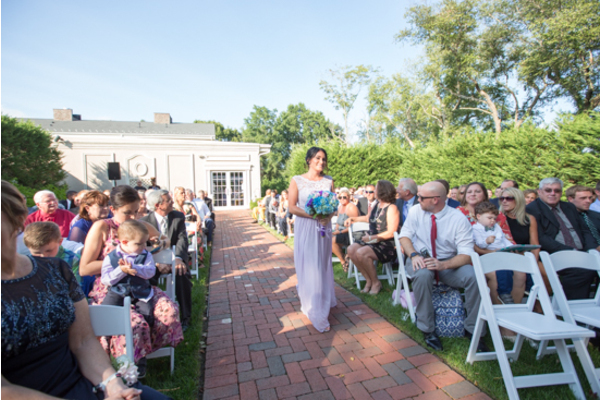 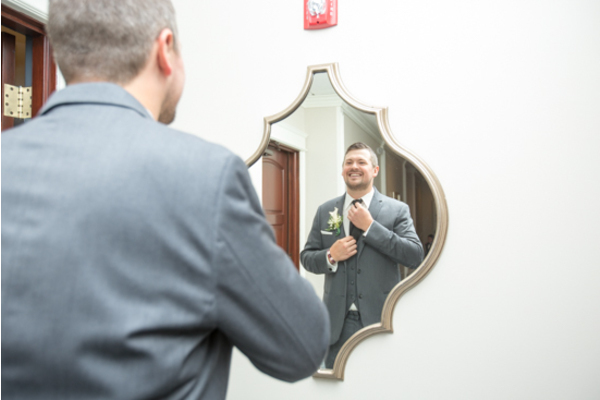 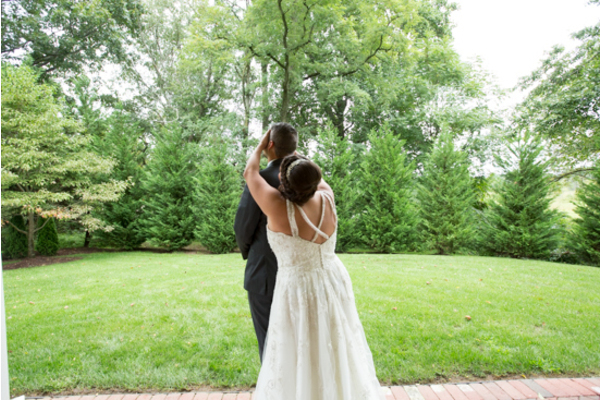 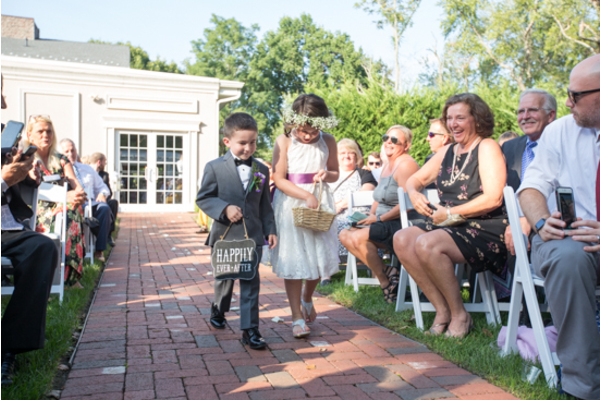 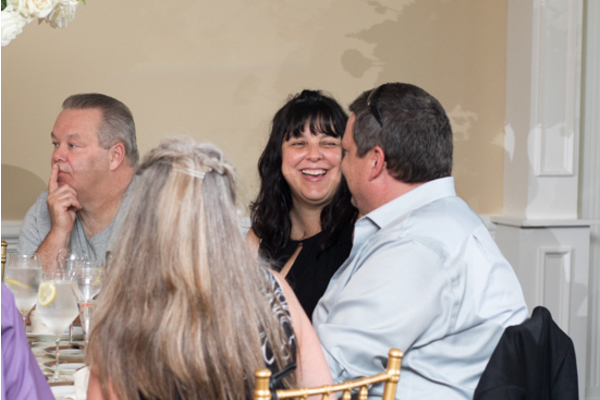 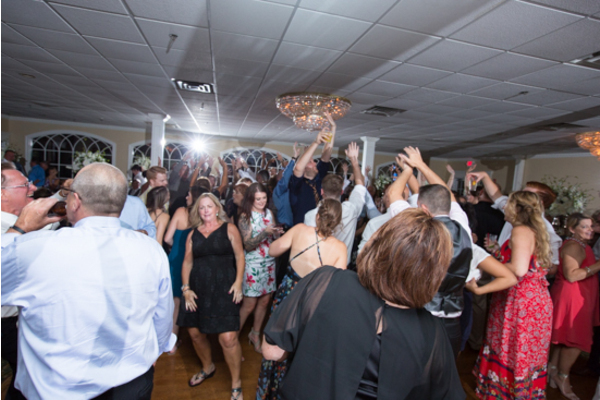 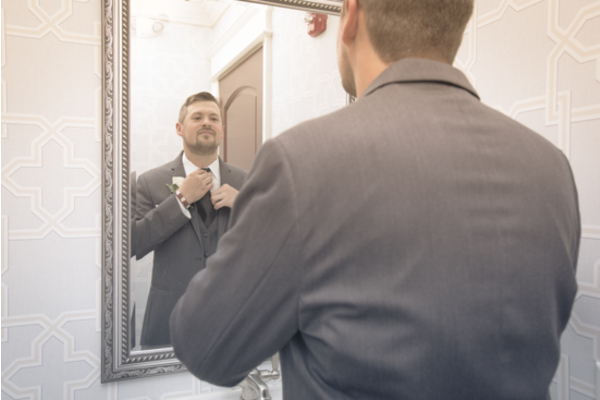 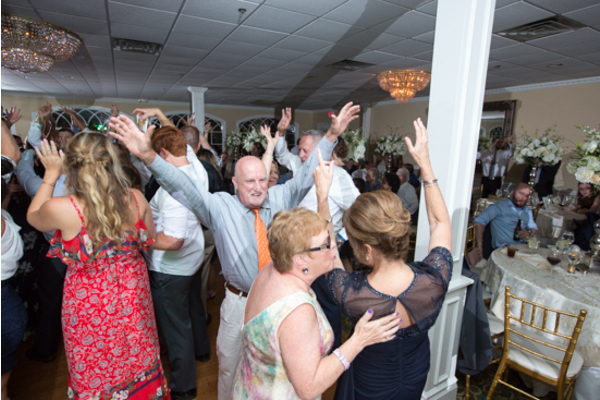 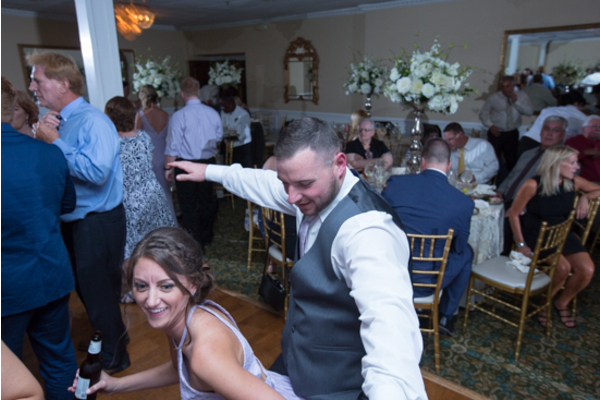 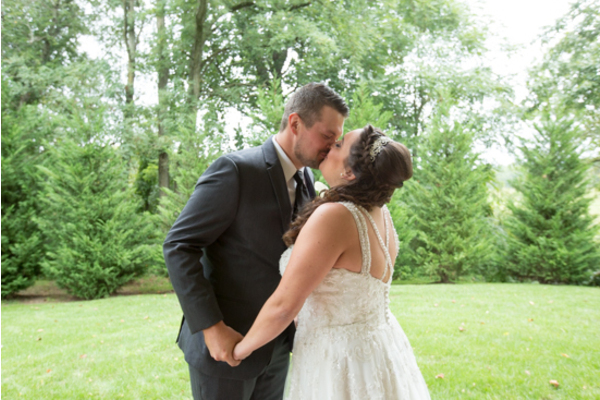 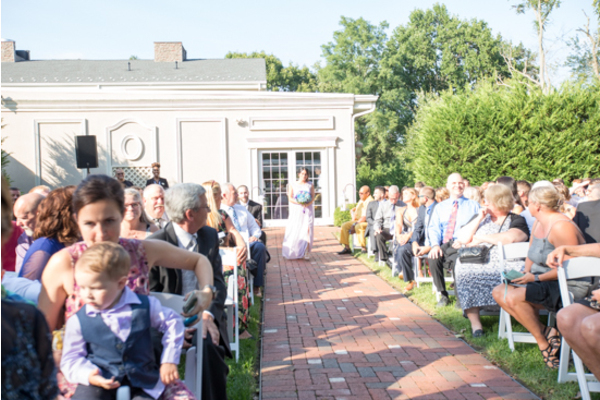 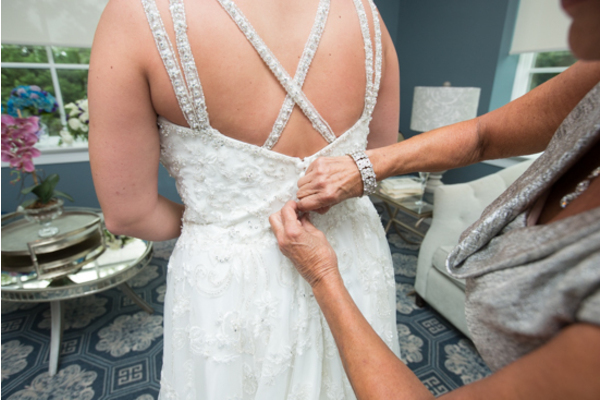 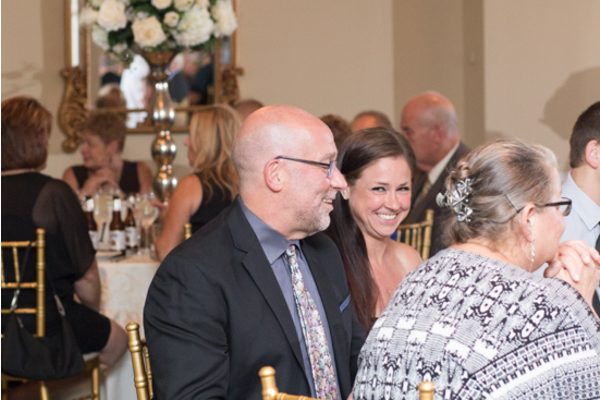 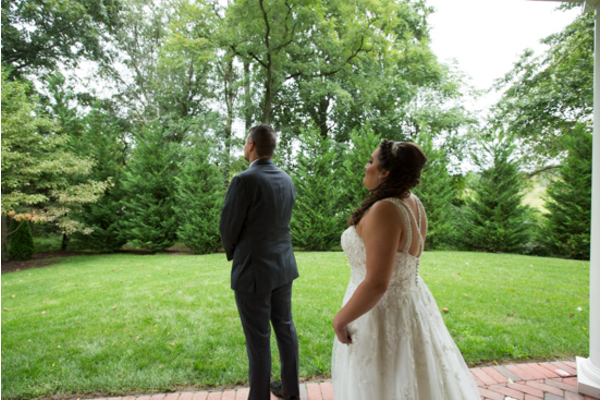 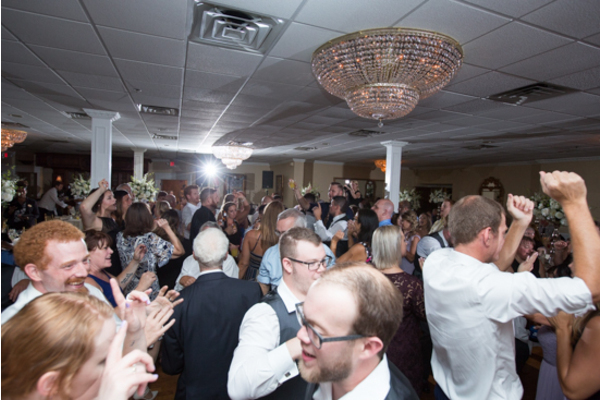 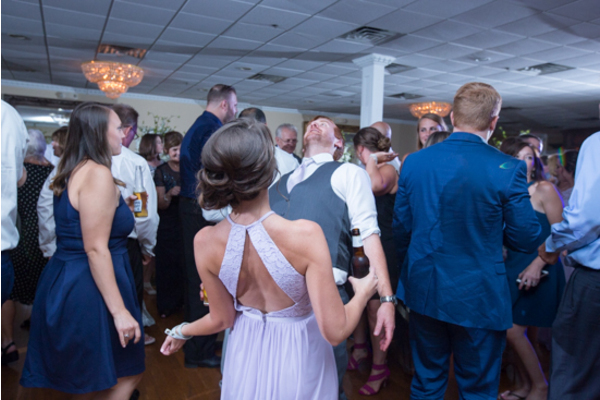 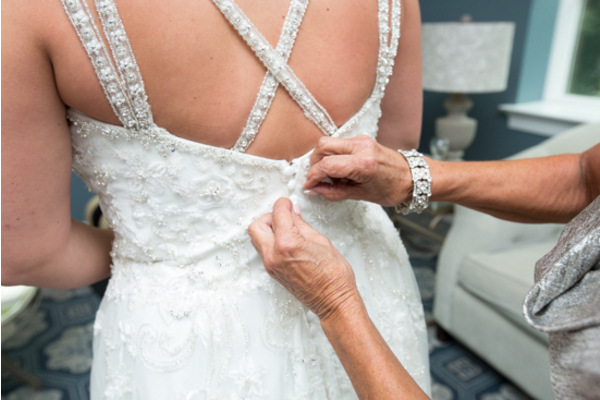 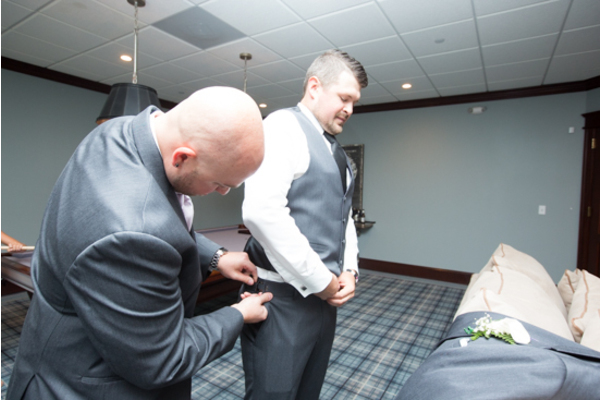 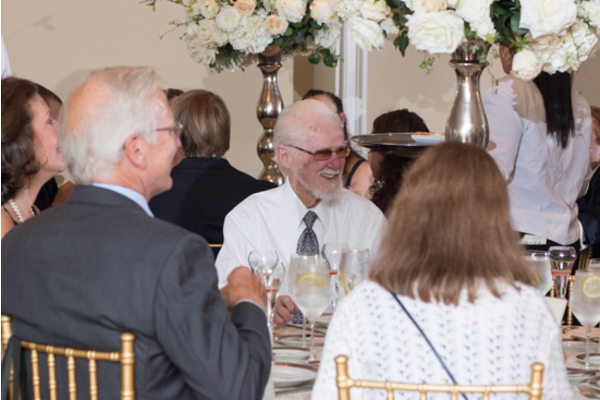 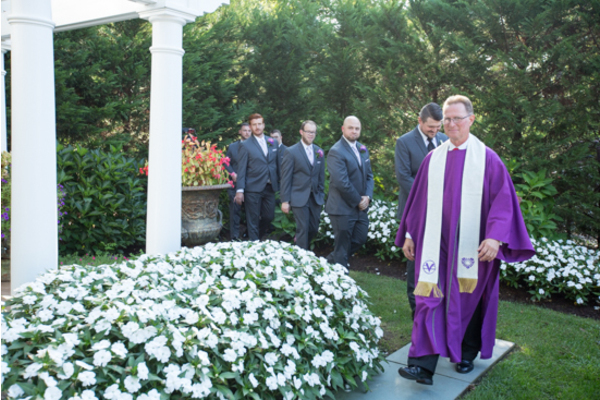 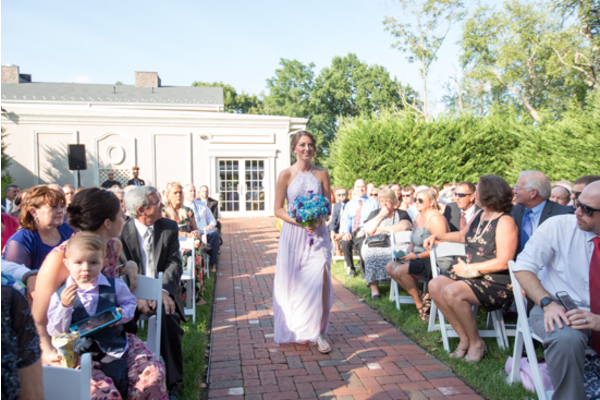 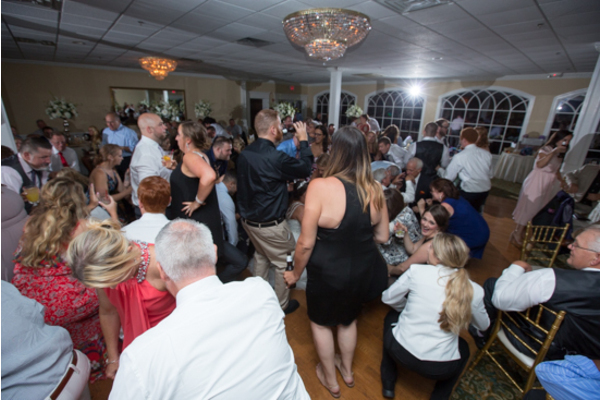 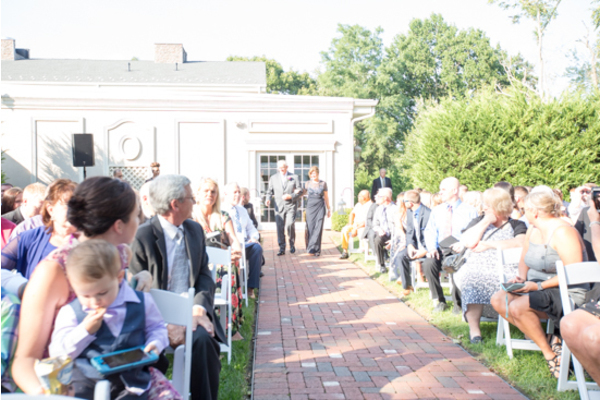 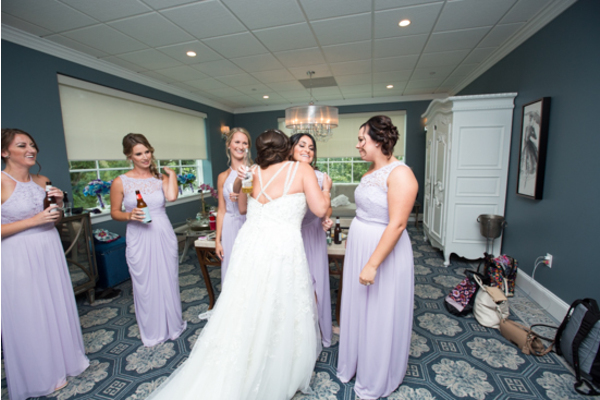 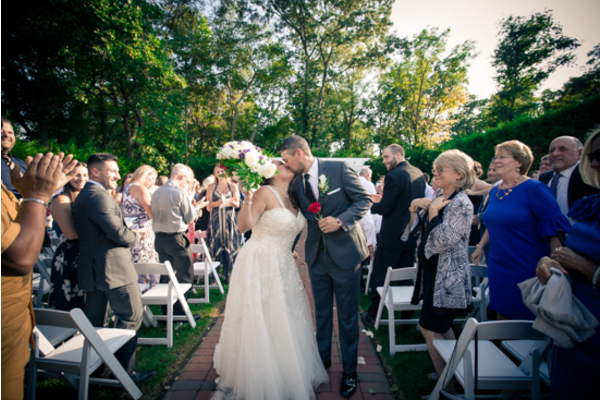 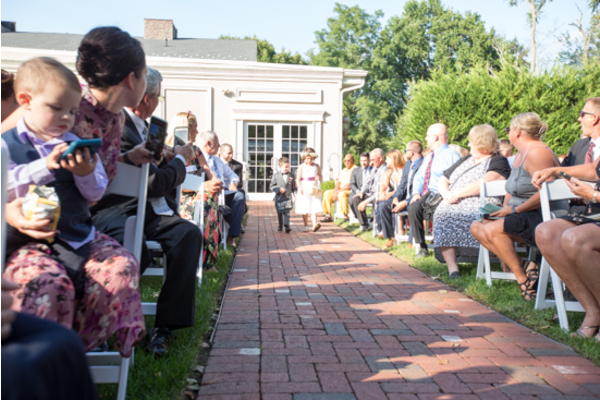 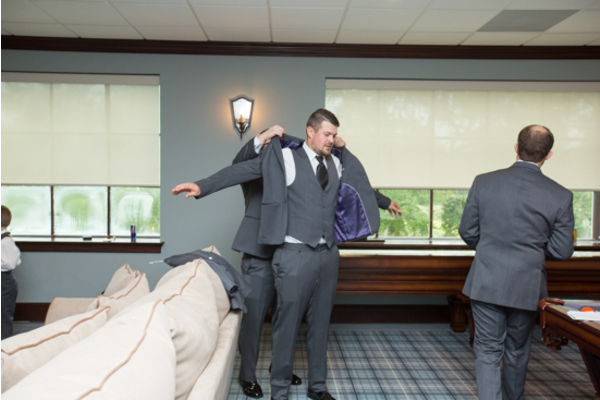 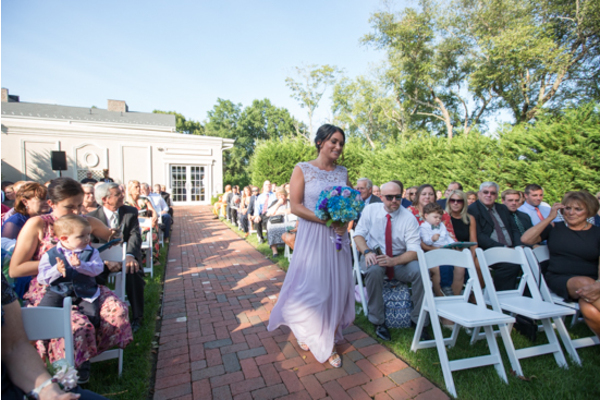 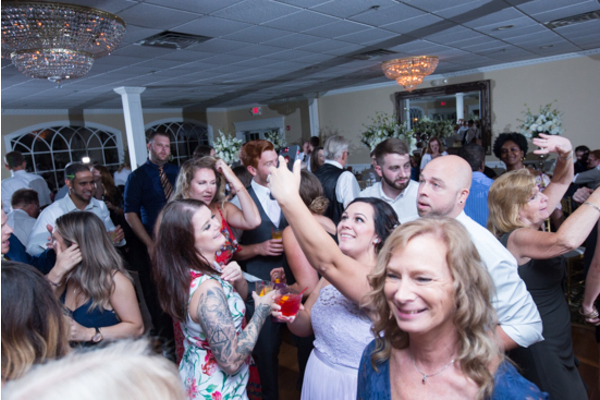 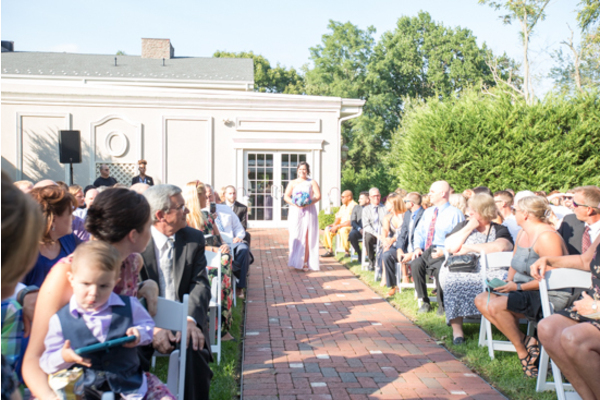 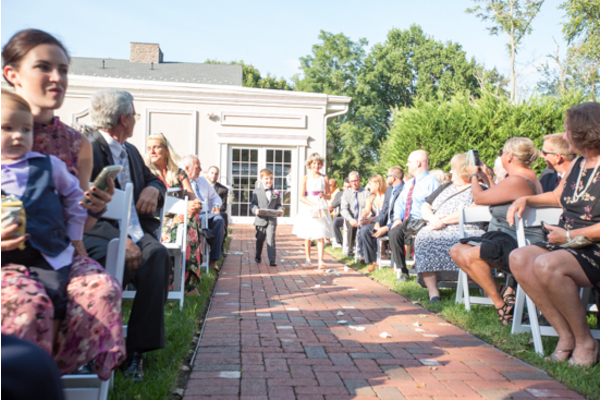 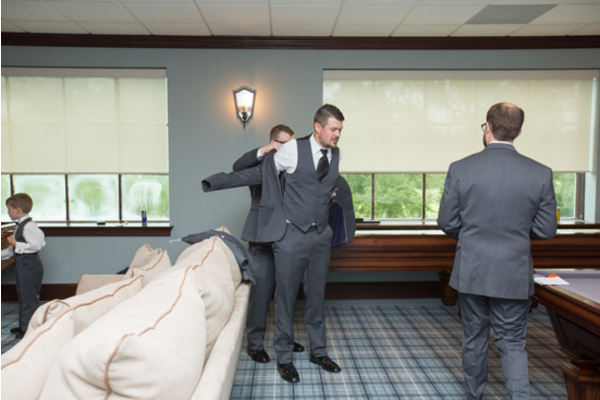 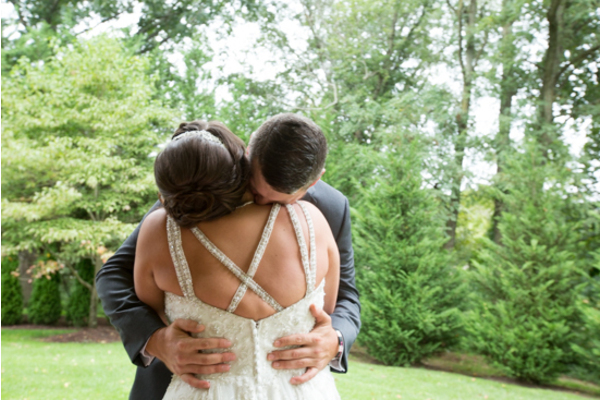 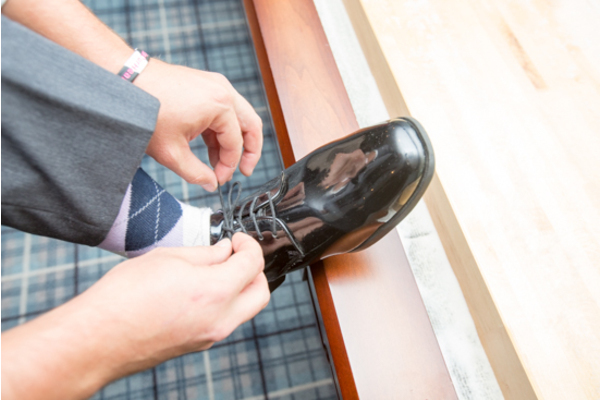 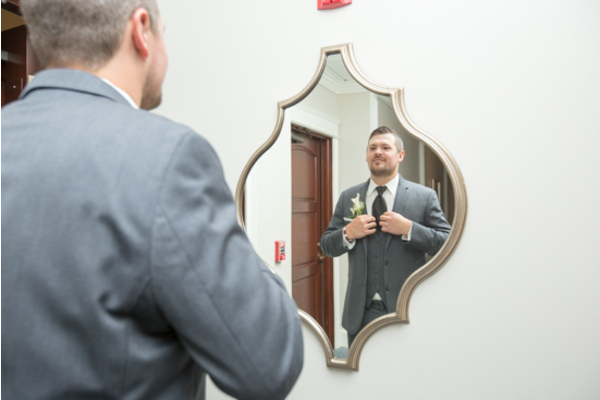 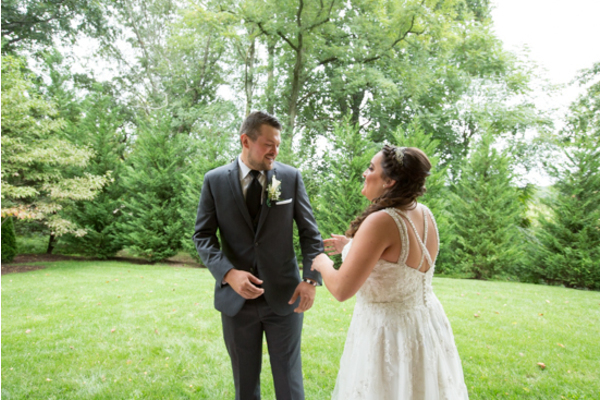 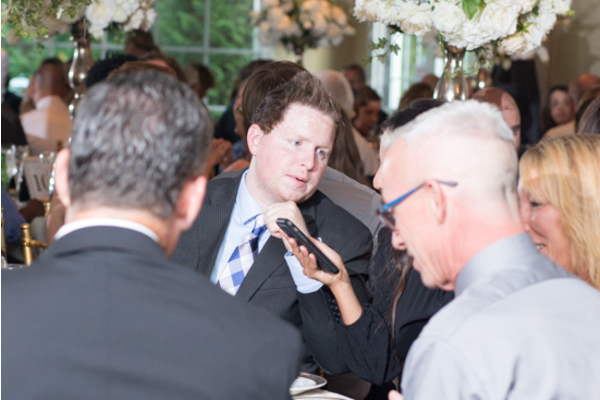 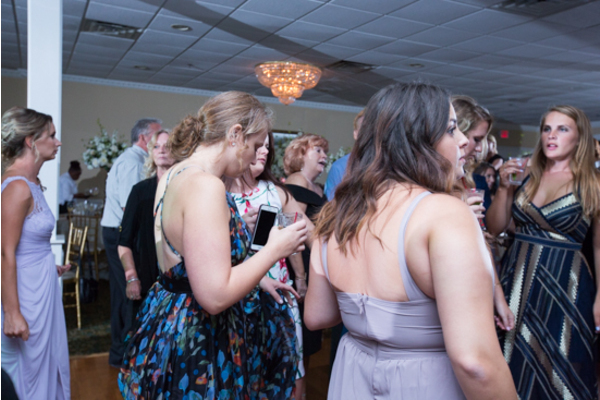 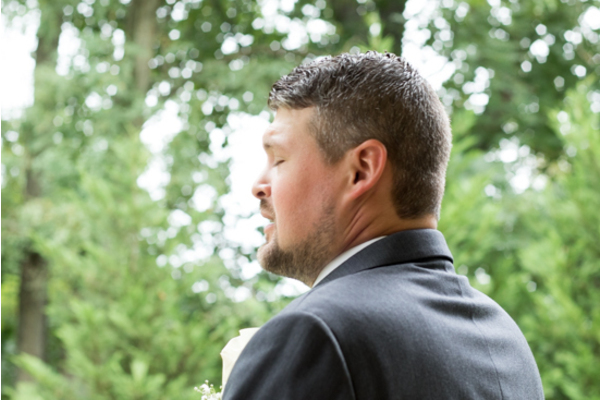 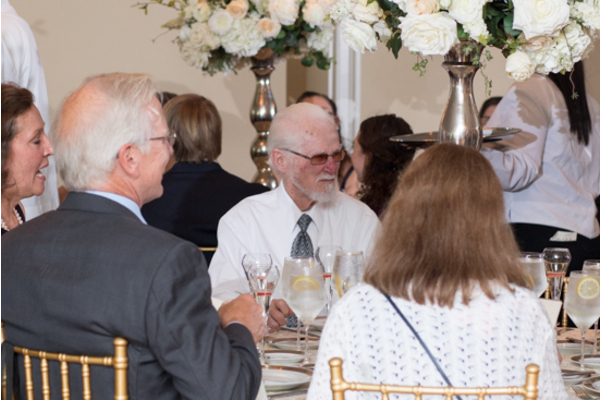 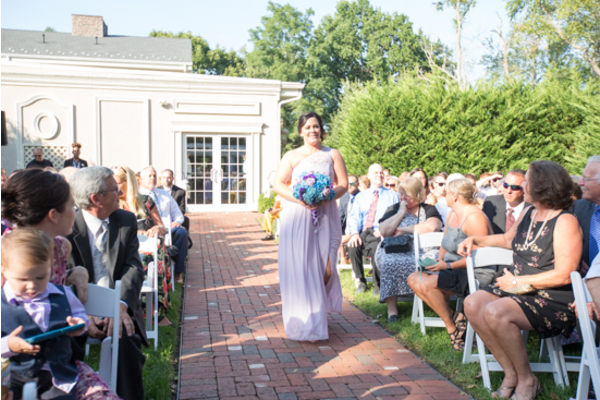 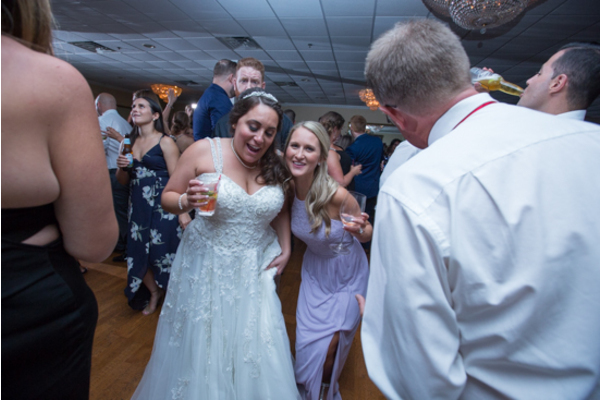 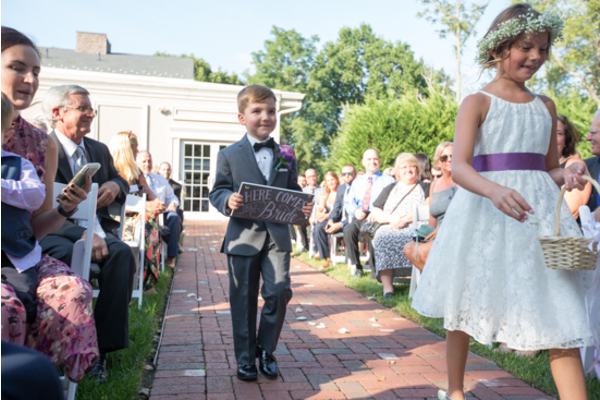 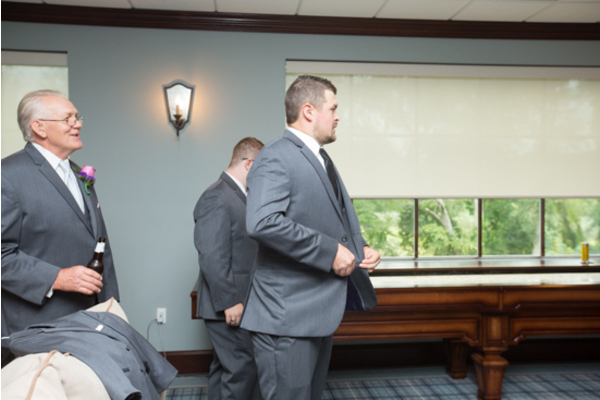 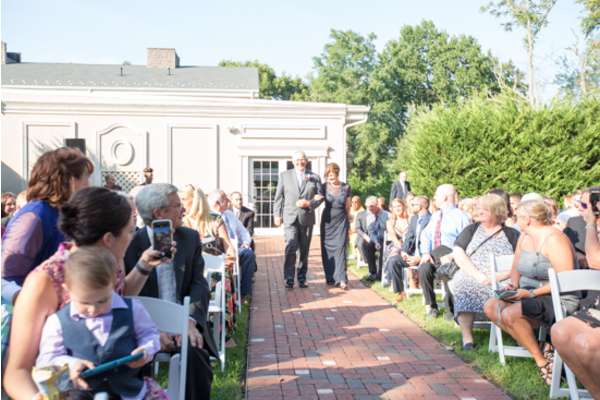 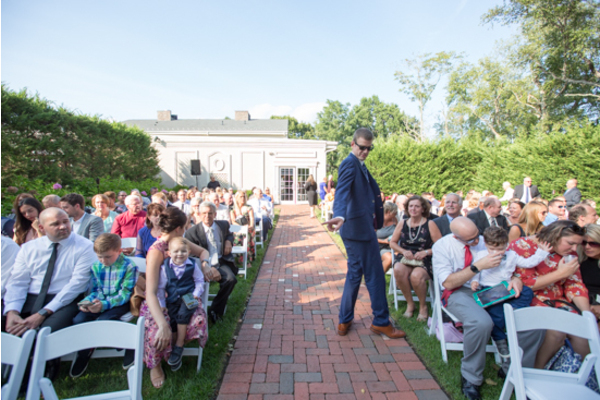 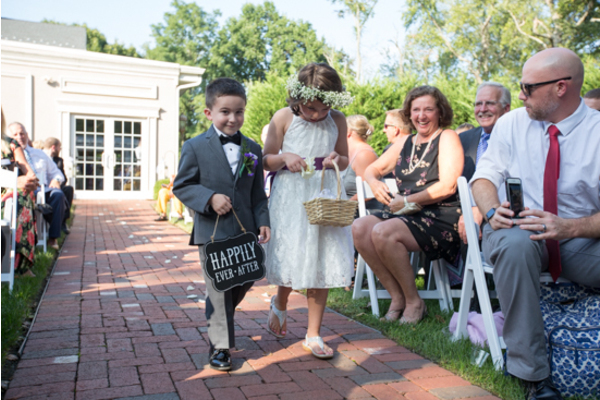 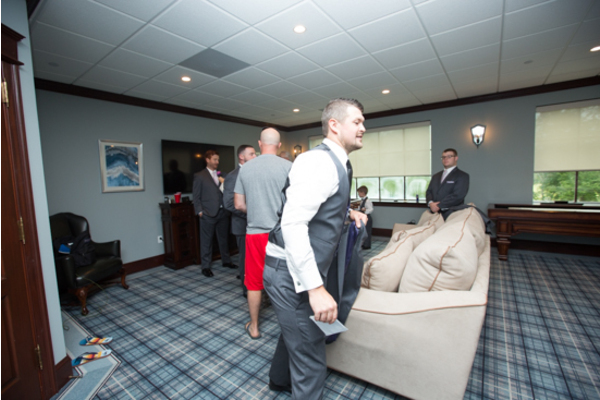 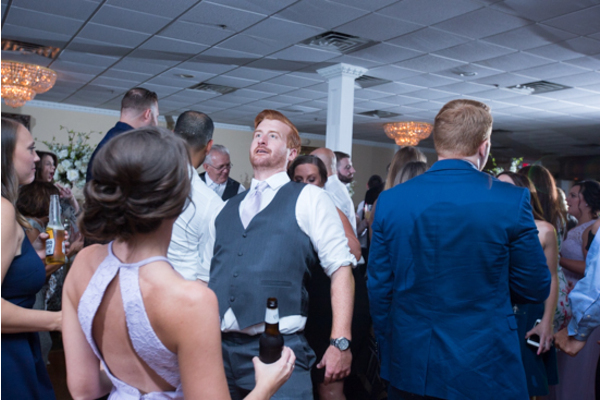 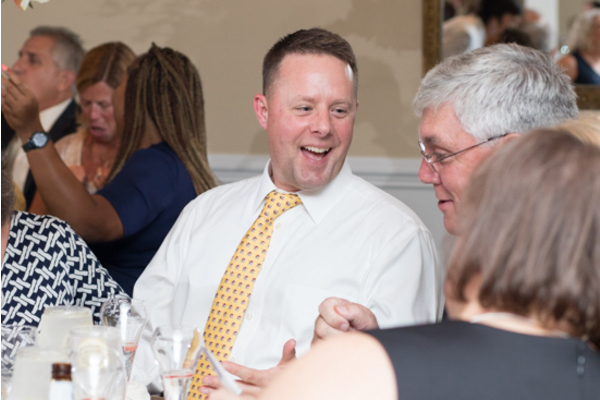 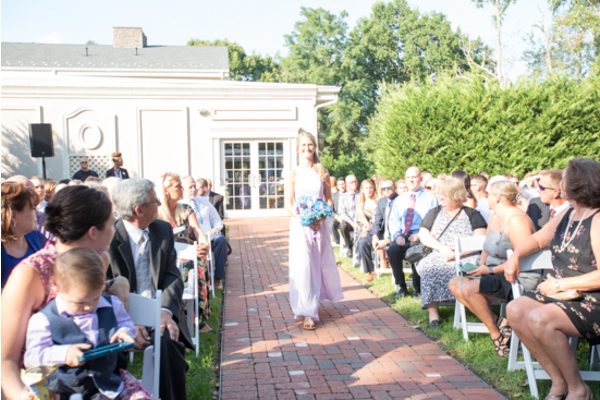 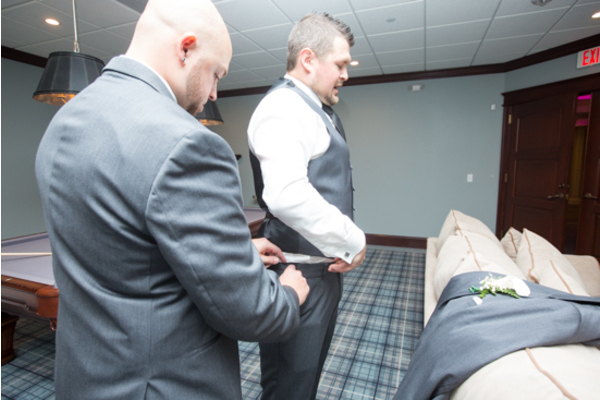 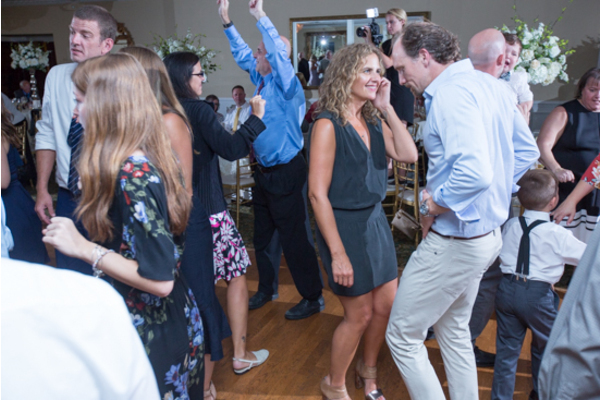 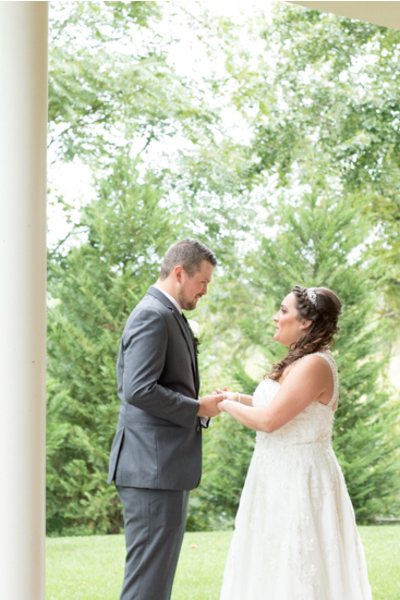 Our NJ Wedding Videographer was there as Kaitlin gave her groom the OK to turn around! 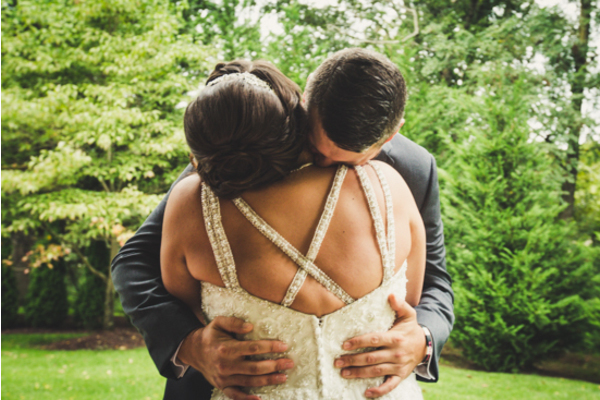 This couple was waiting all day for this moment and it is easy to see how in love they both are! 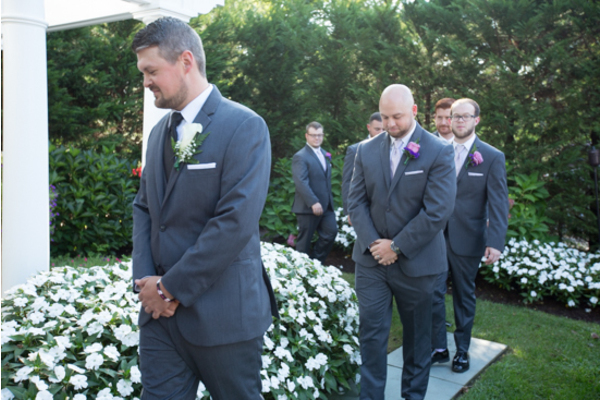 Overall, the outdoor garden ceremony was a dream come true! 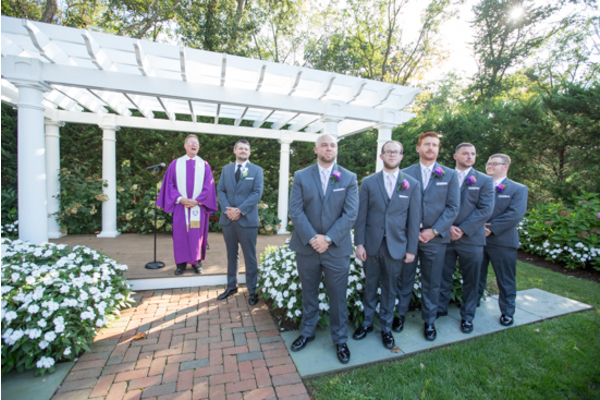 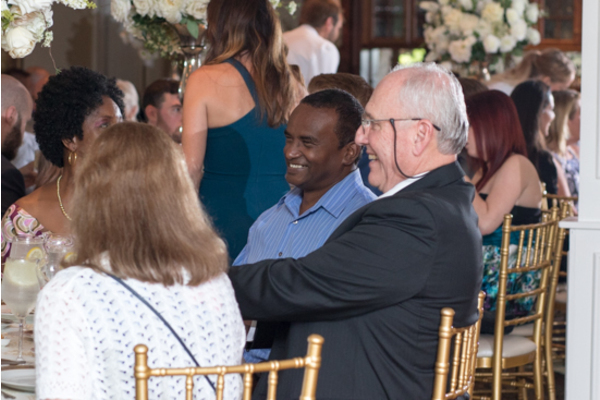 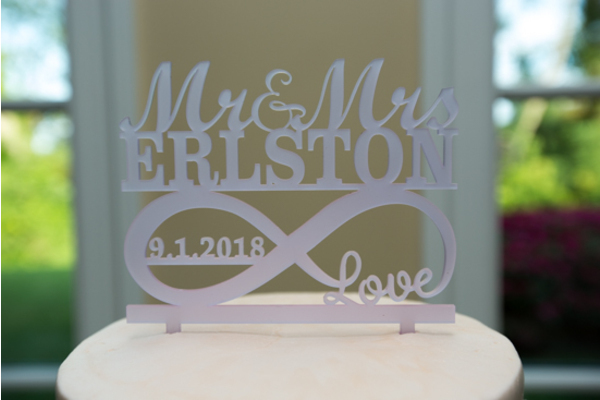 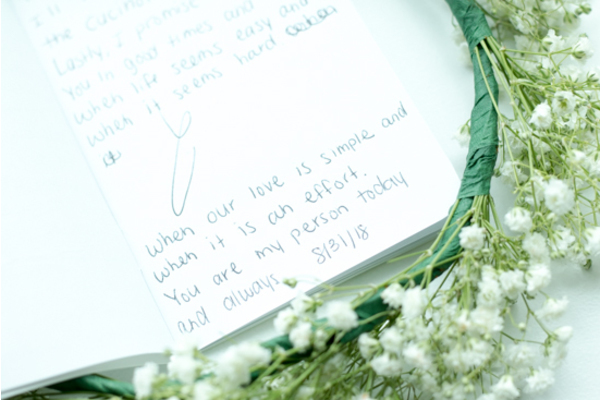 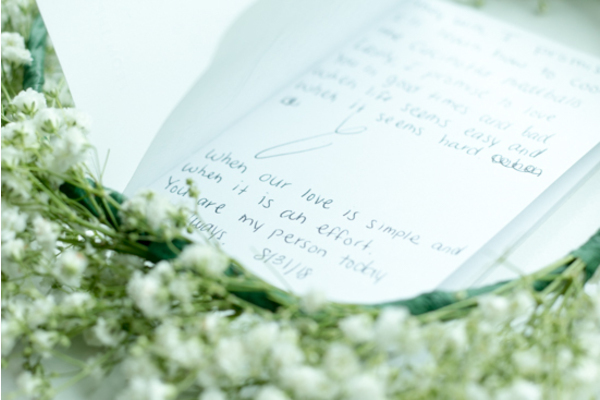 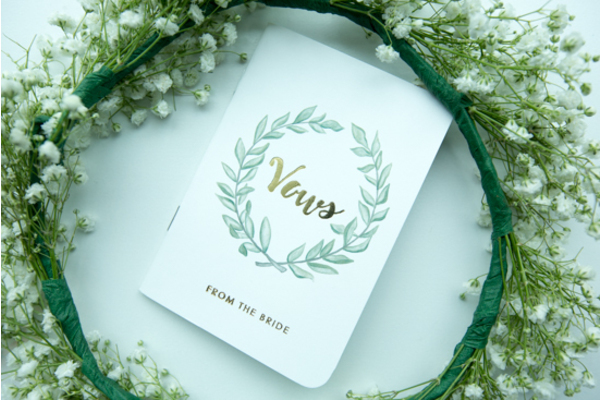 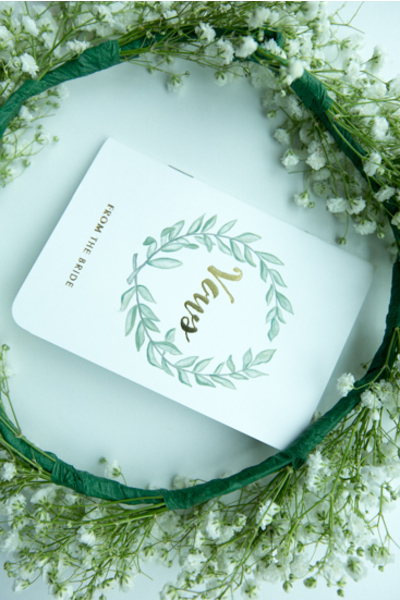 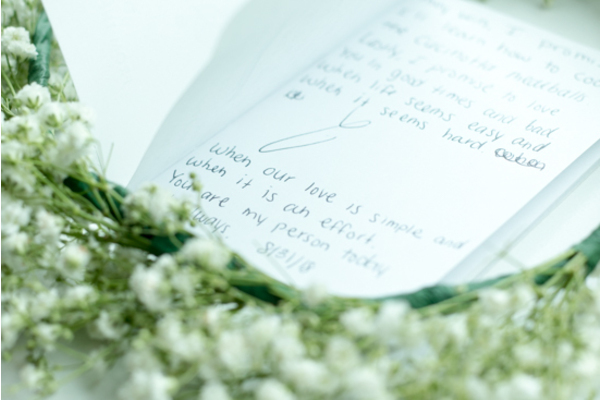 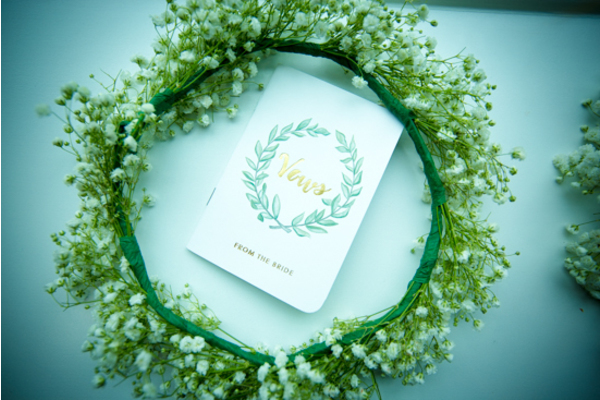 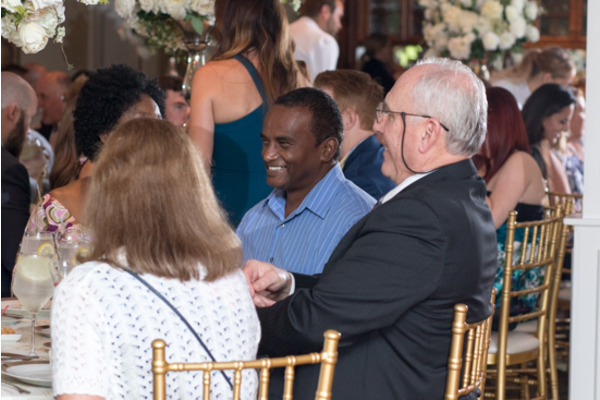 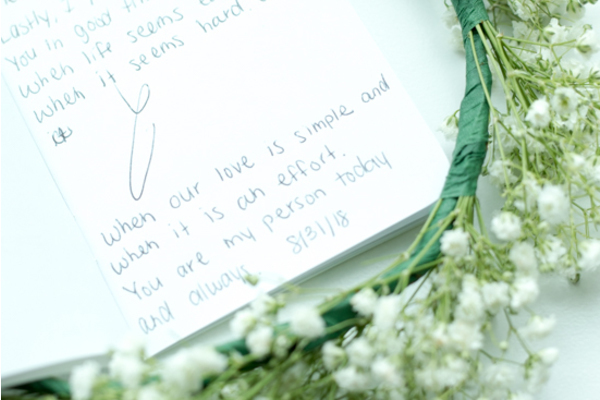 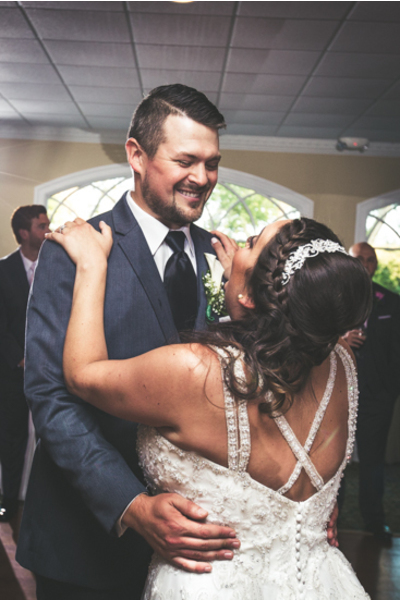 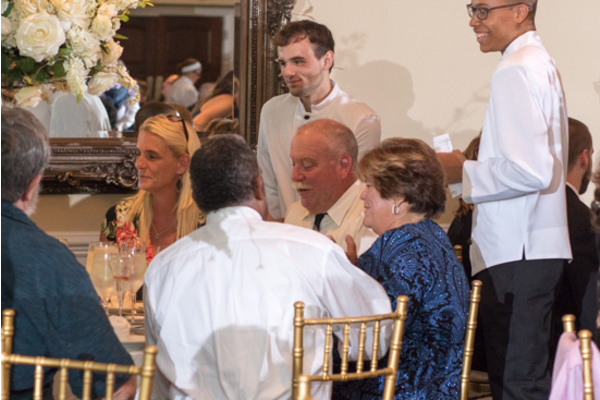 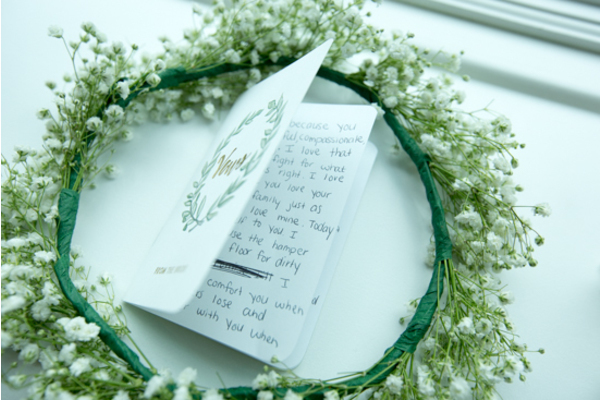 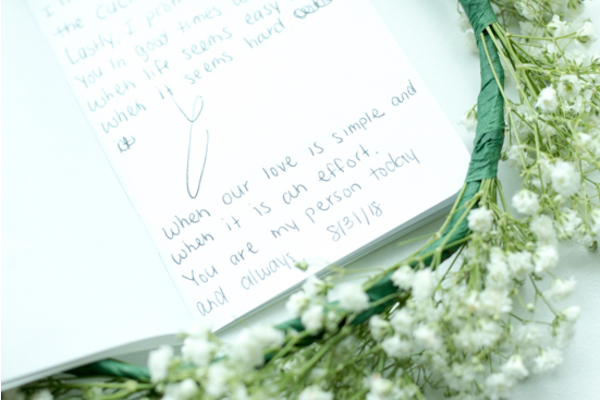 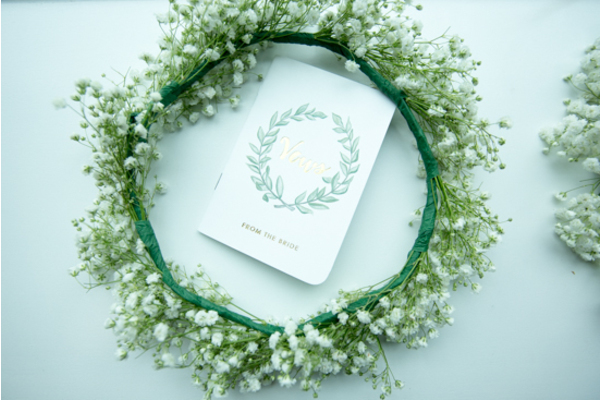 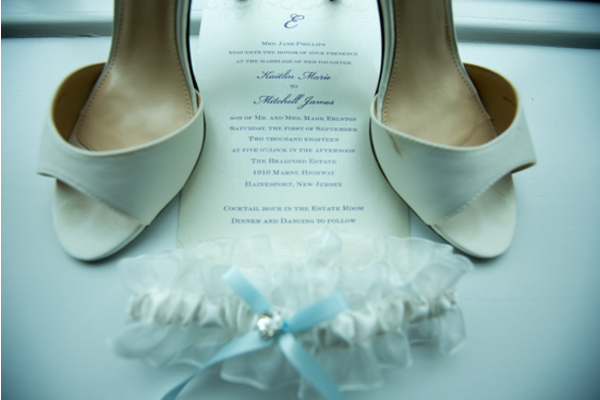 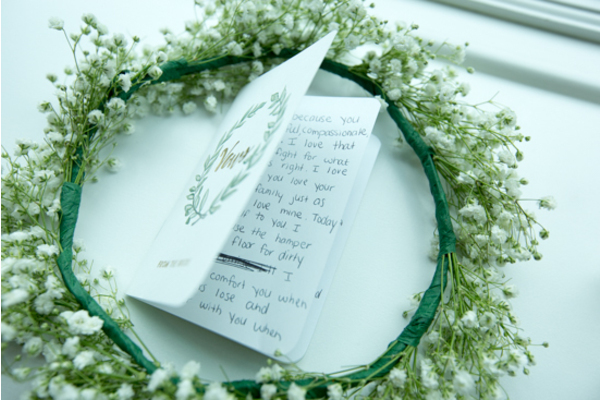 They read vows to each other and said a heartfelt”I Do.” At last, their friends and family celebrated as they were pronounced husband and wife! 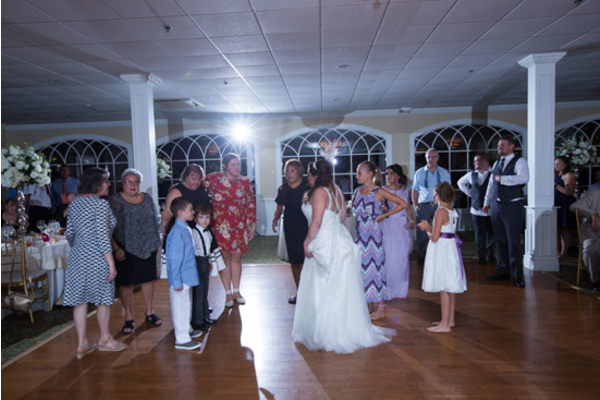 The reception was kicked off with amazing first dances on the dance floor. 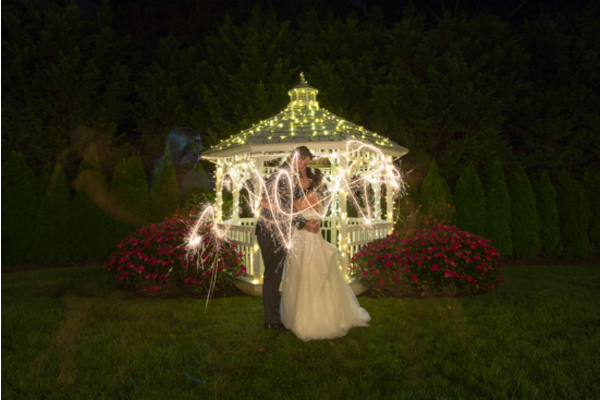 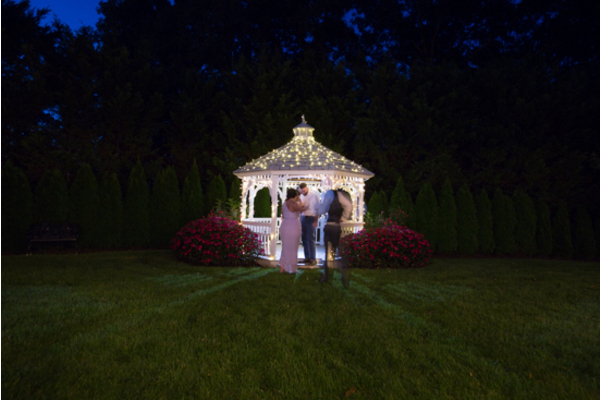 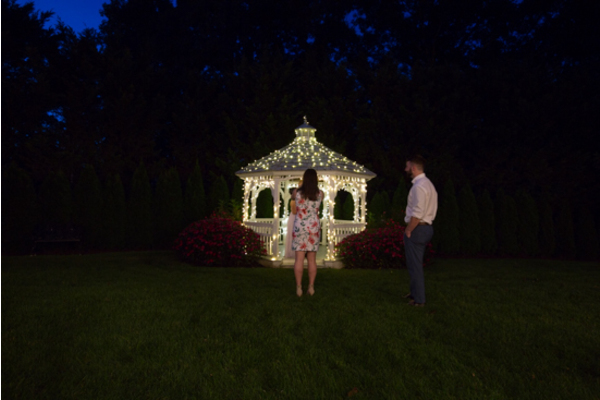 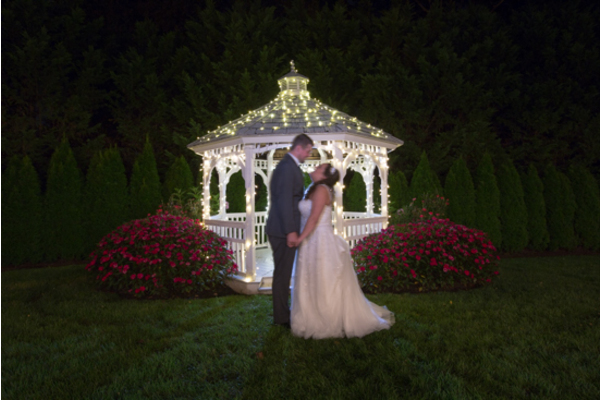 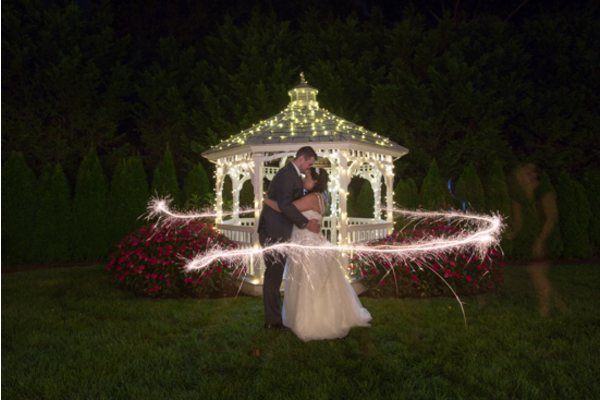 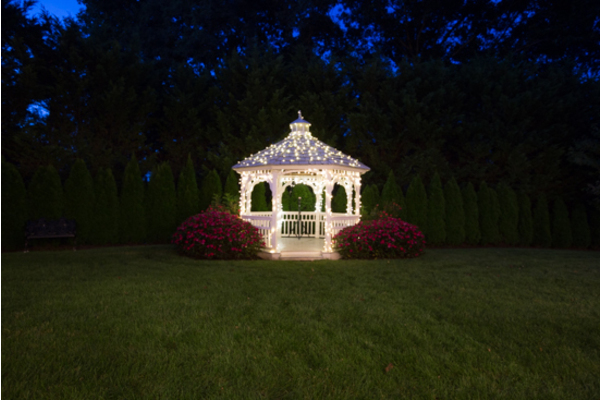 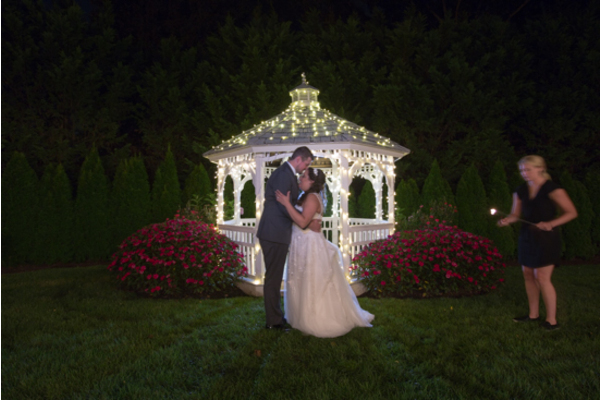 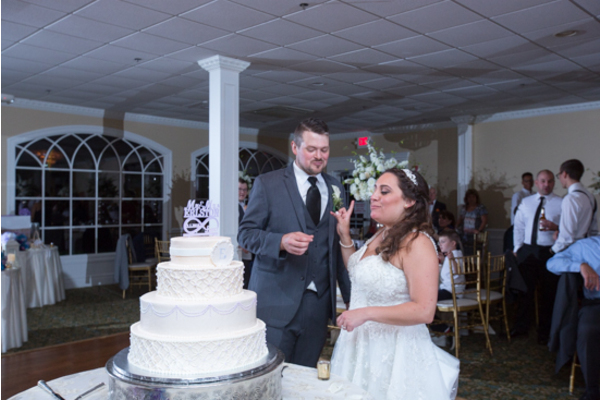 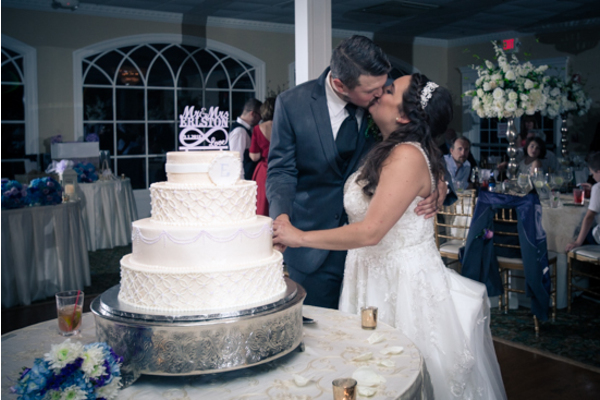 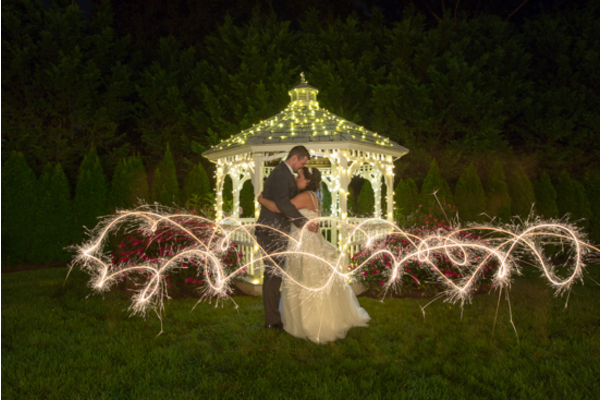 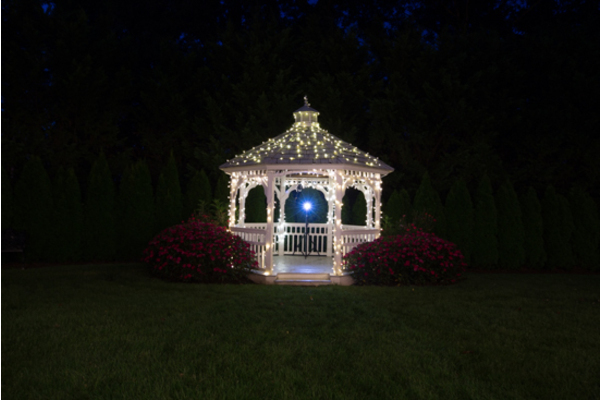 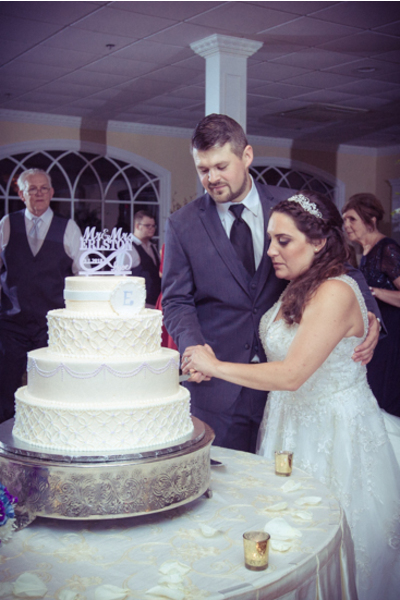 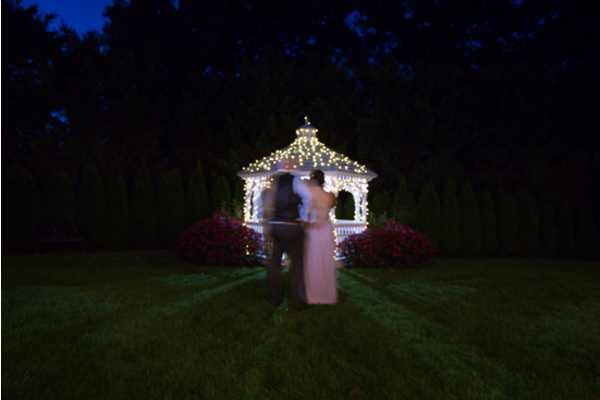 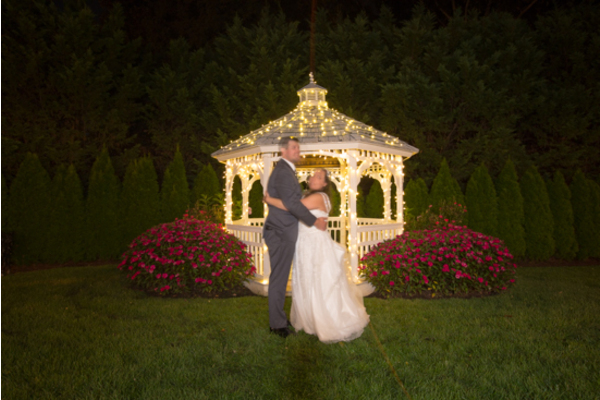 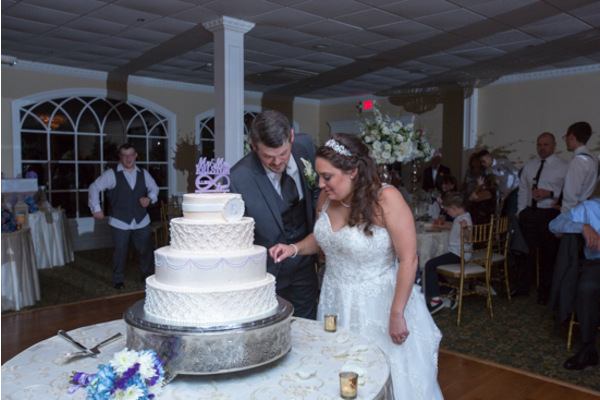 When the sun went down, the couple cut their cake then quickly stepped outside with our NJ Wedding Photographer to capture fun nighttime sparkler pictures! 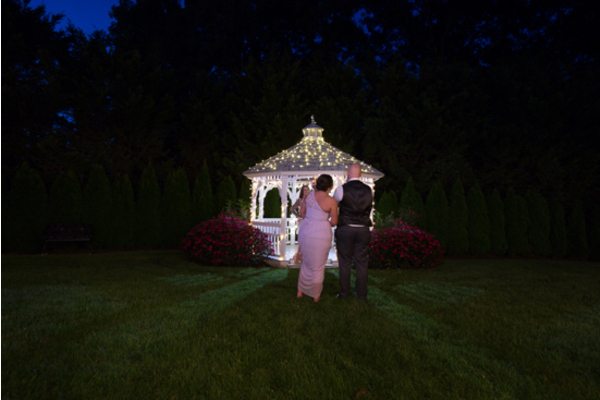 This night was nothing short of a fairytale, and we are so happy we were able to attend! 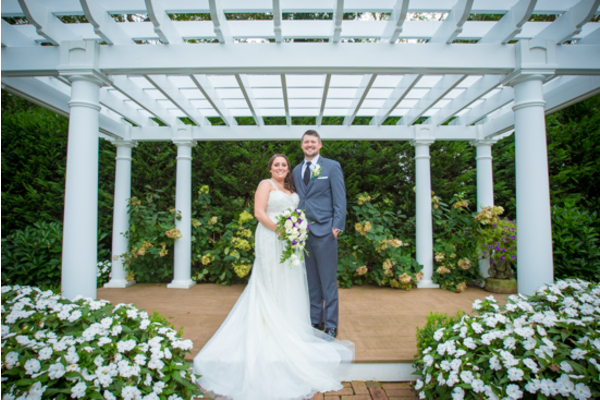 Congratulations, again, to Kaitlin and Mitchell. 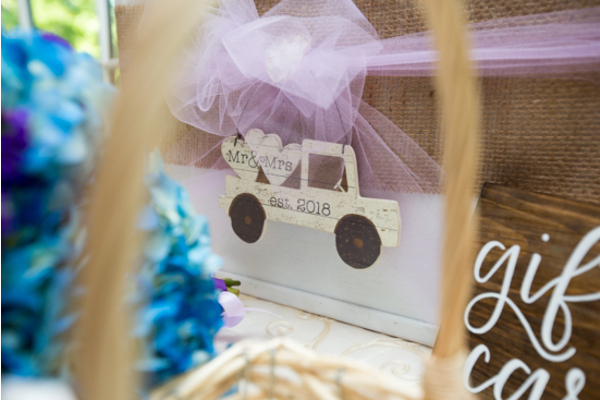 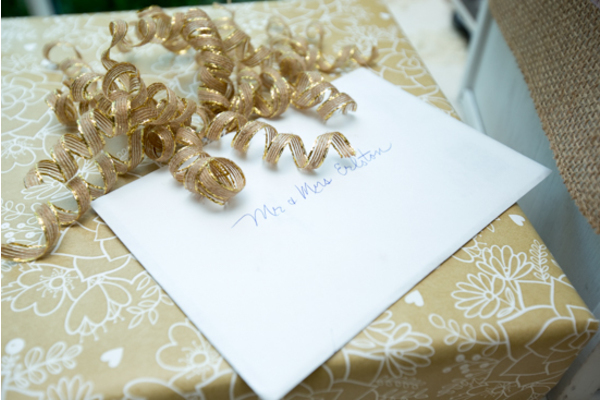 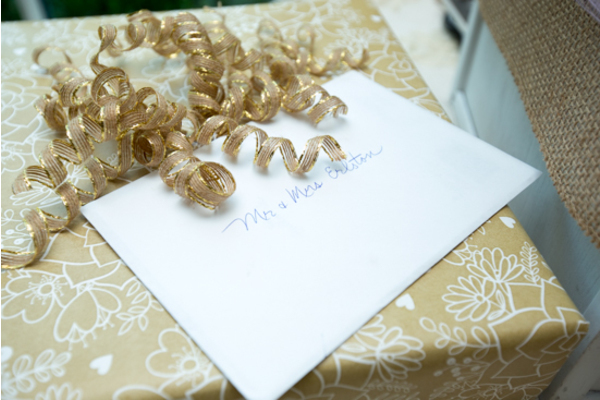 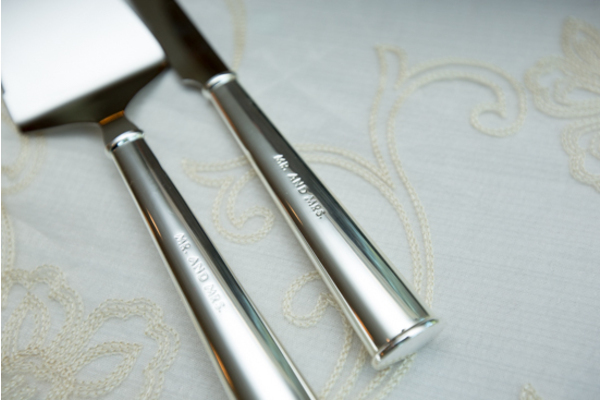 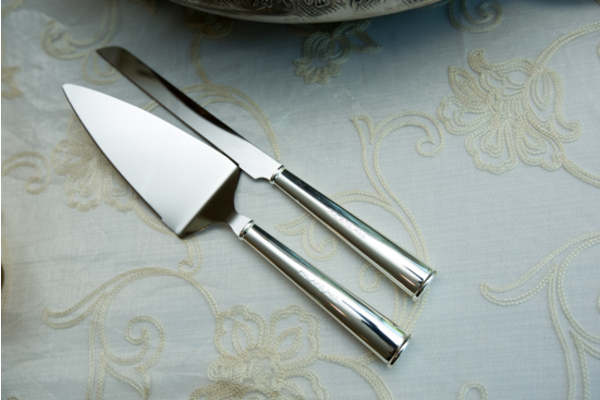 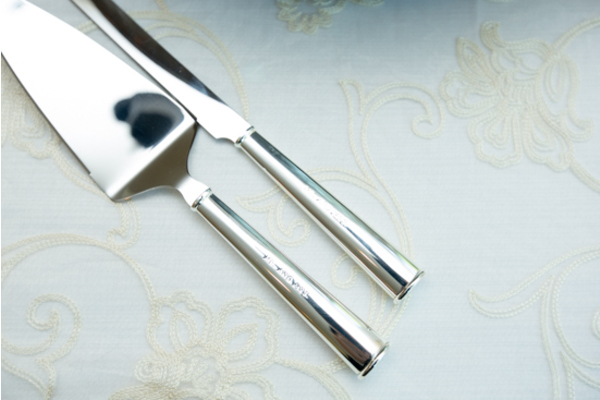 In general, we wish you the best as you begin your new journey together as Mr. & Mrs.!